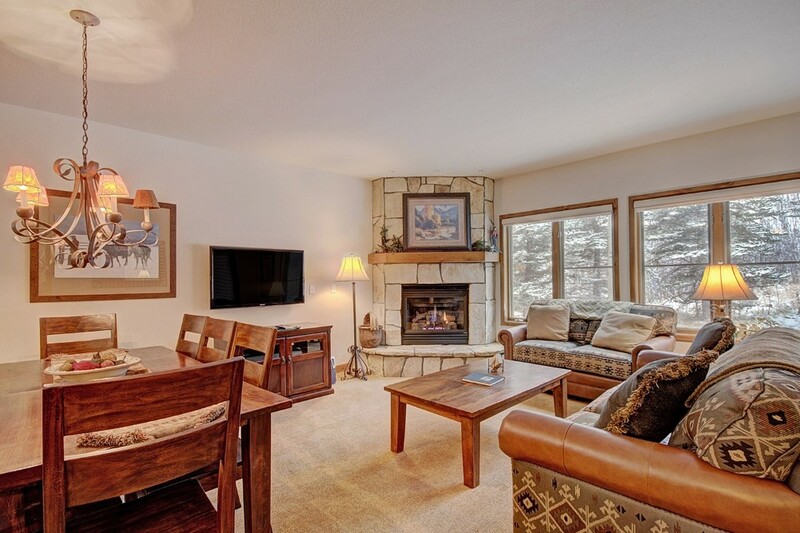 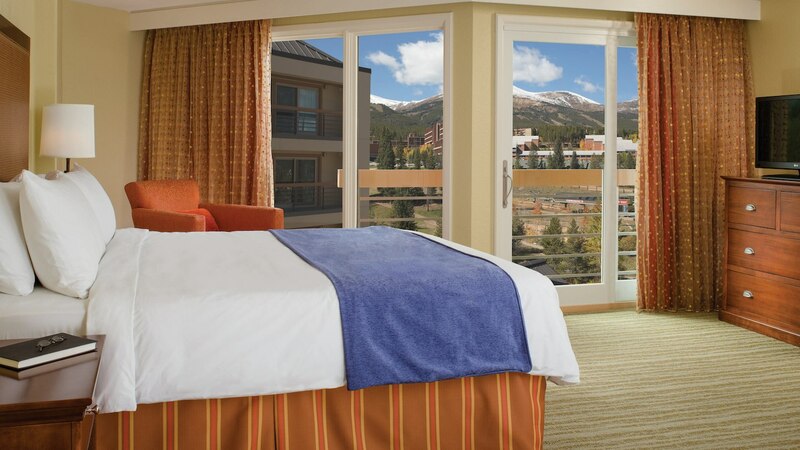 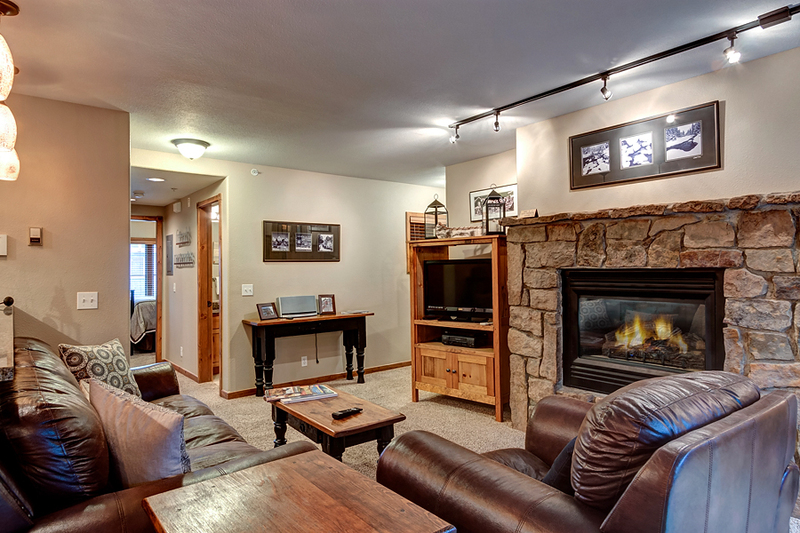 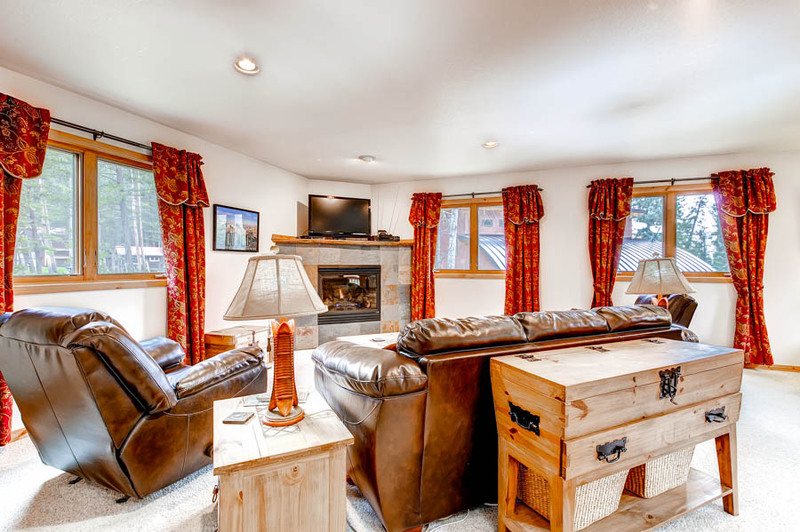 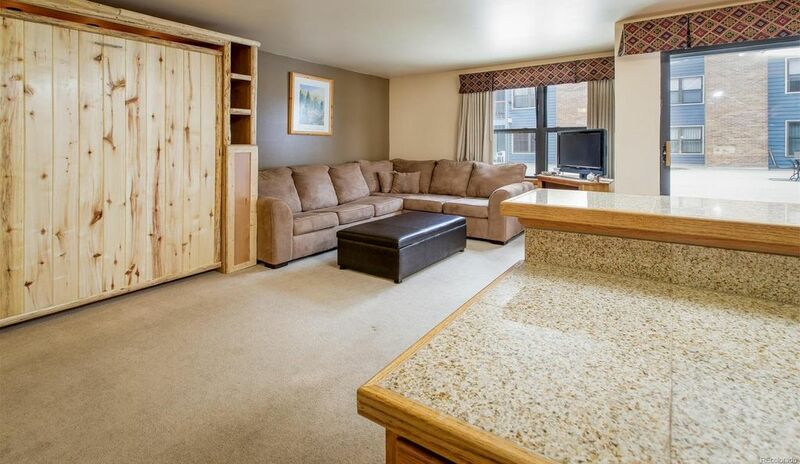 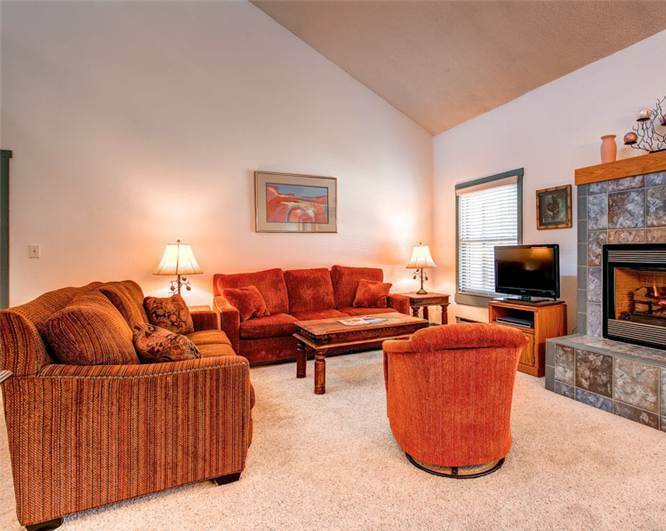 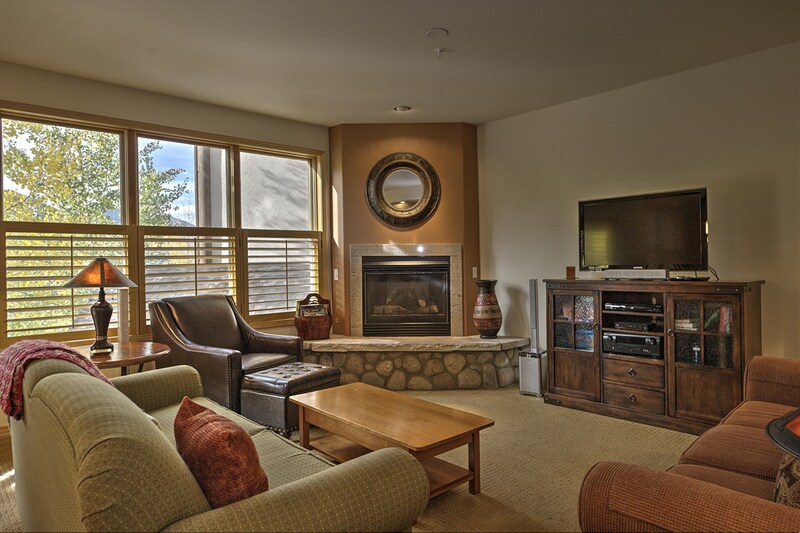 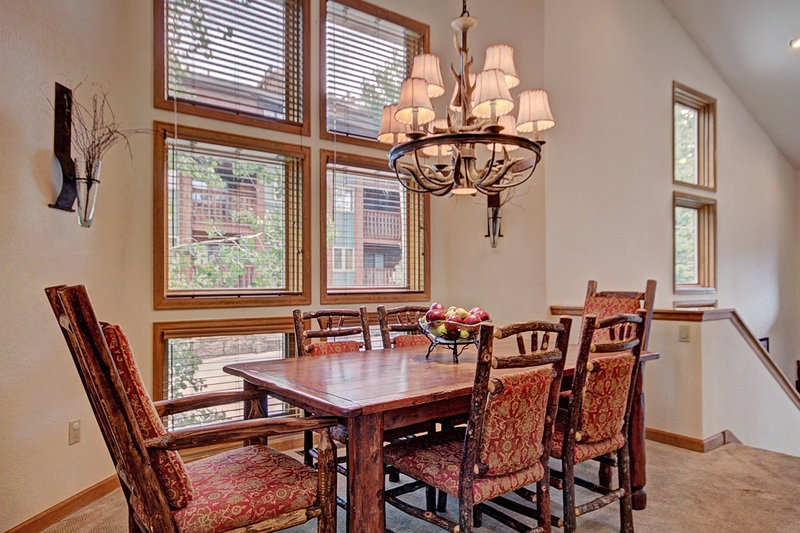 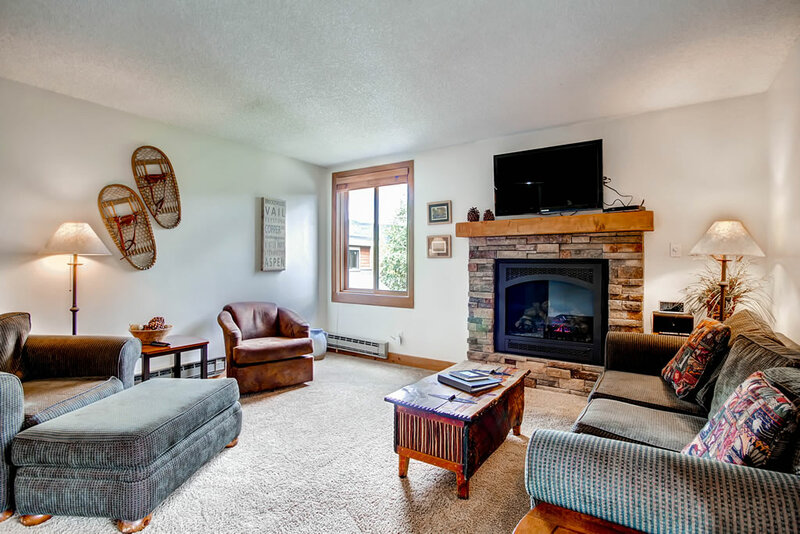 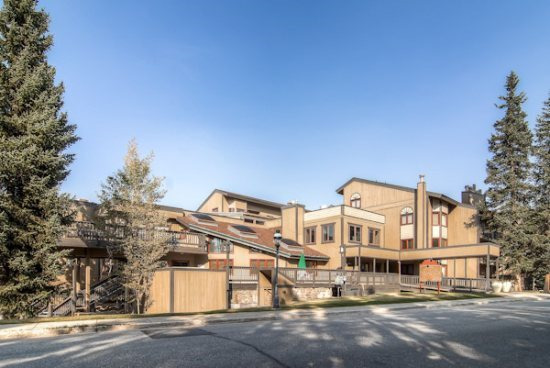 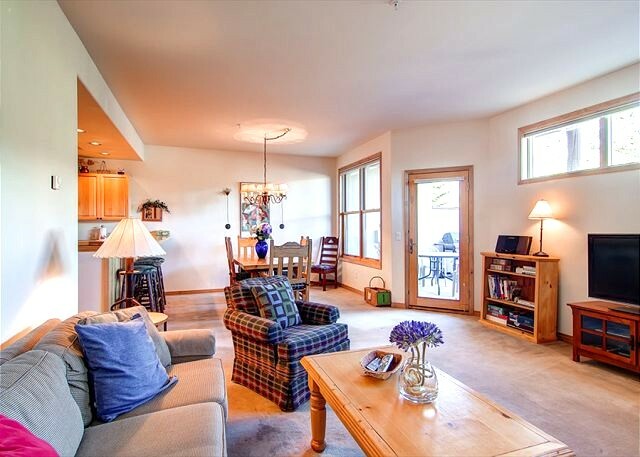 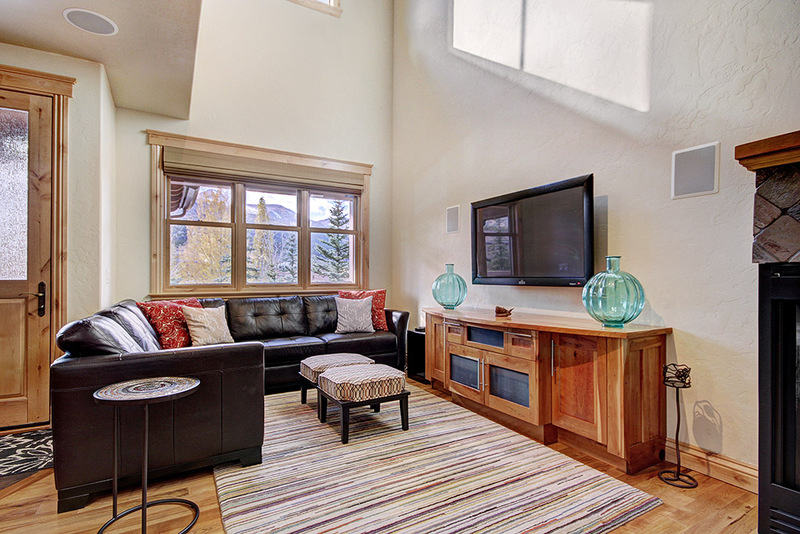 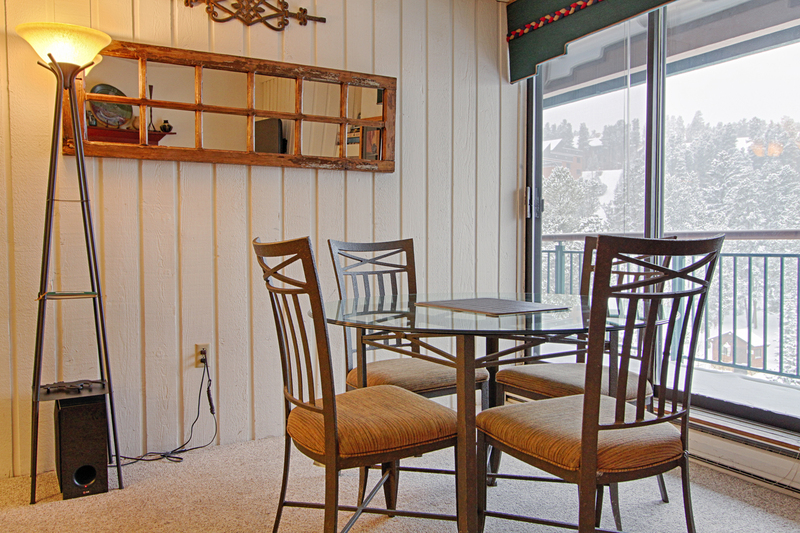 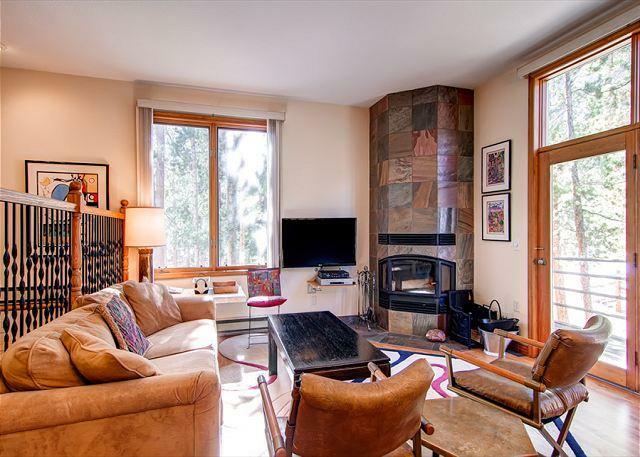 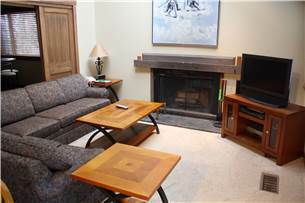 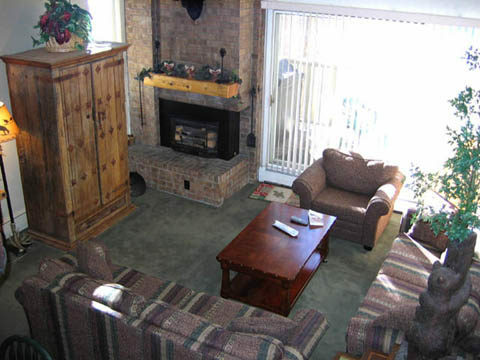 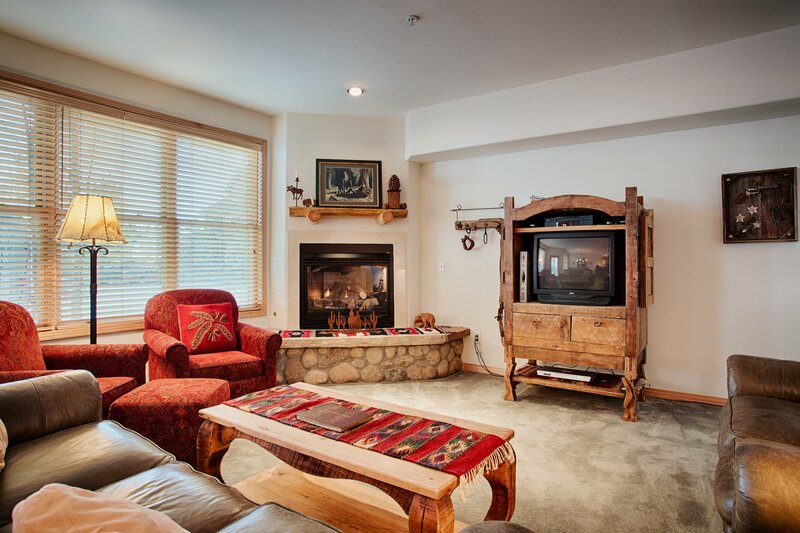 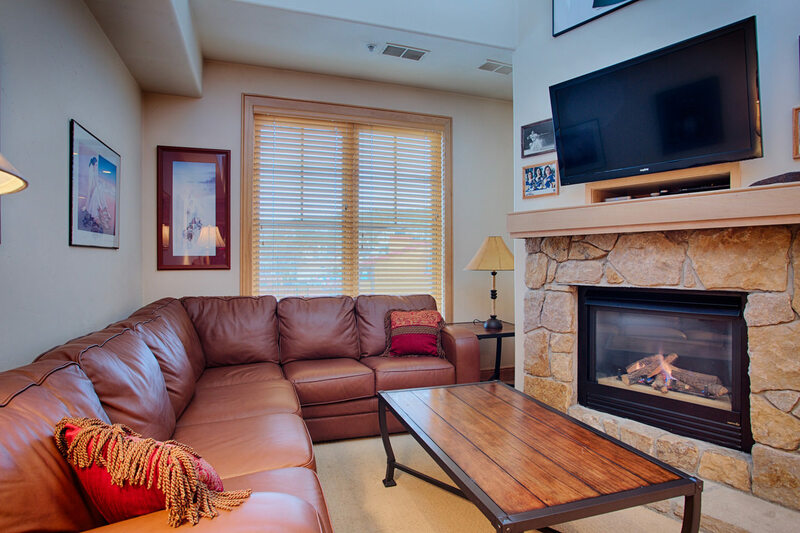 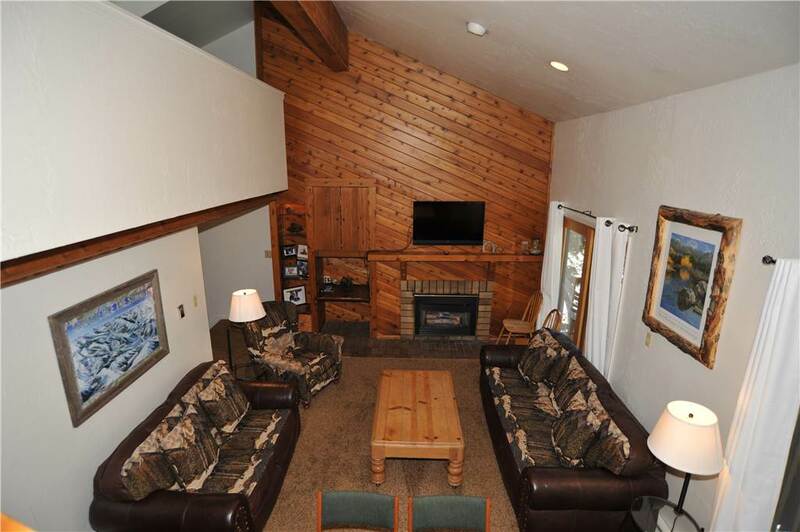 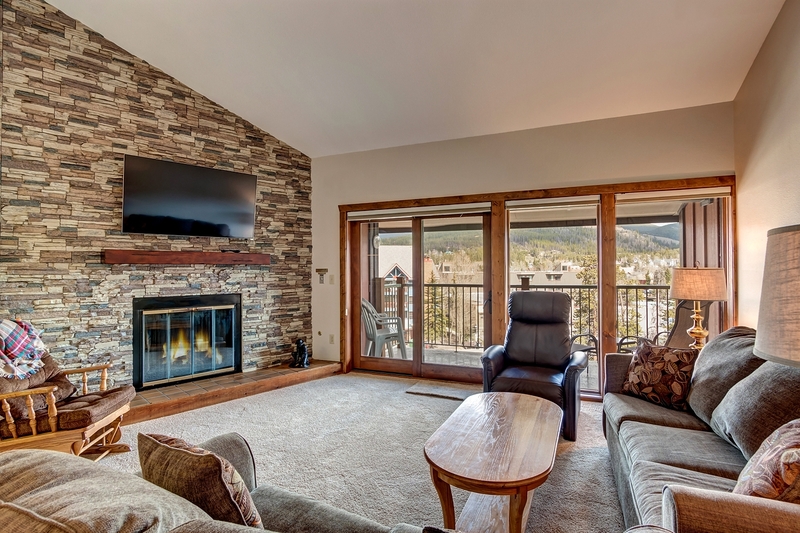 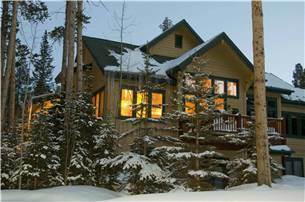 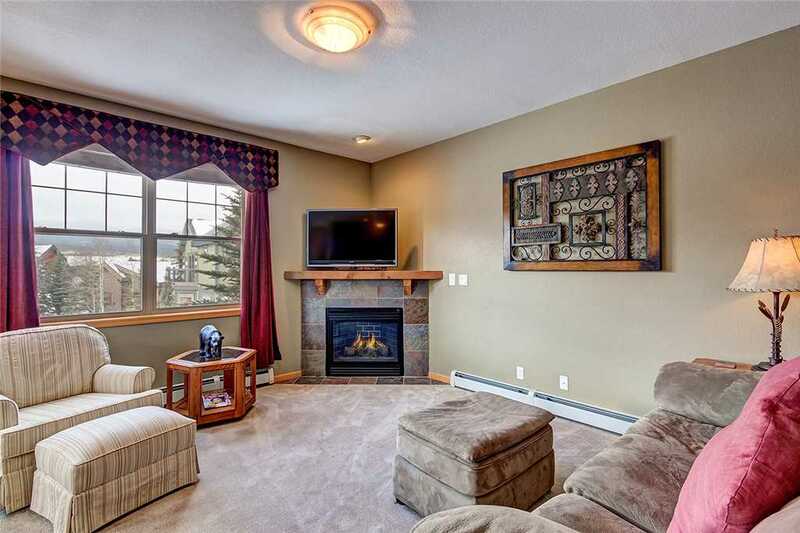 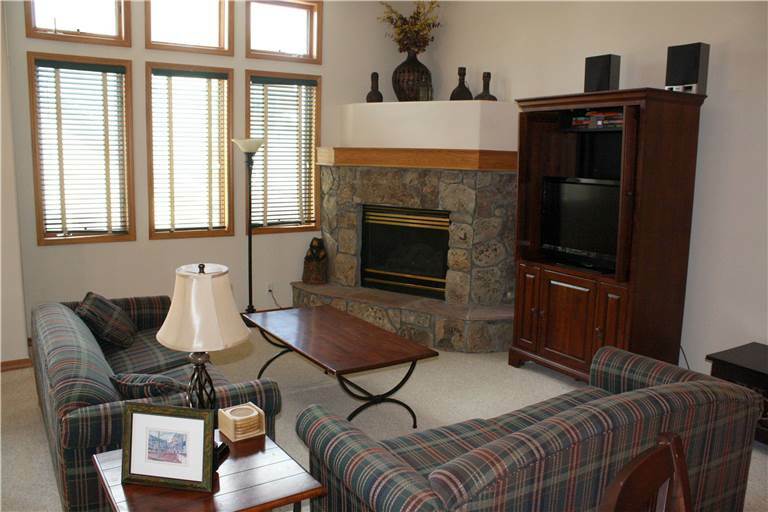 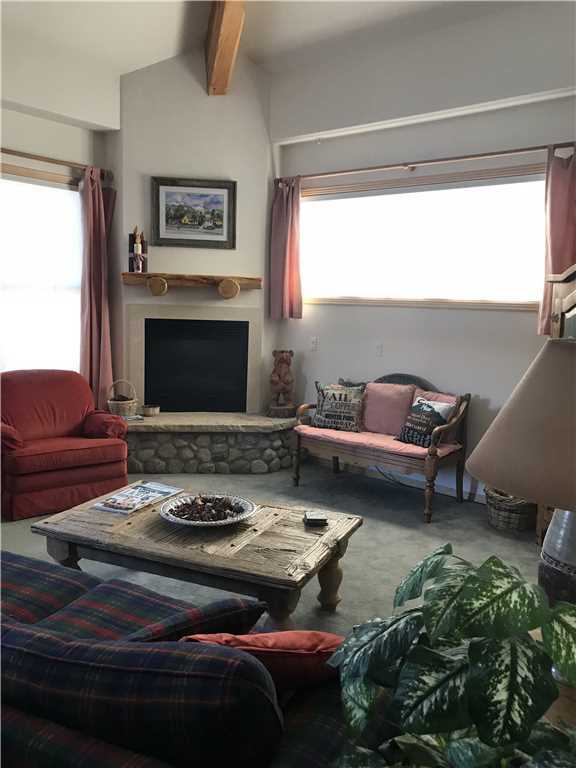 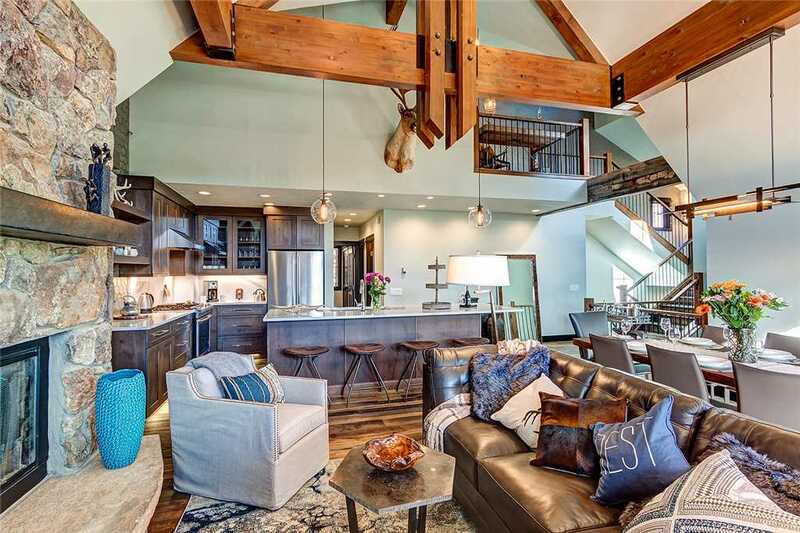 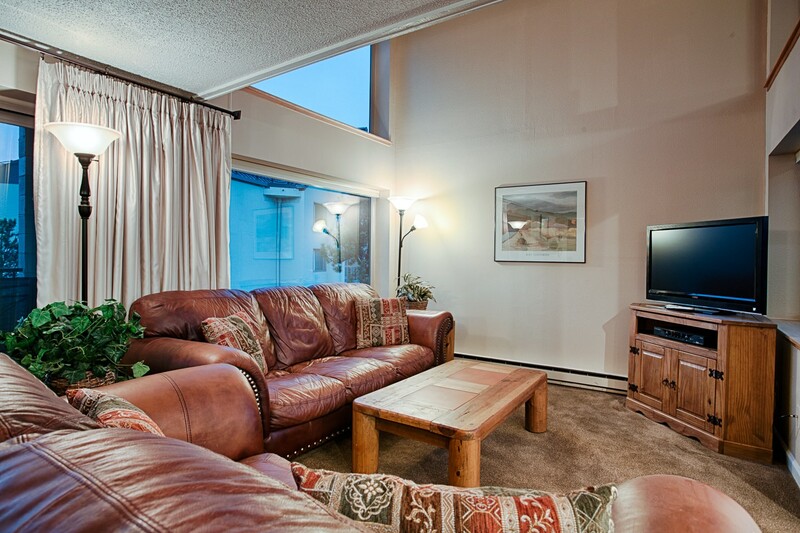 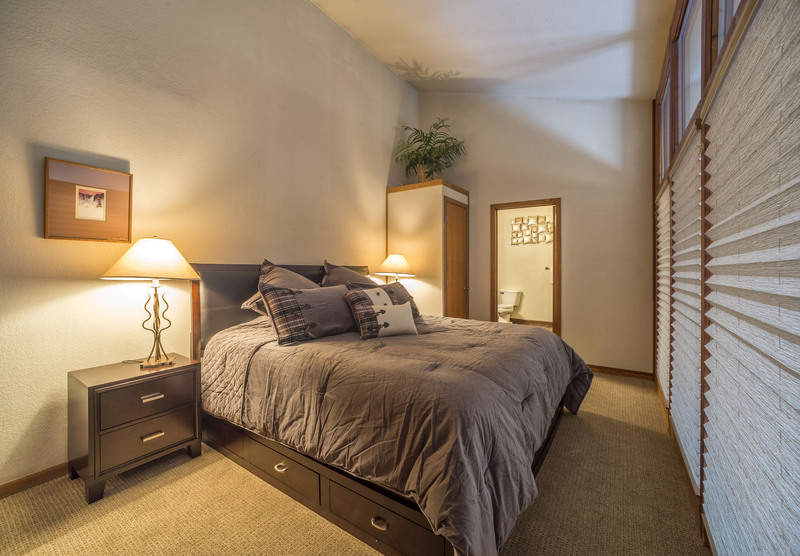 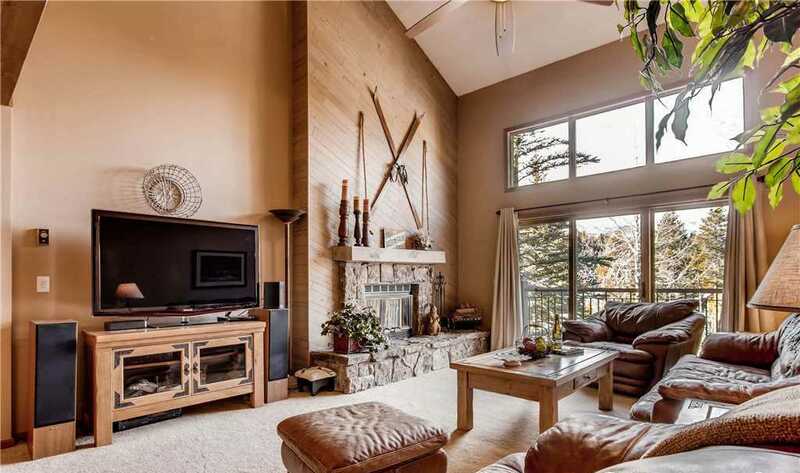 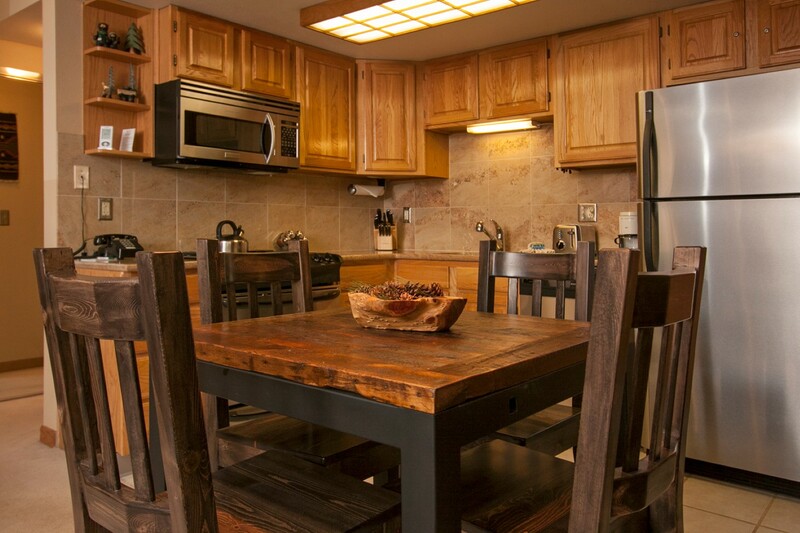 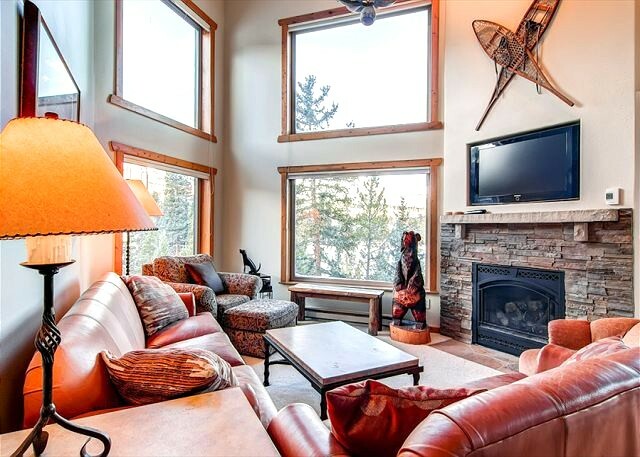 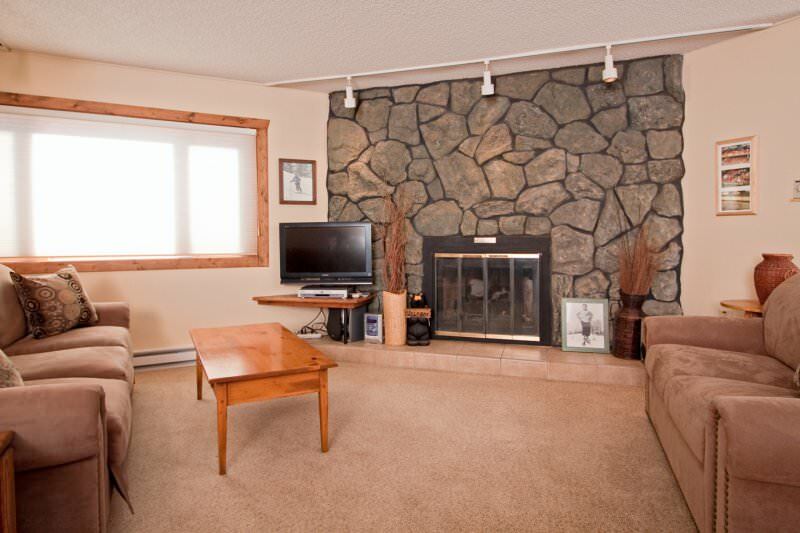 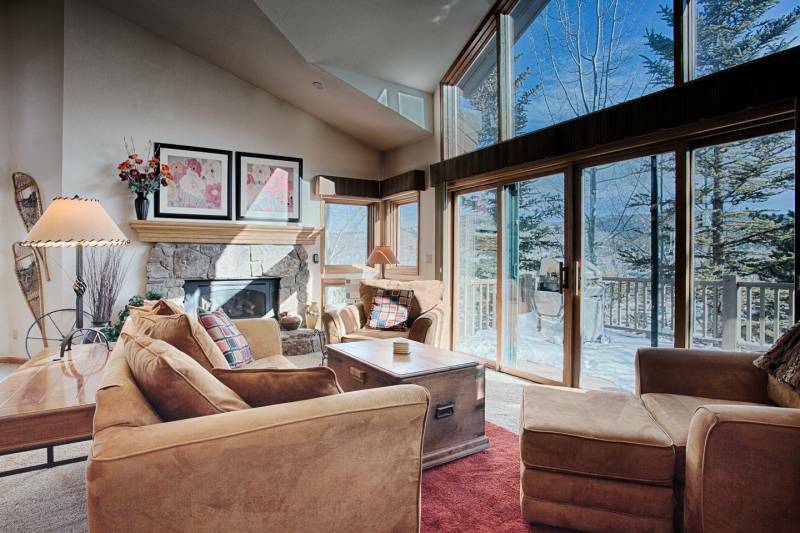 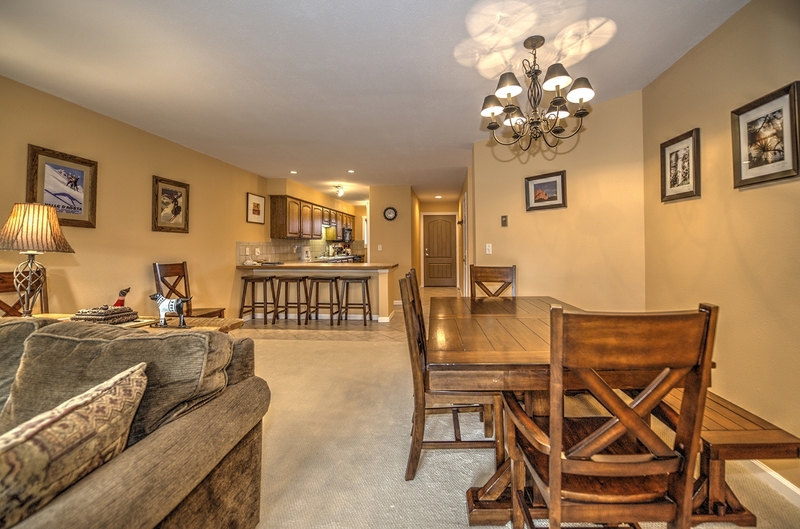 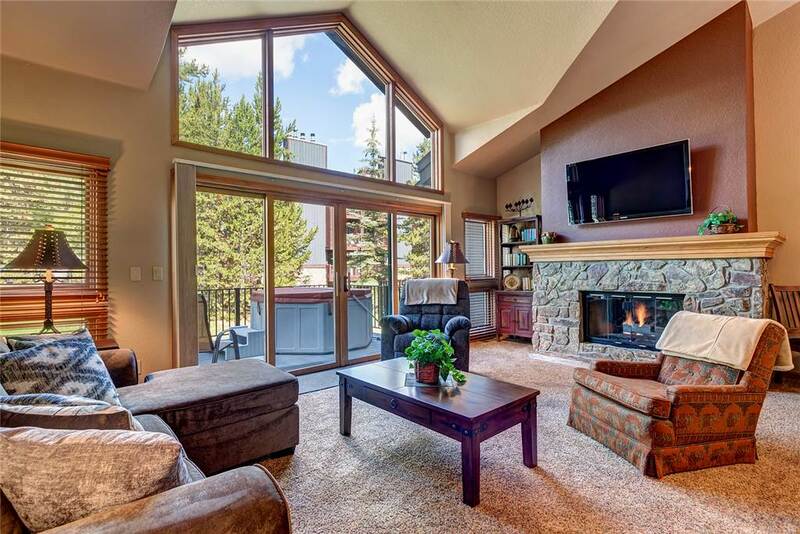 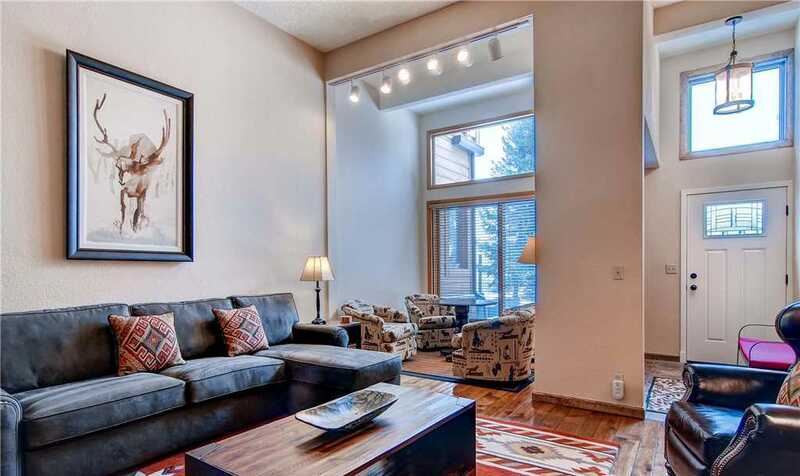 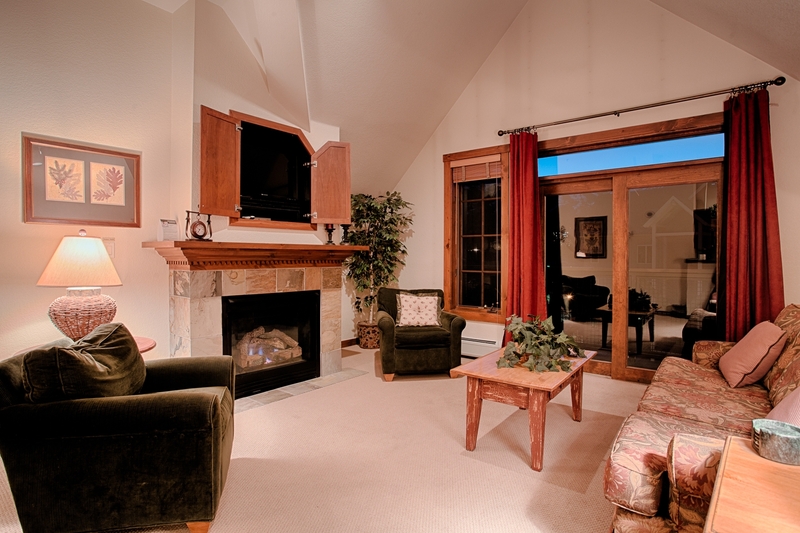 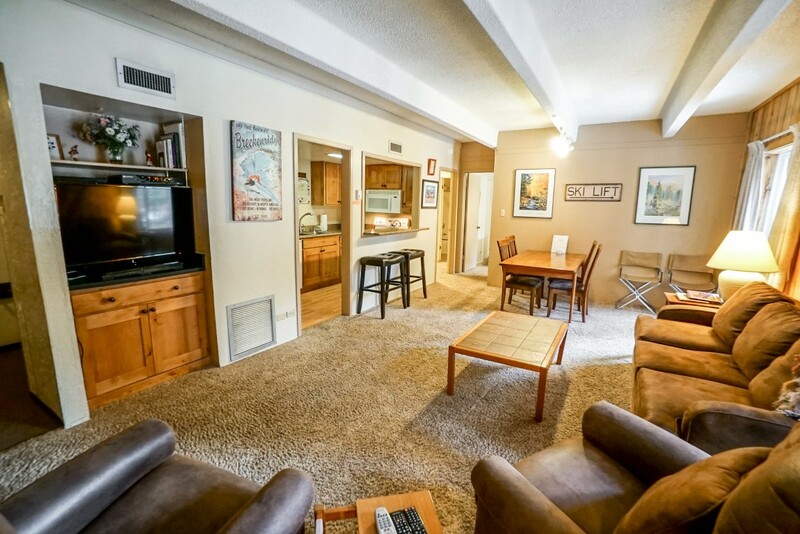 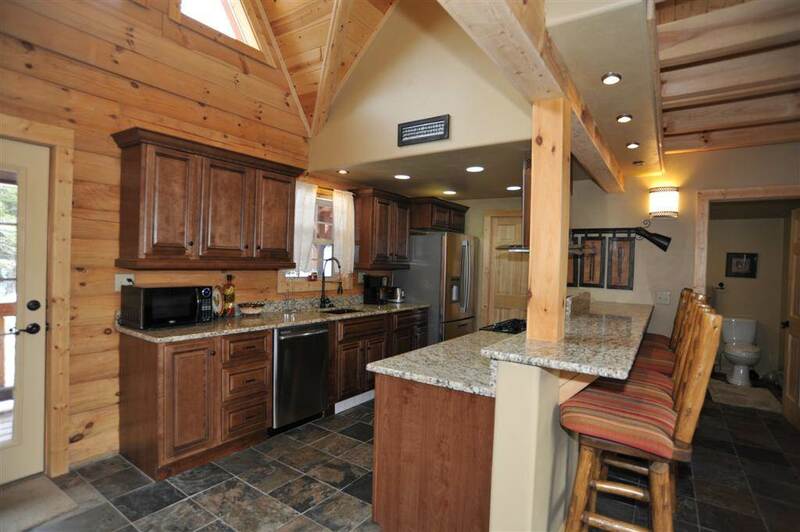 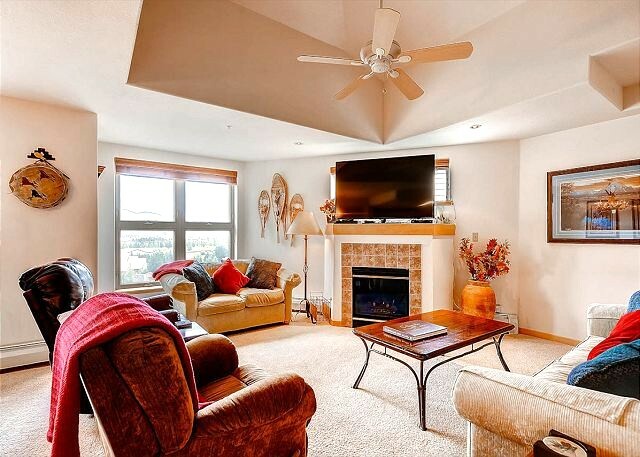 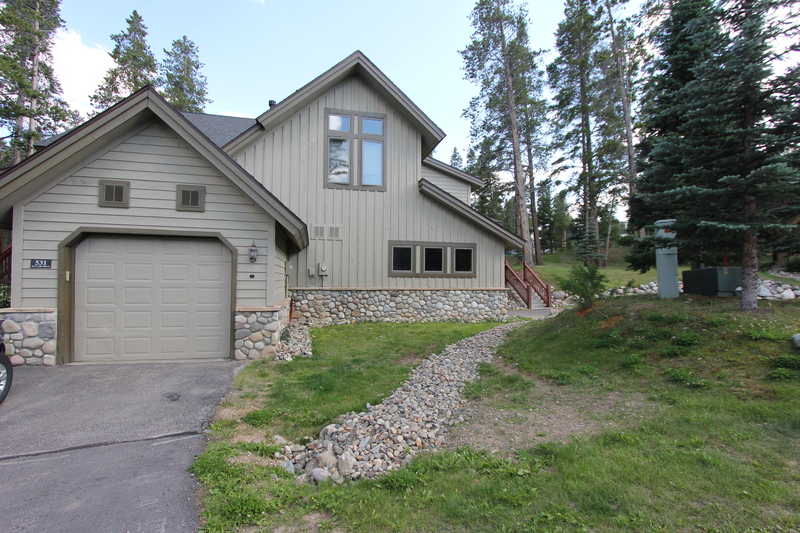 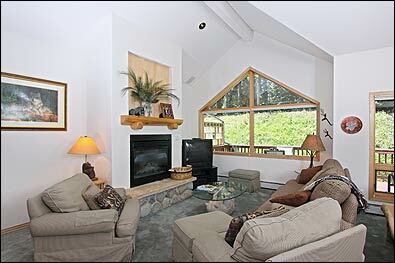 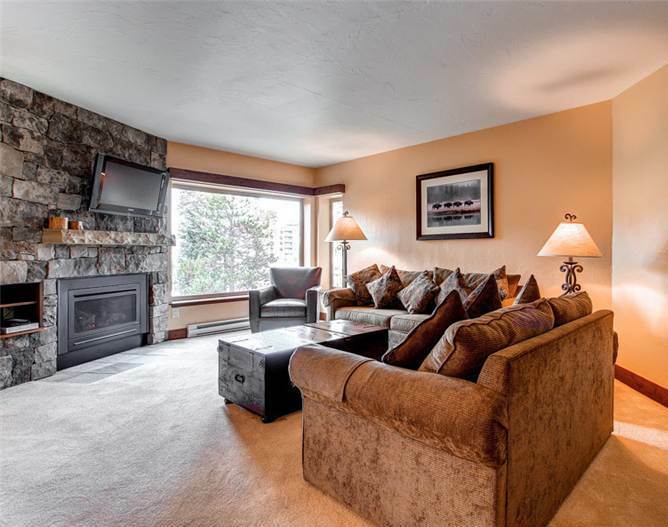 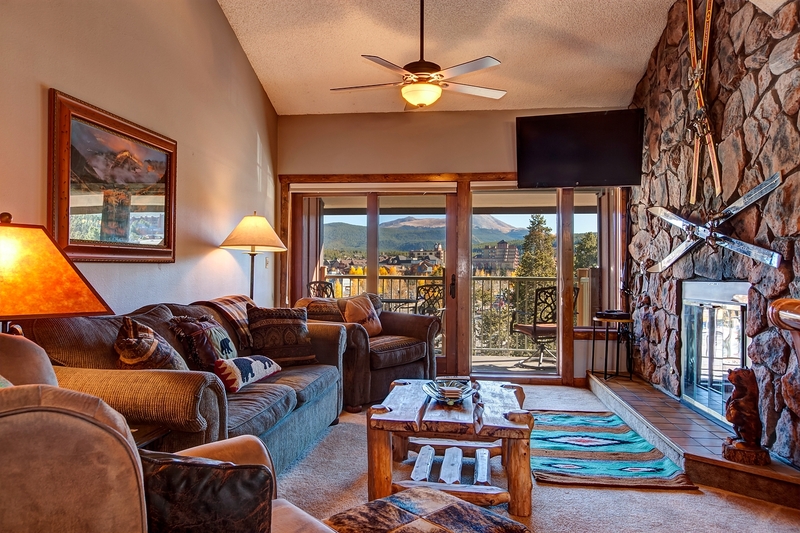 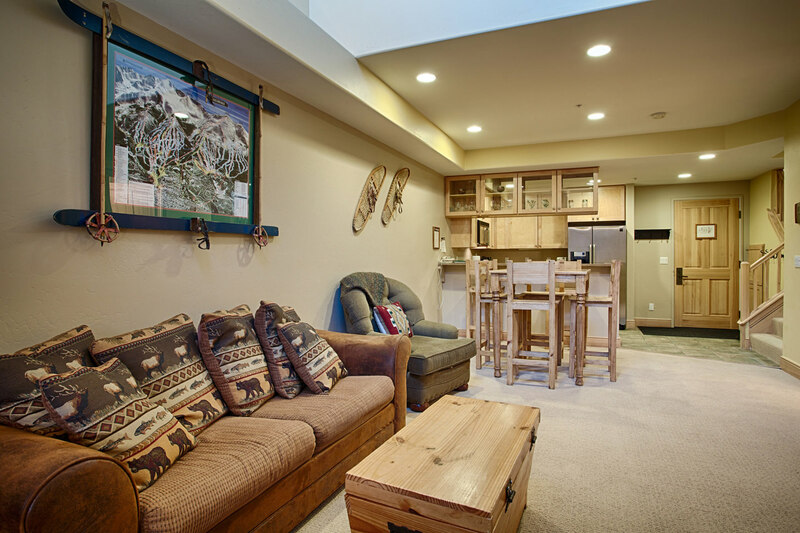 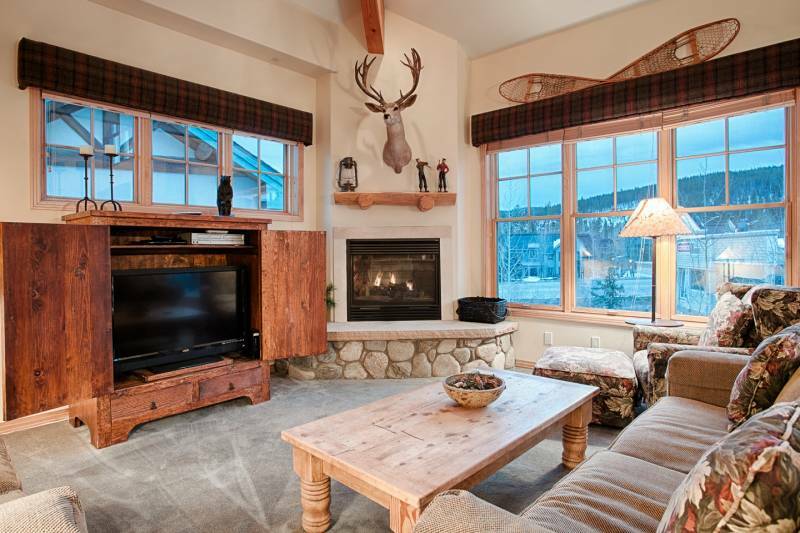 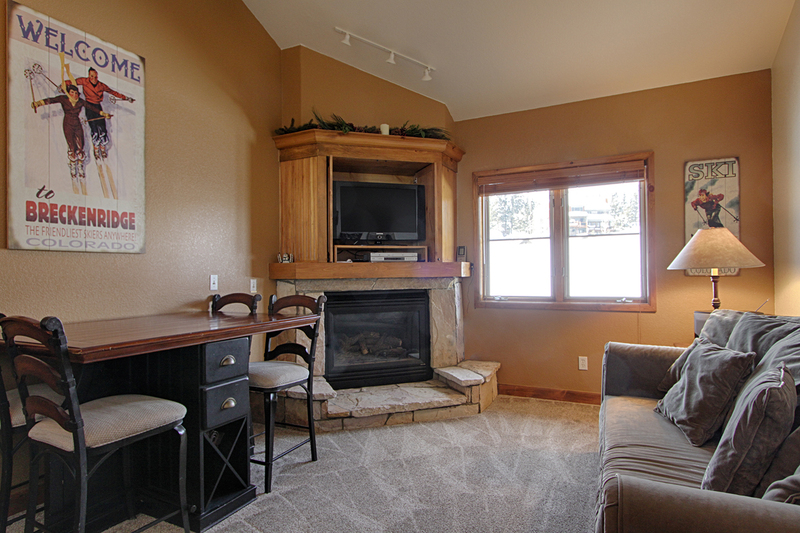 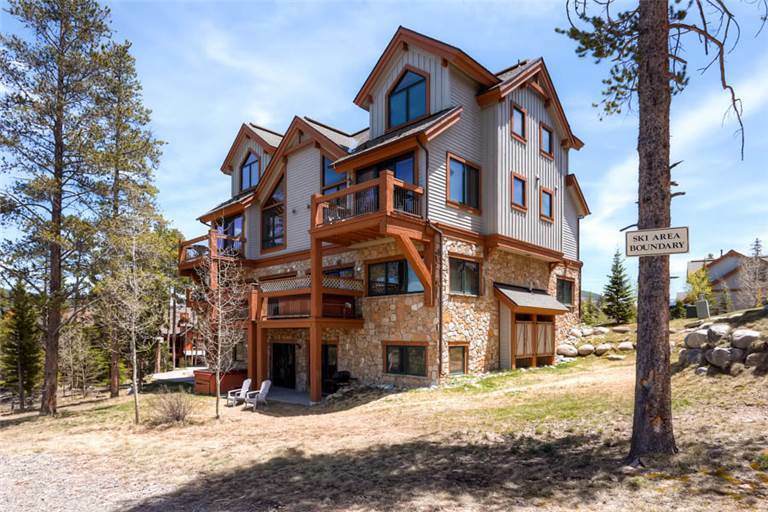 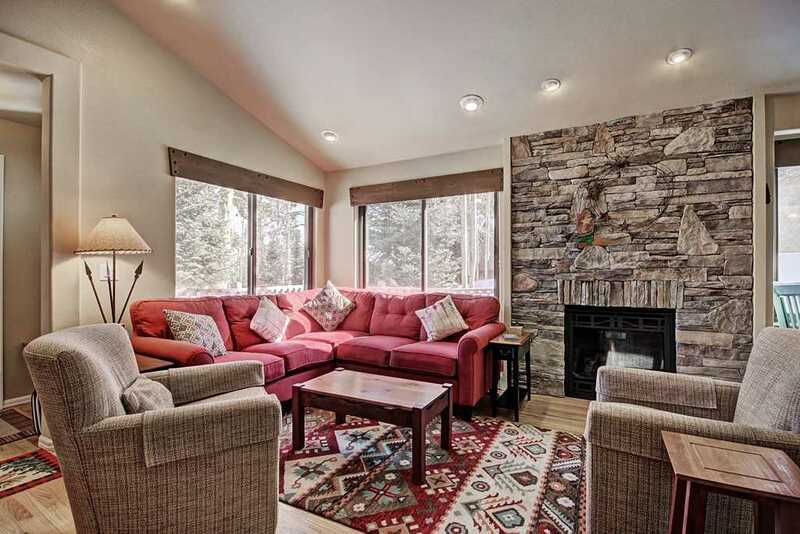 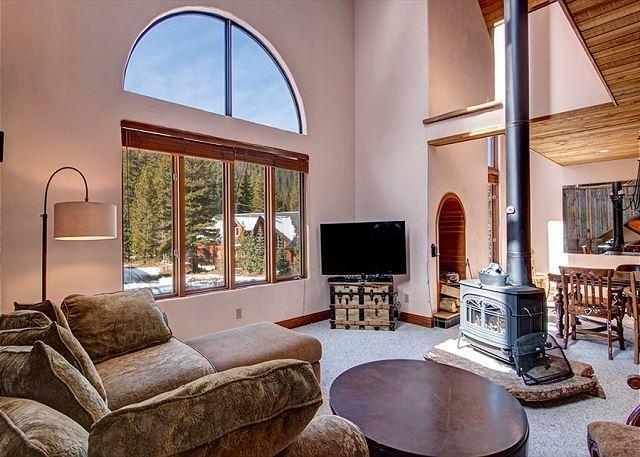 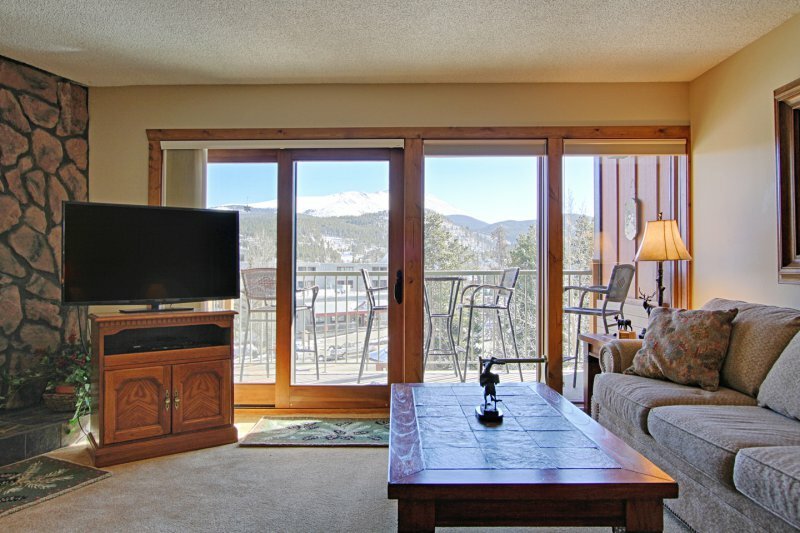 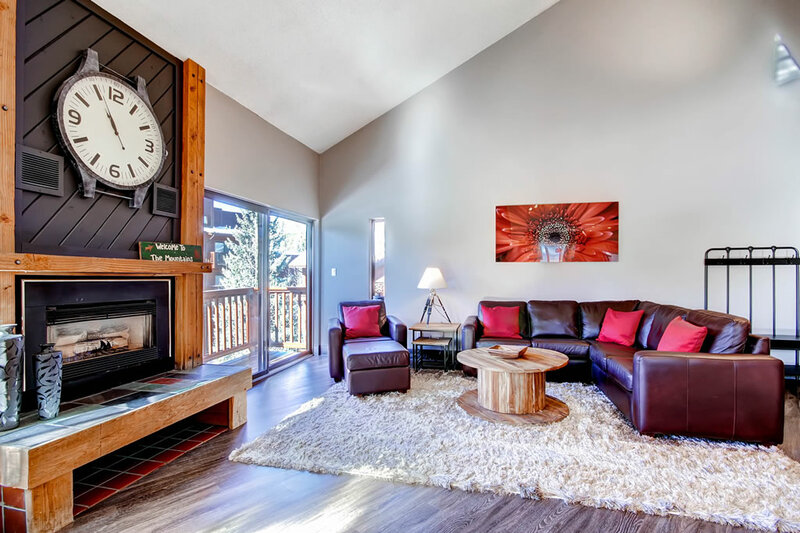 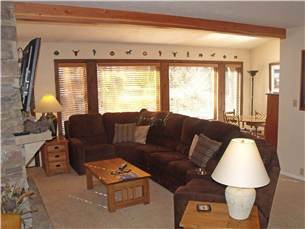 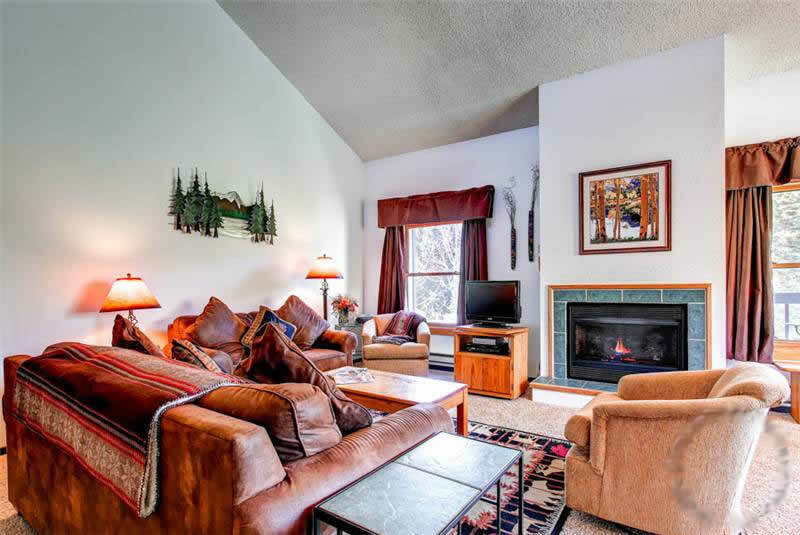 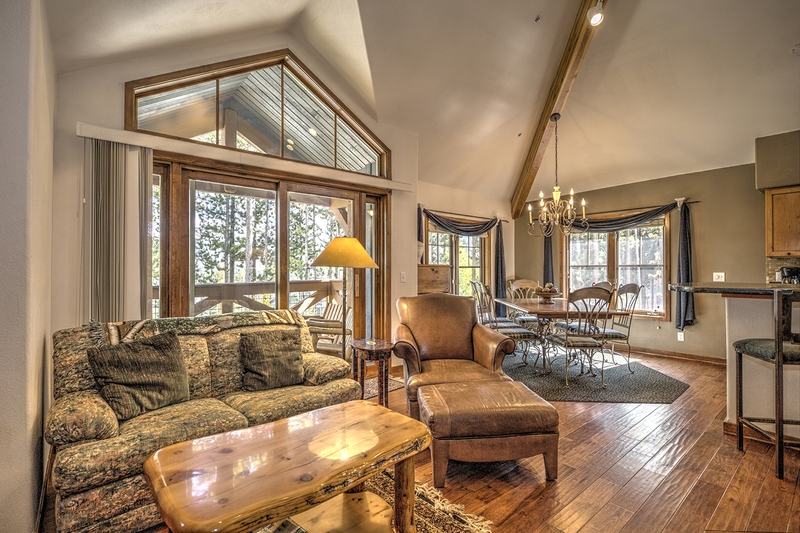 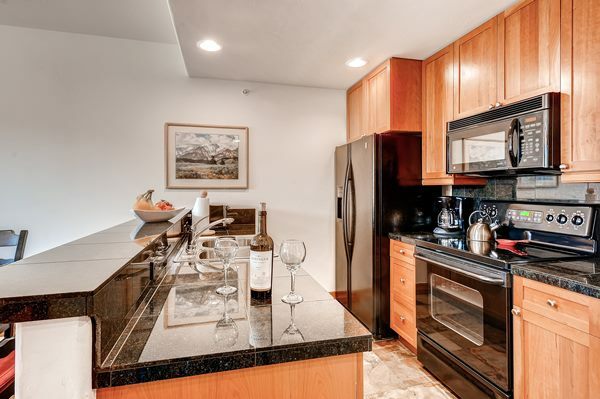 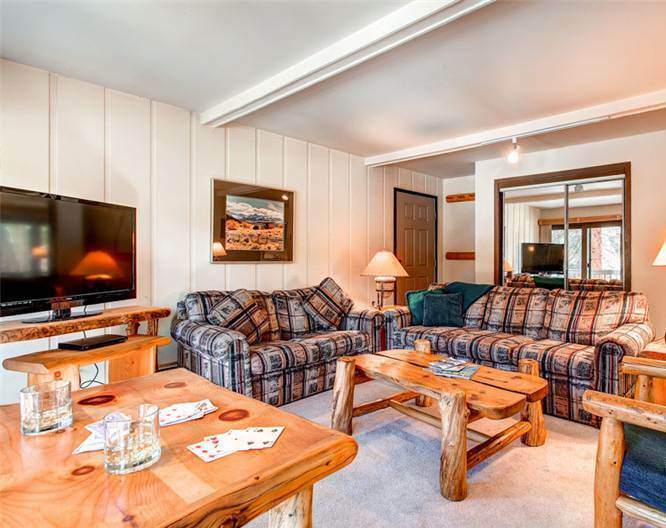 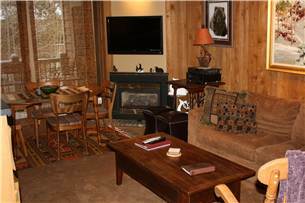 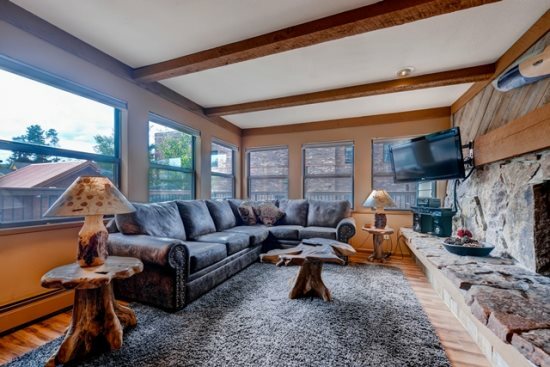 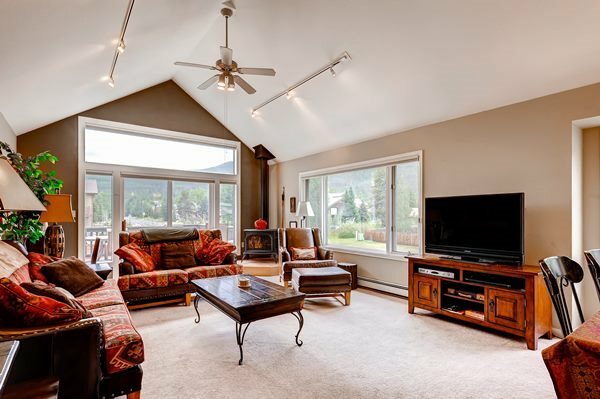 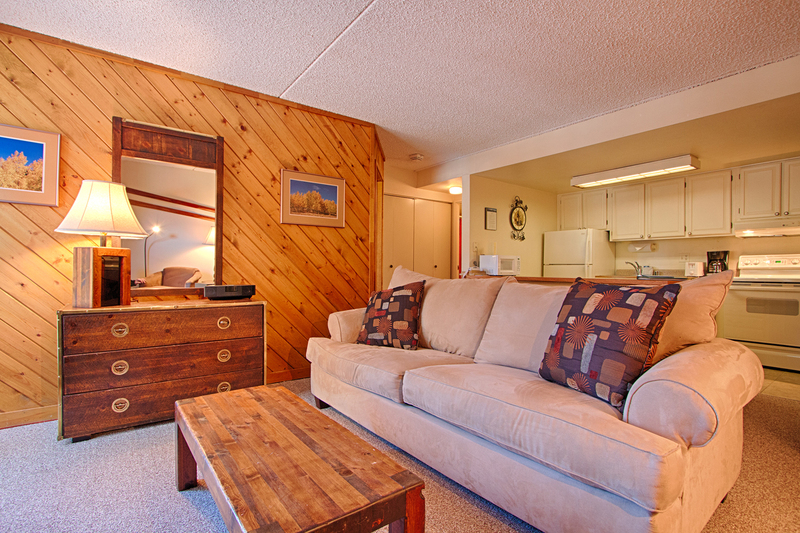 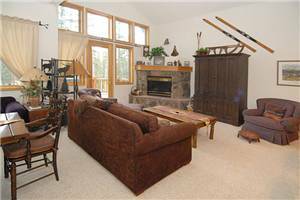 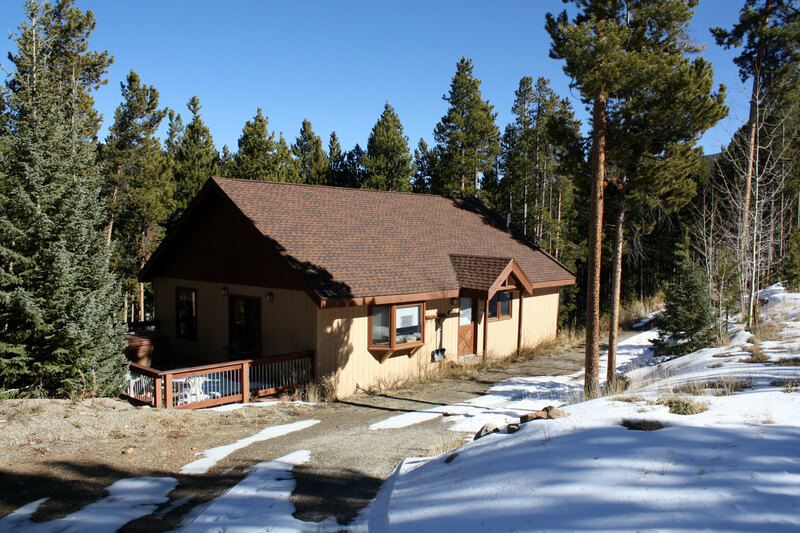 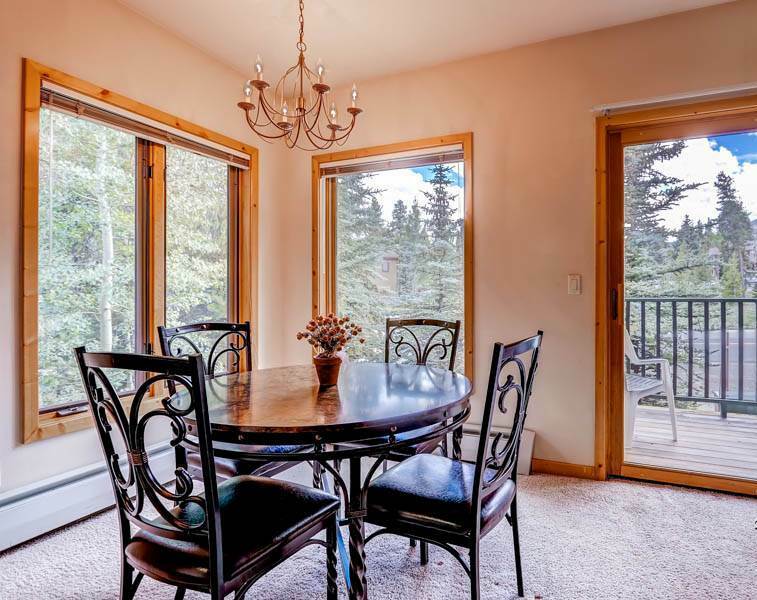 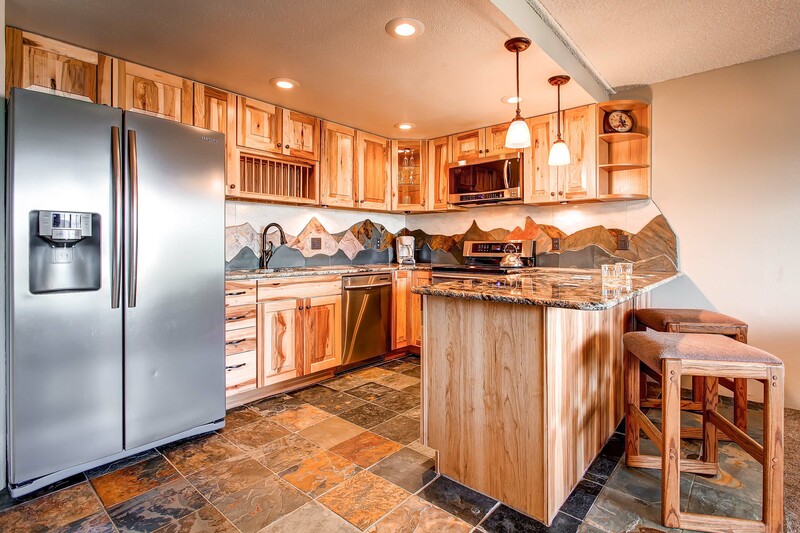 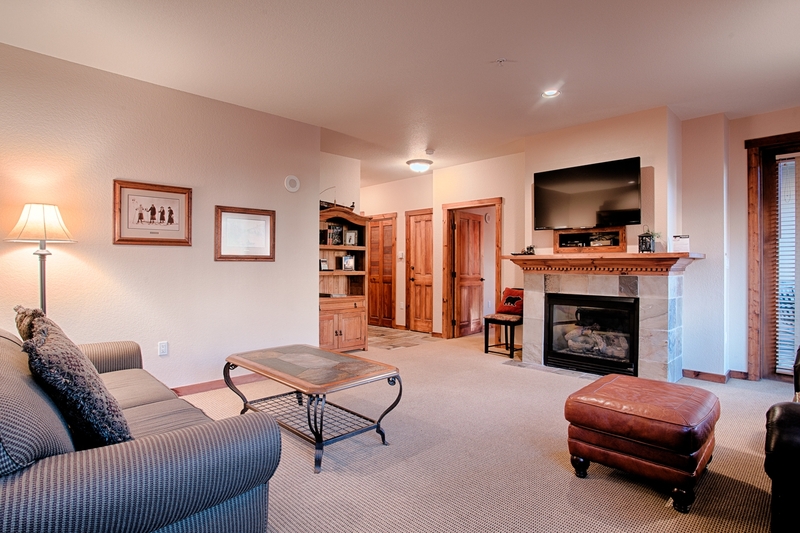 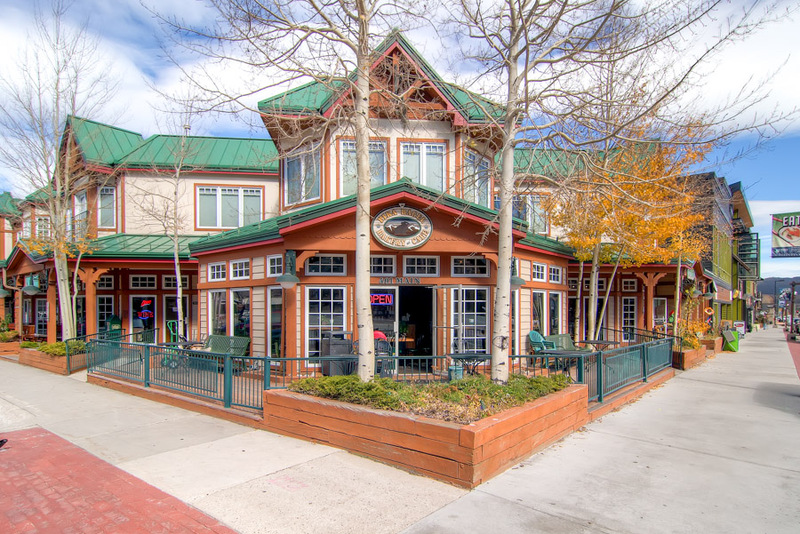 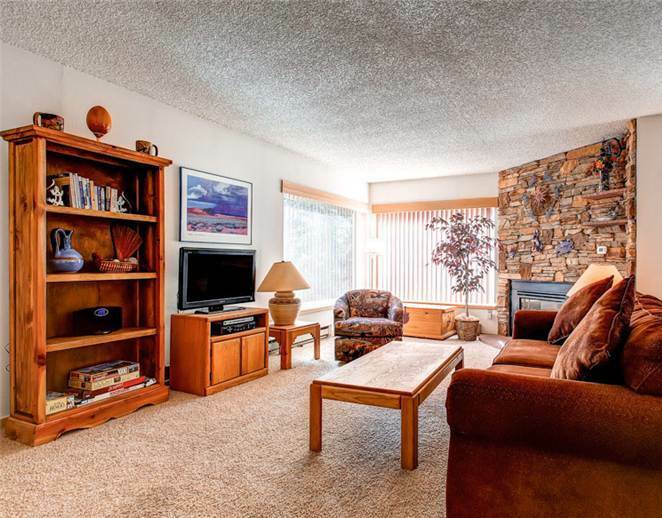 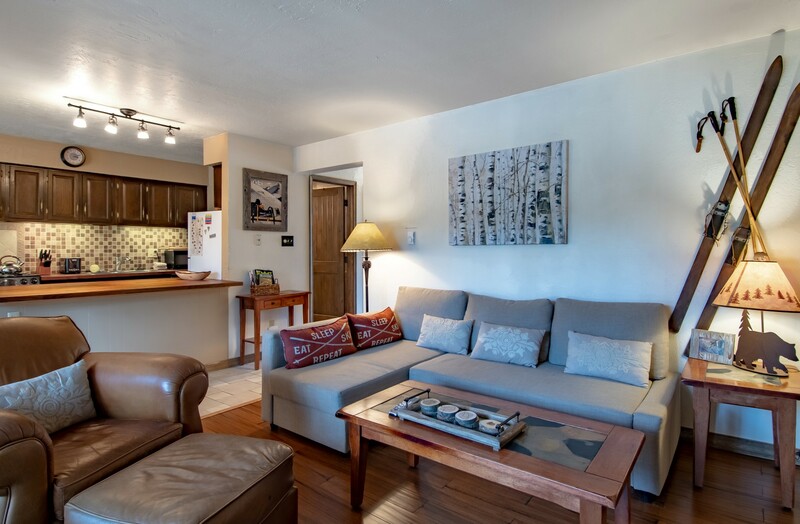 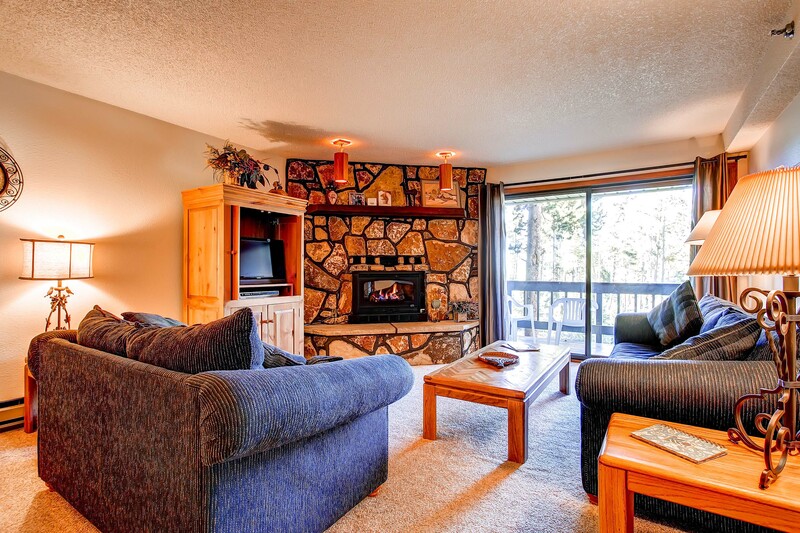 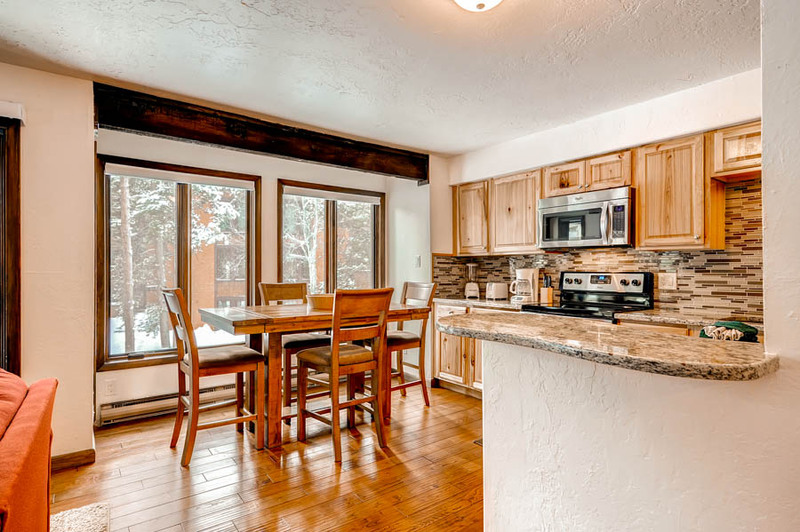 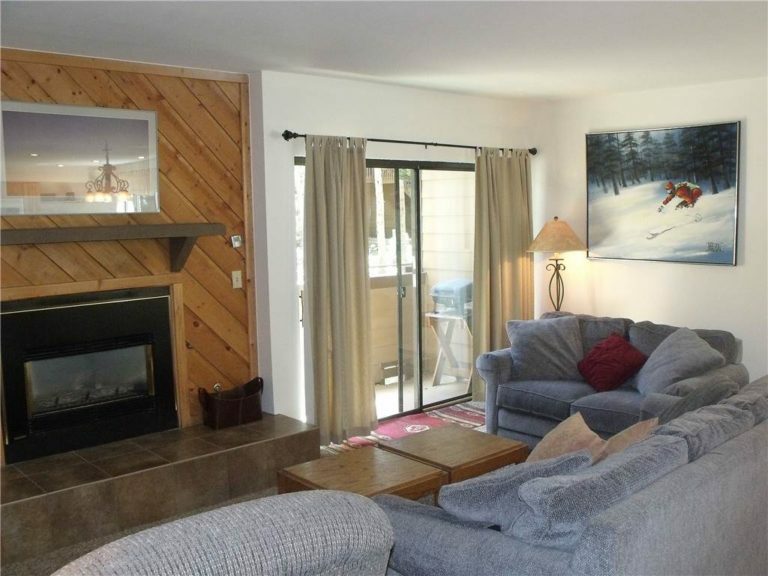 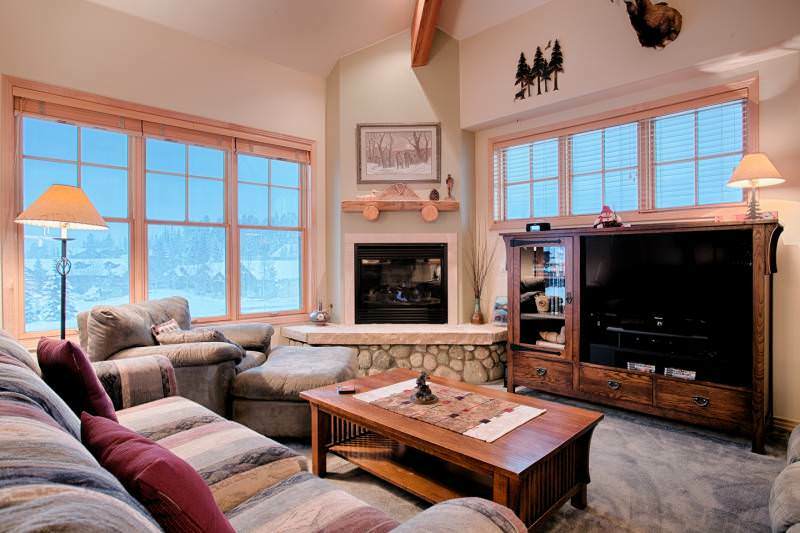 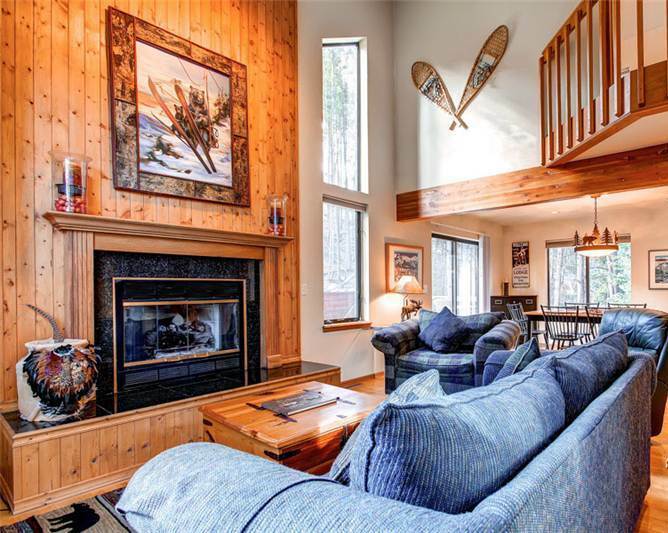 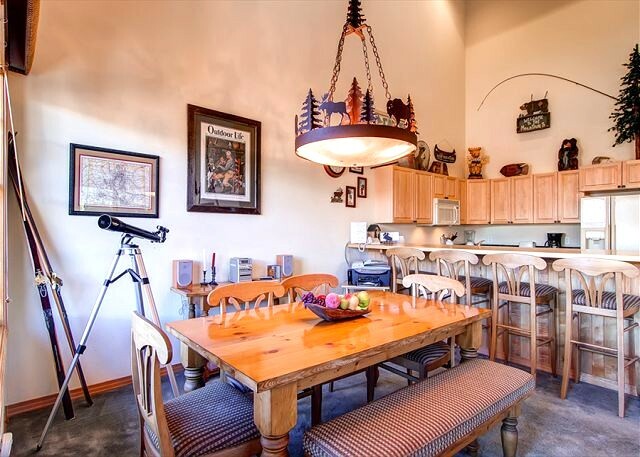 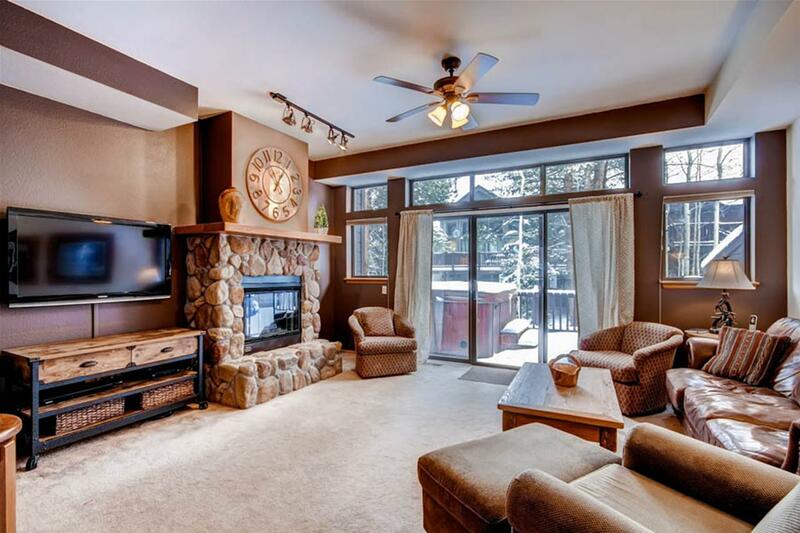 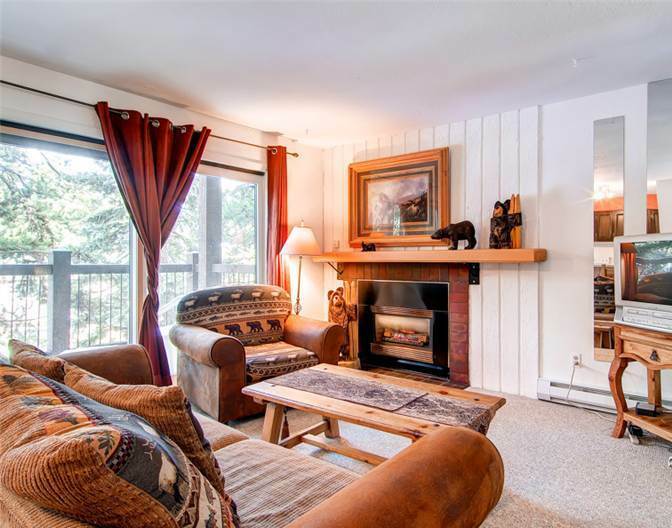 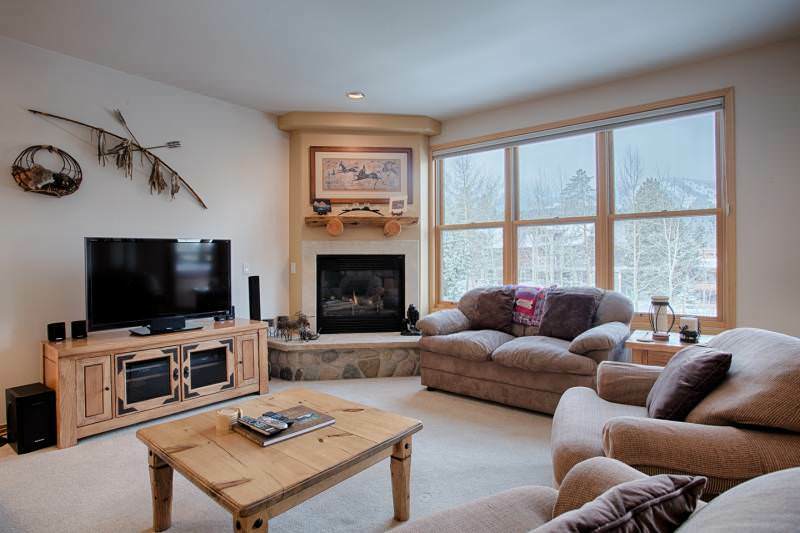 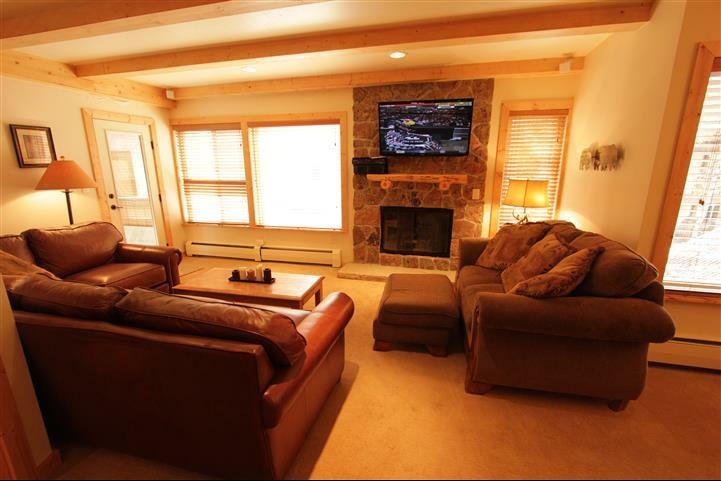 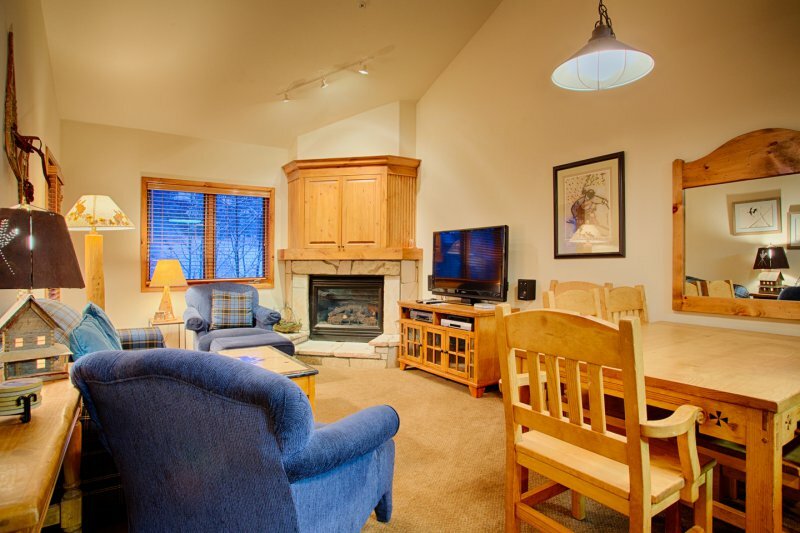 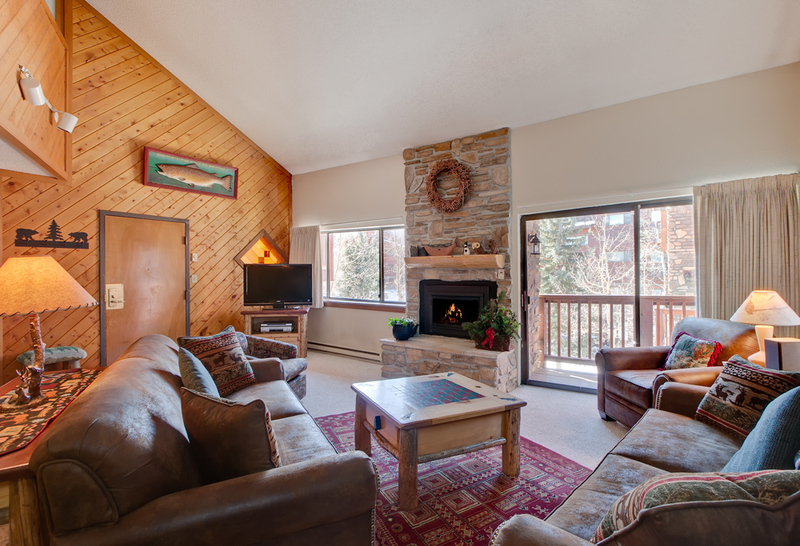 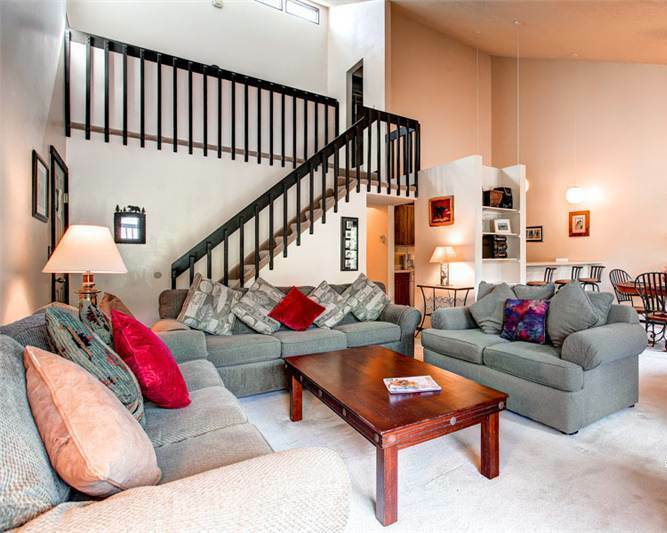 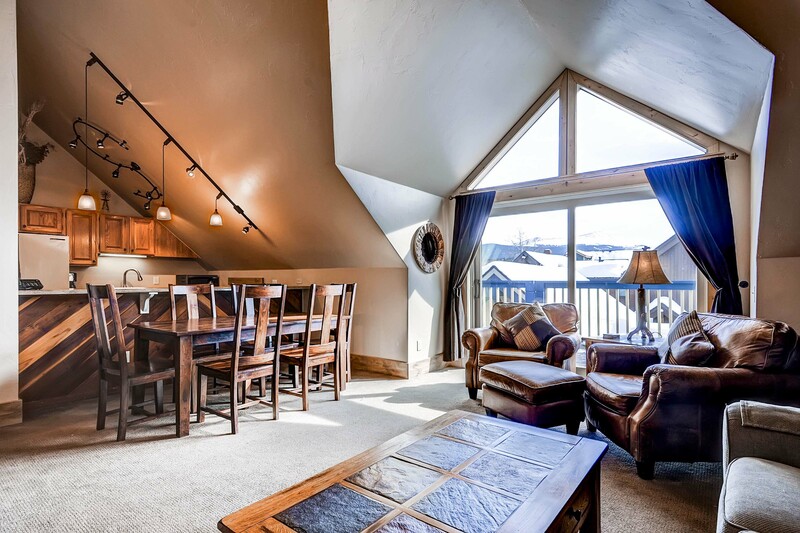 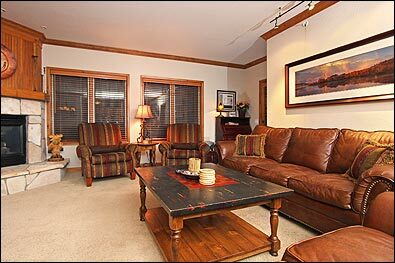 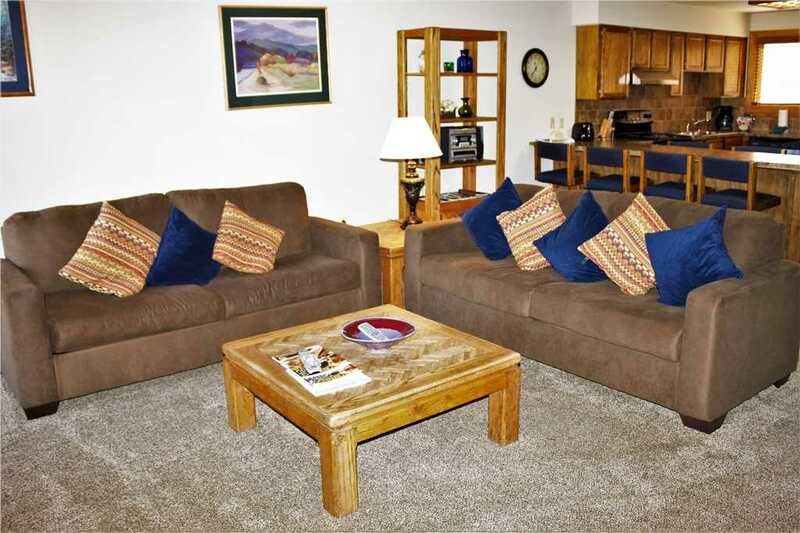 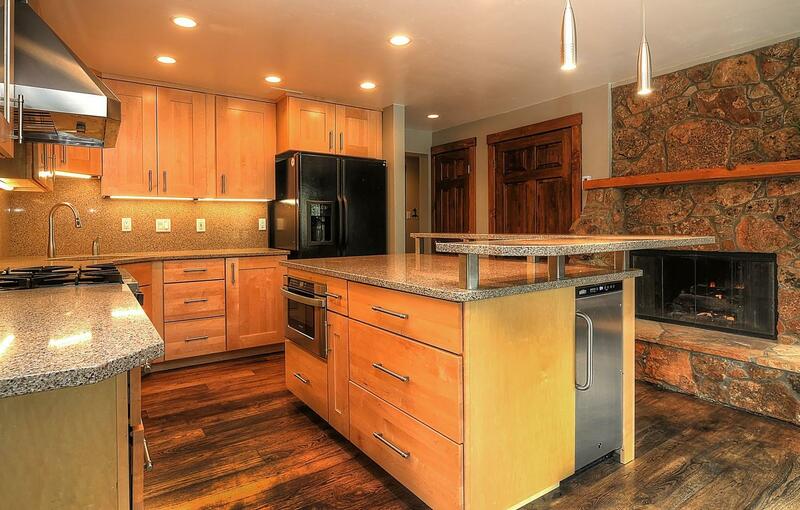 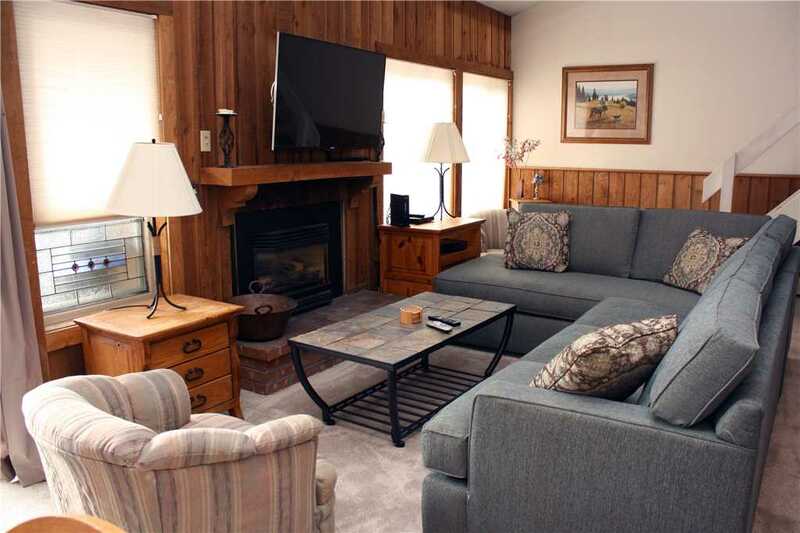 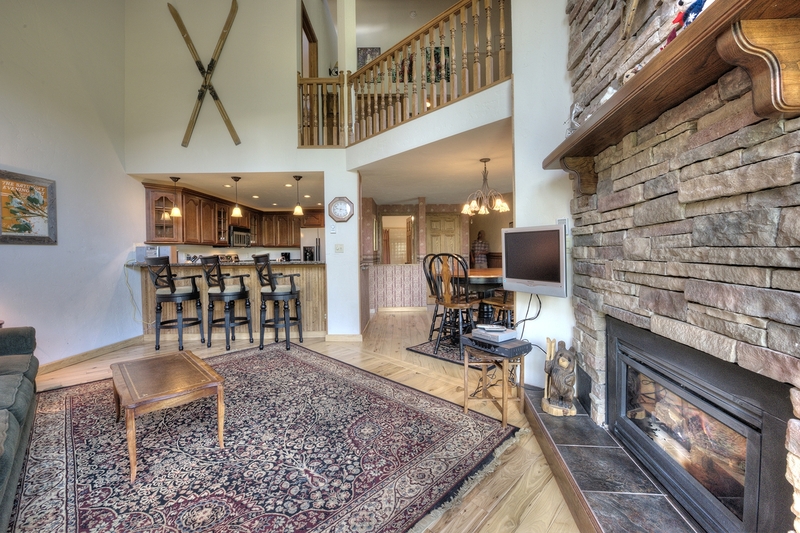 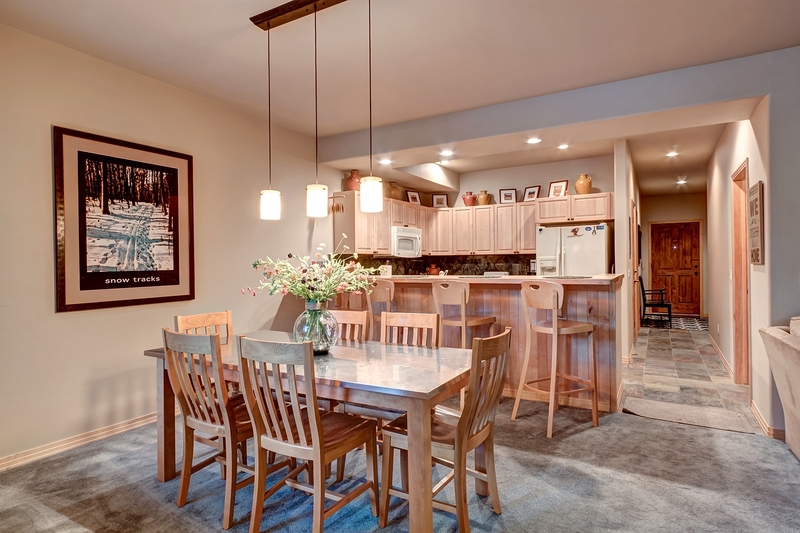 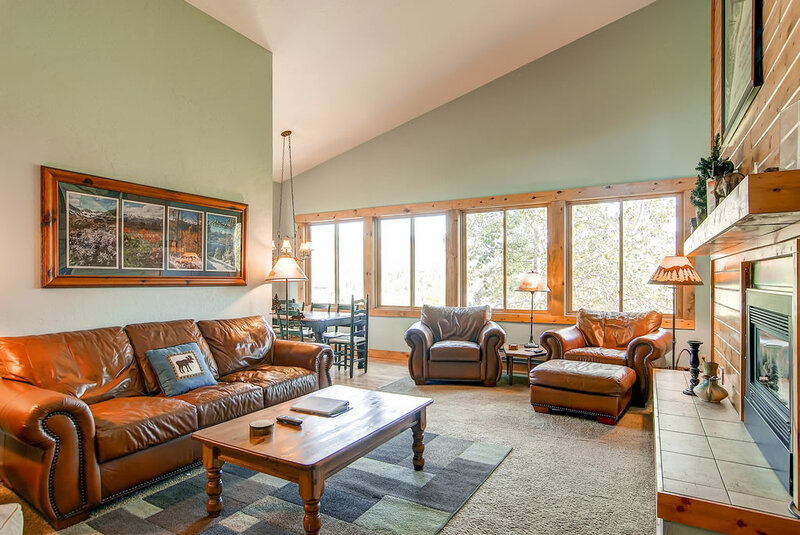 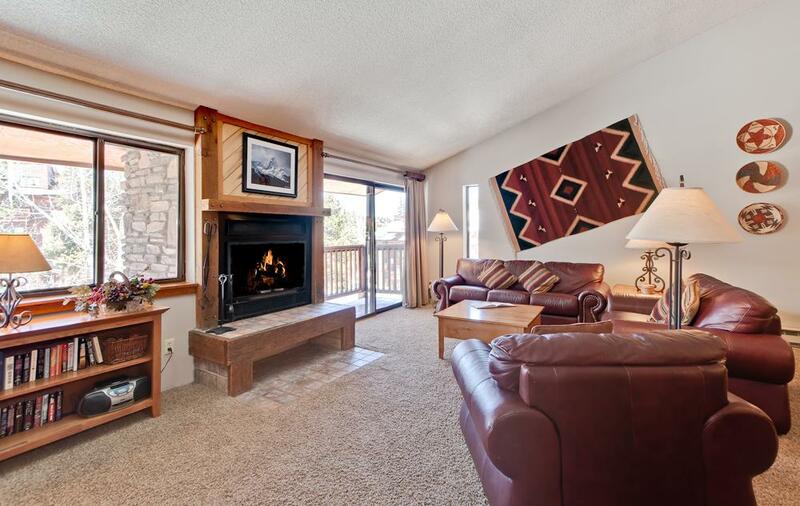 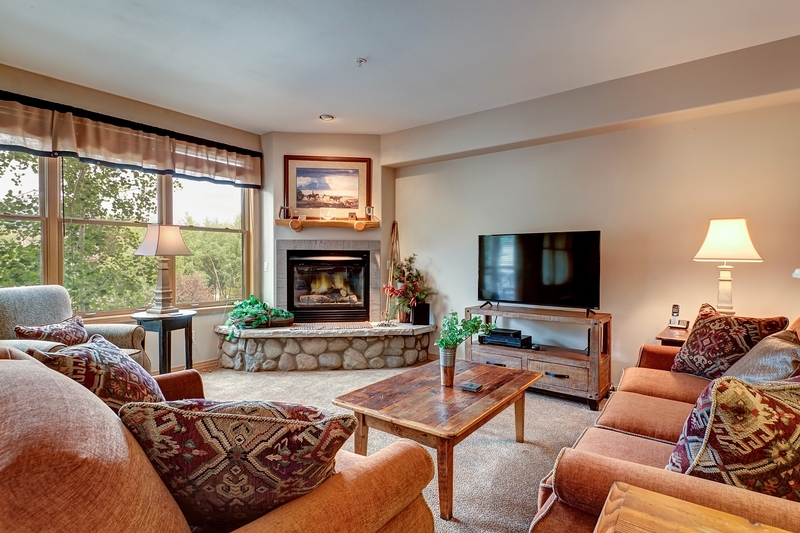 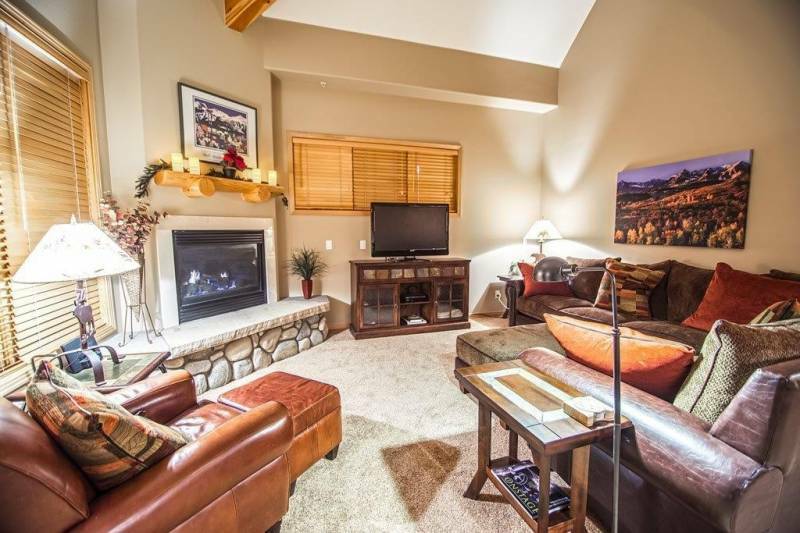 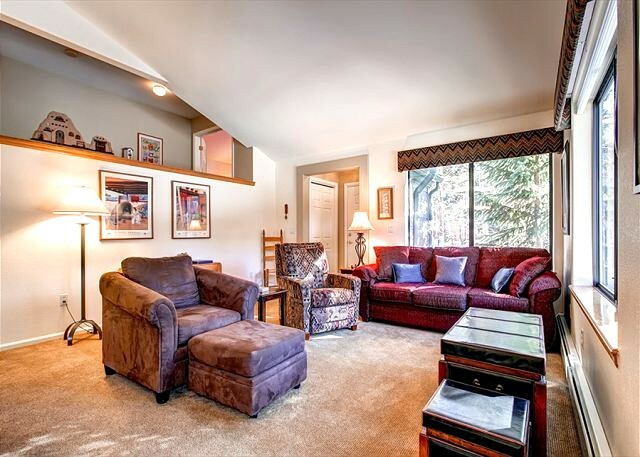 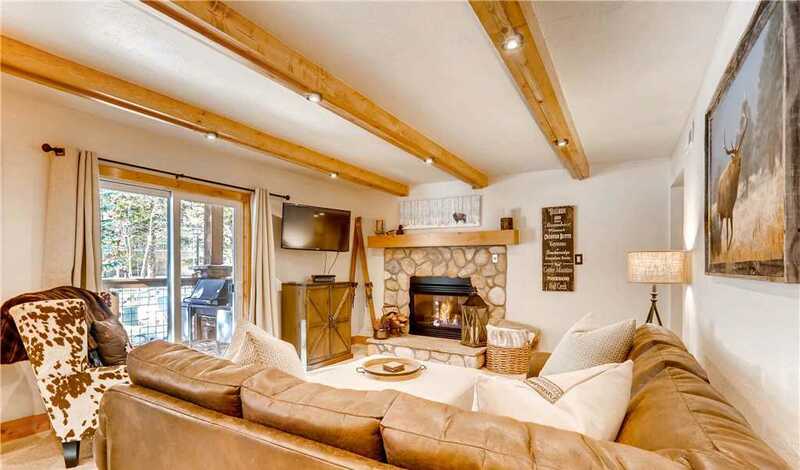 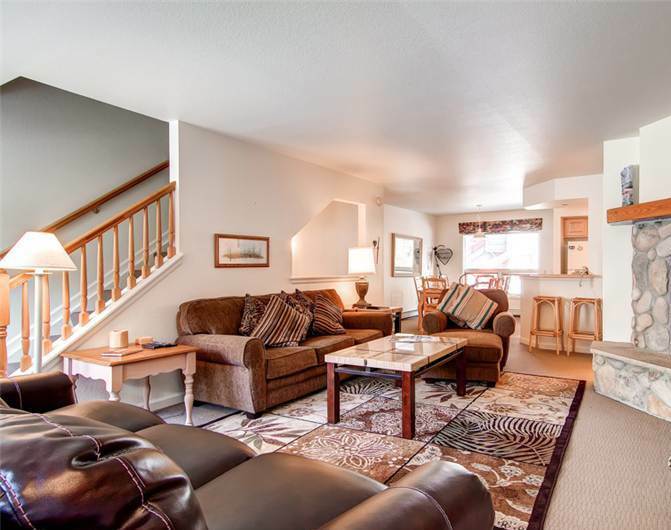 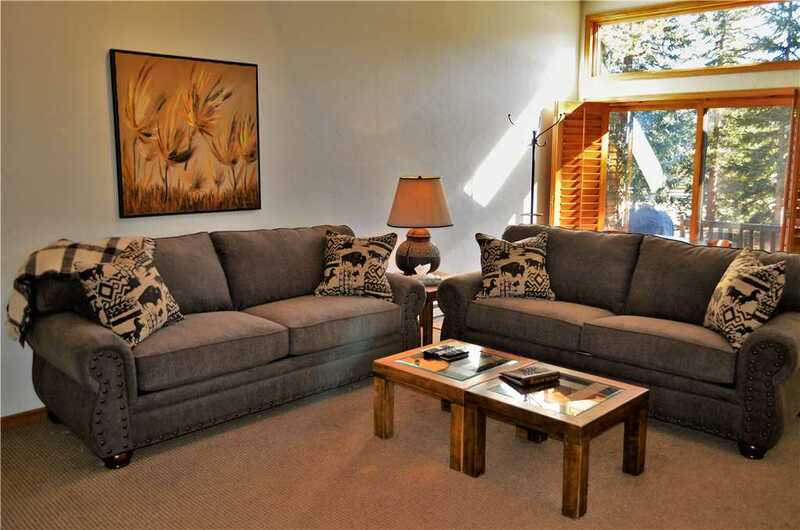 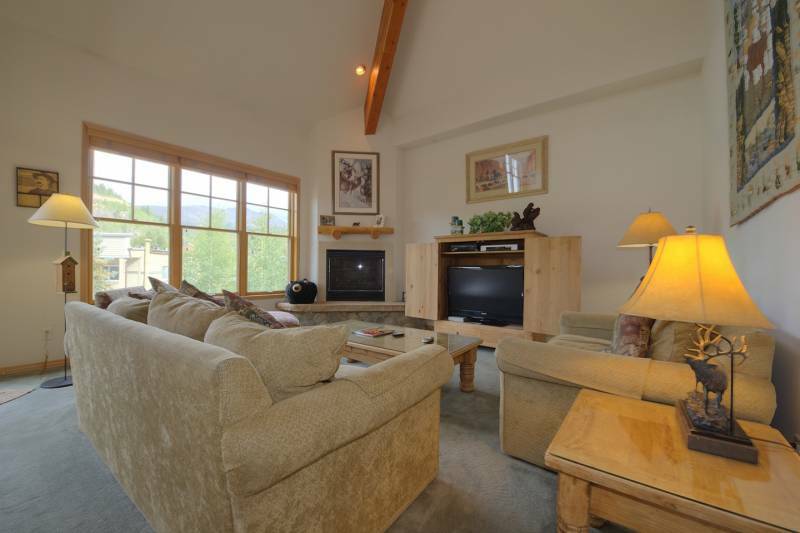 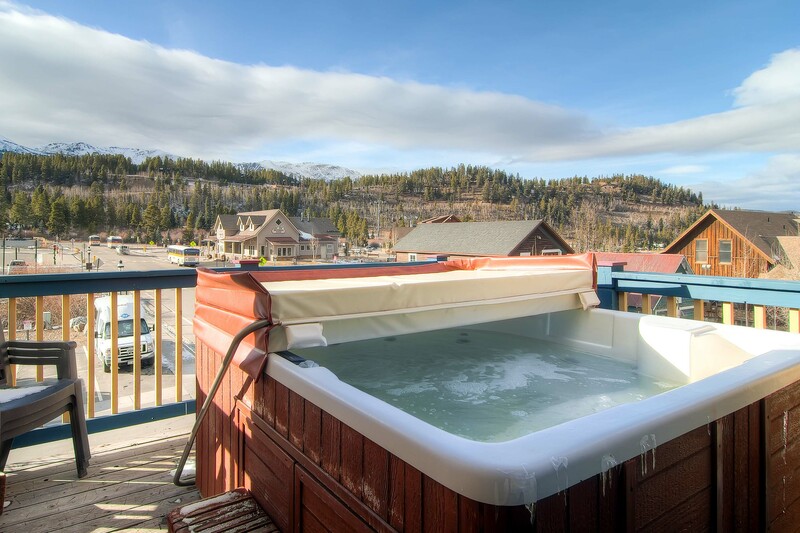 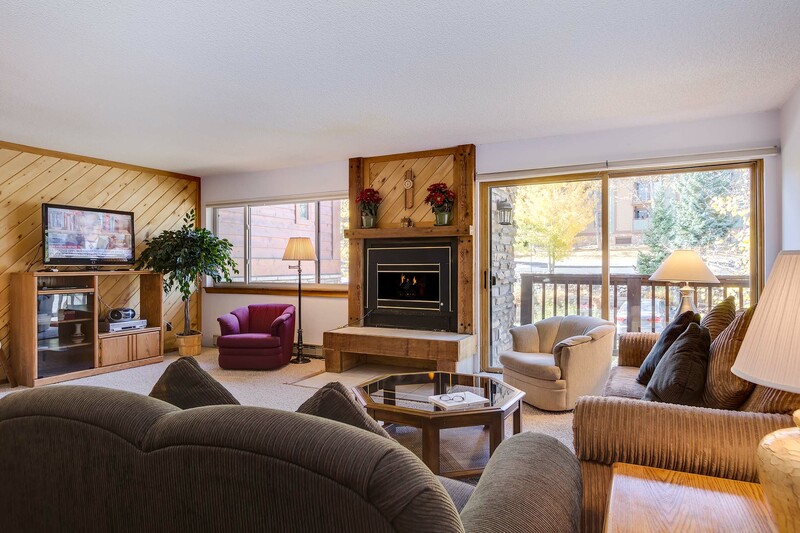 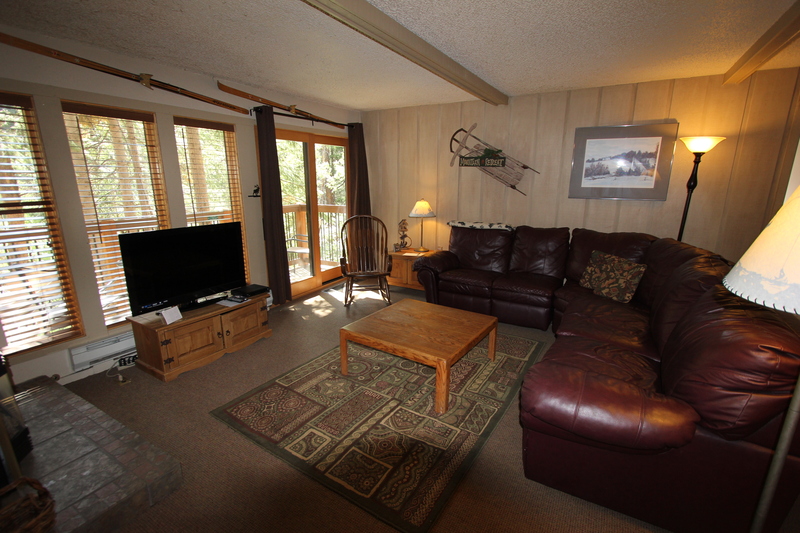 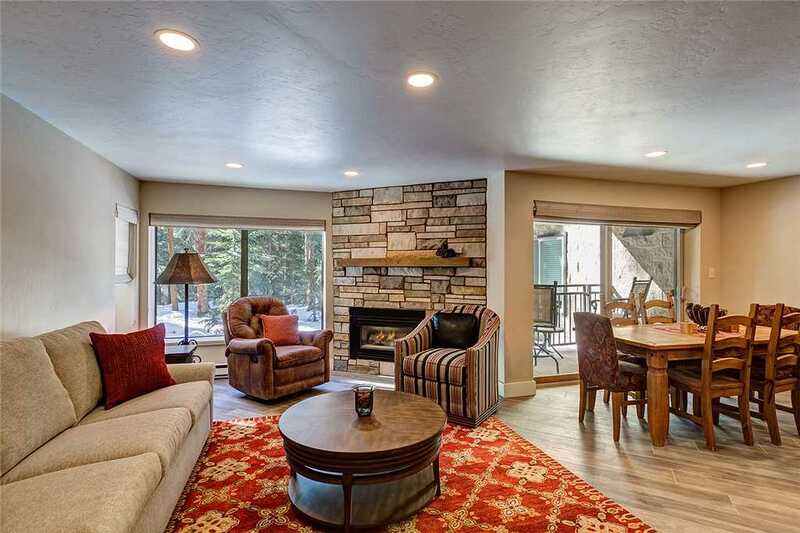 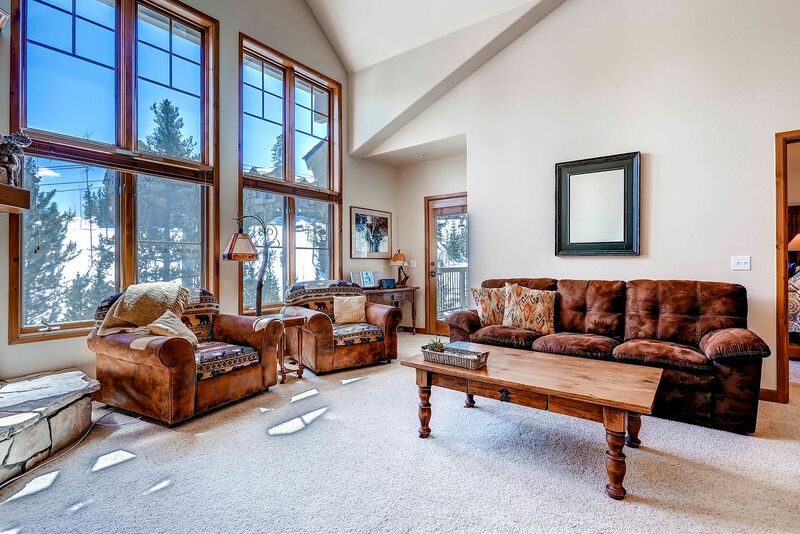 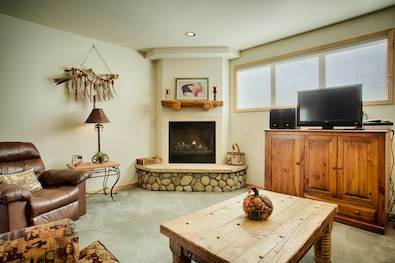 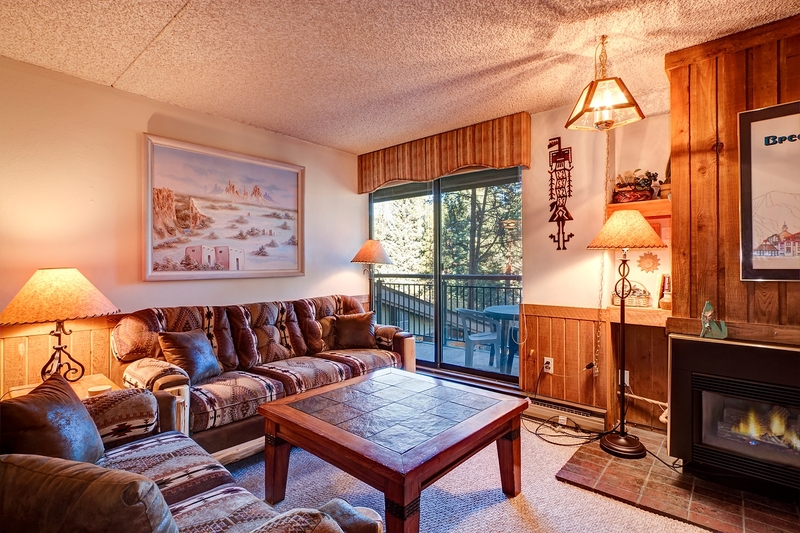 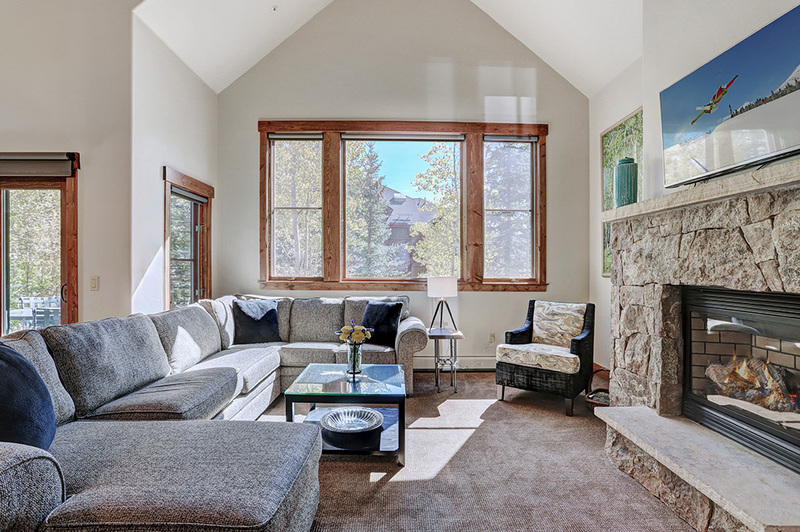 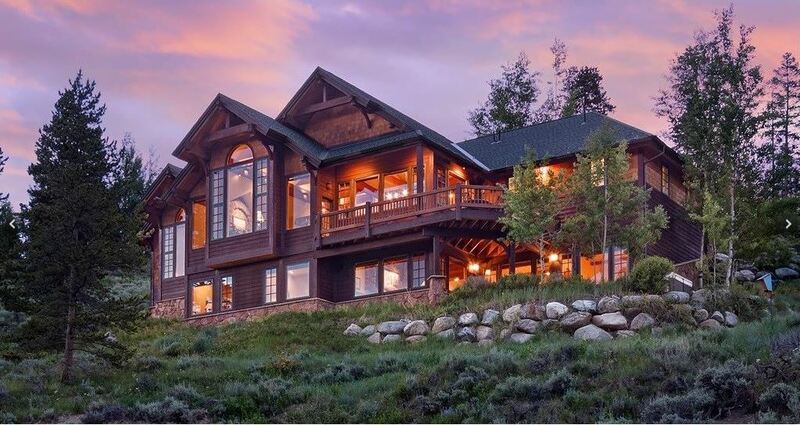 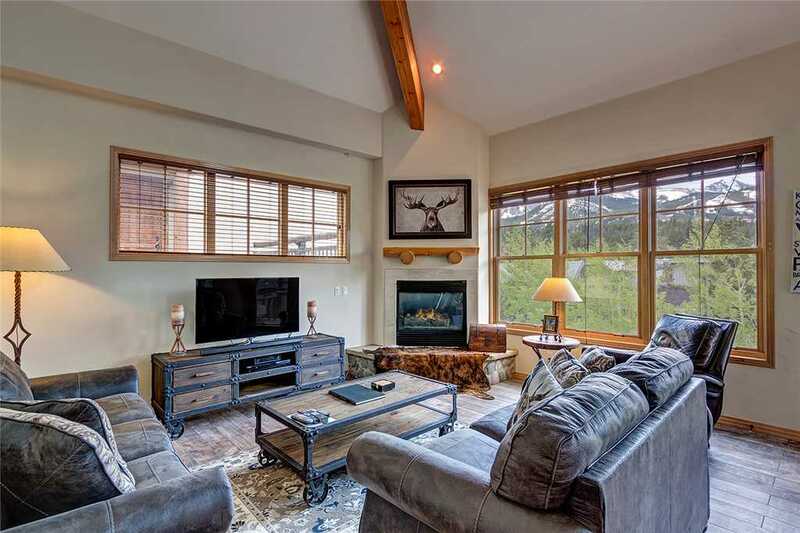 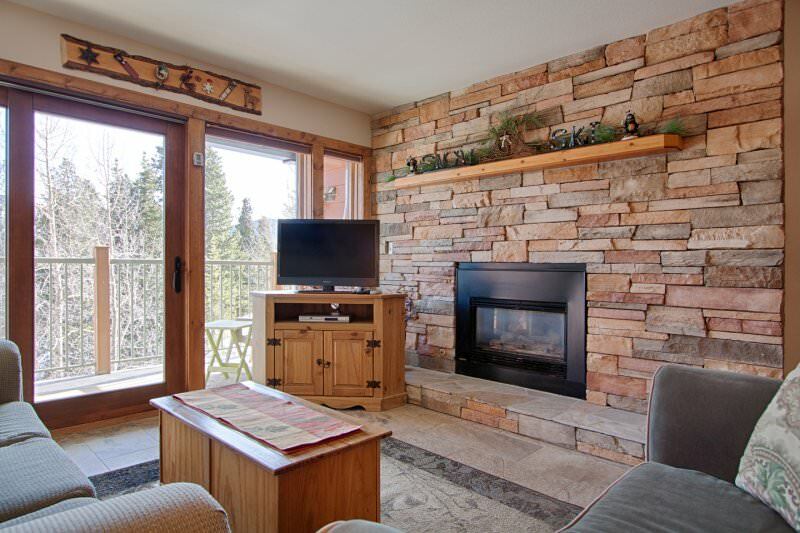 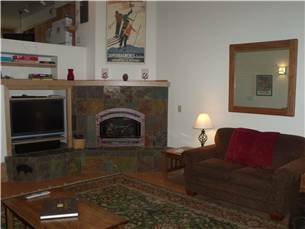 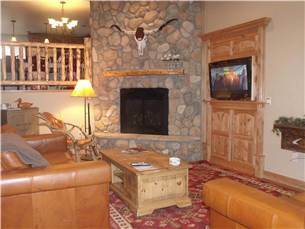 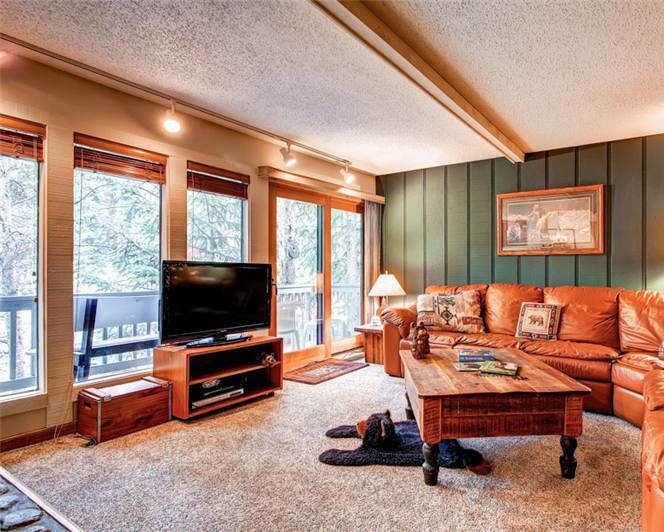 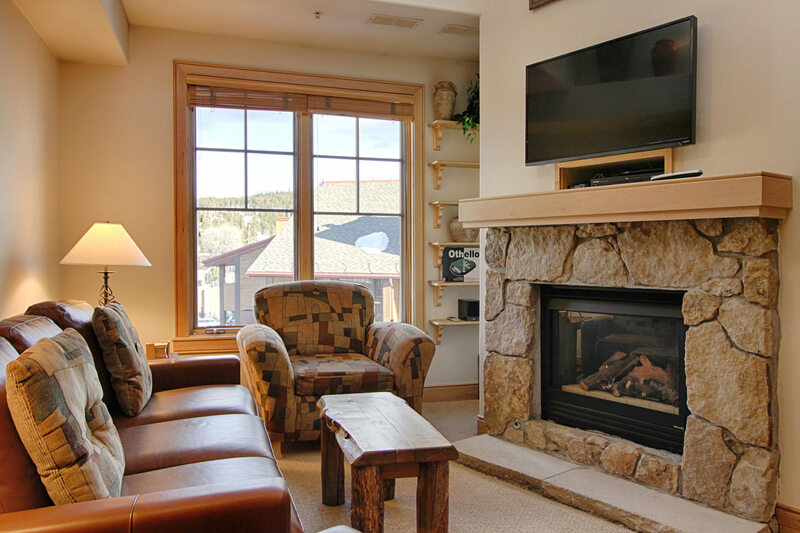 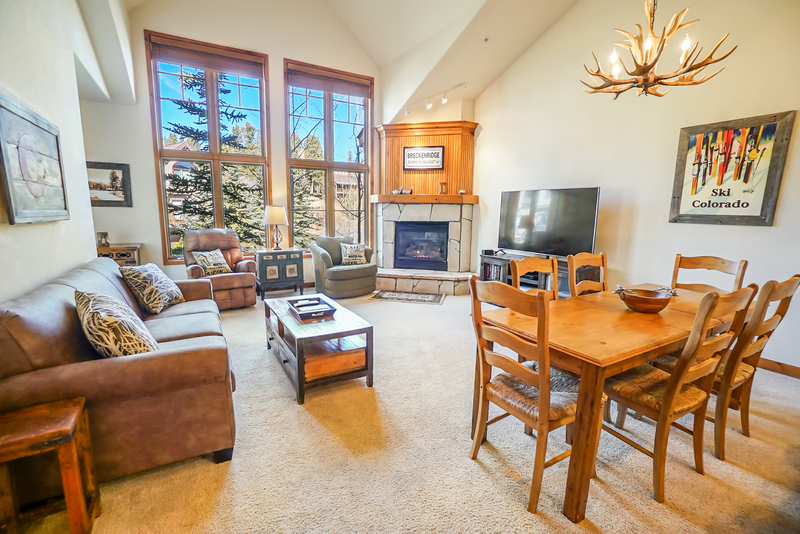 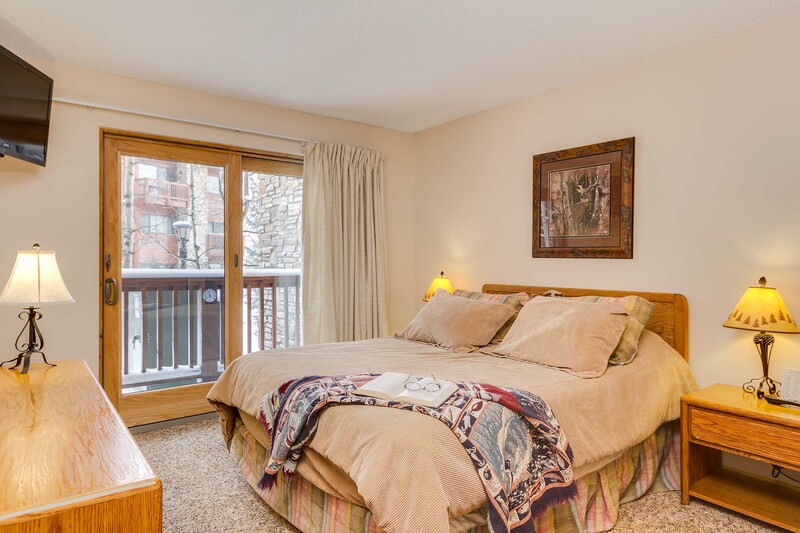 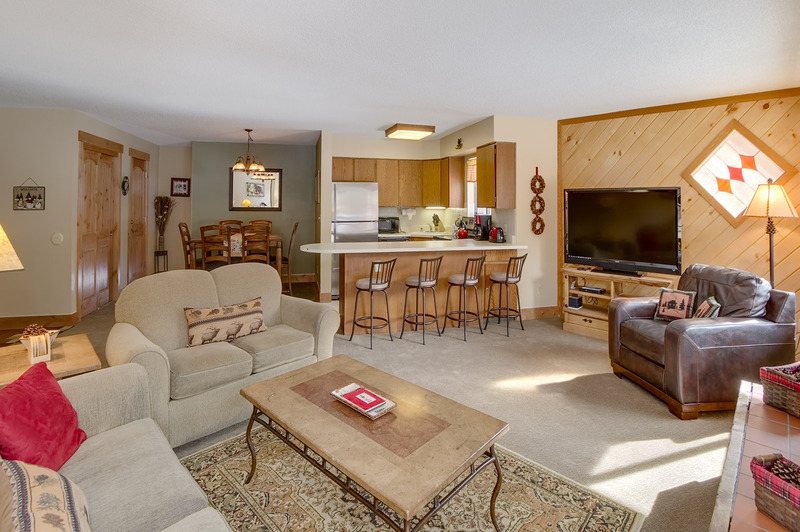 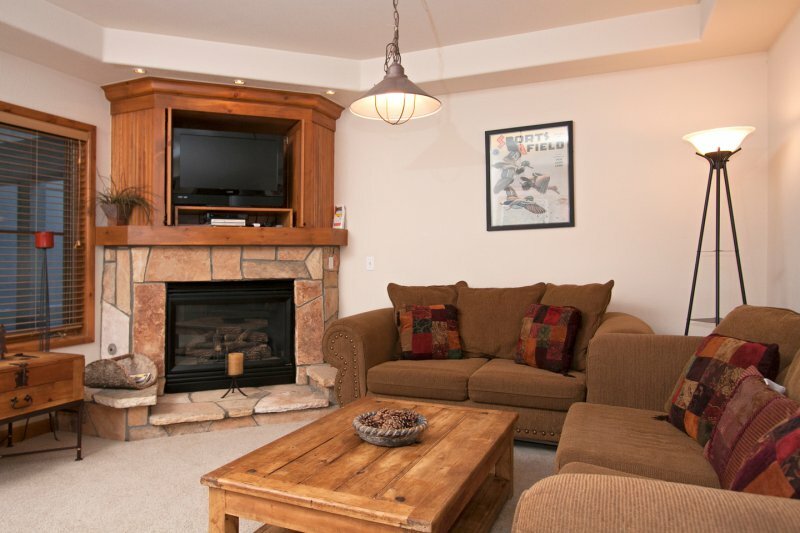 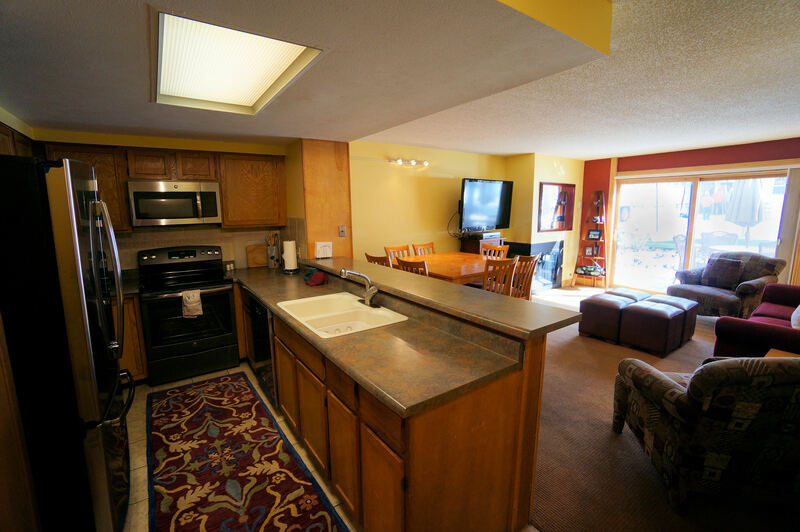 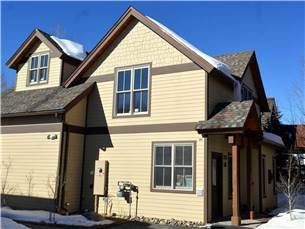 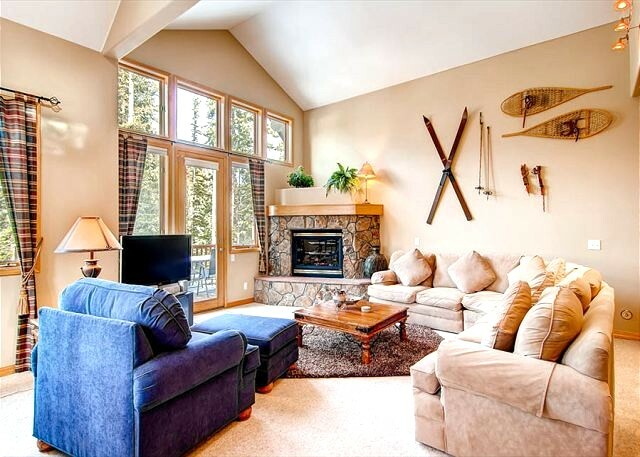 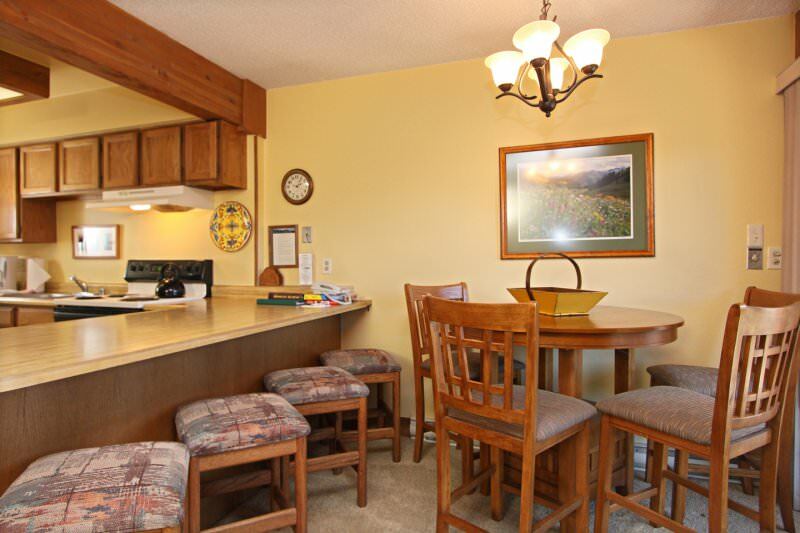 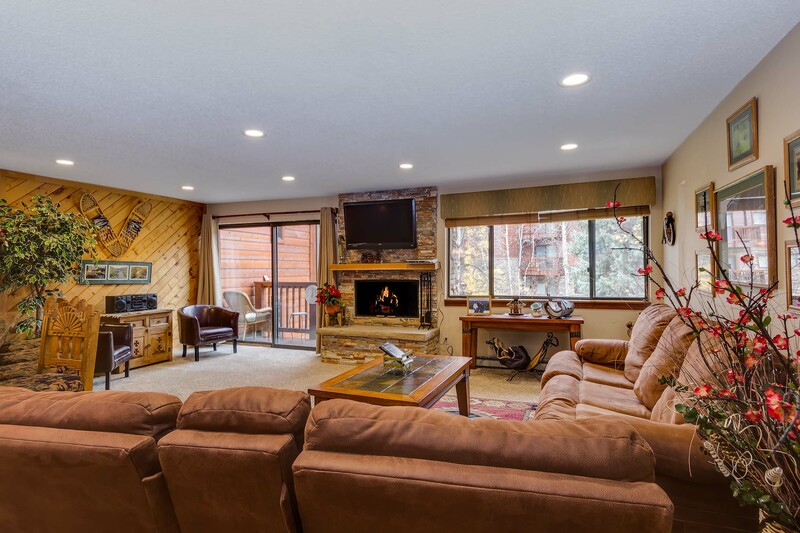 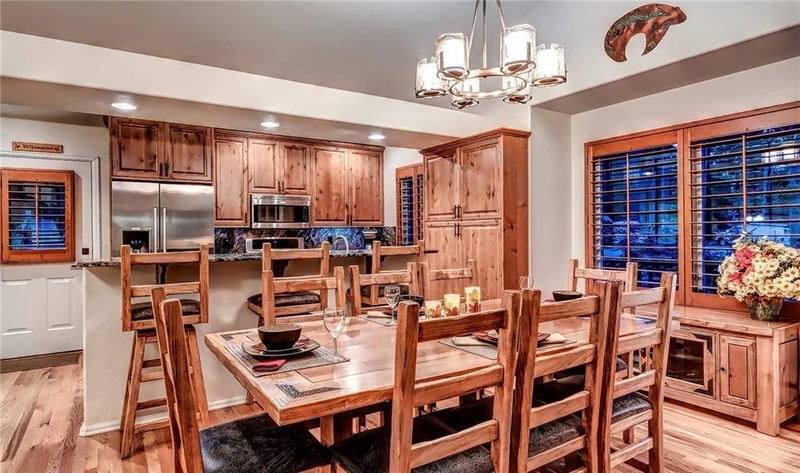 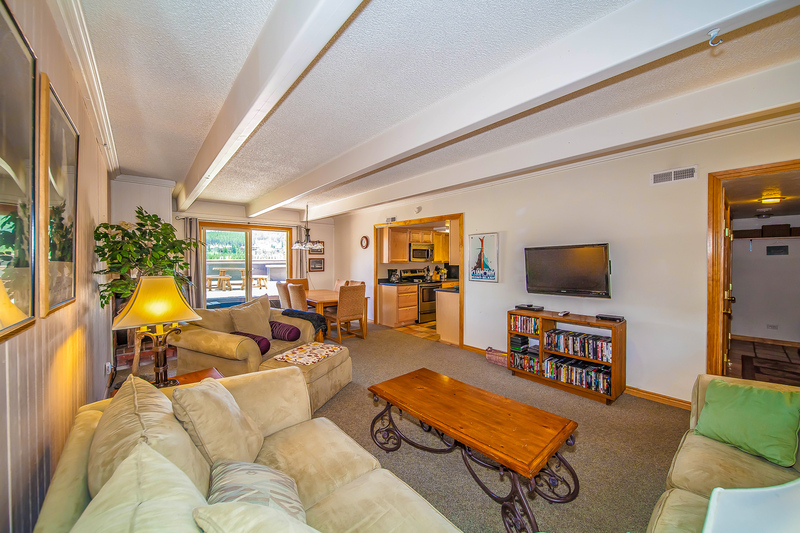 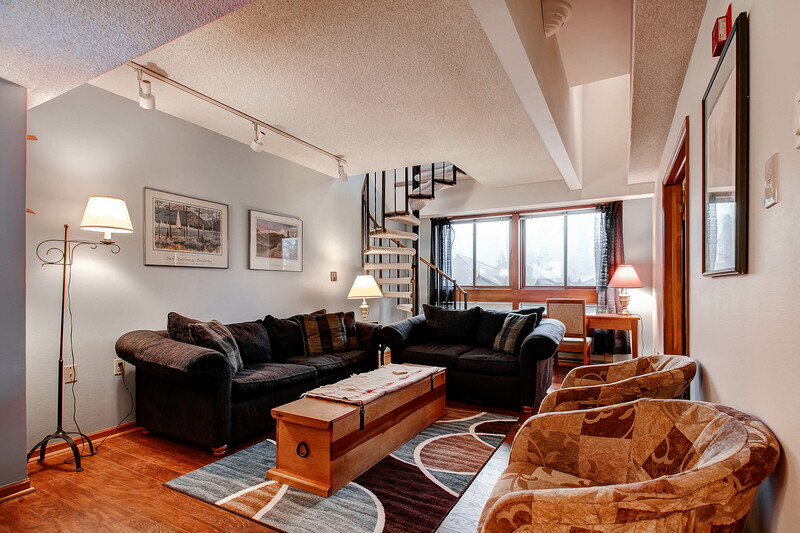 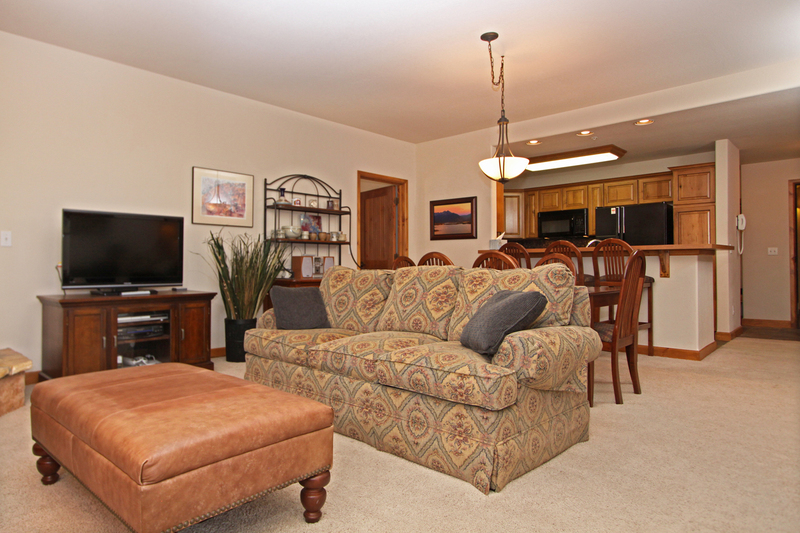 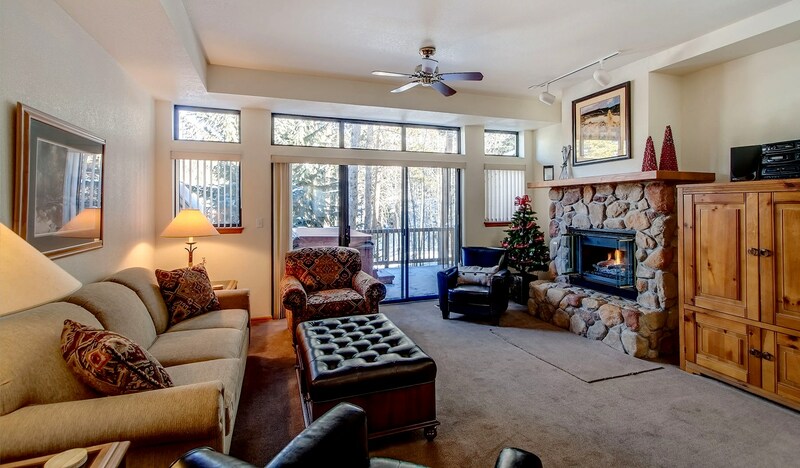 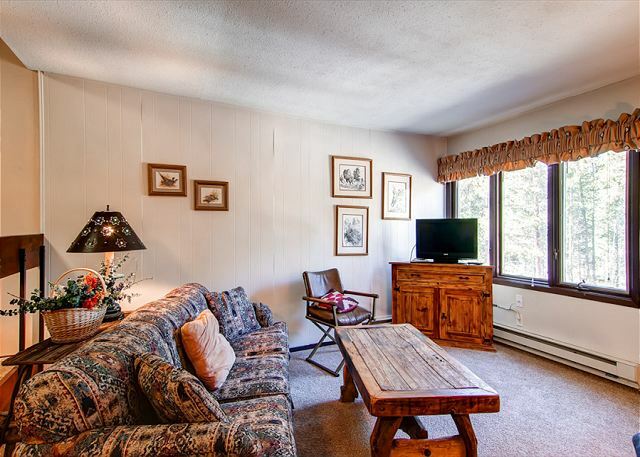 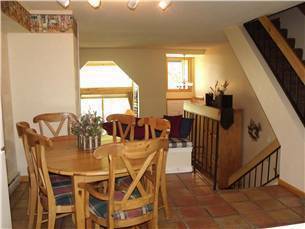 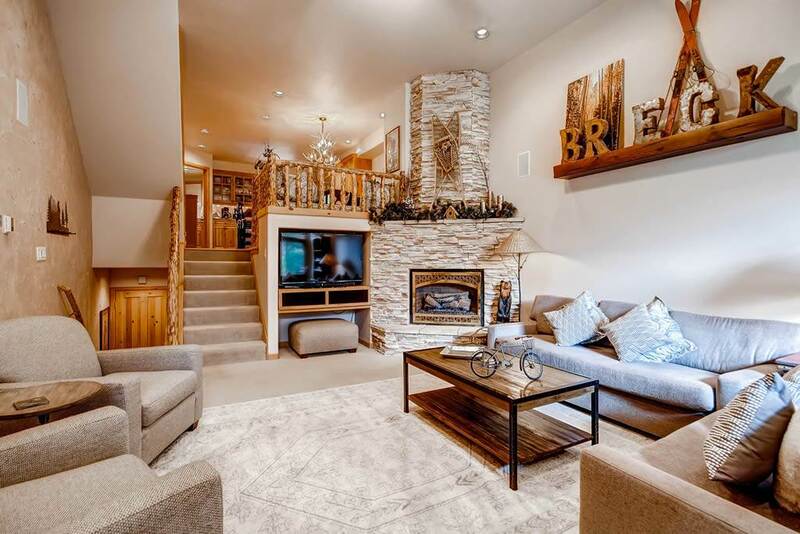 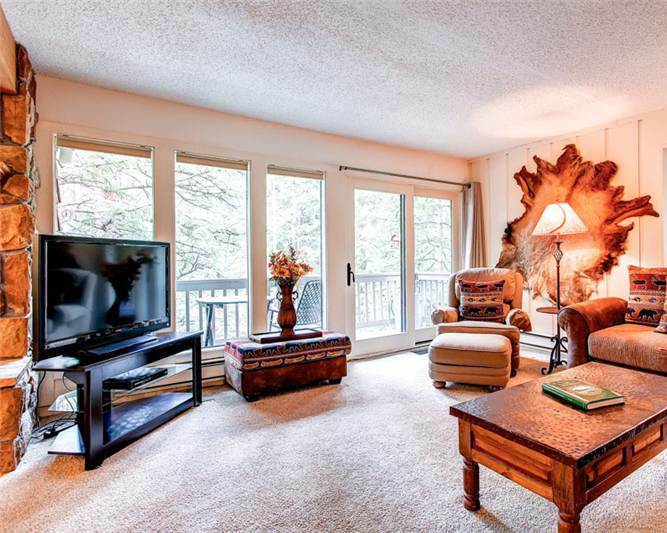 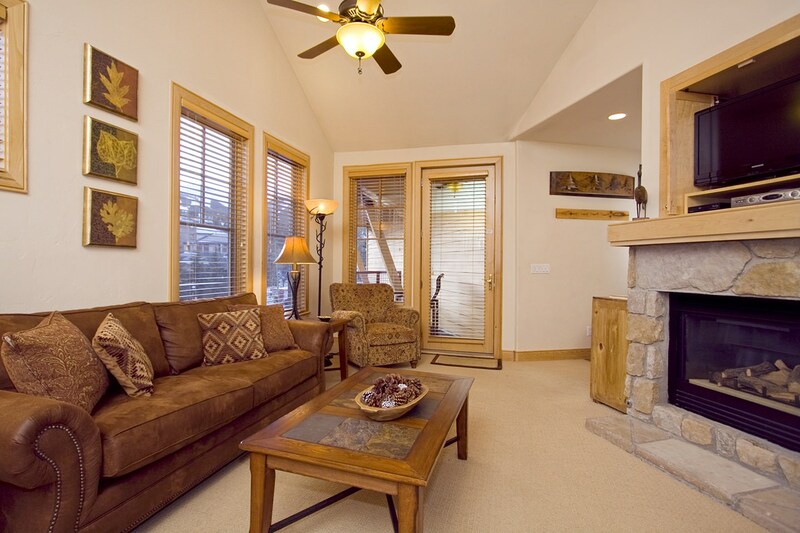 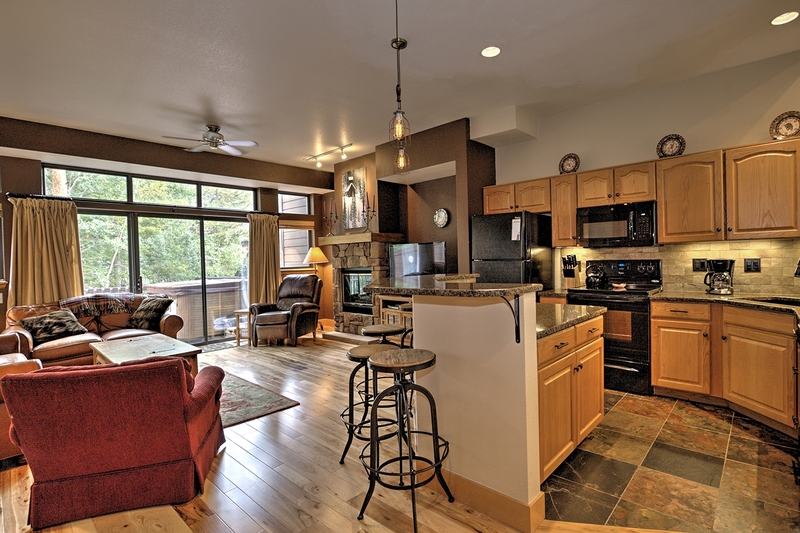 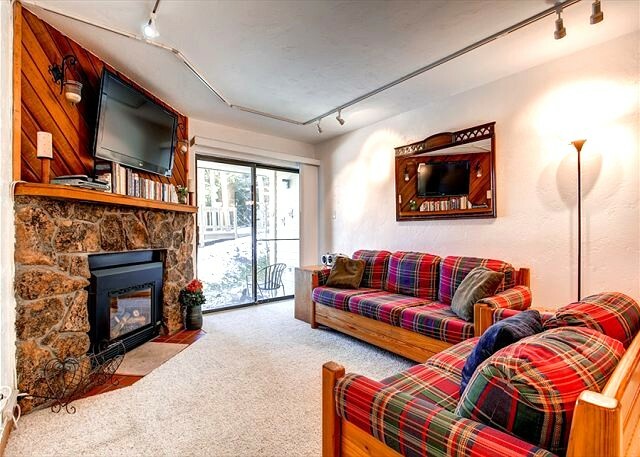 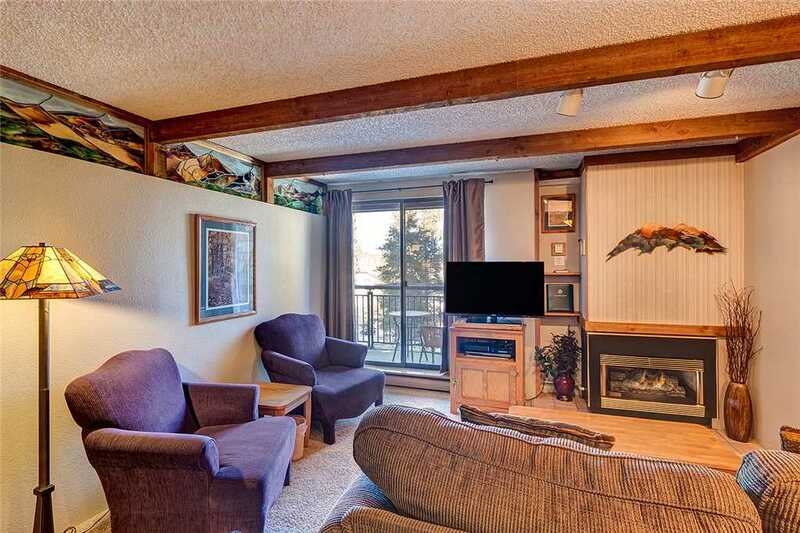 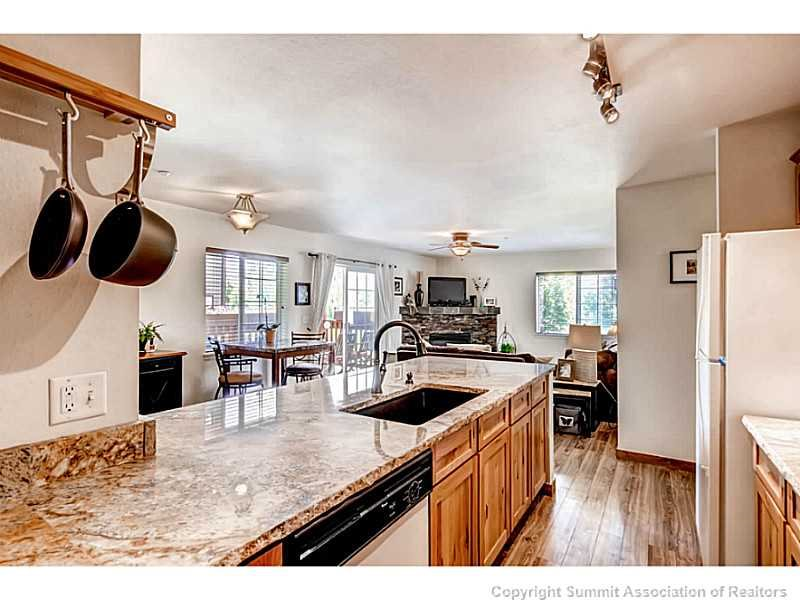 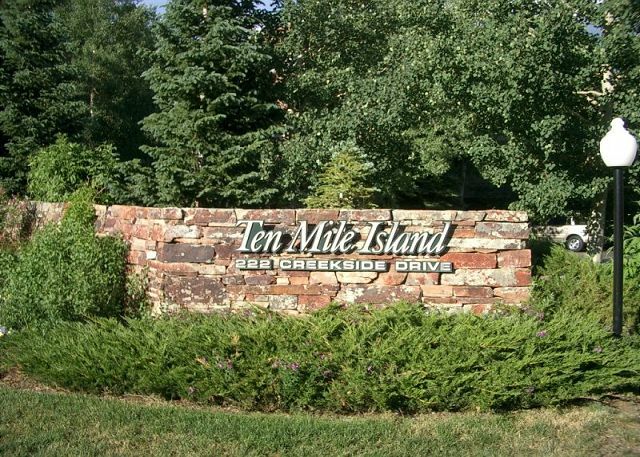 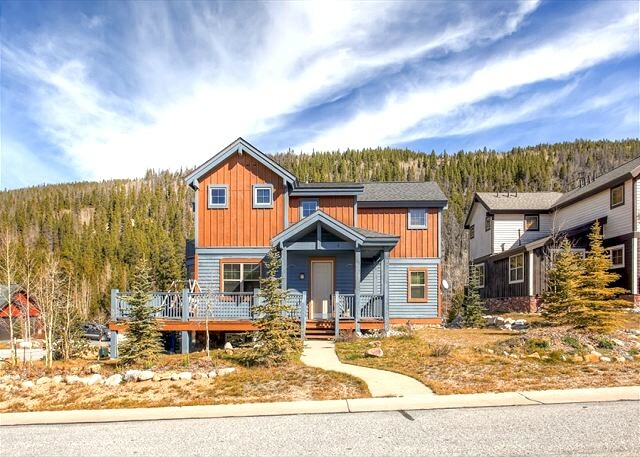 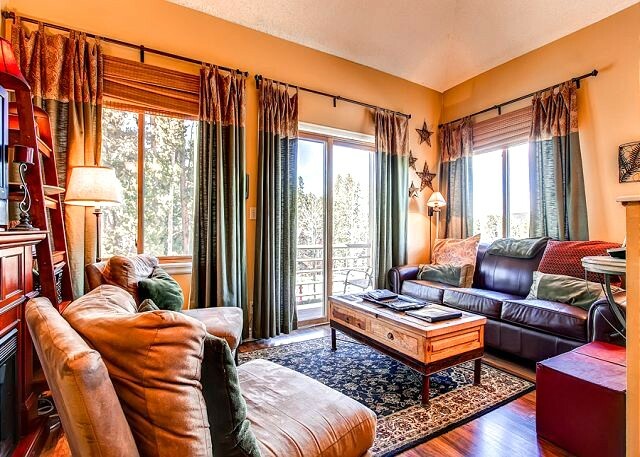 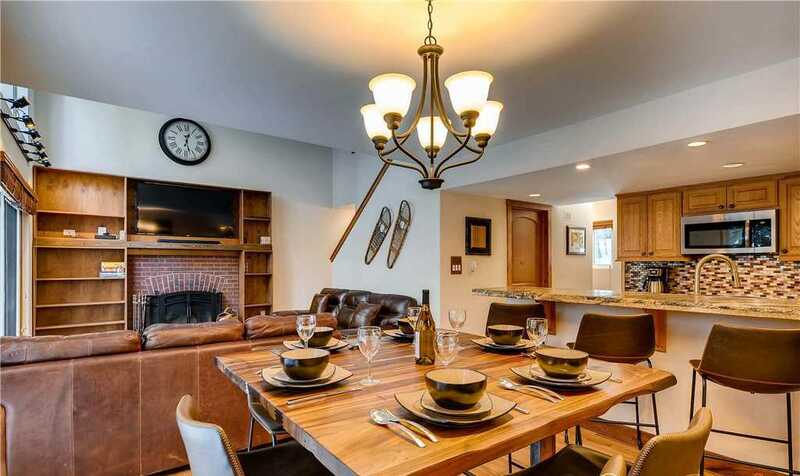 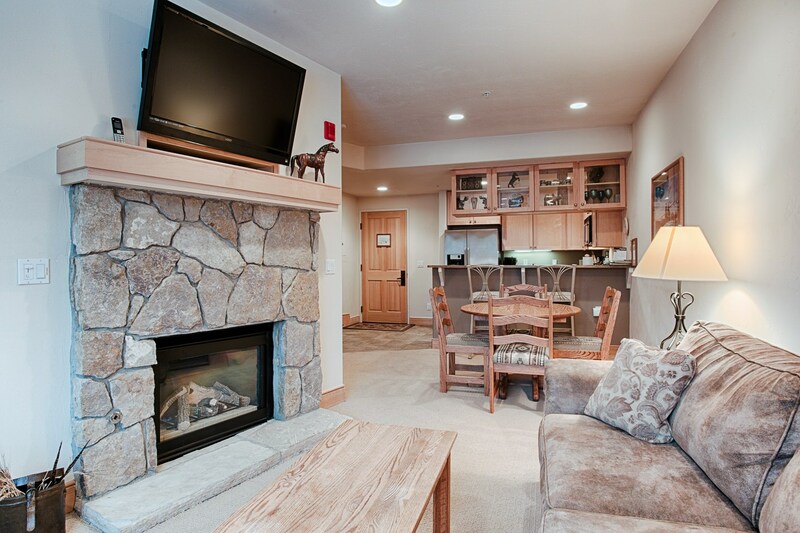 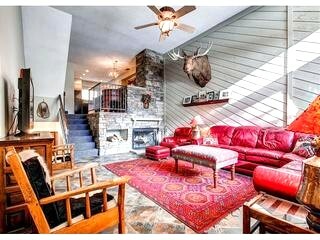 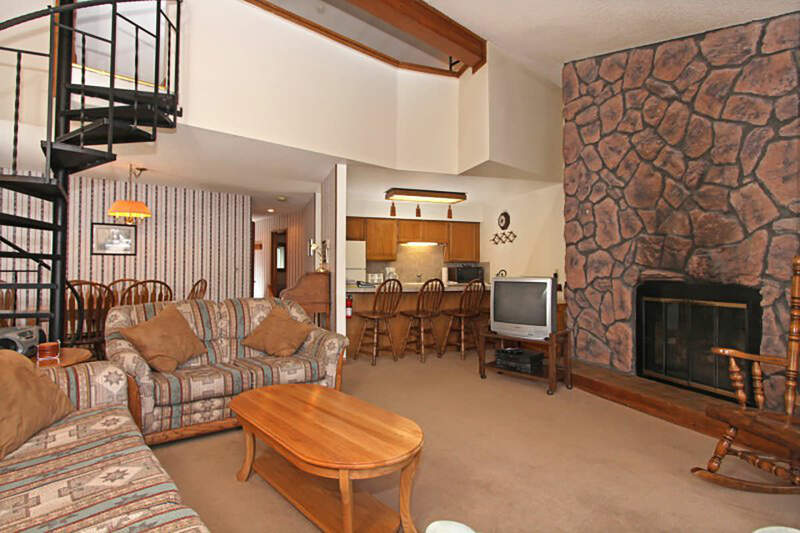 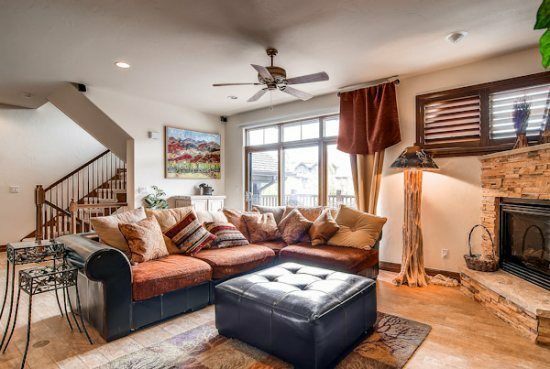 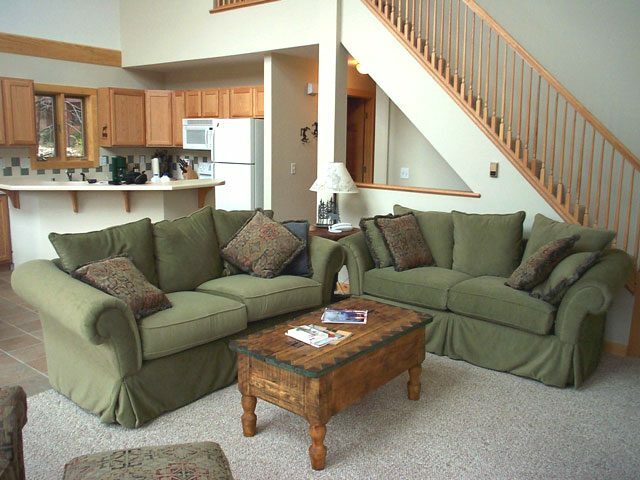 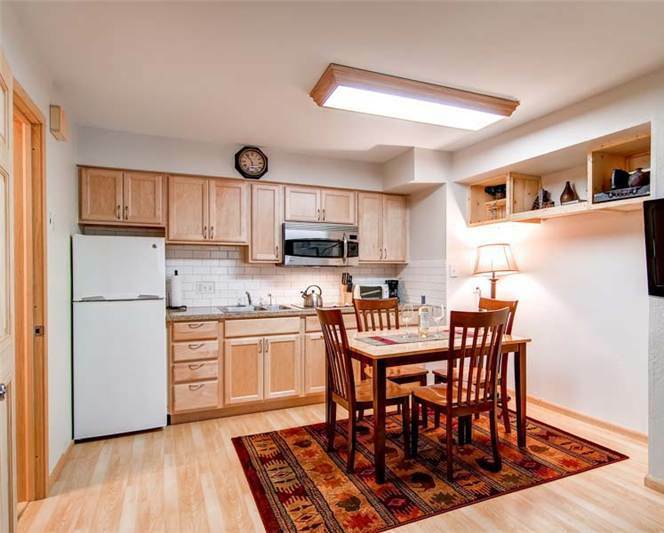 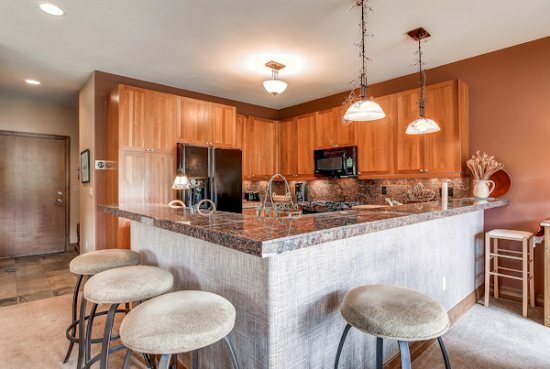 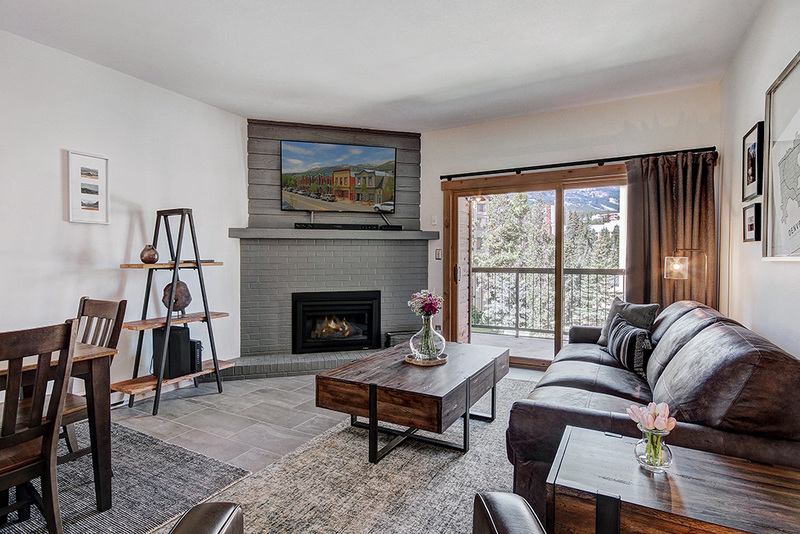 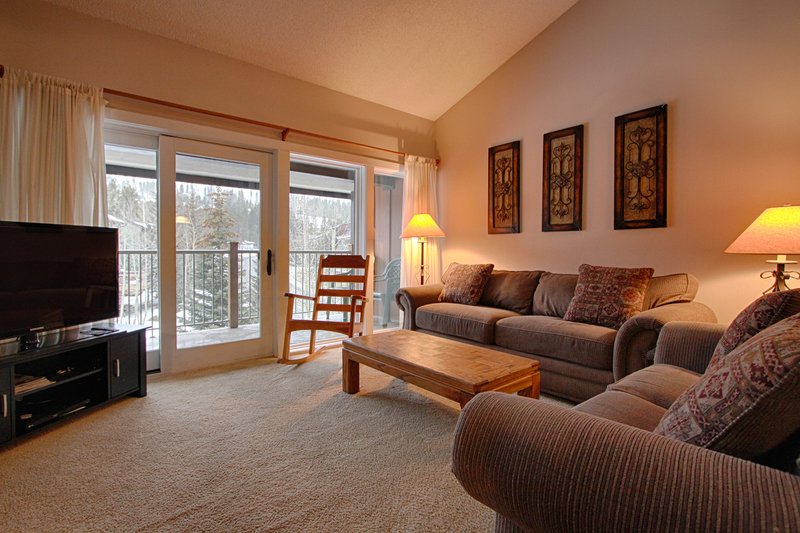 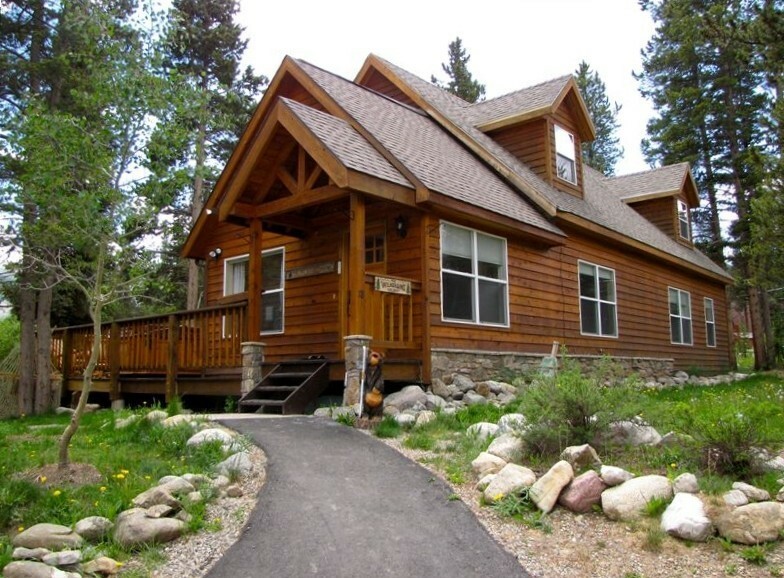 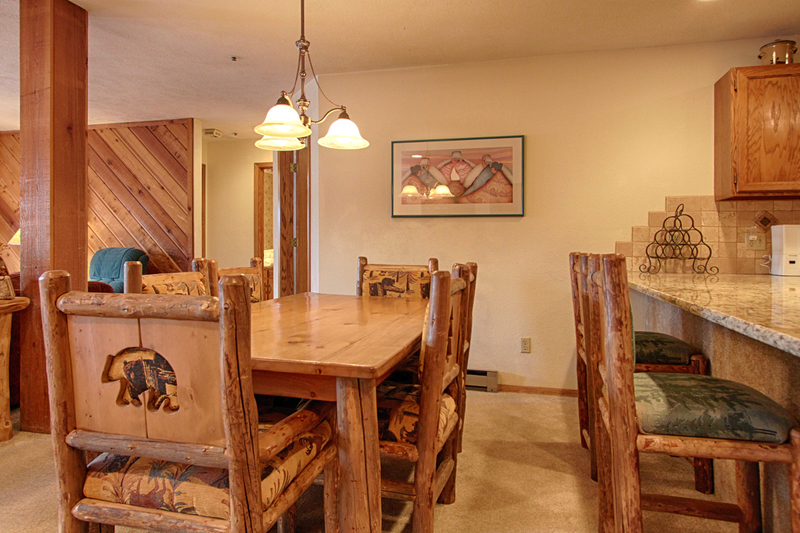 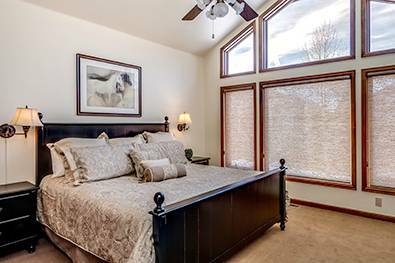 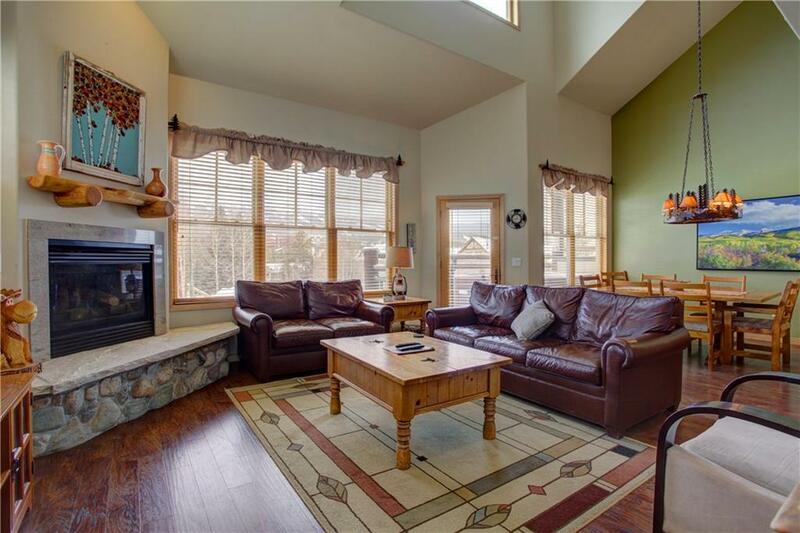 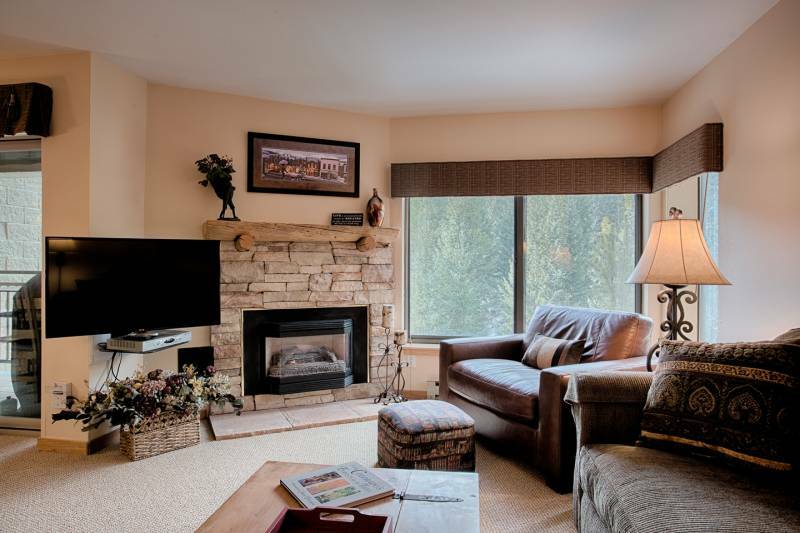 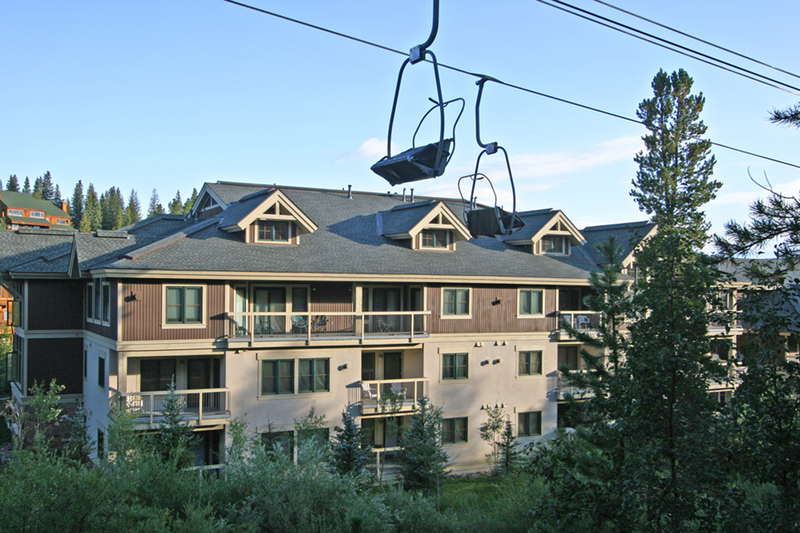 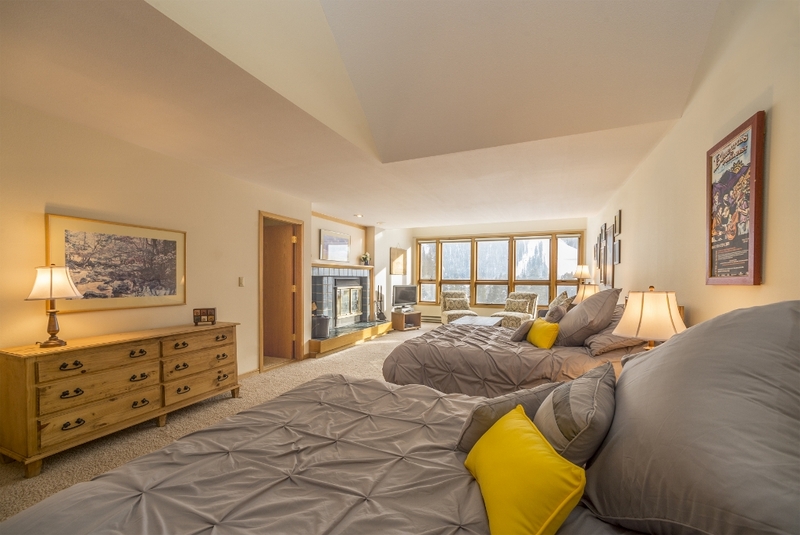 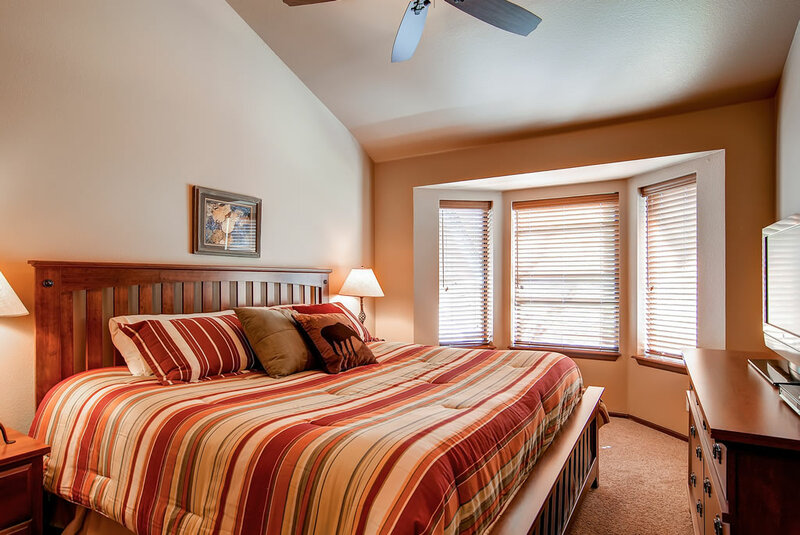 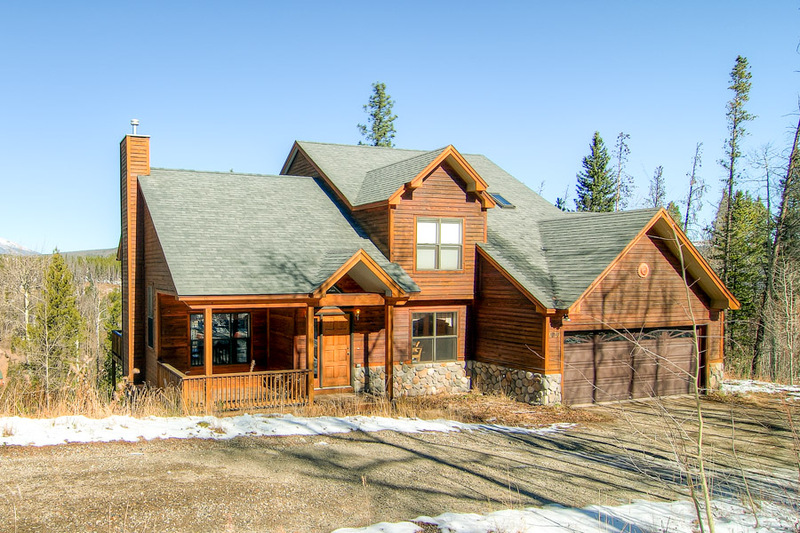 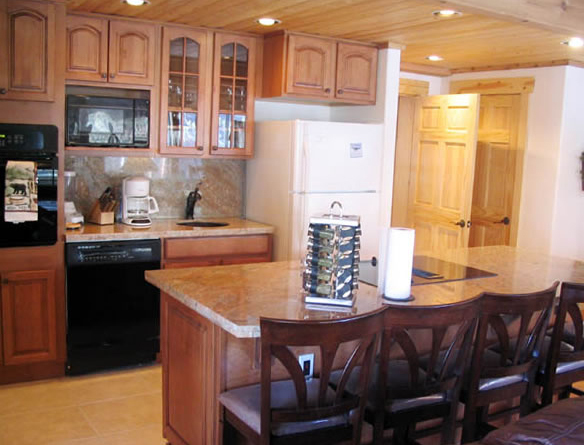 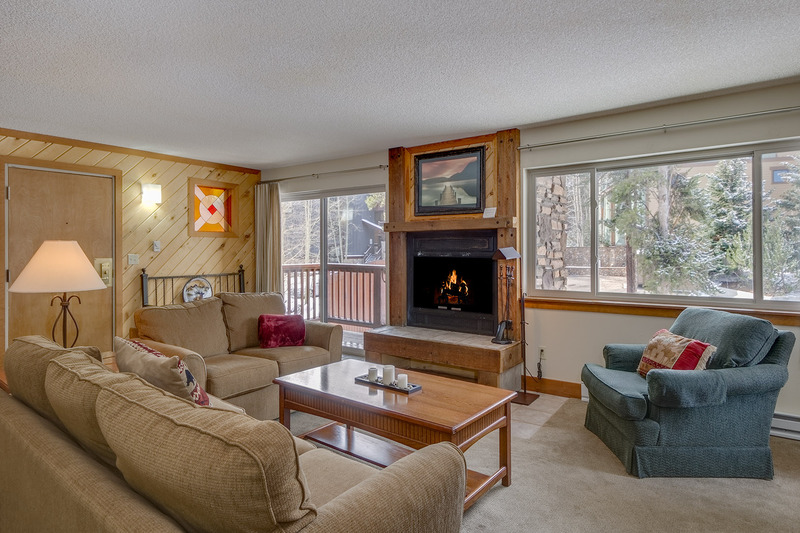 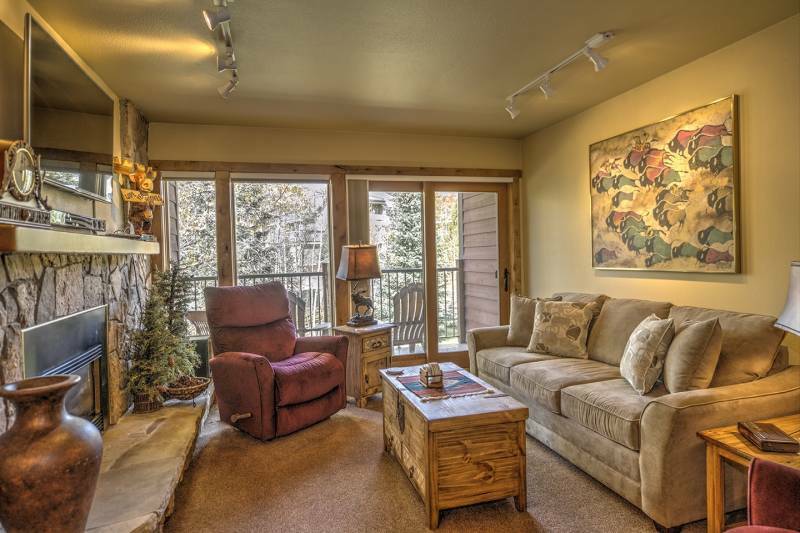 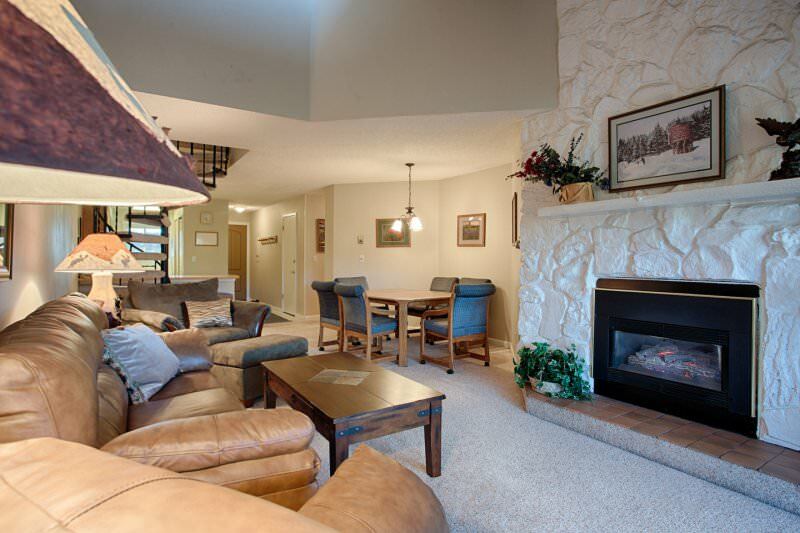 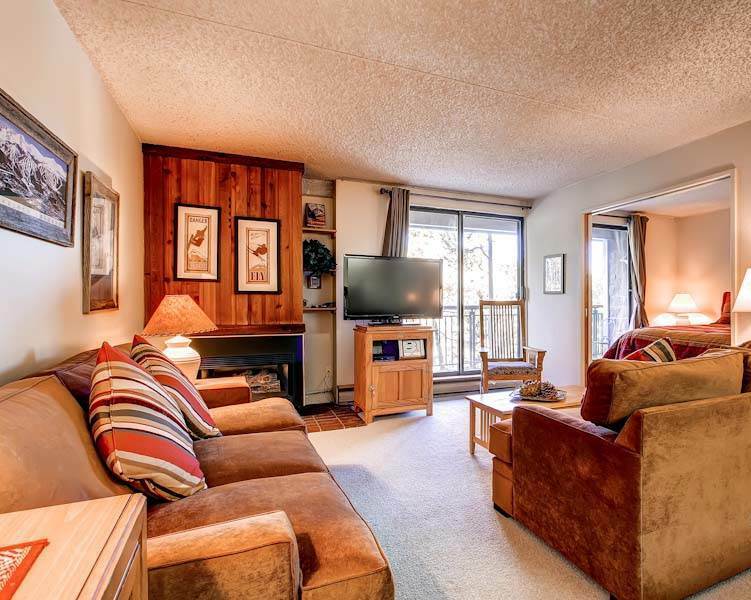 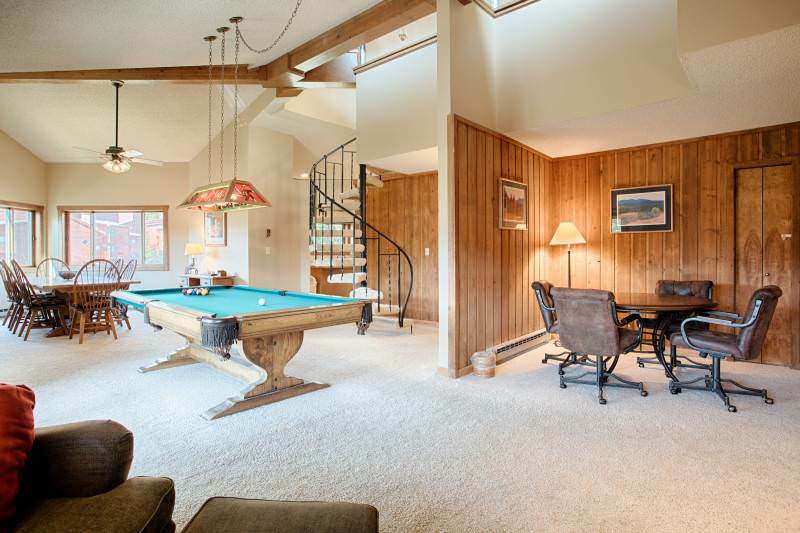 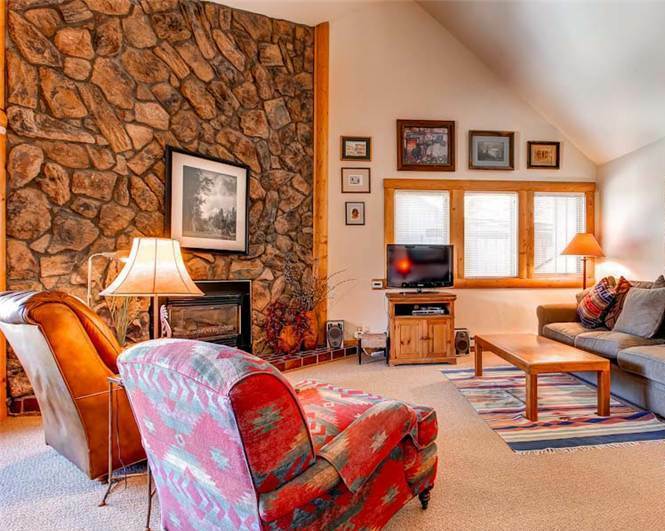 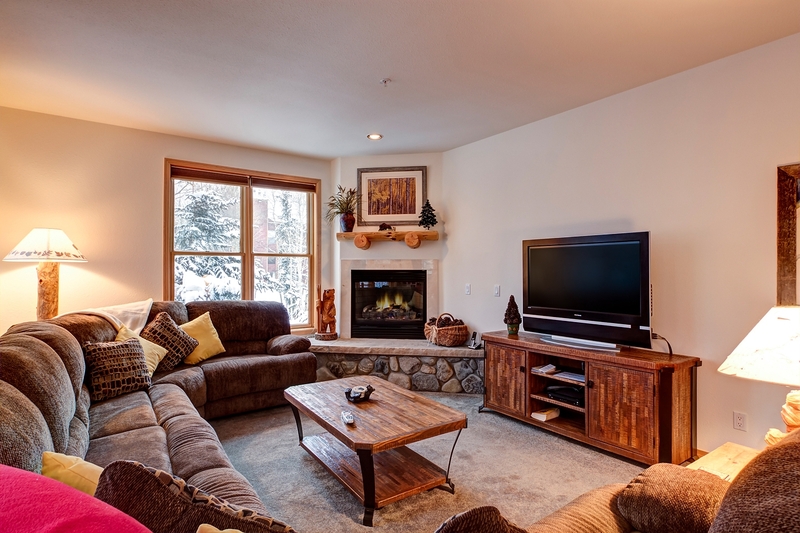 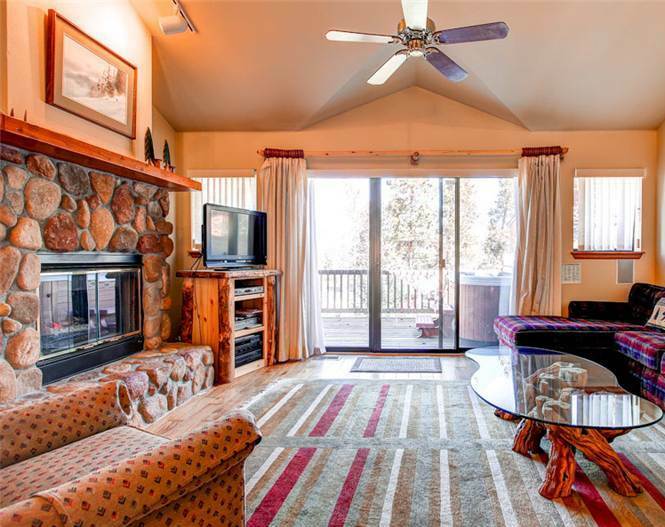 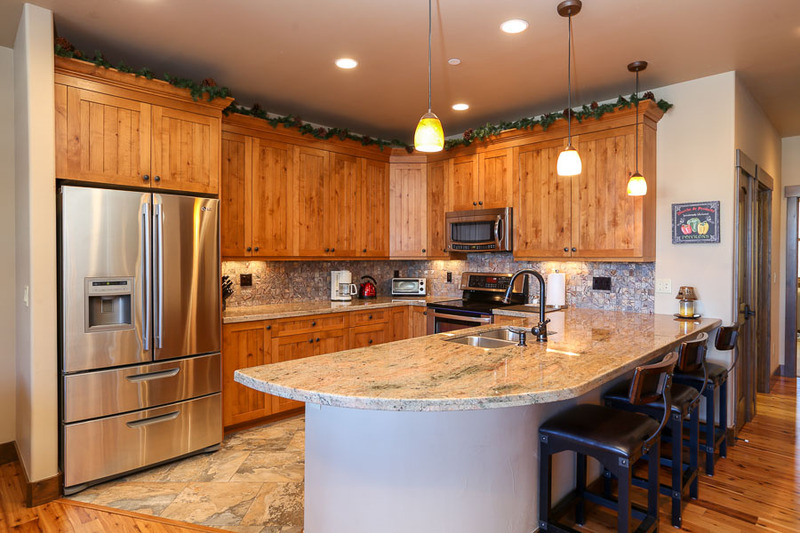 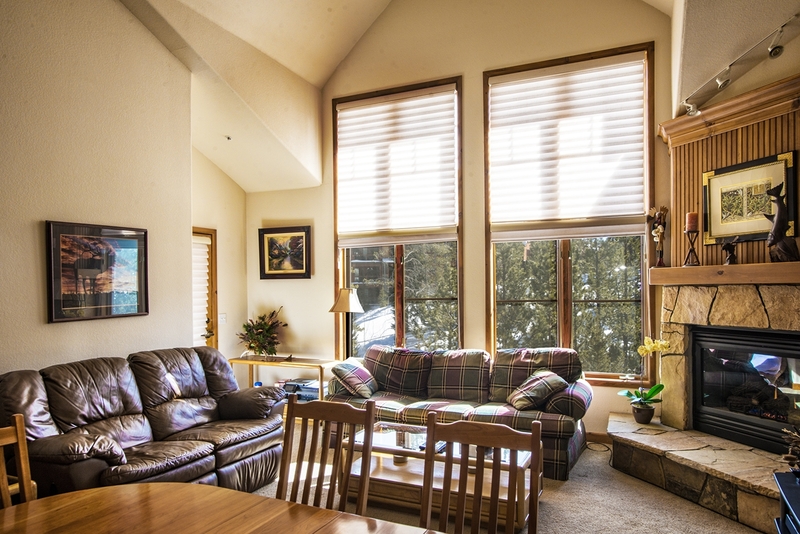 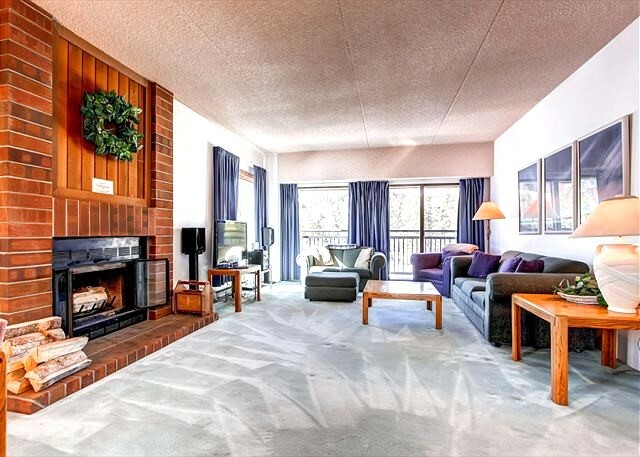 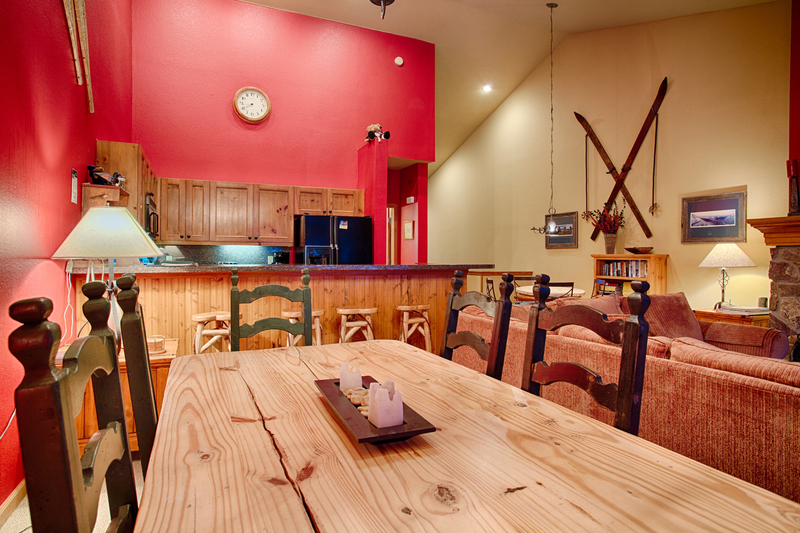 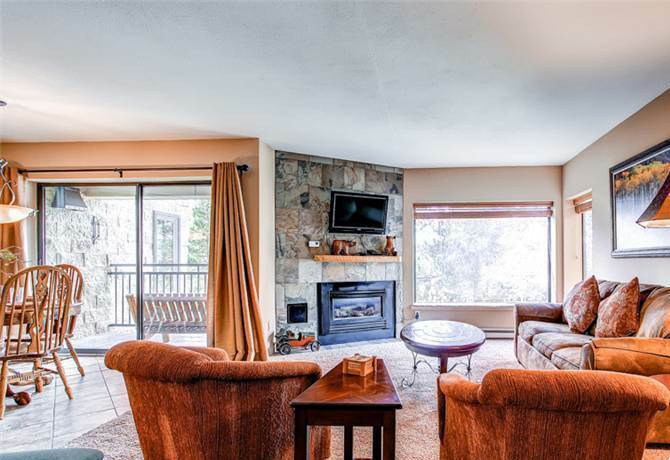 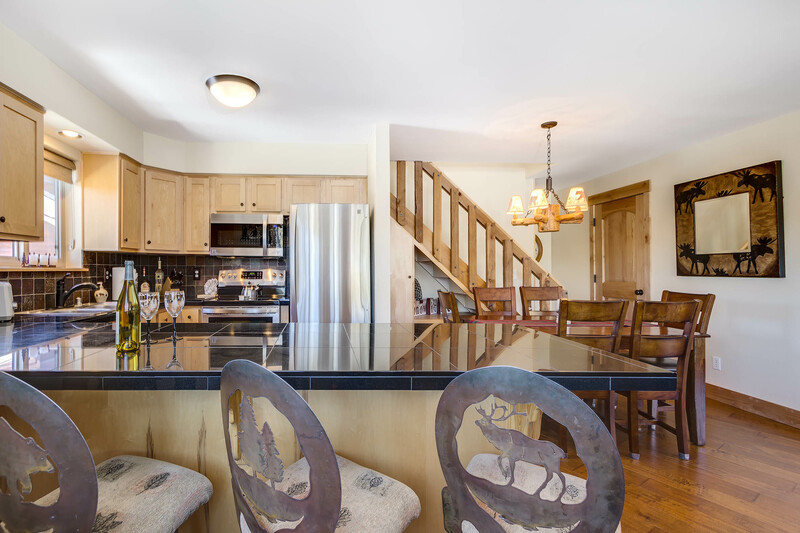 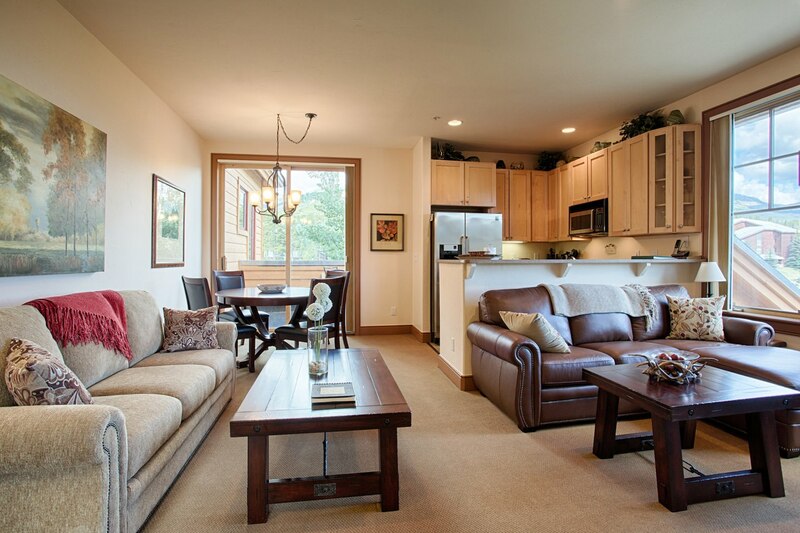 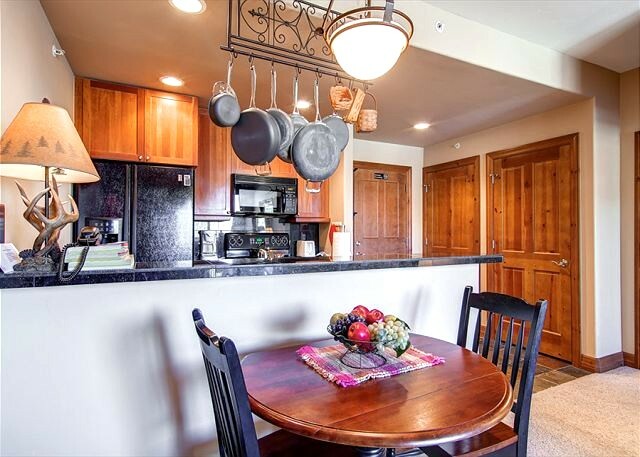 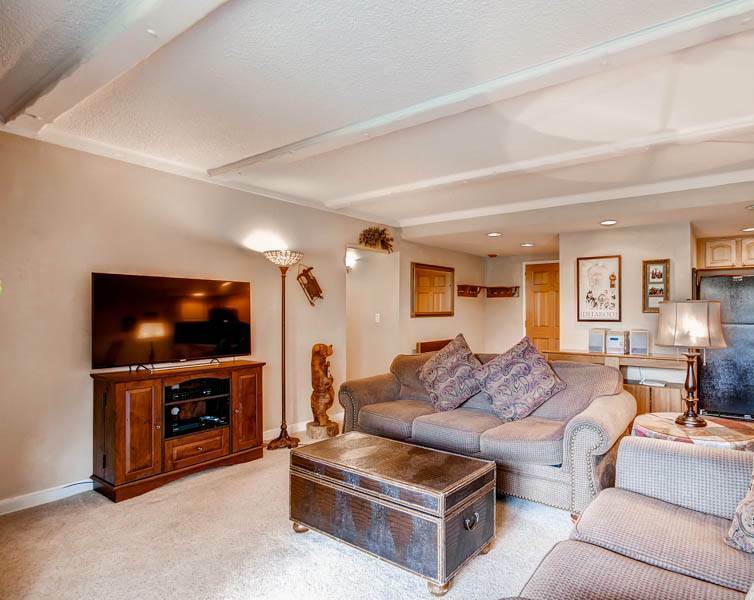 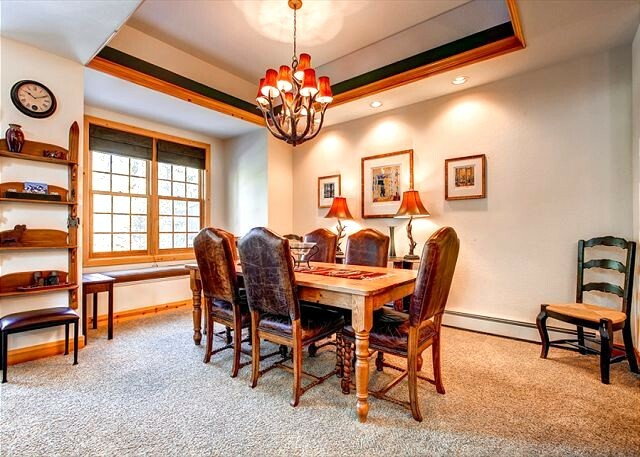 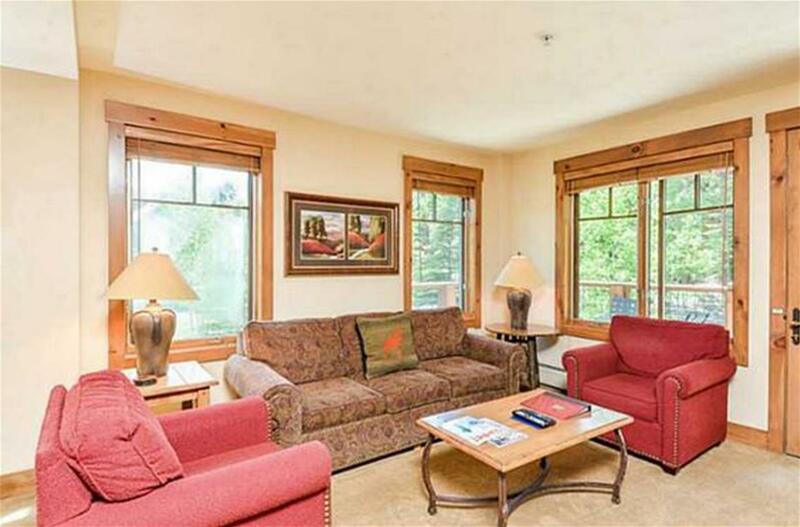 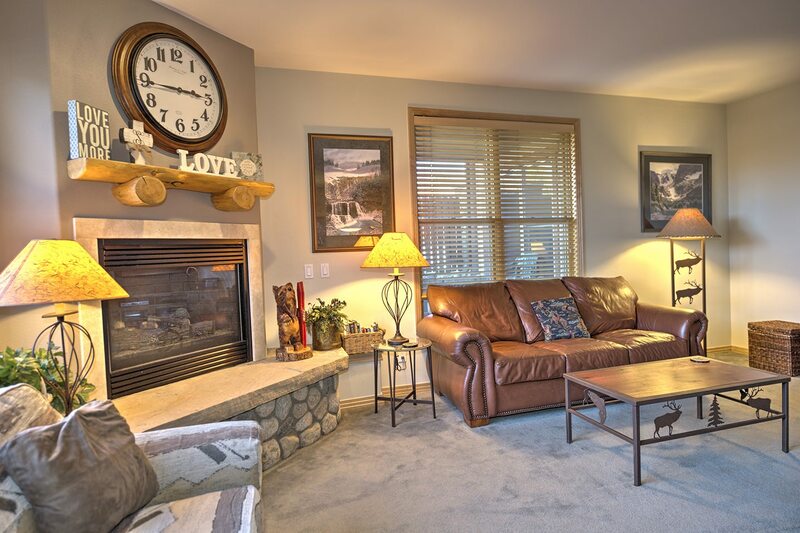 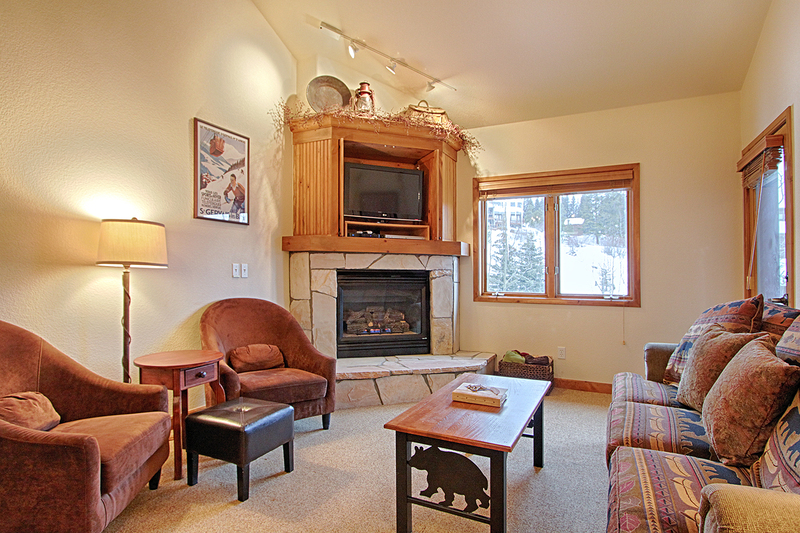 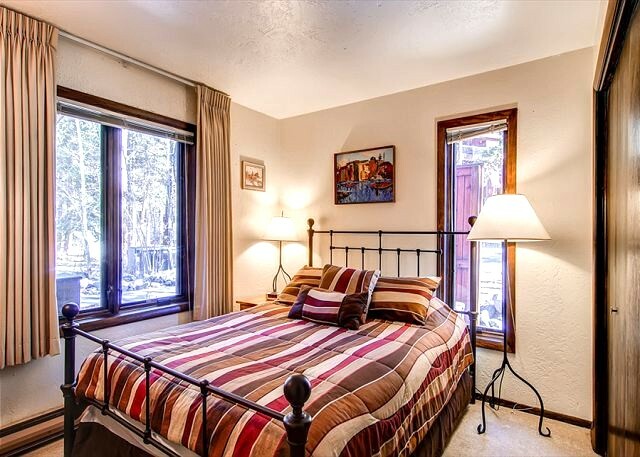 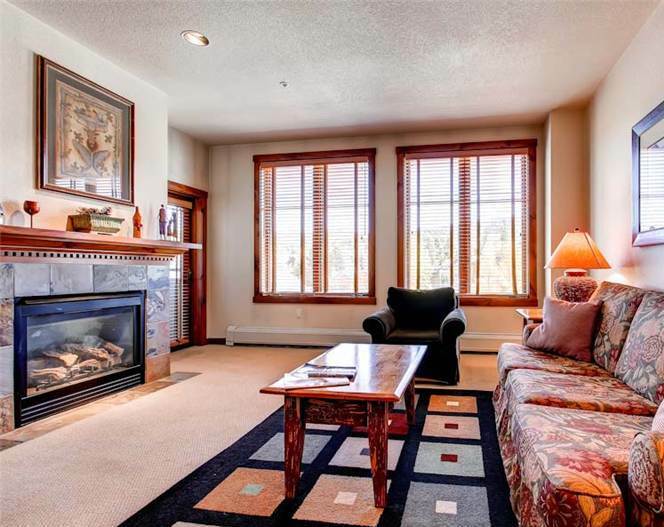 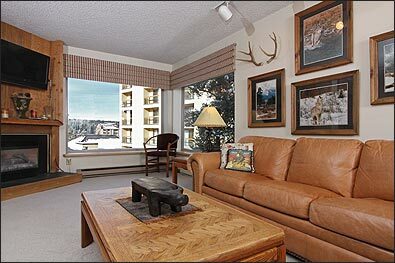 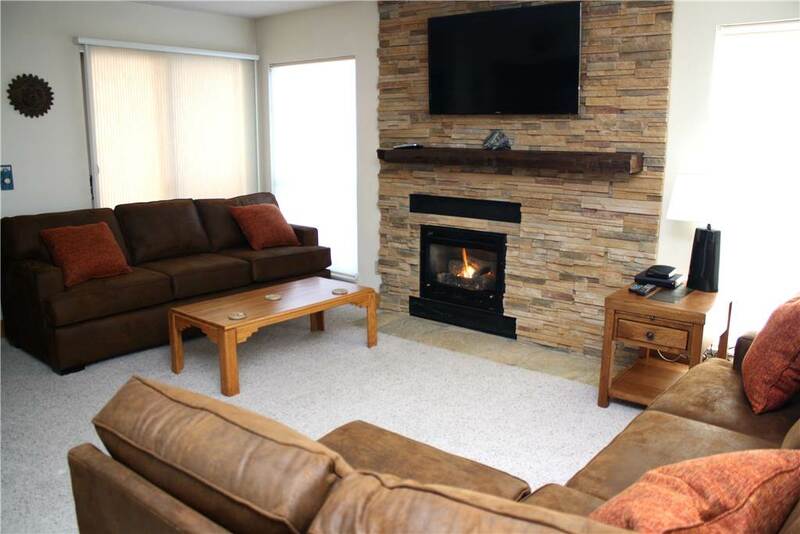 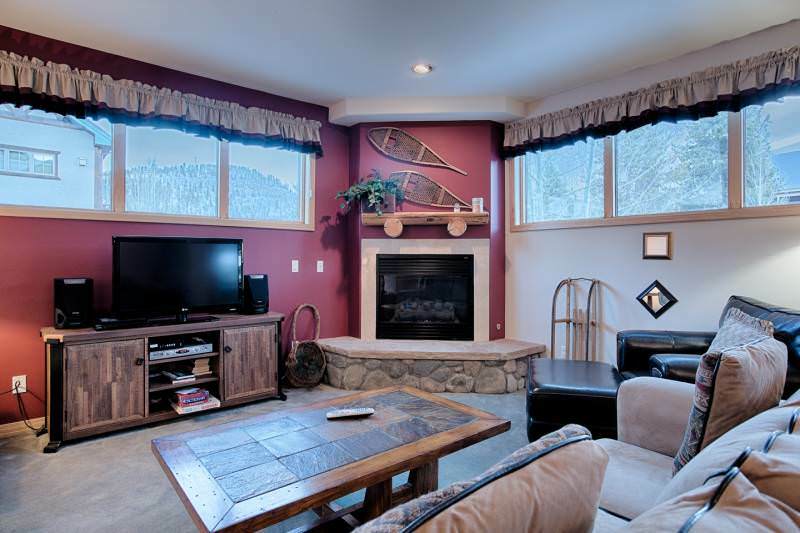 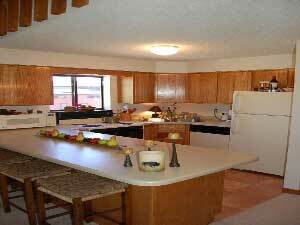 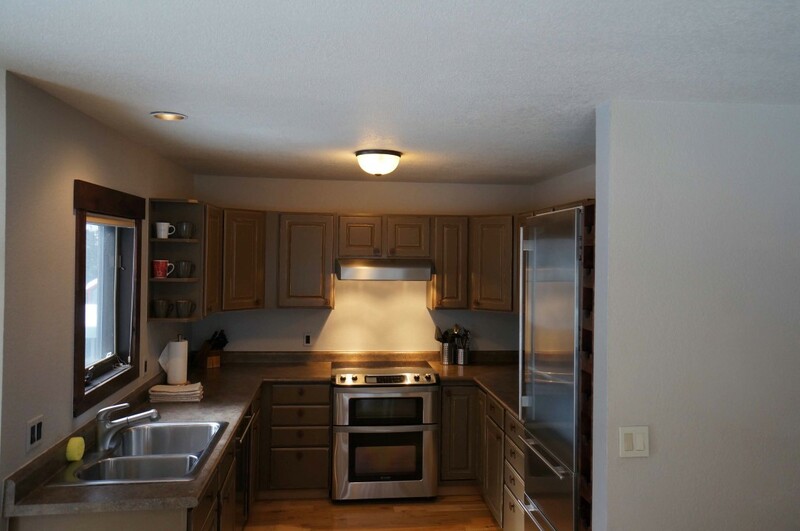 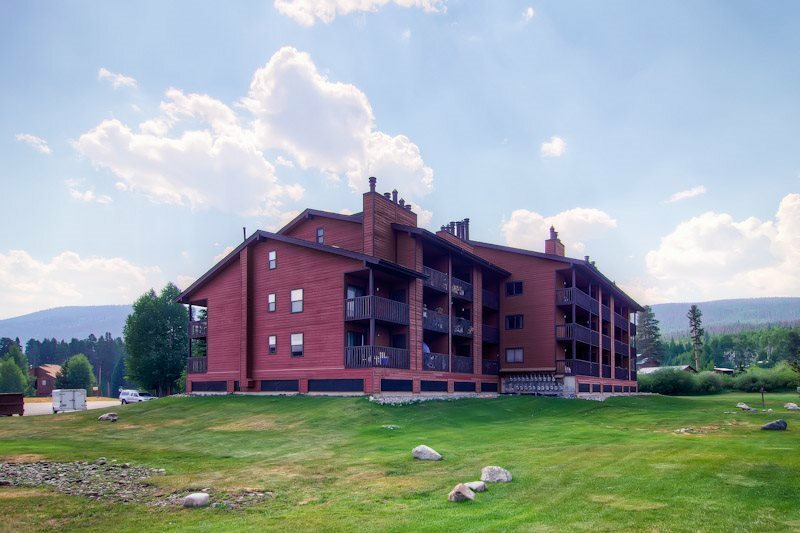 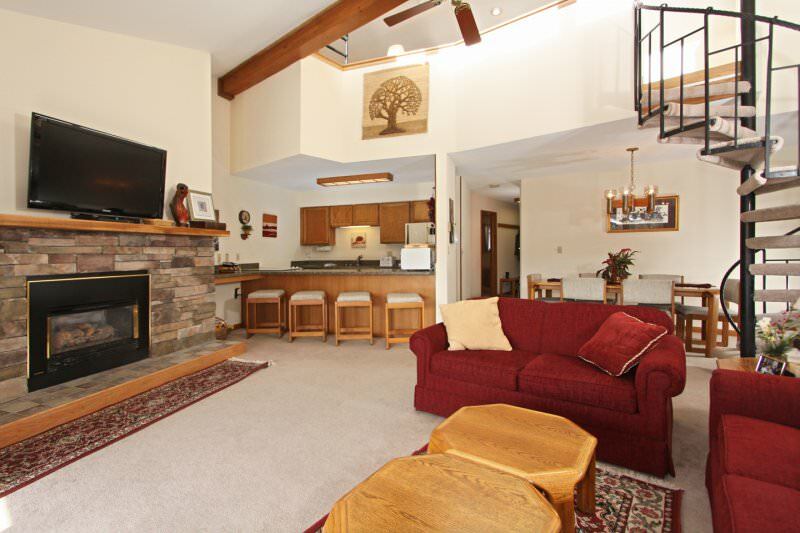 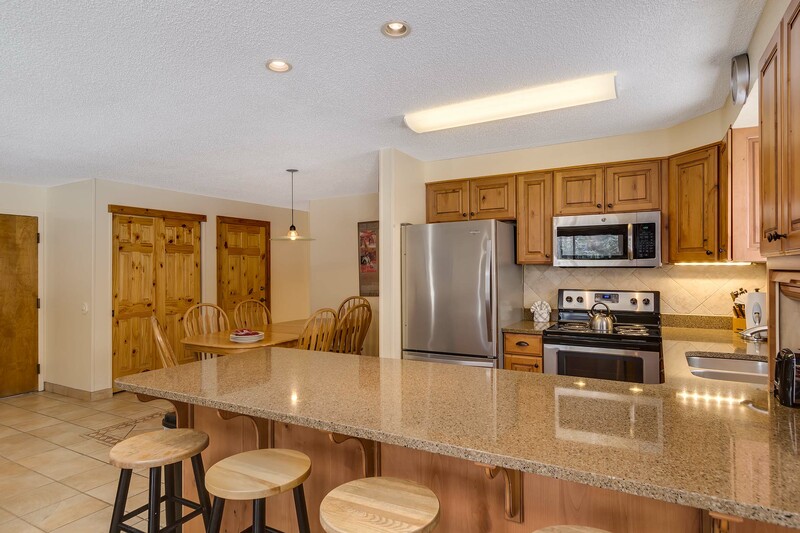 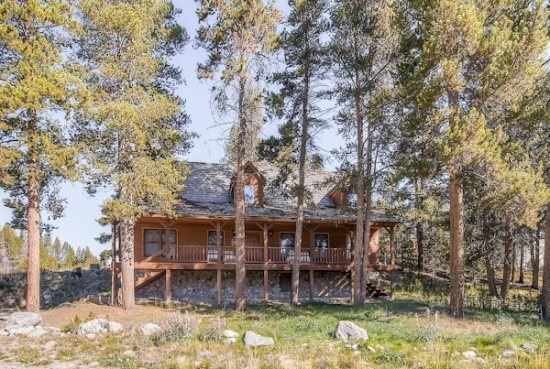 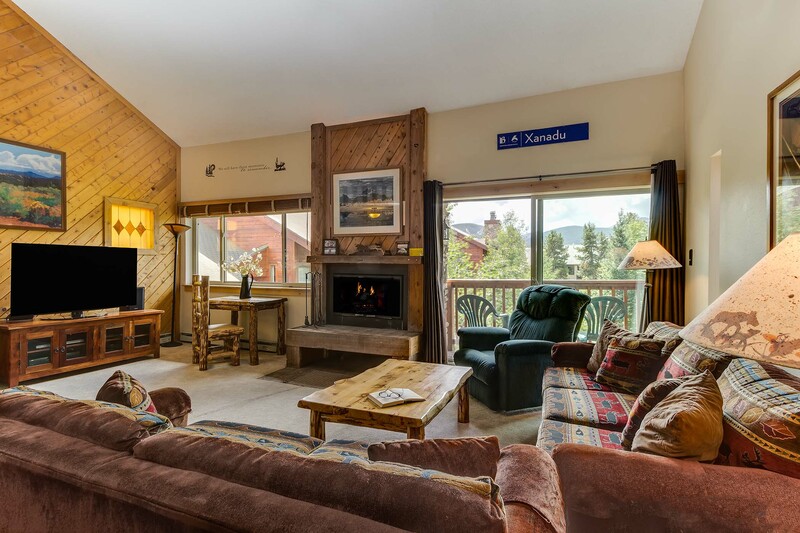 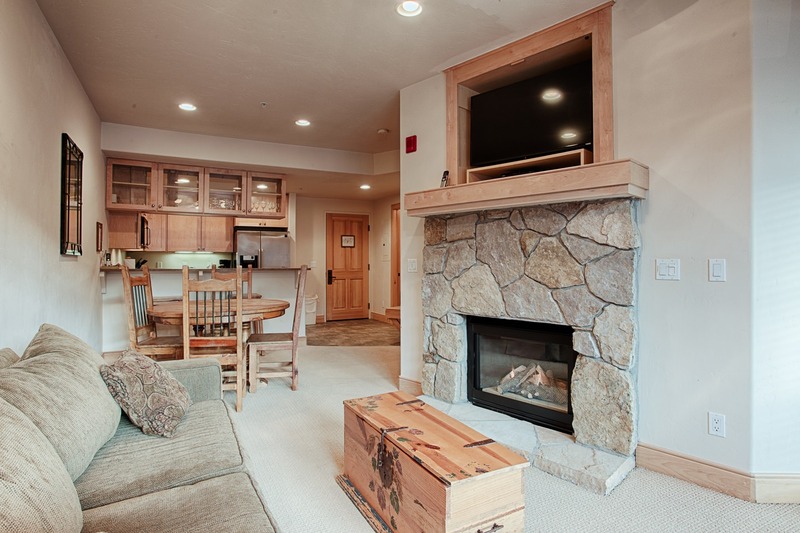 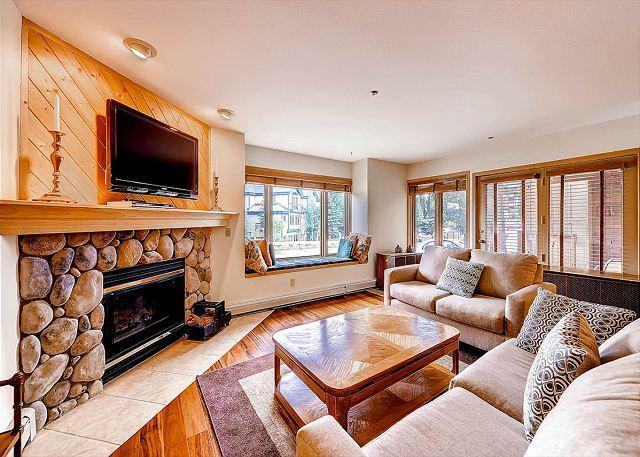 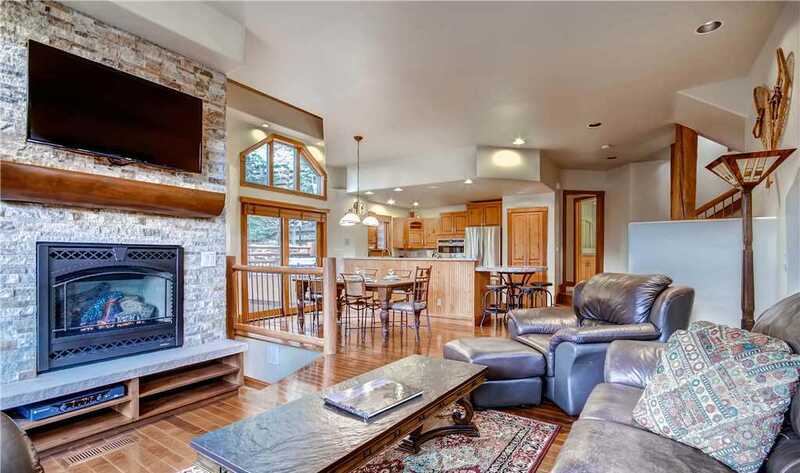 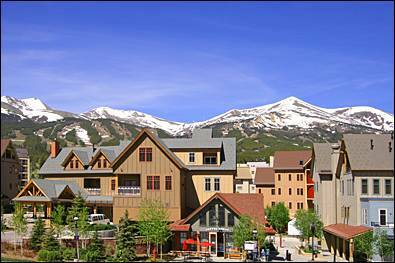 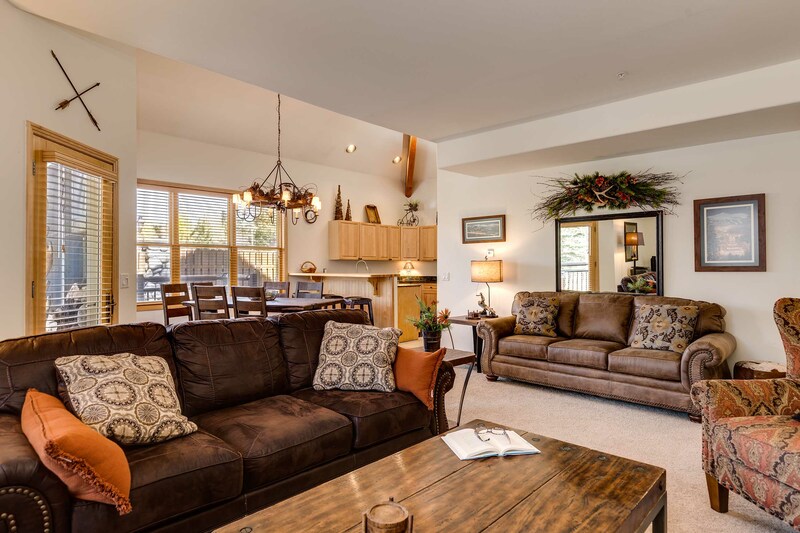 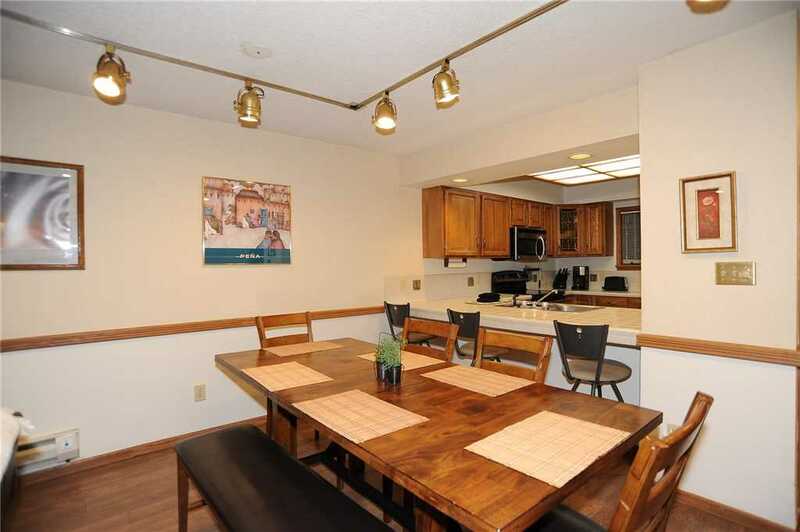 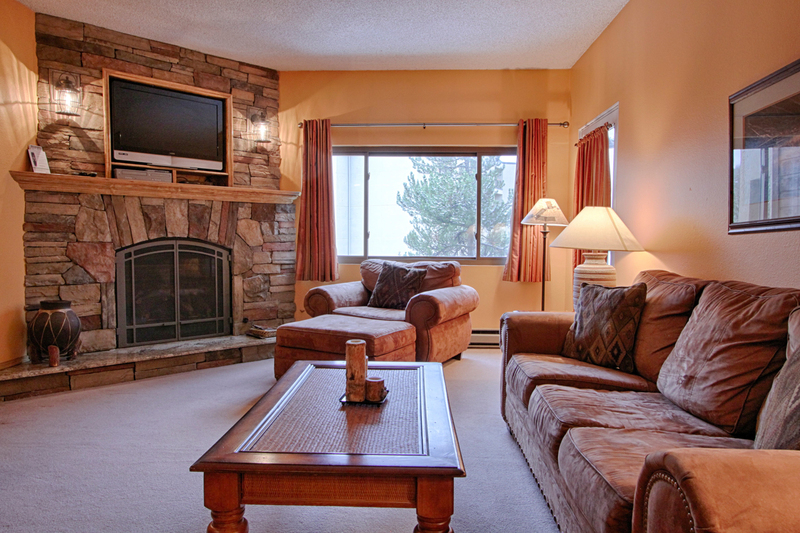 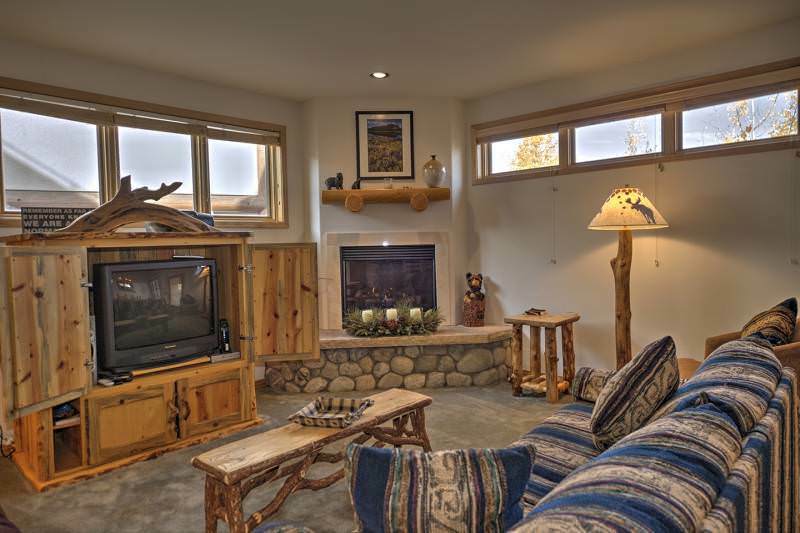 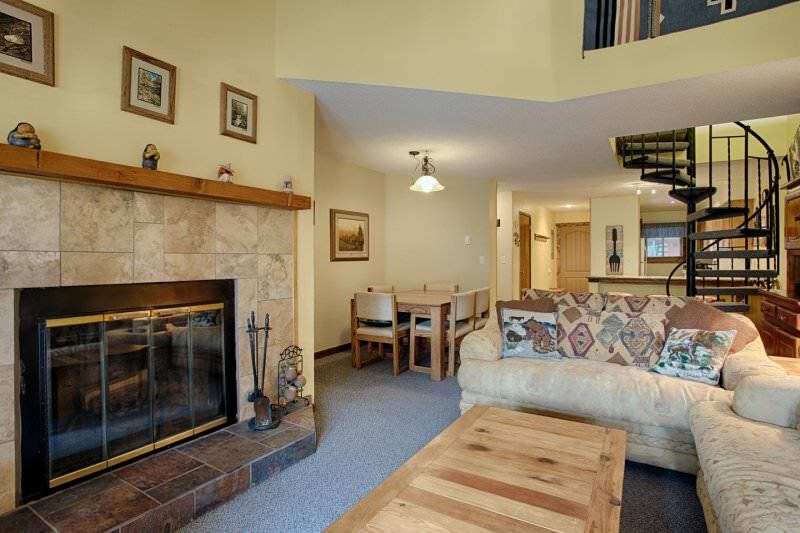 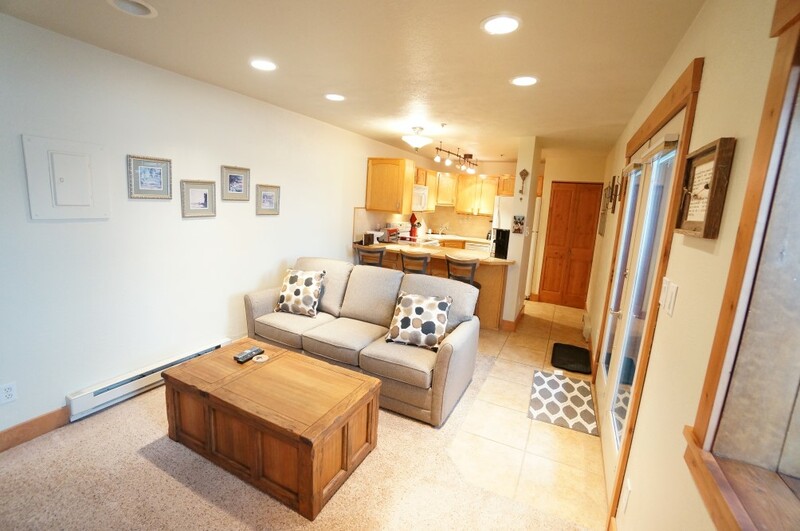 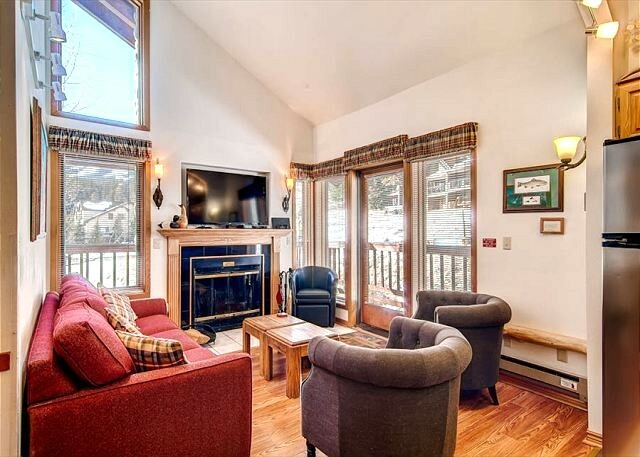 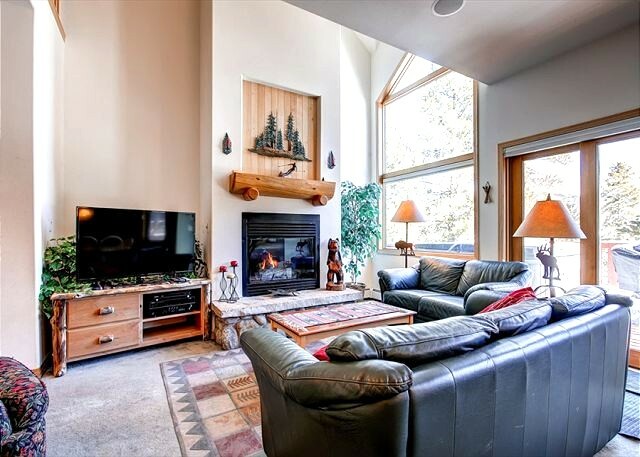 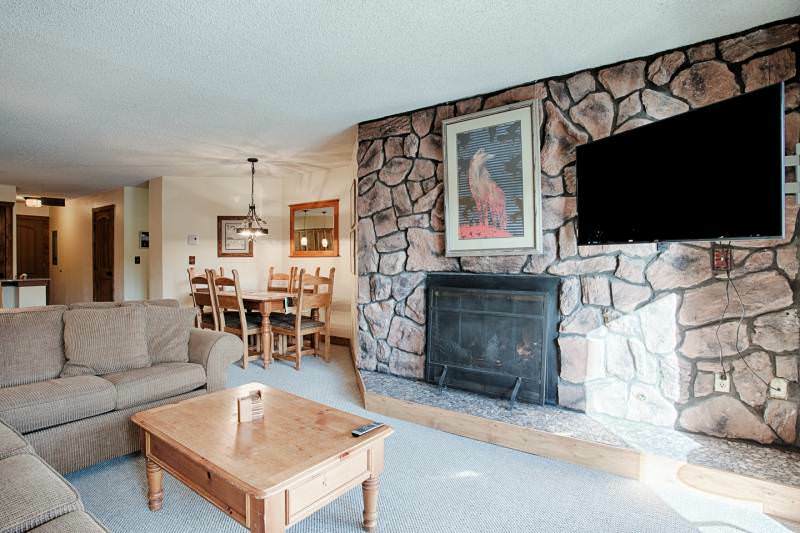 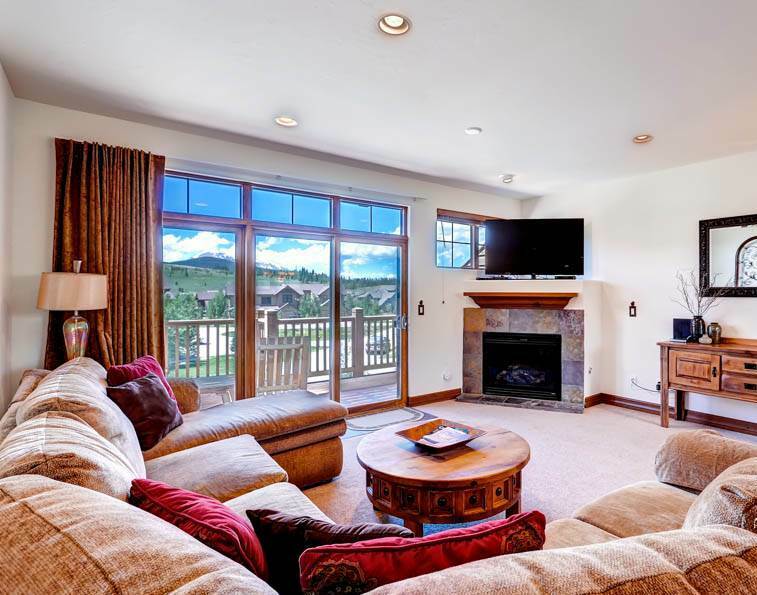 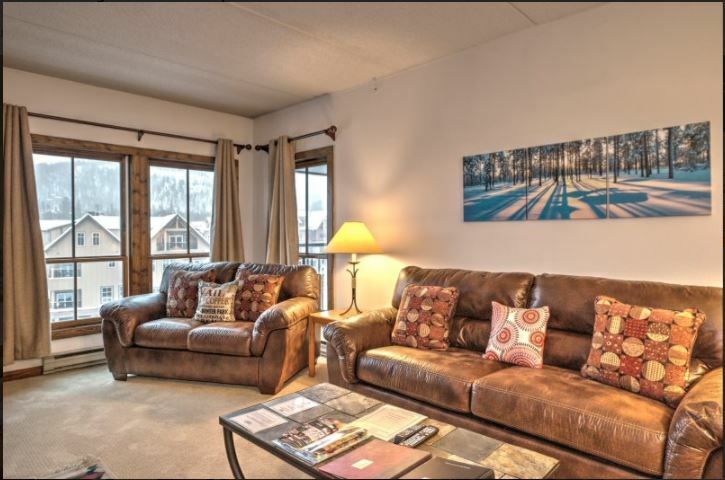 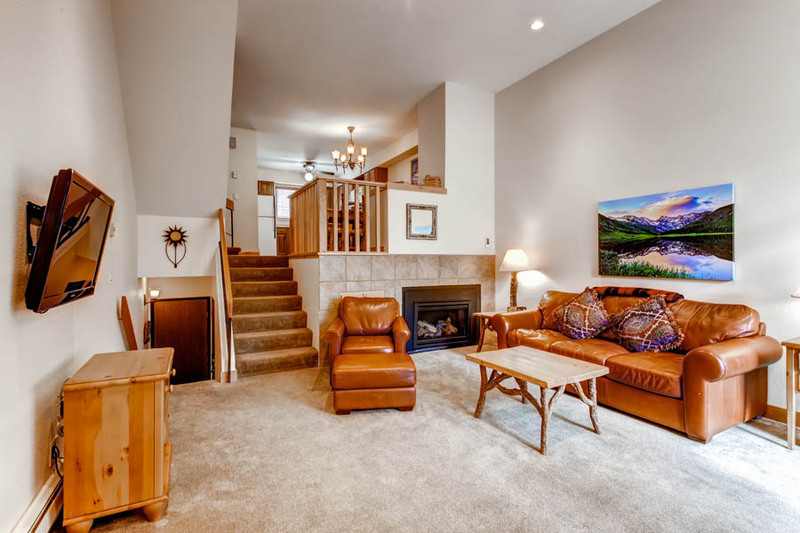 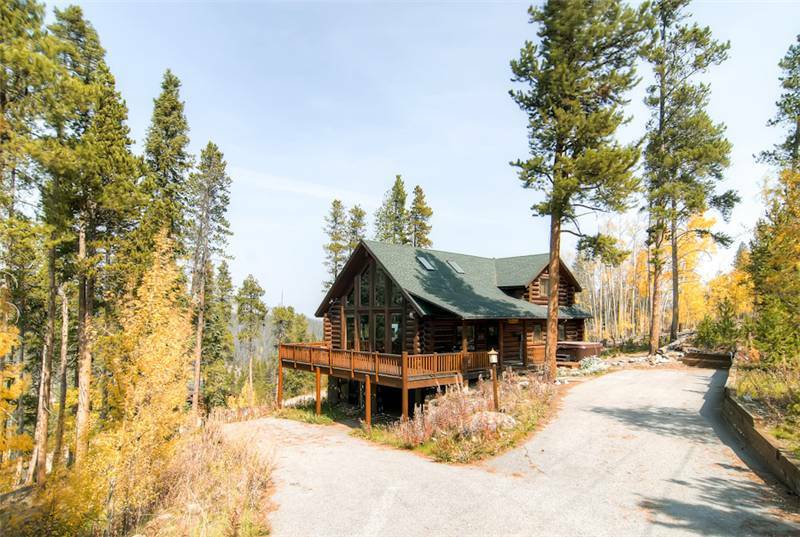 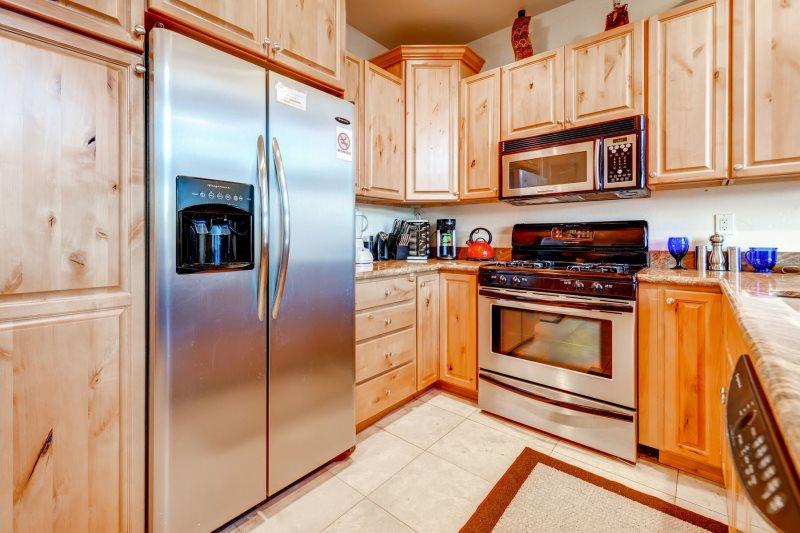 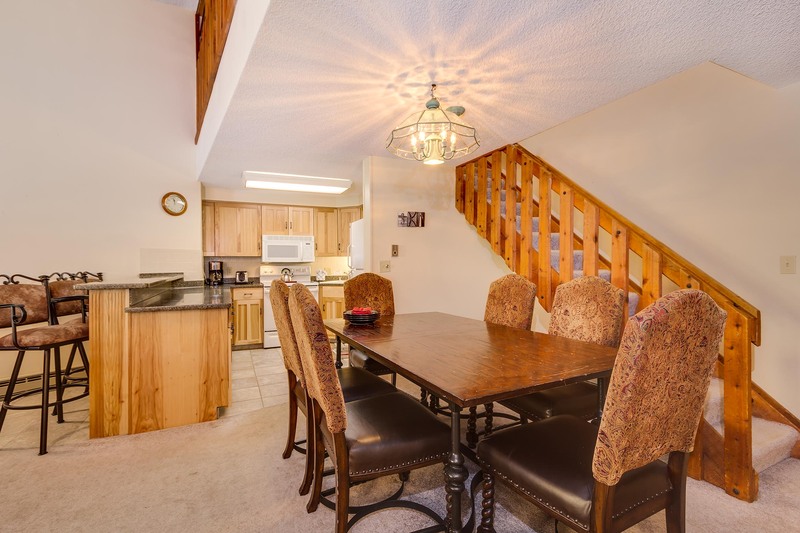 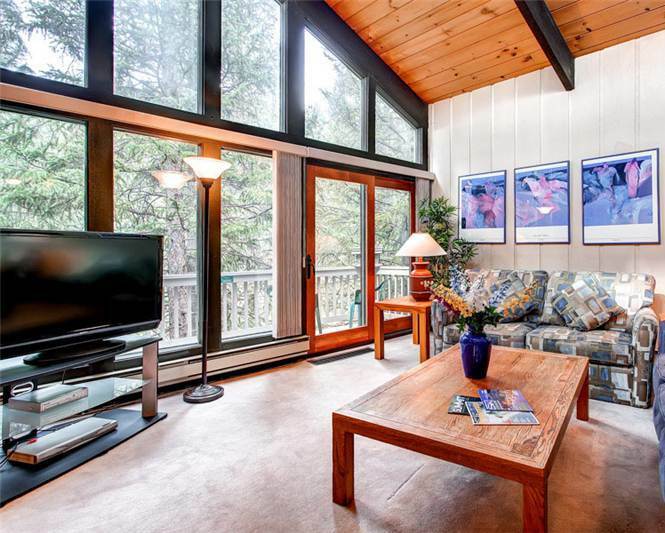 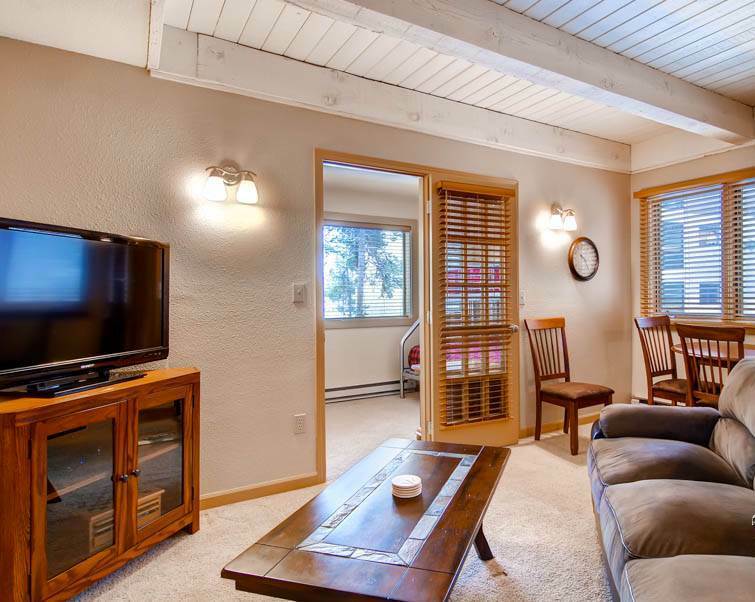 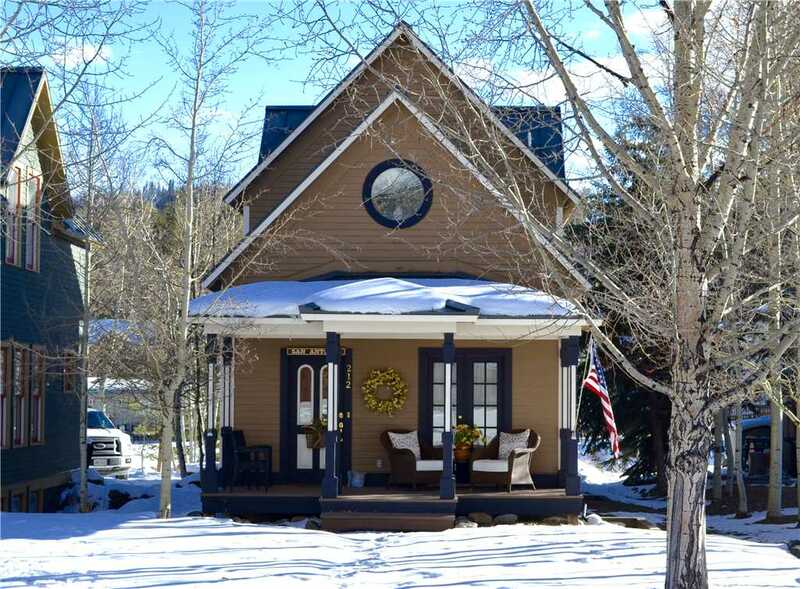 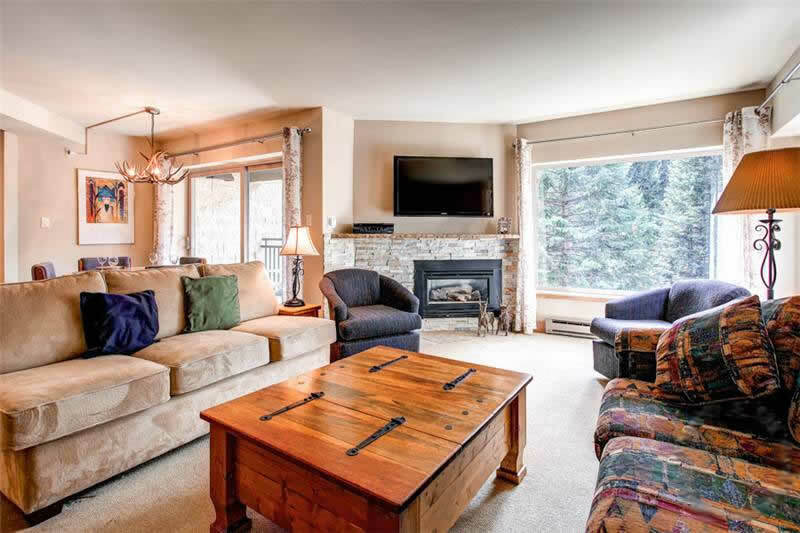 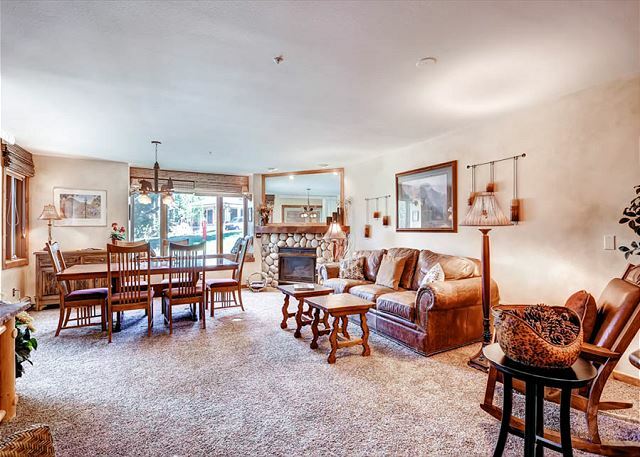 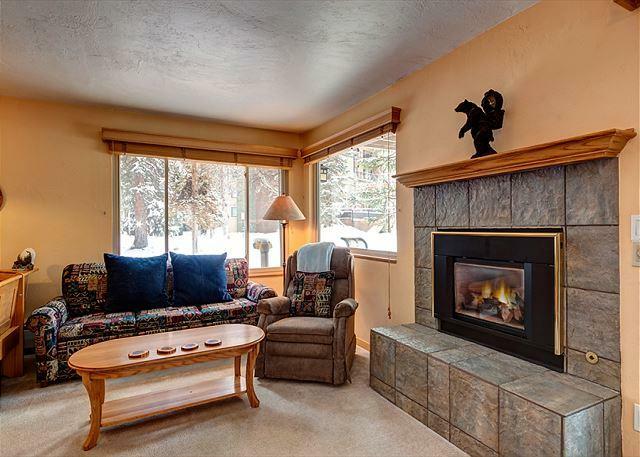 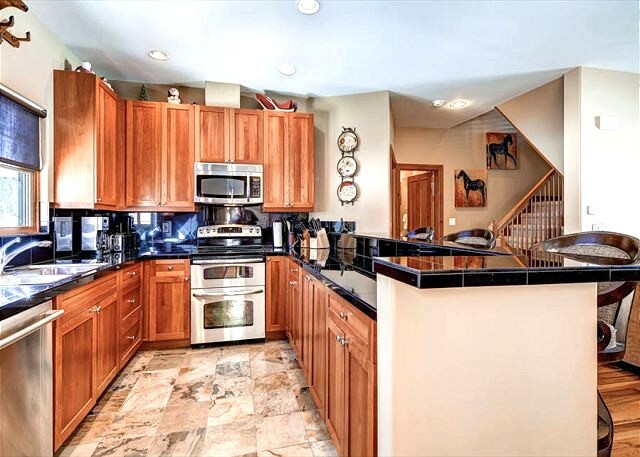 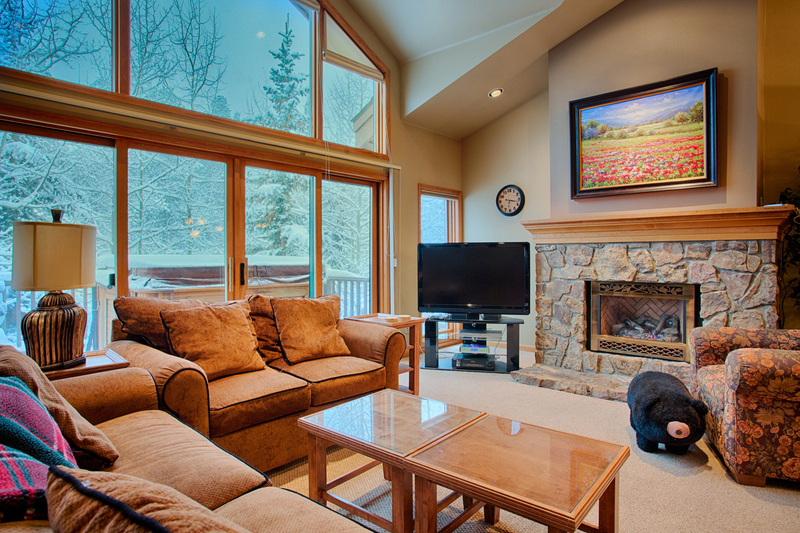 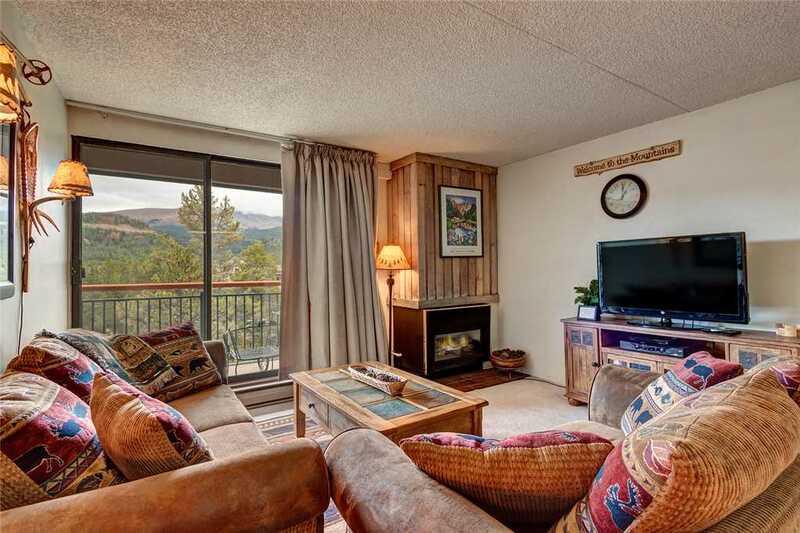 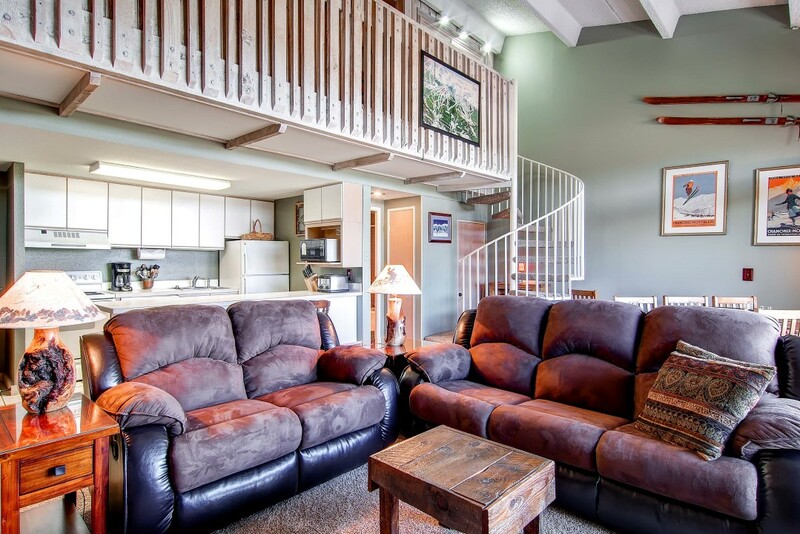 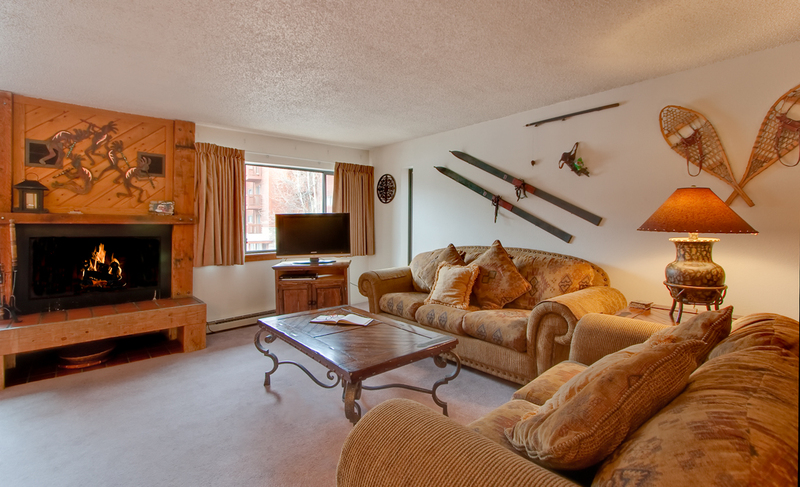 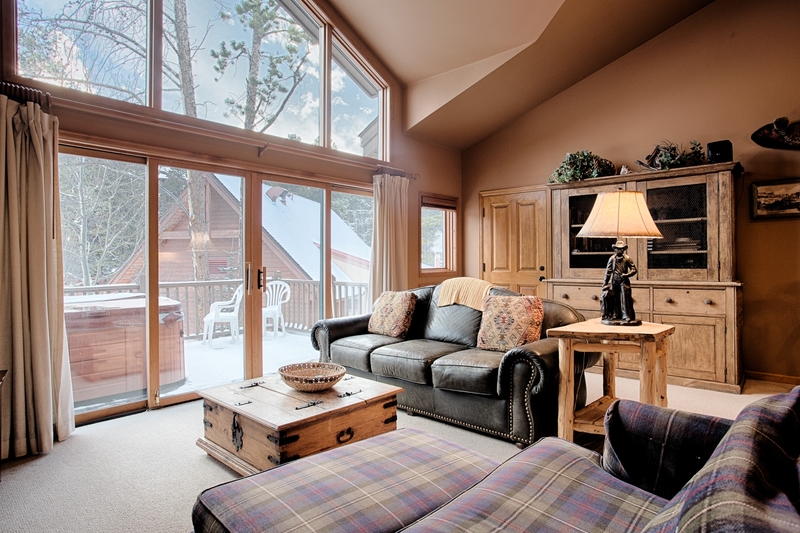 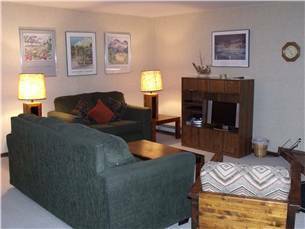 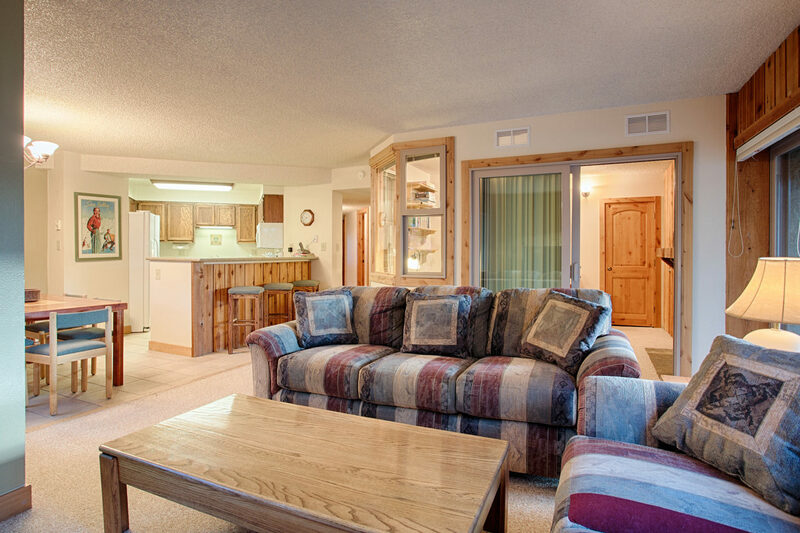 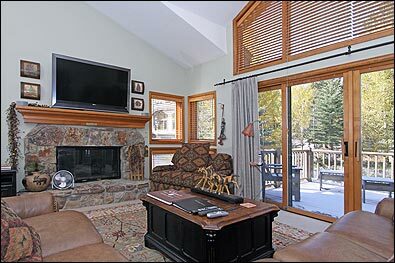 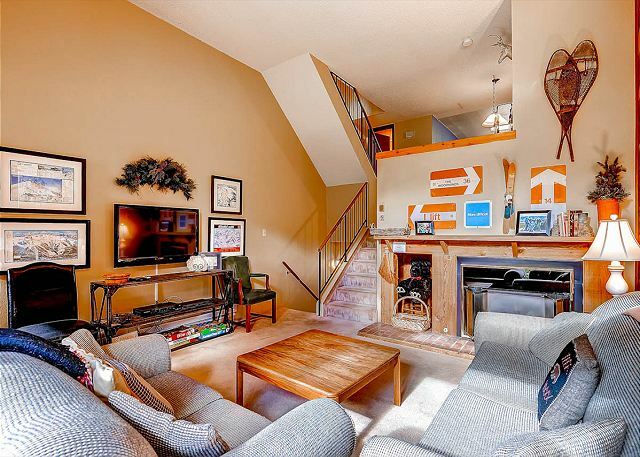 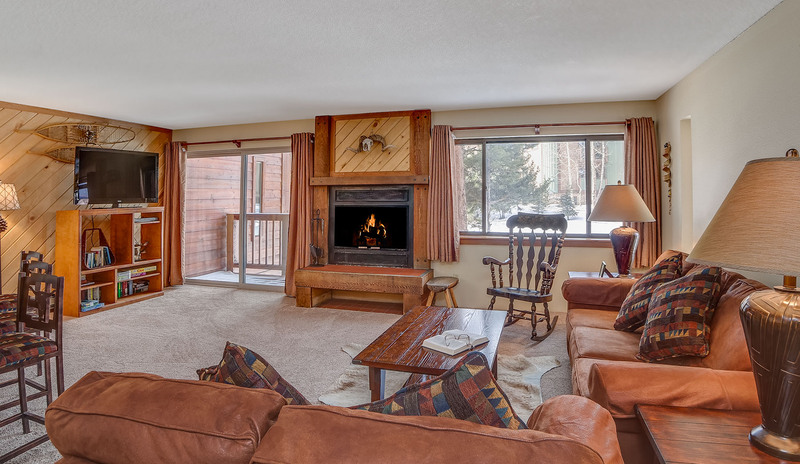 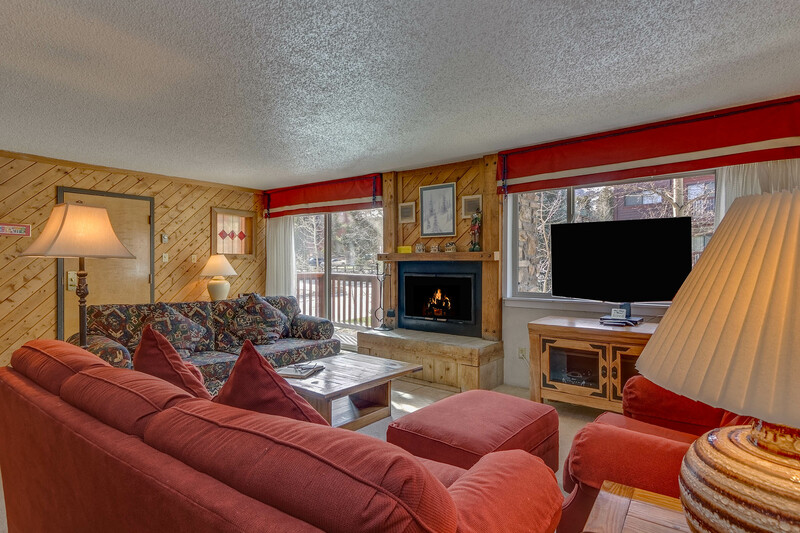 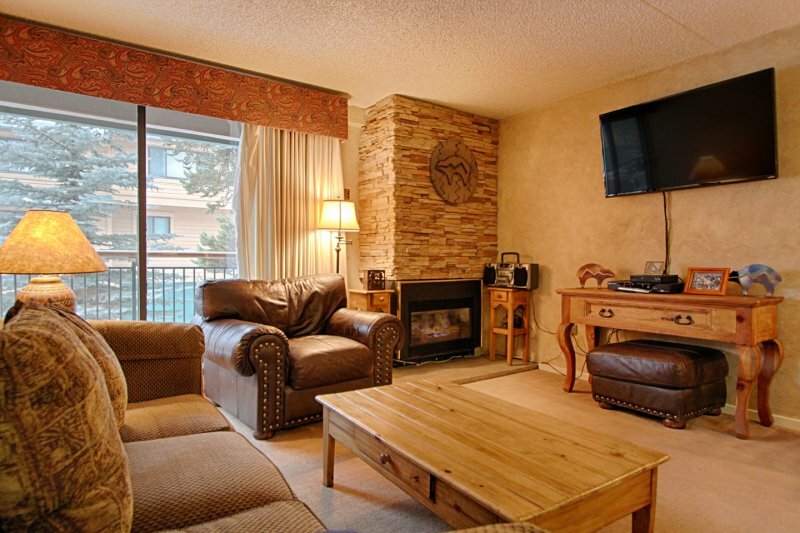 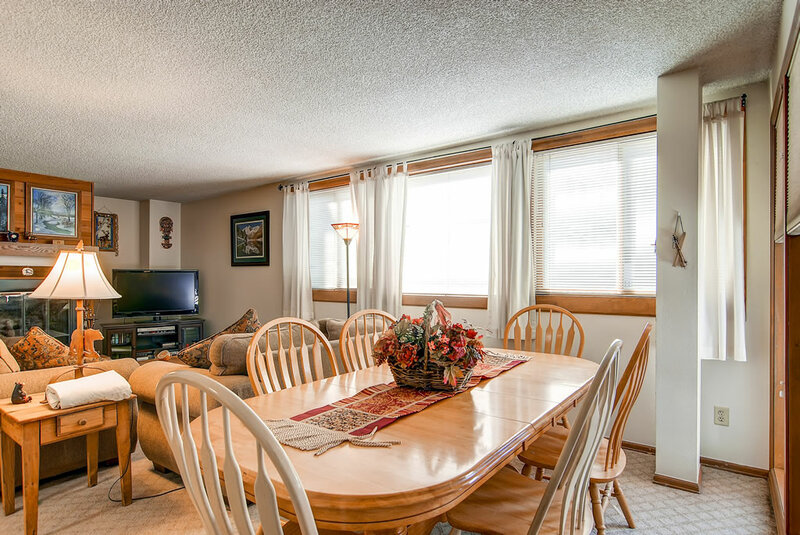 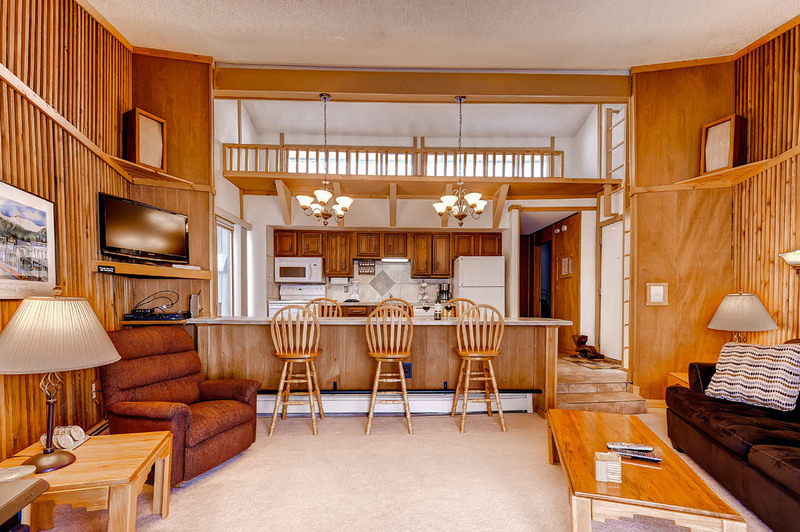 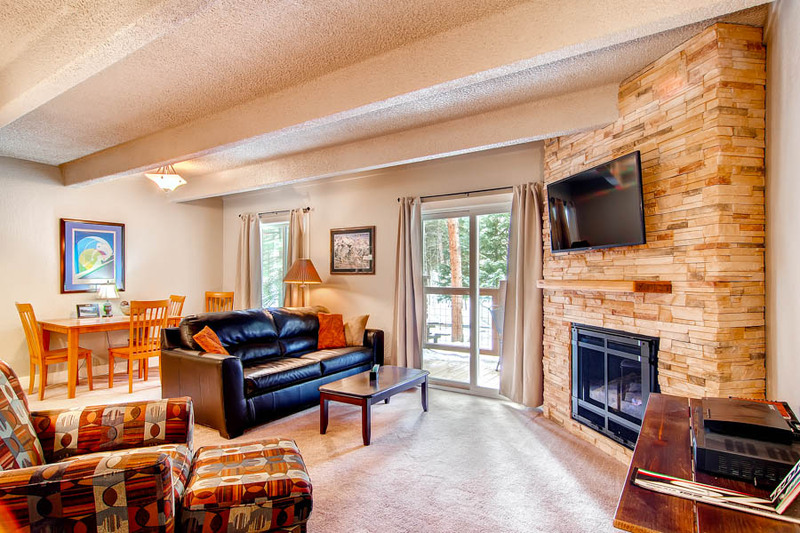 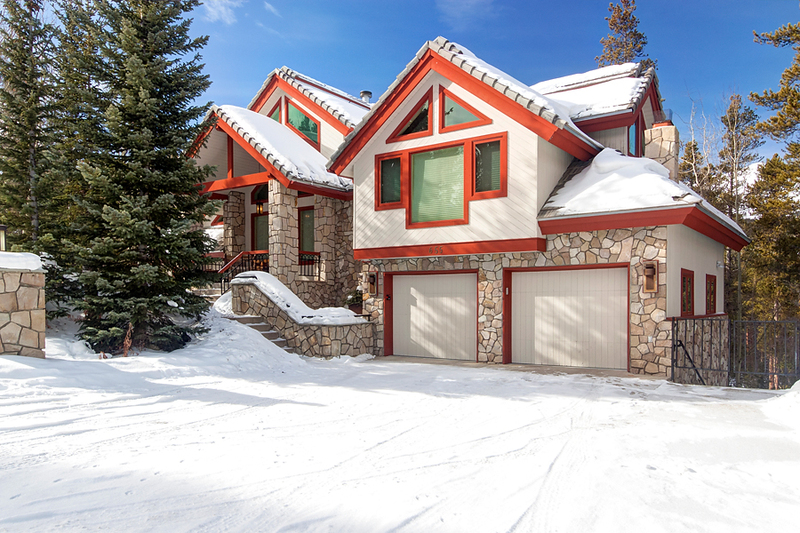 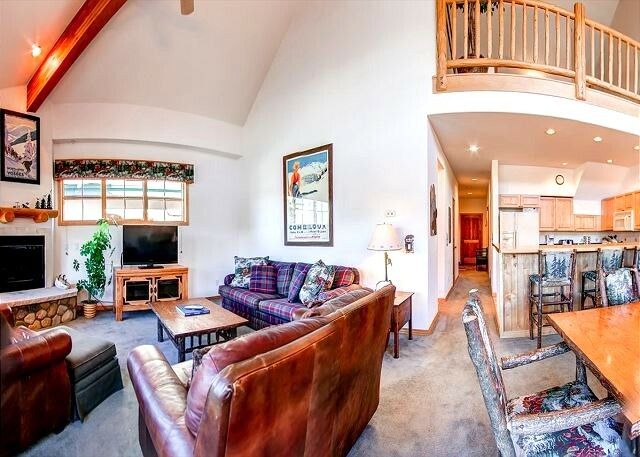 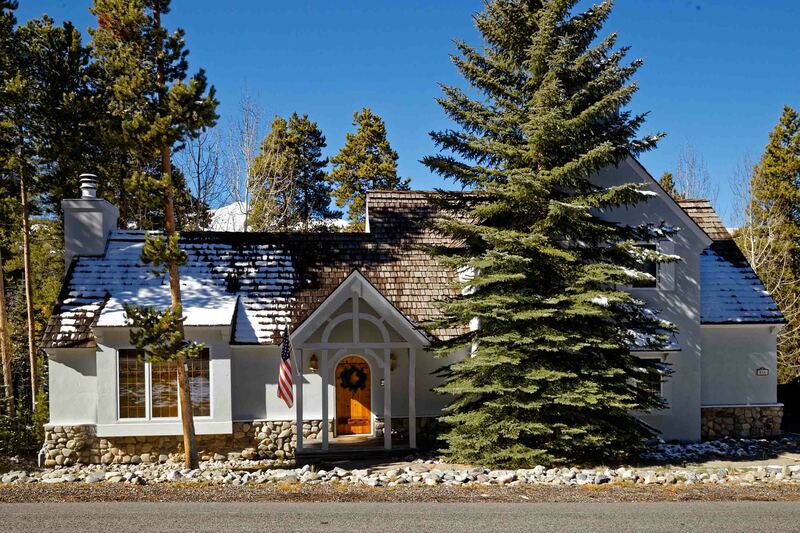 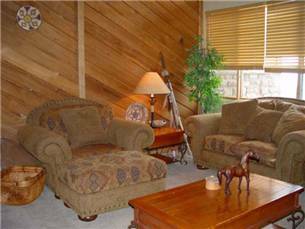 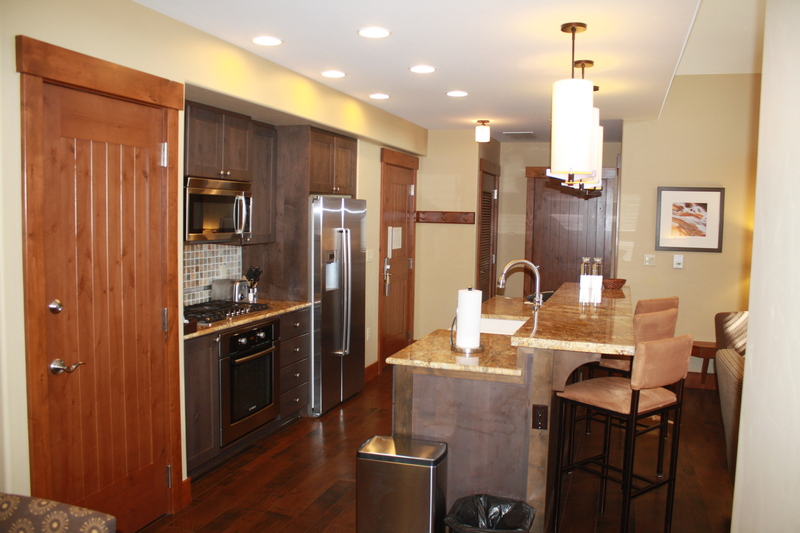 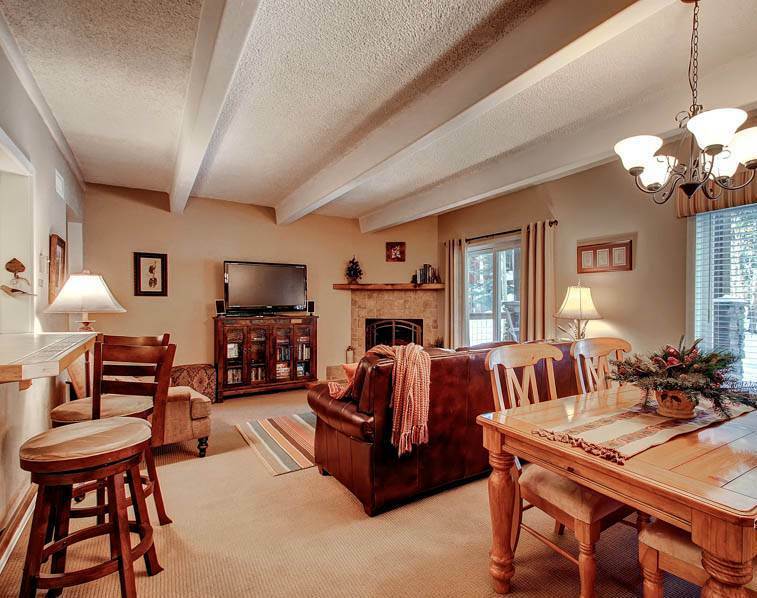 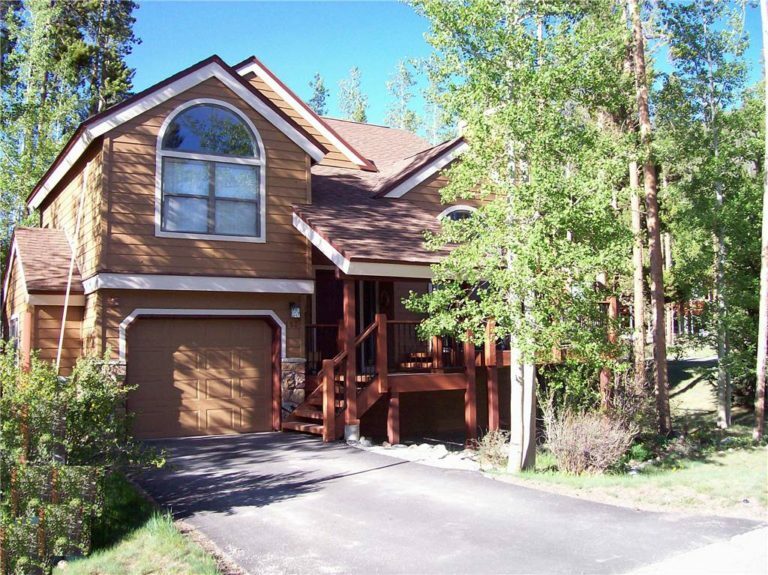 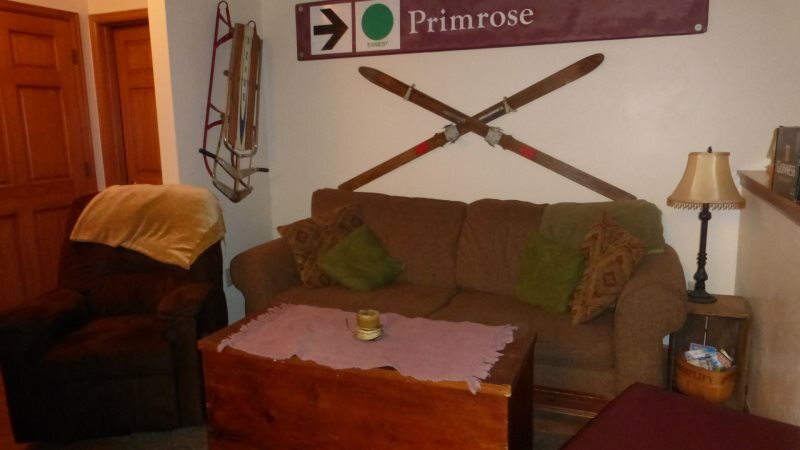 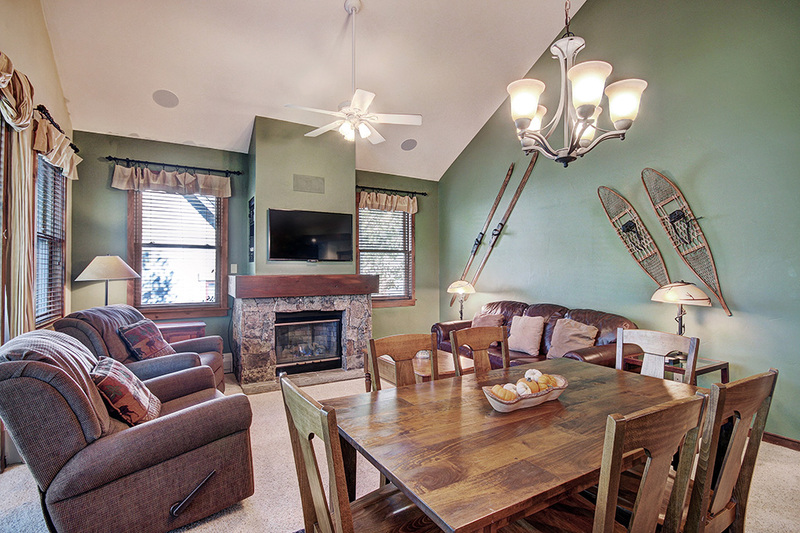 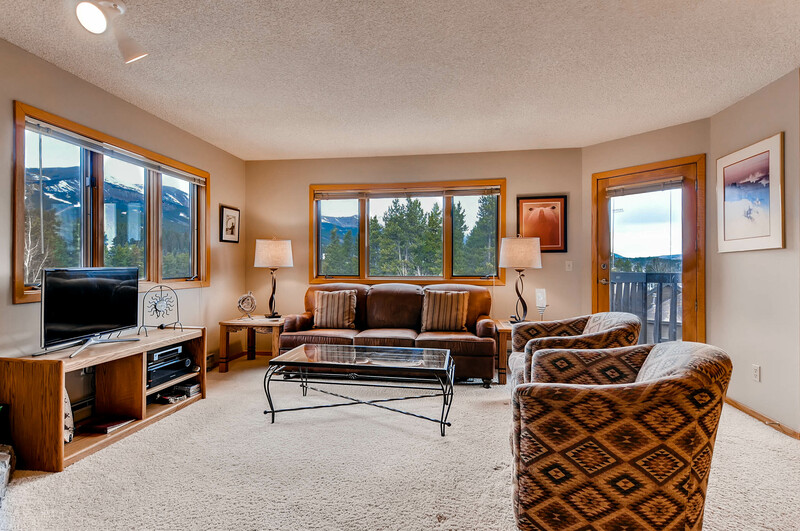 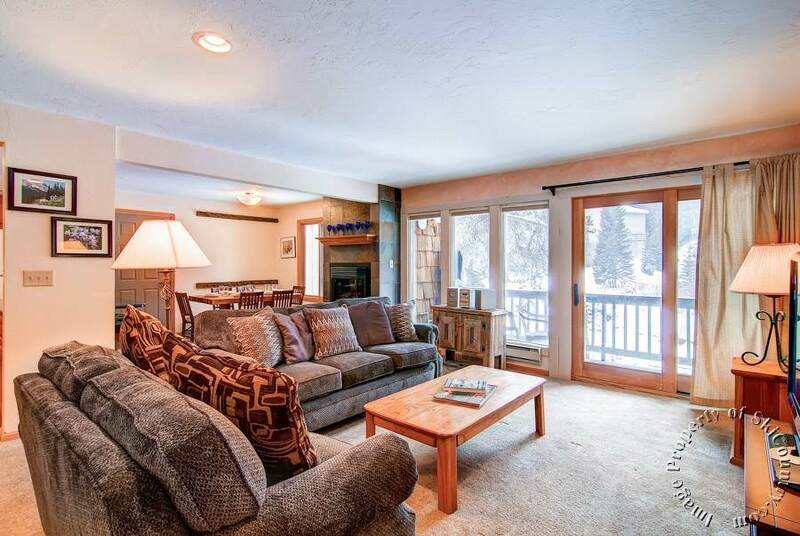 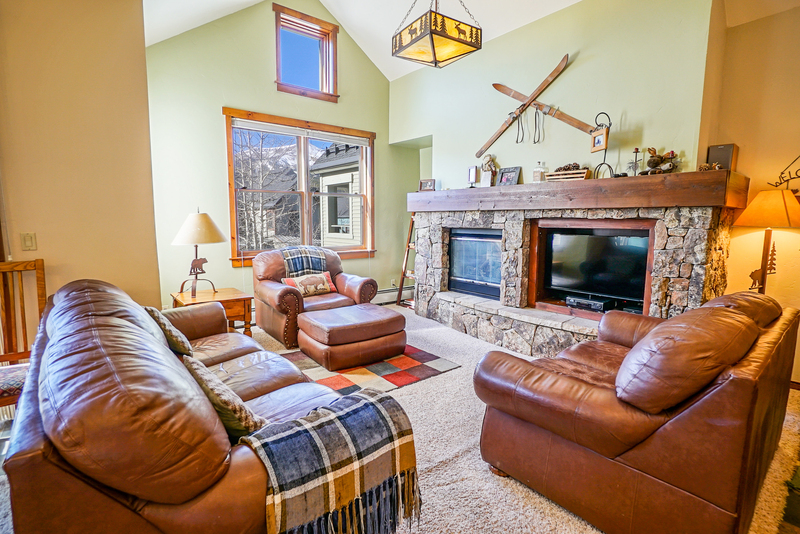 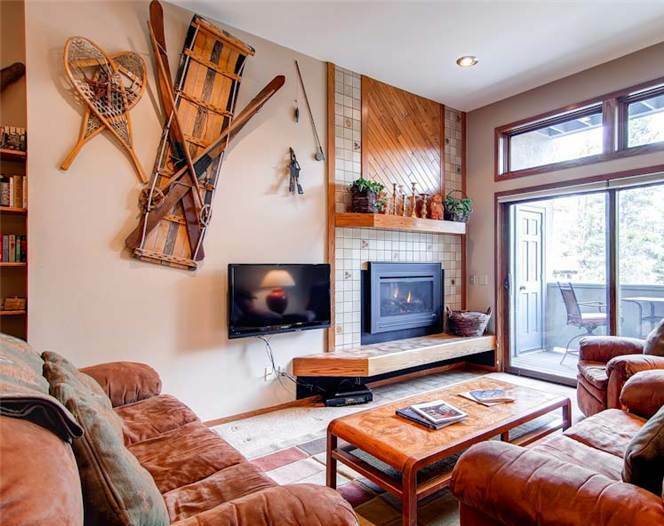 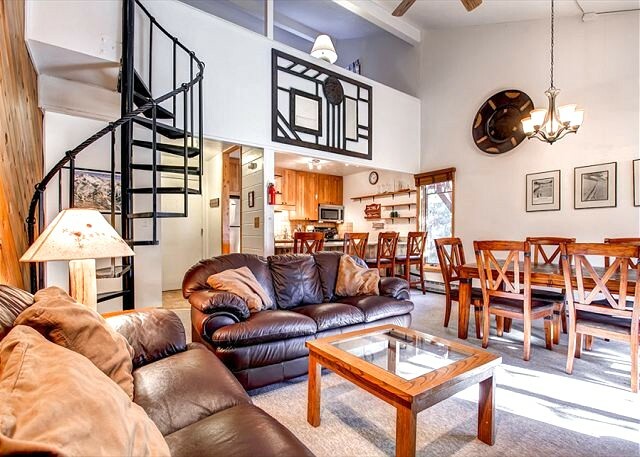 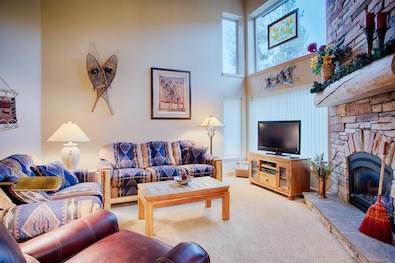 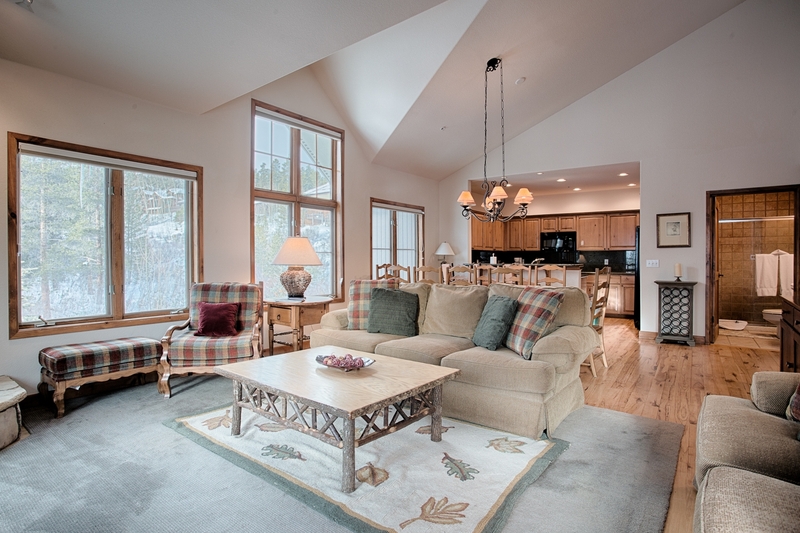 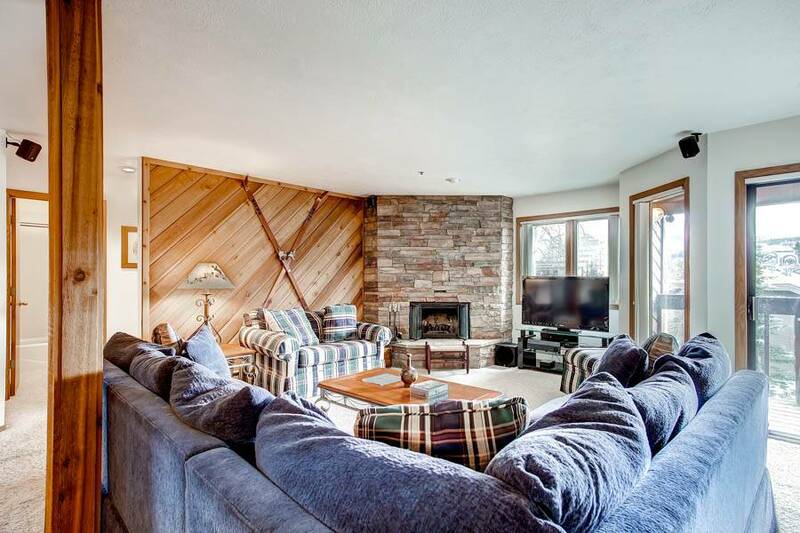 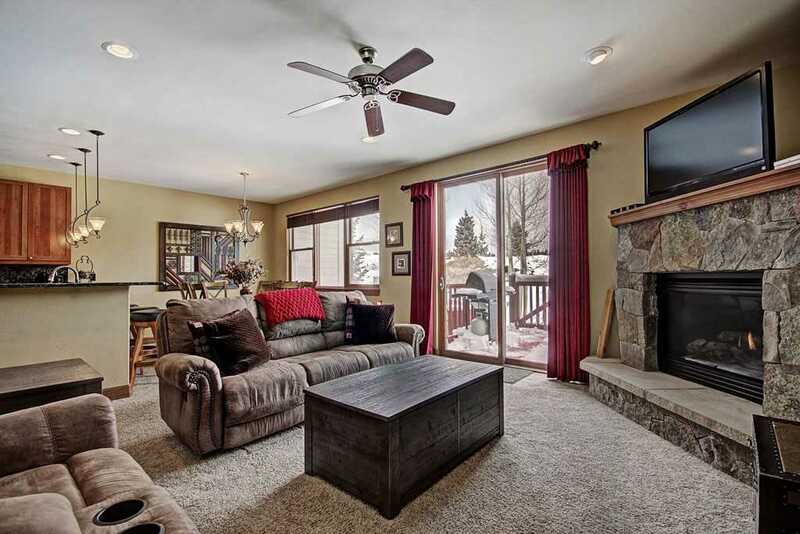 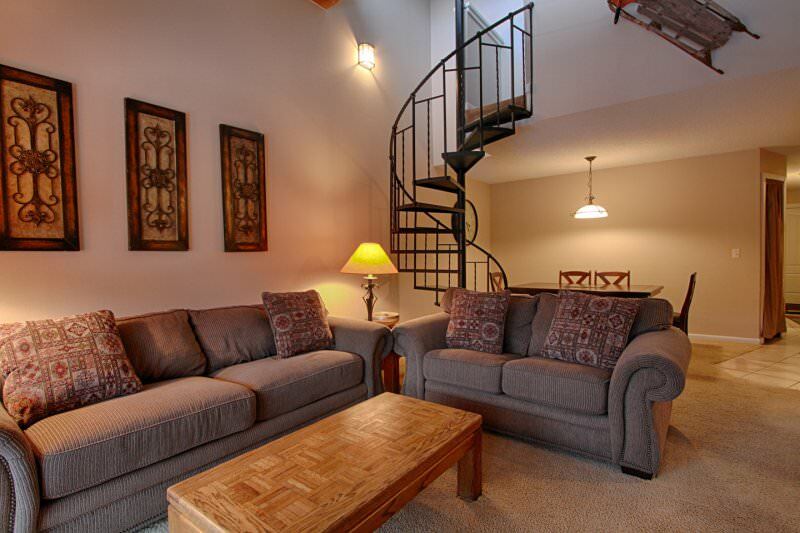 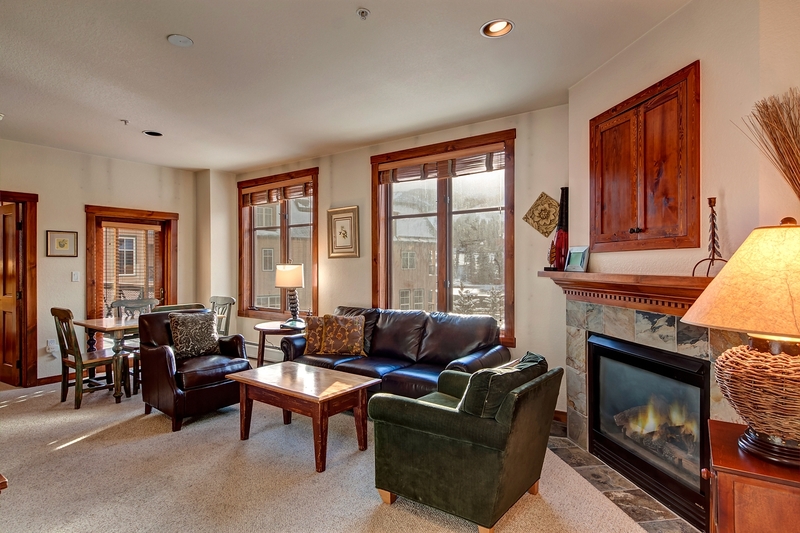 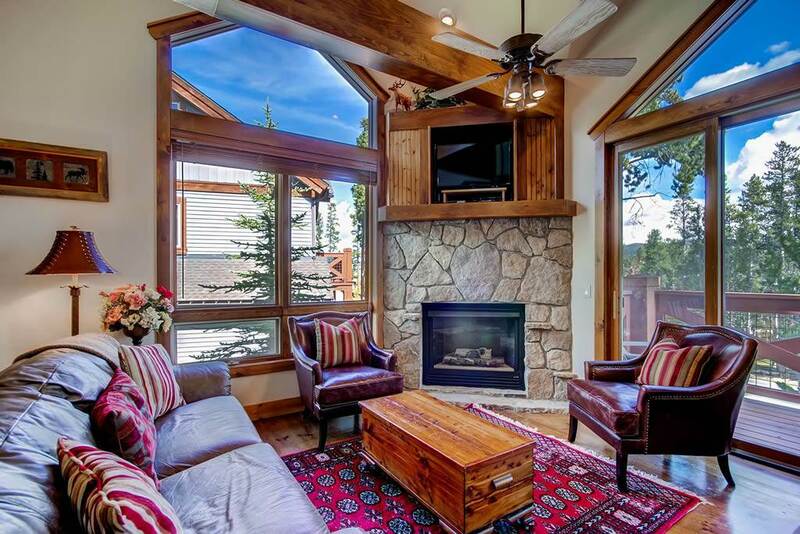 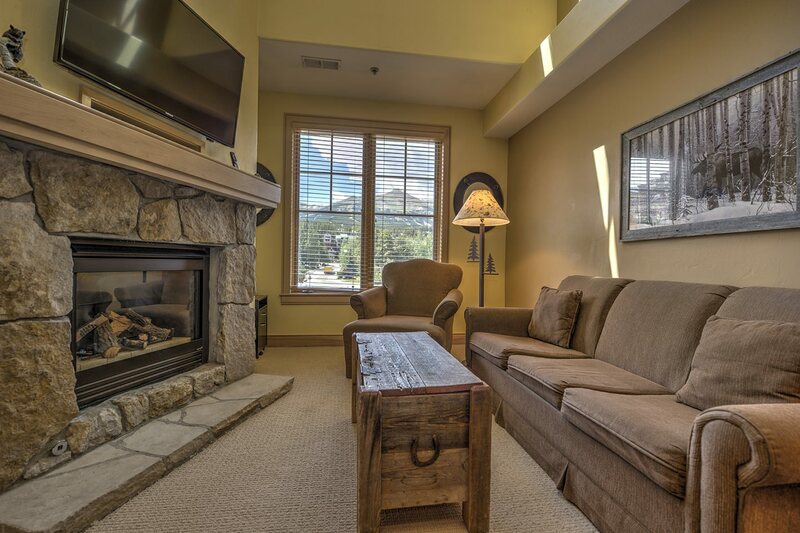 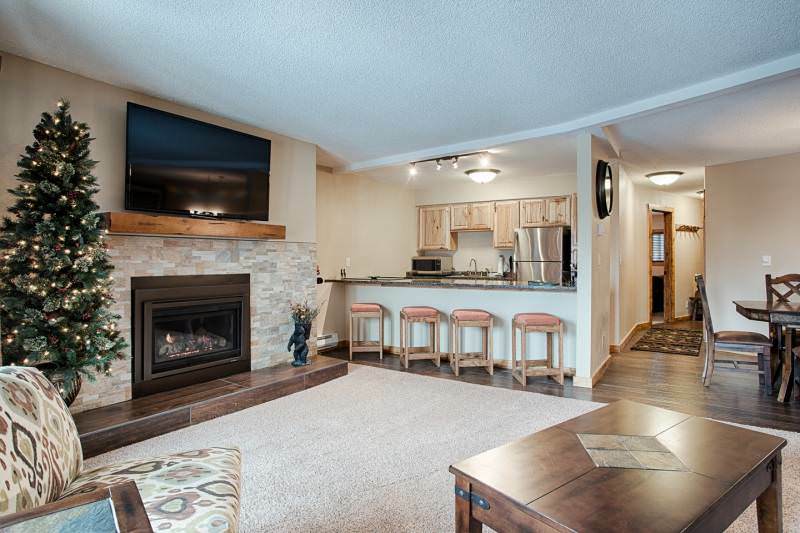 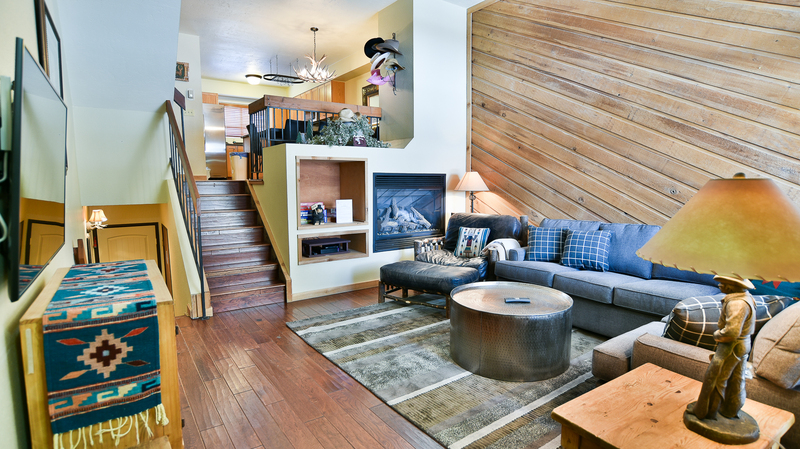 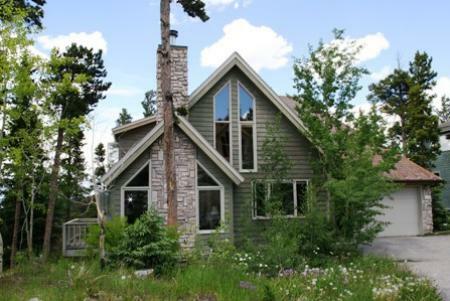 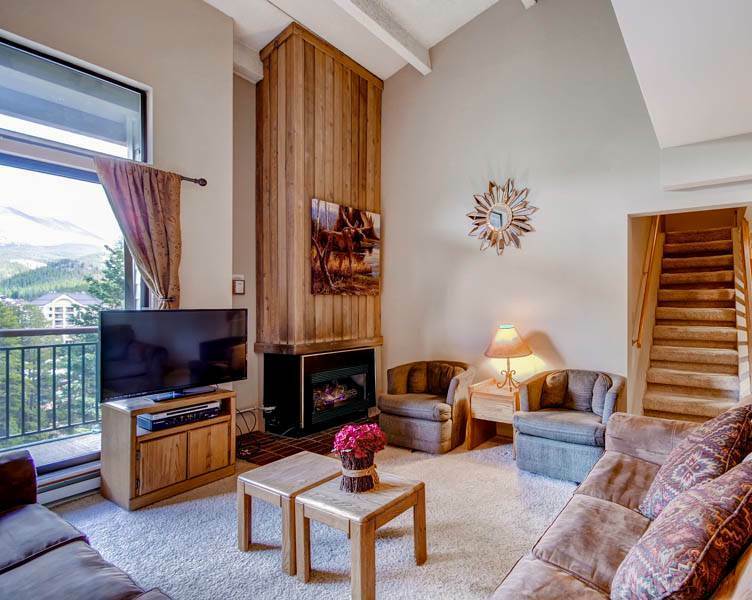 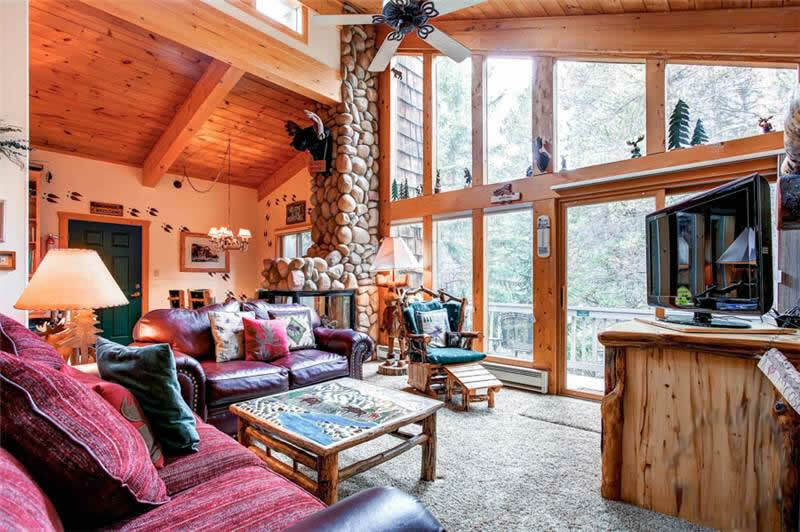 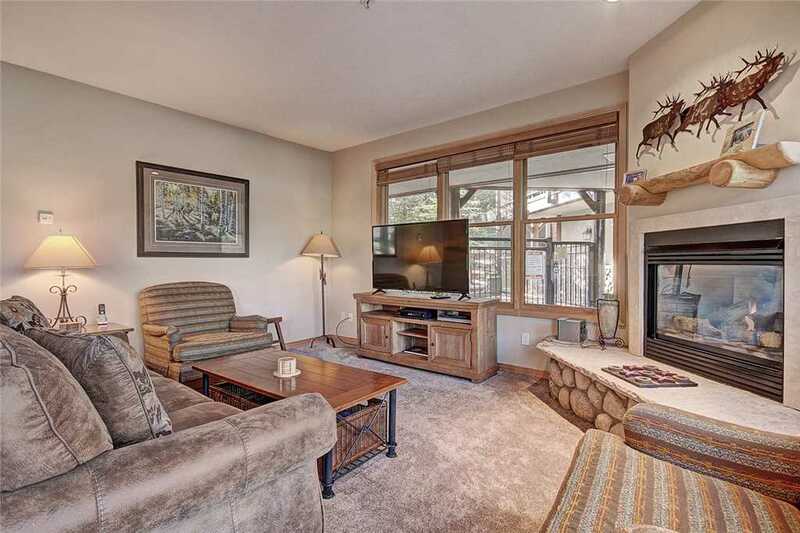 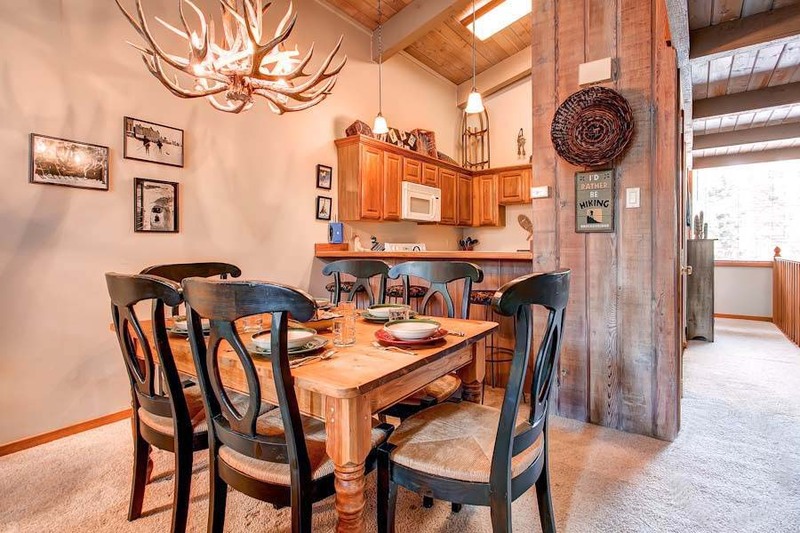 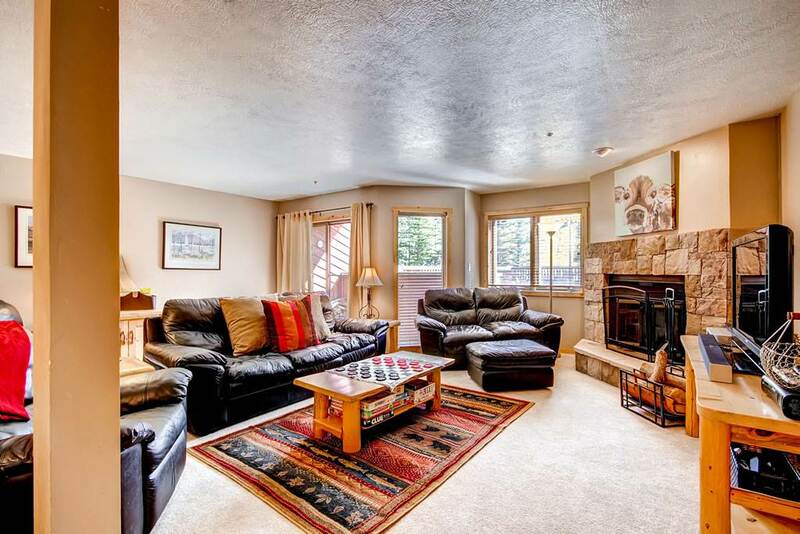 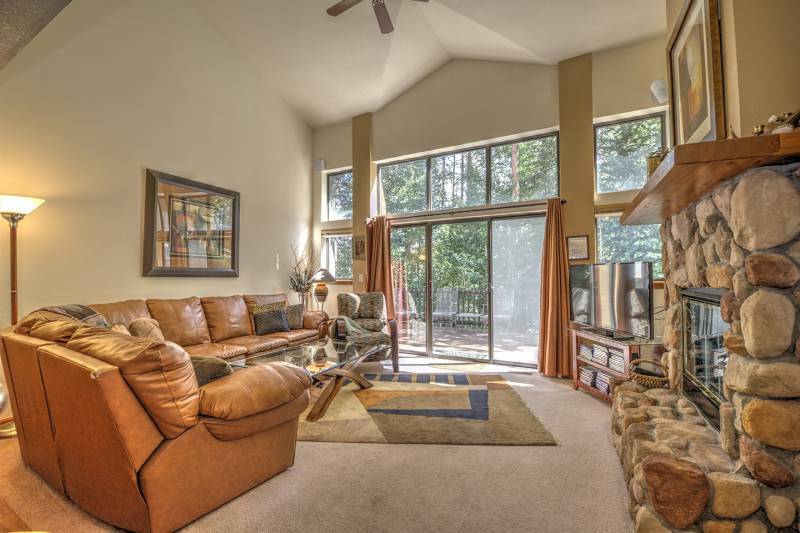 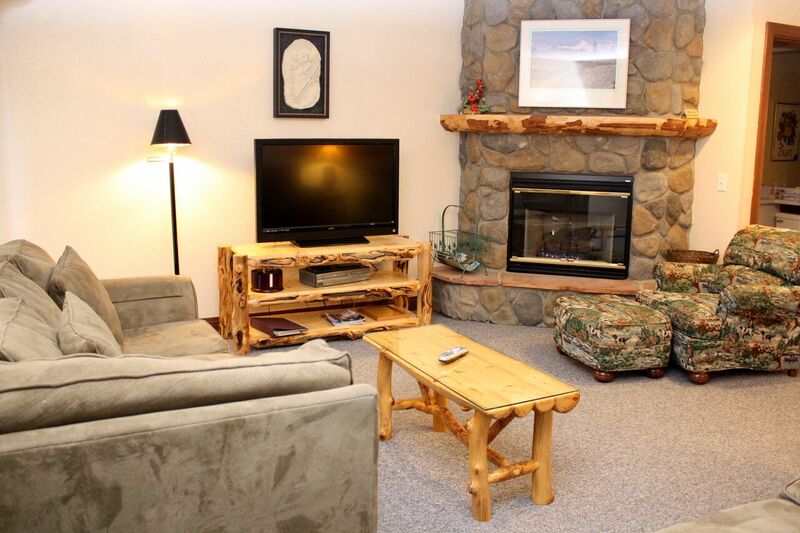 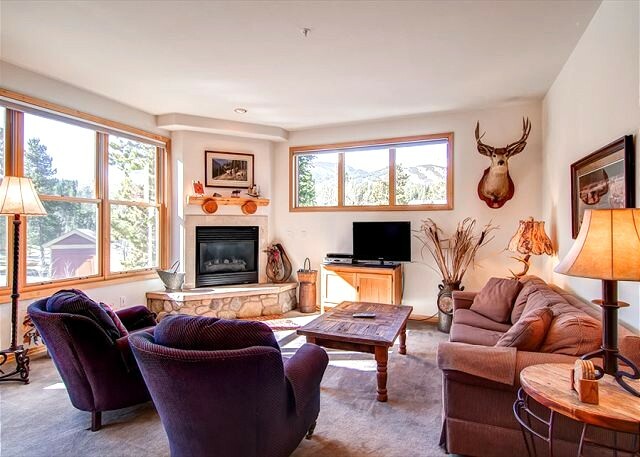 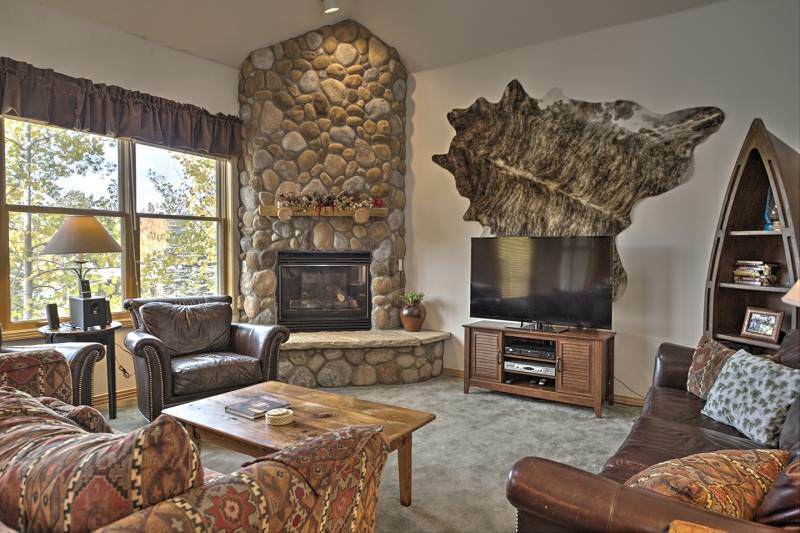 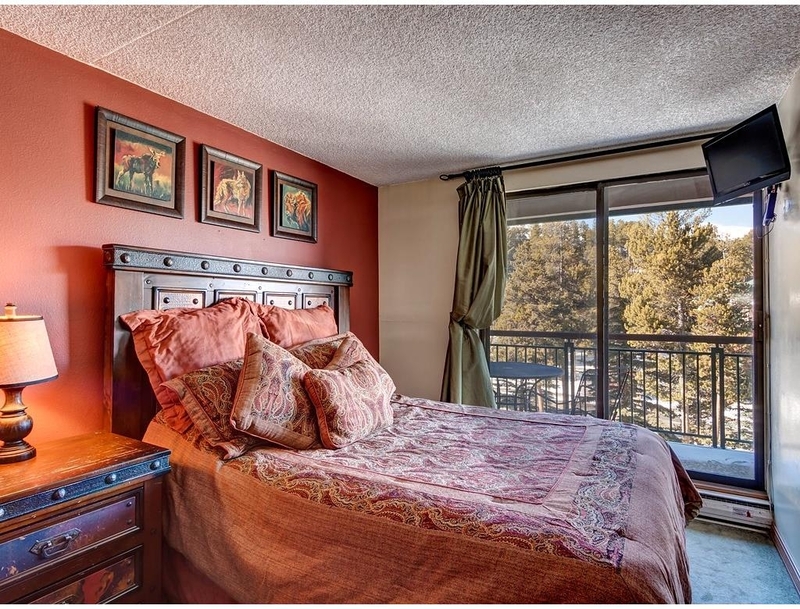 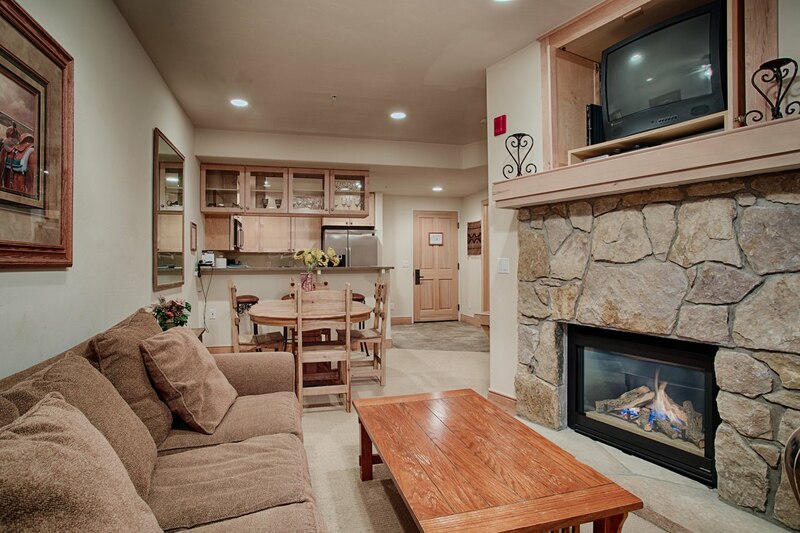 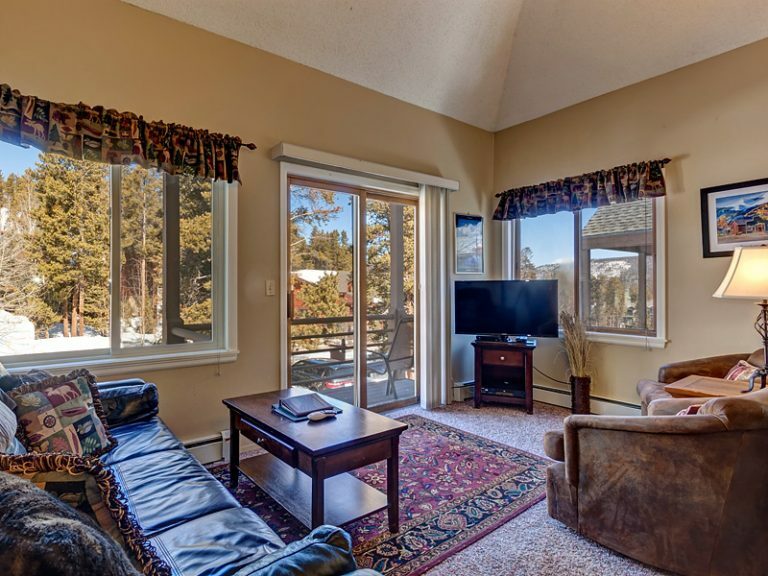 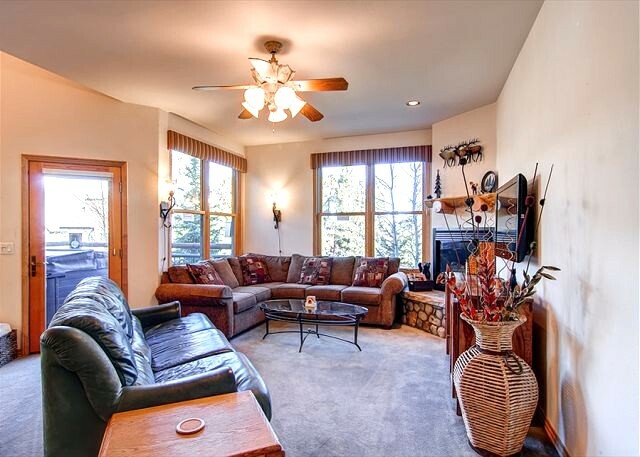 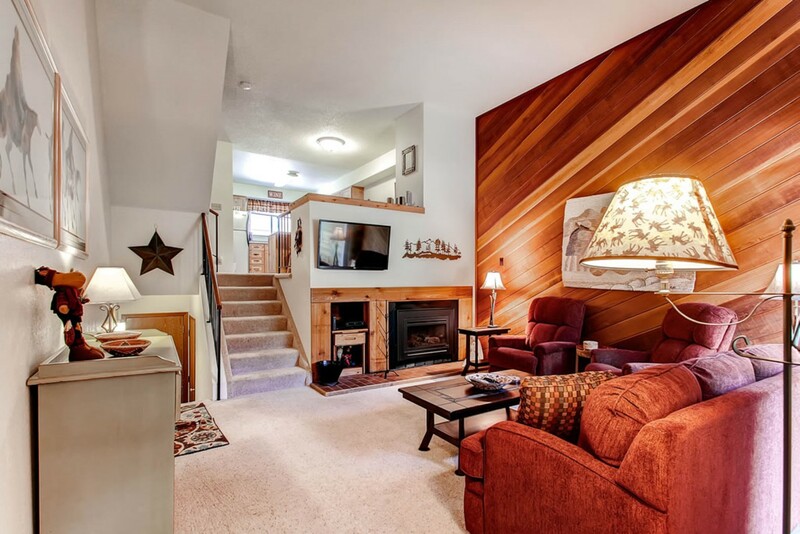 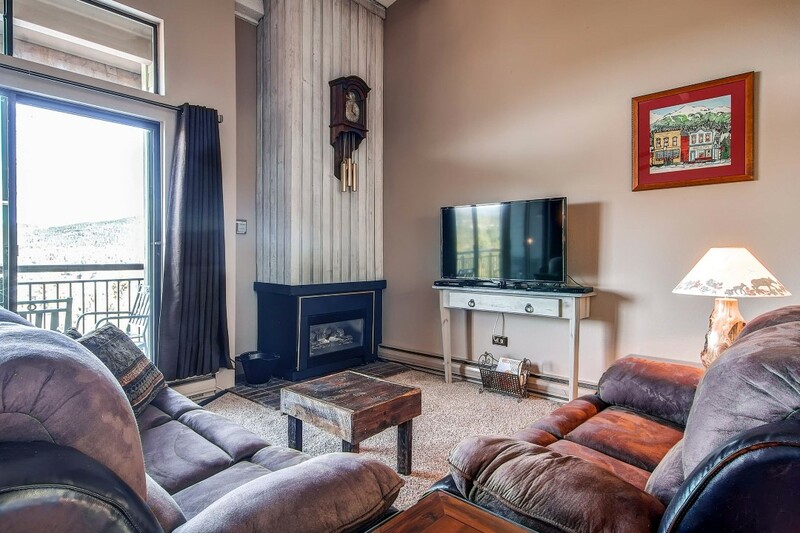 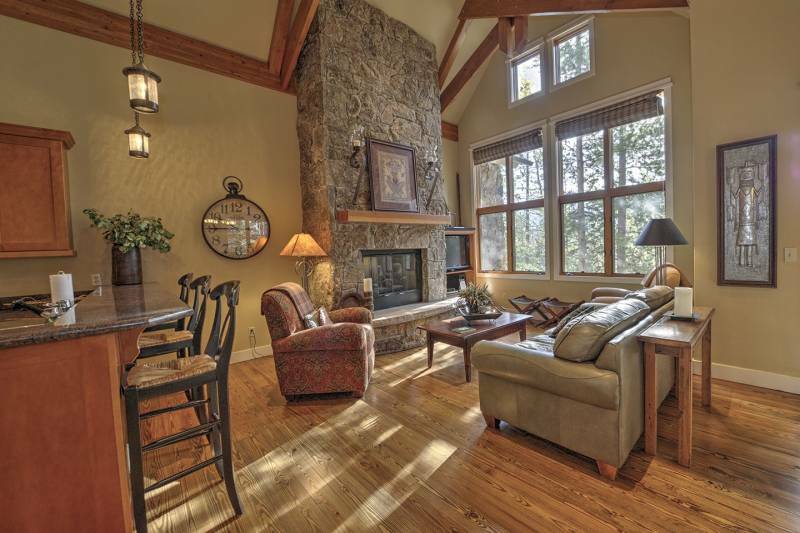 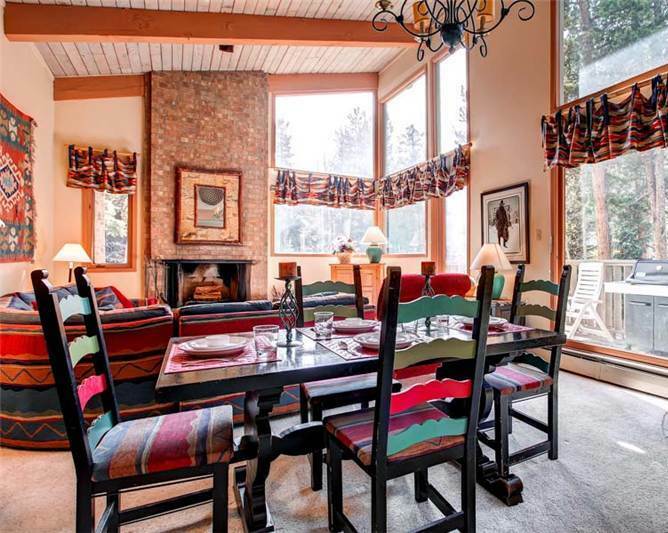 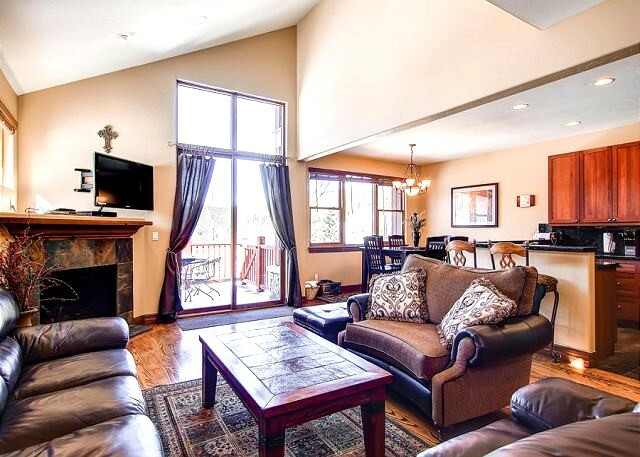 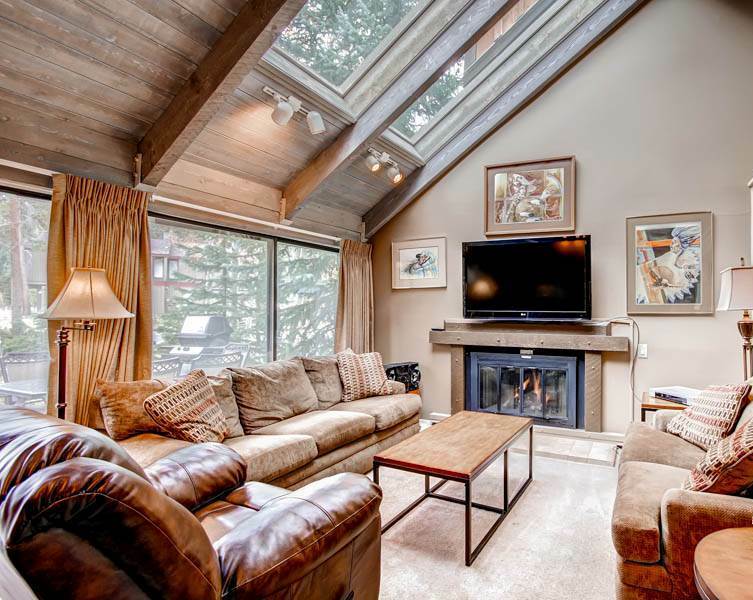 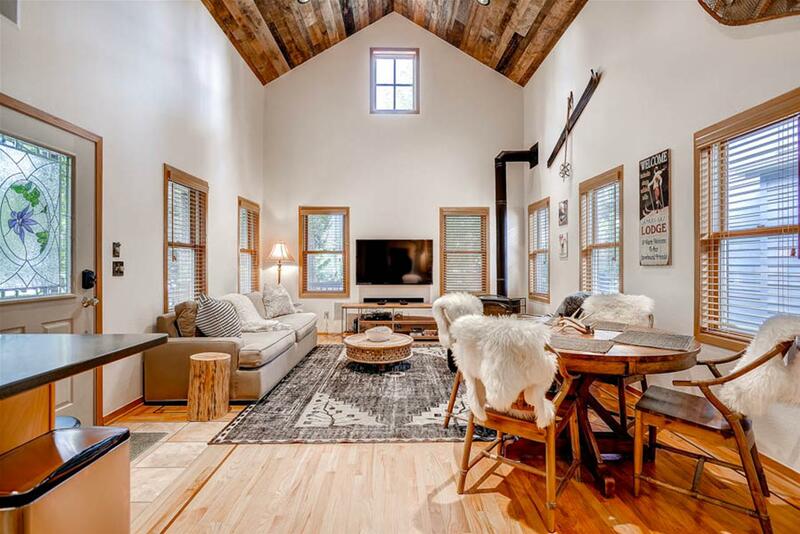 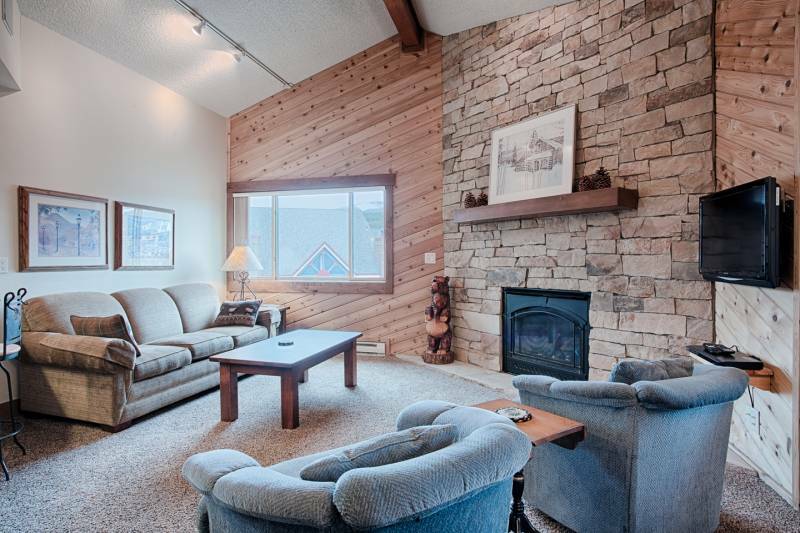 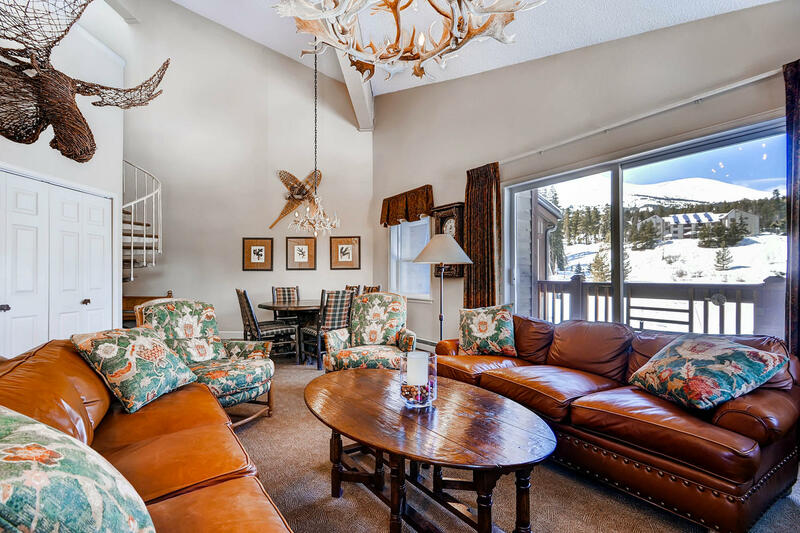 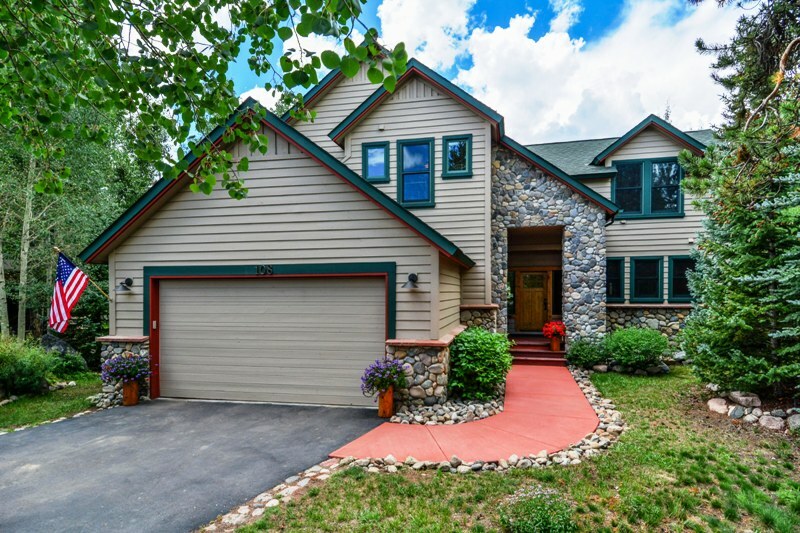 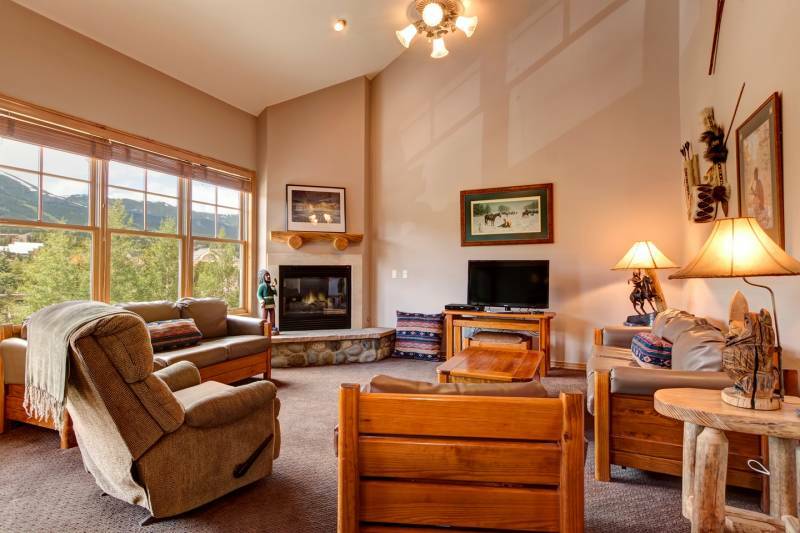 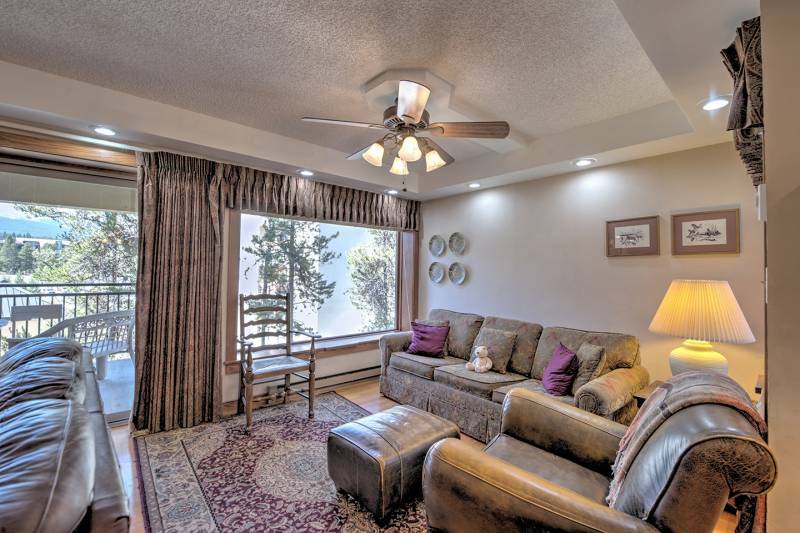 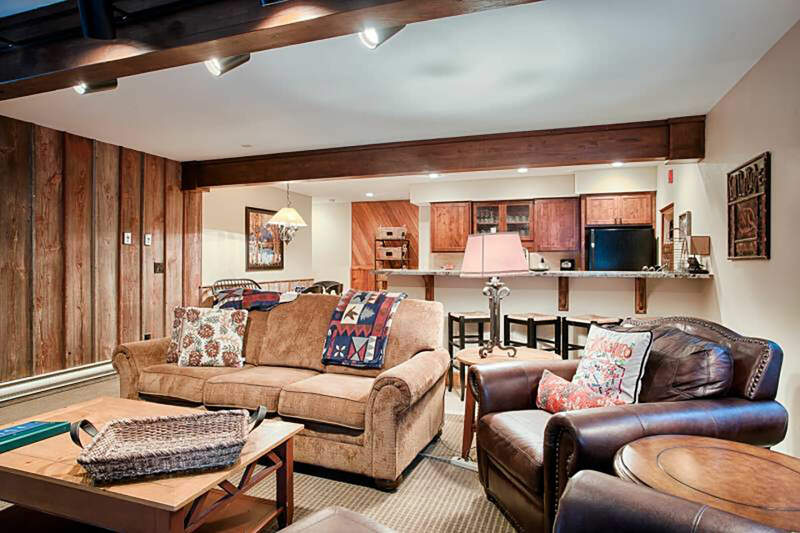 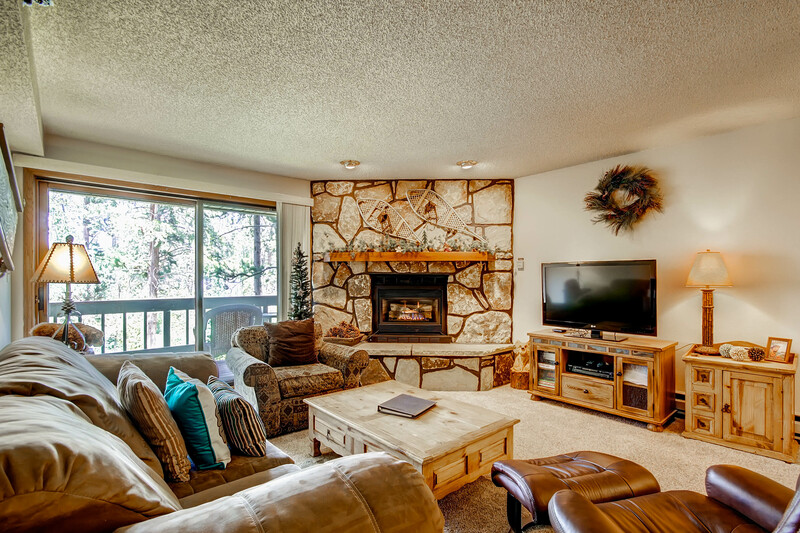 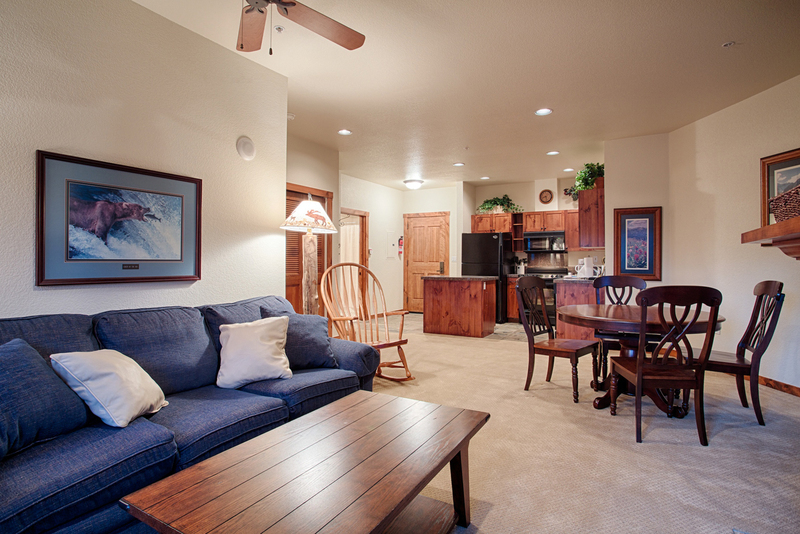 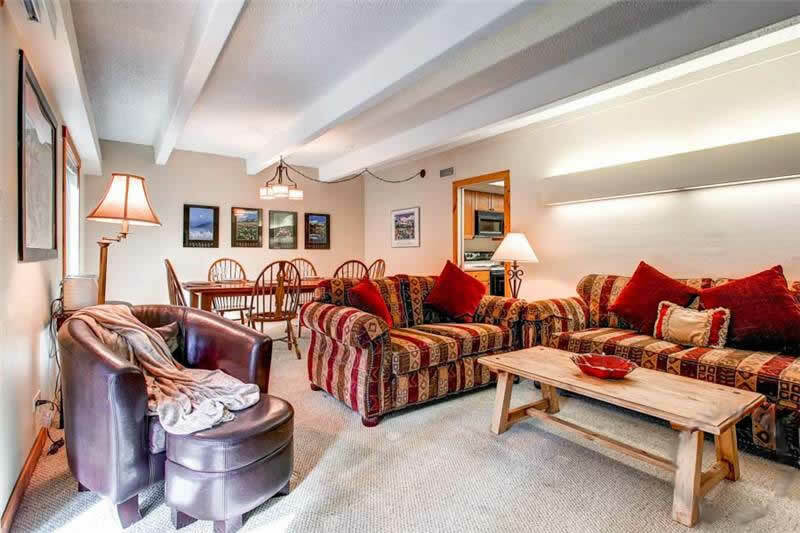 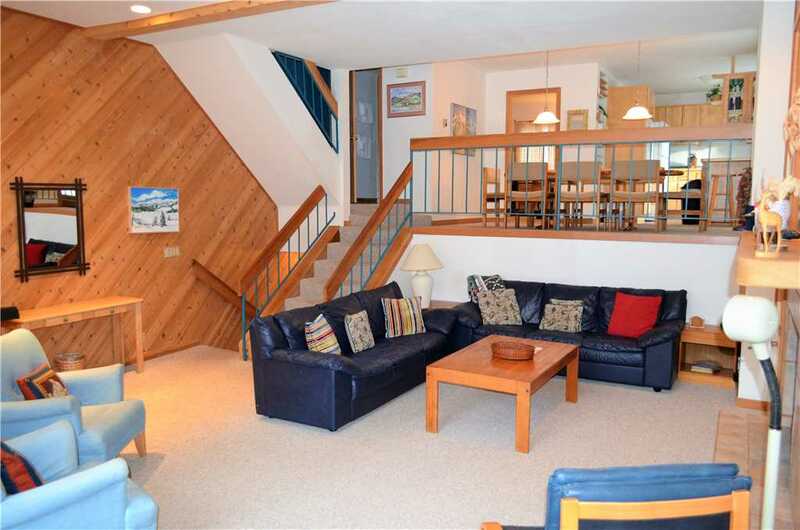 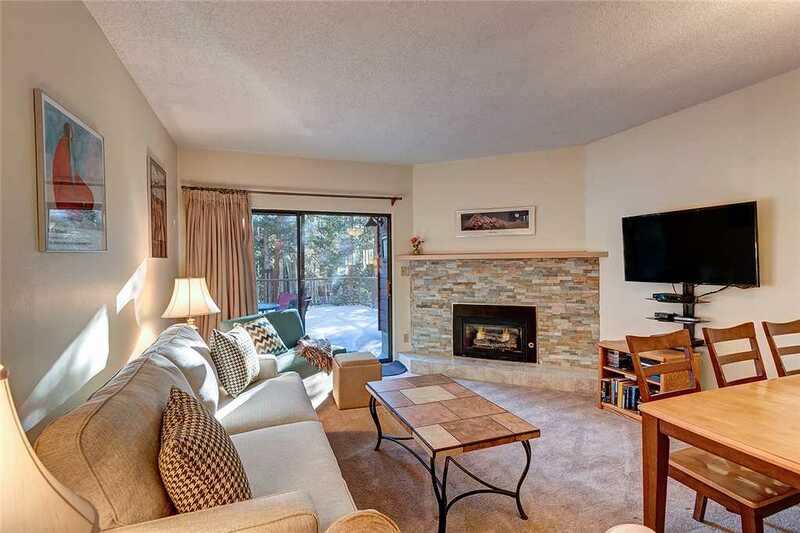 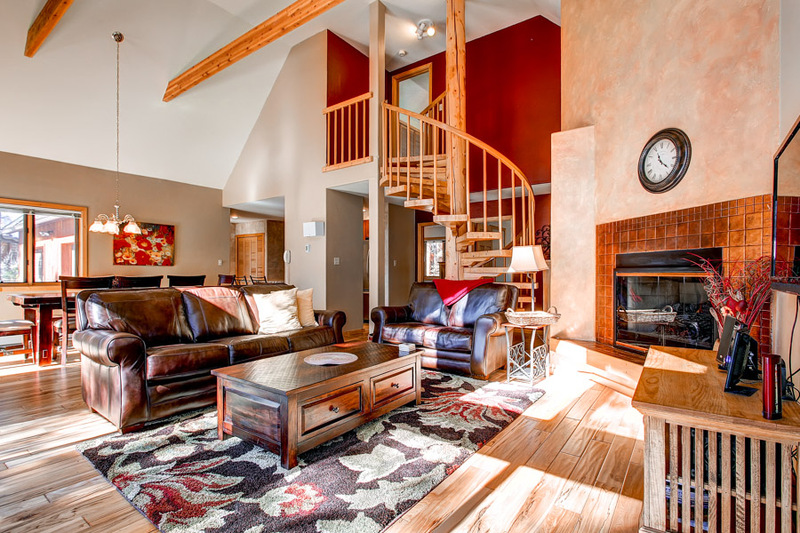 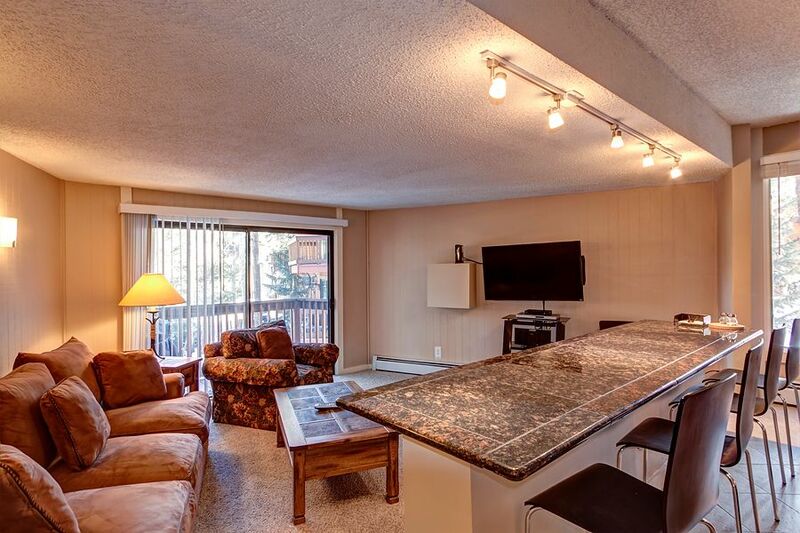 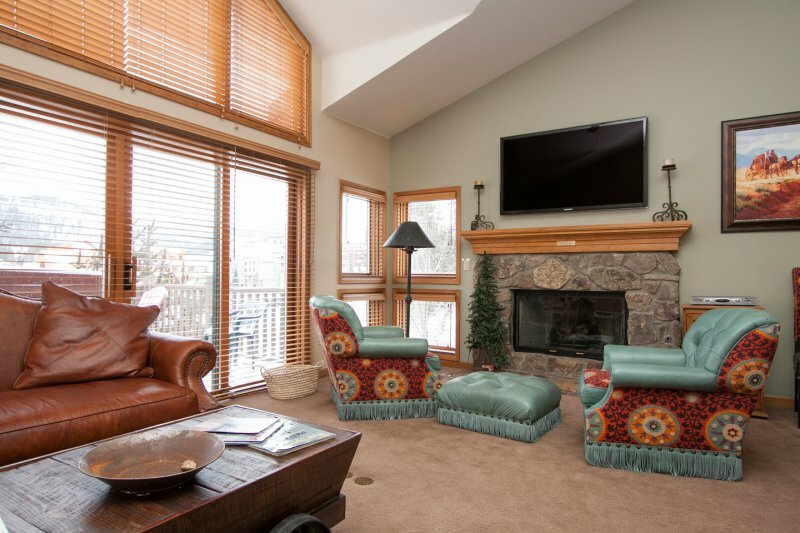 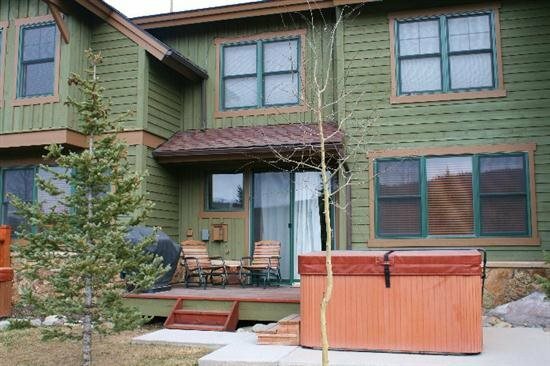 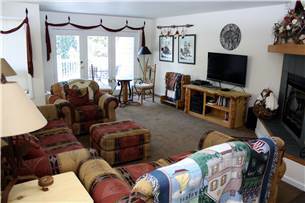 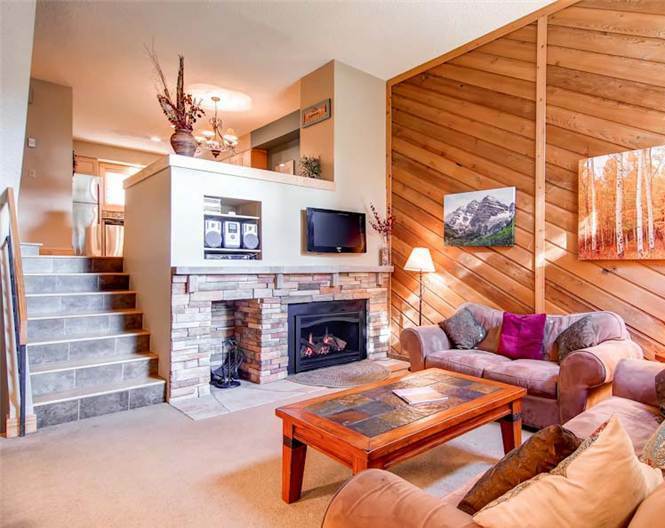 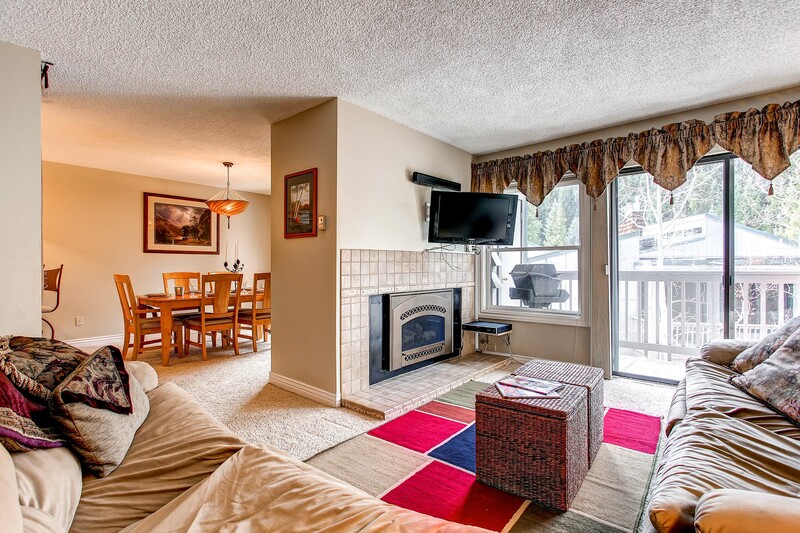 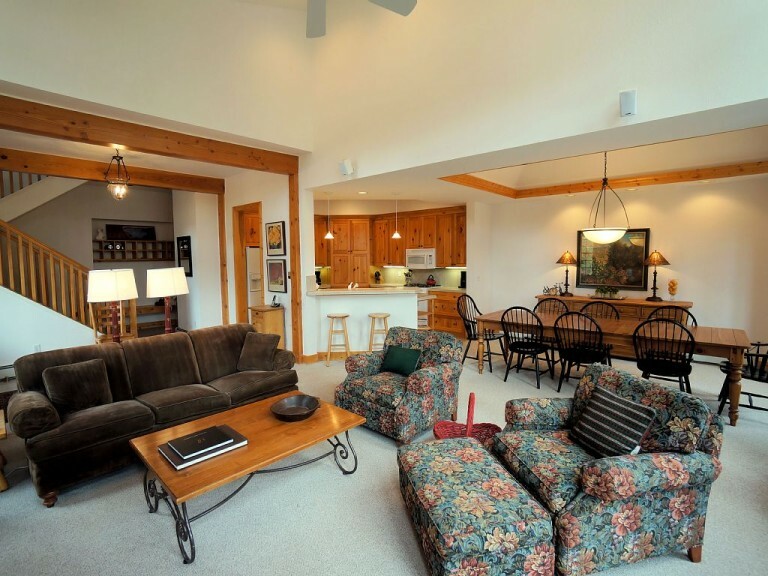 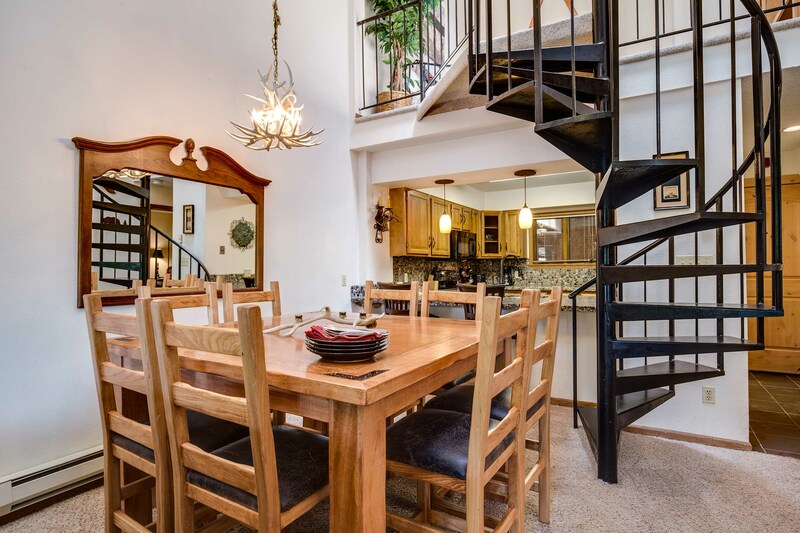 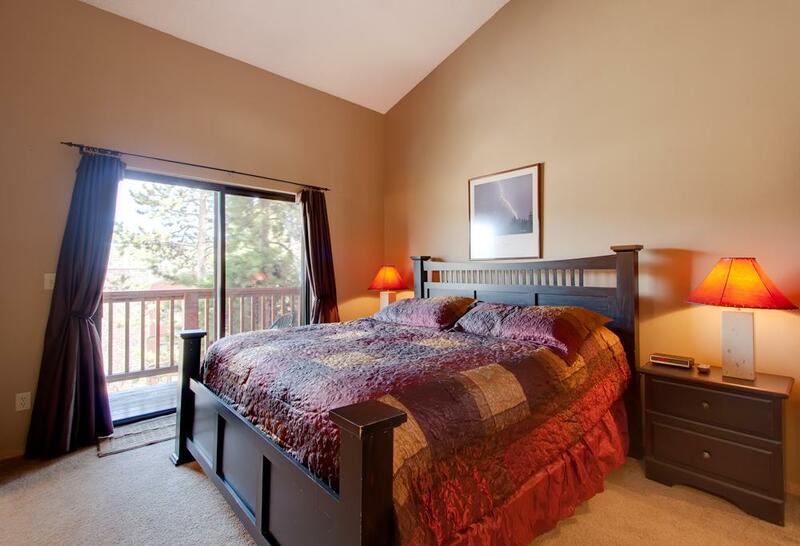 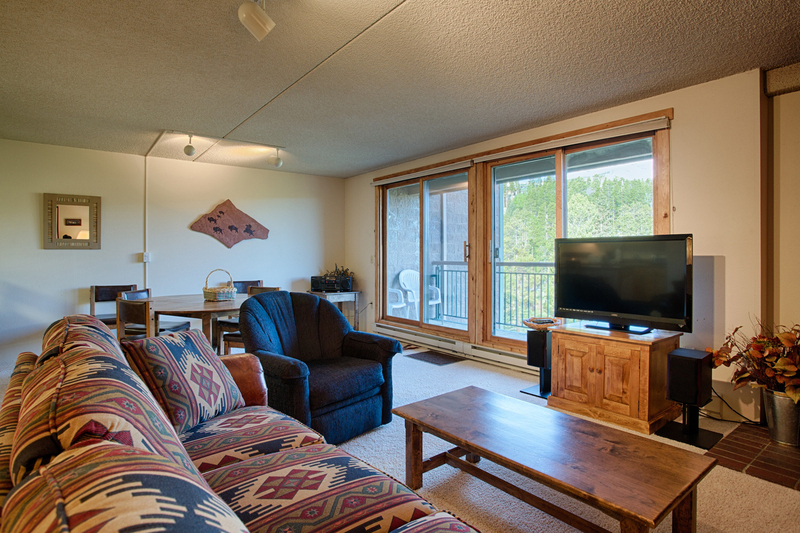 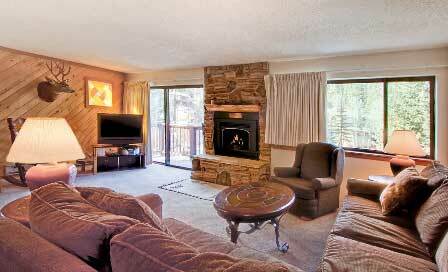 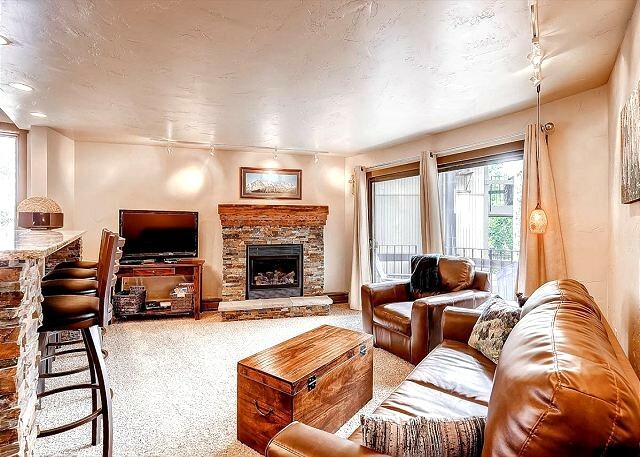 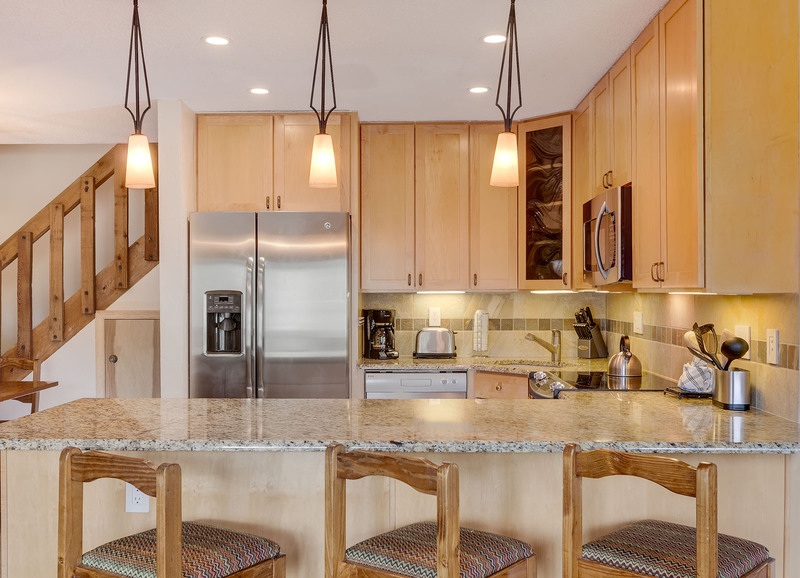 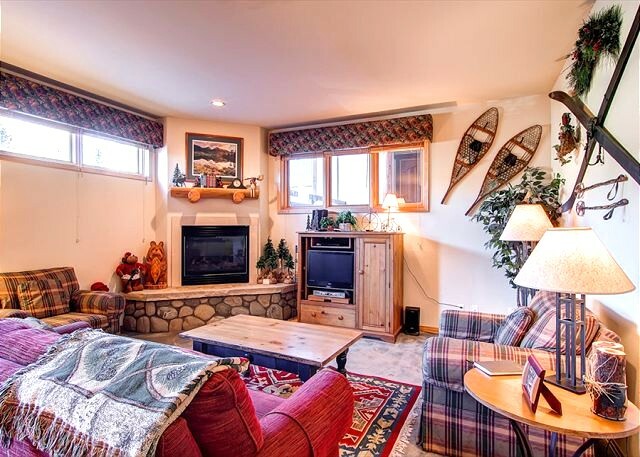 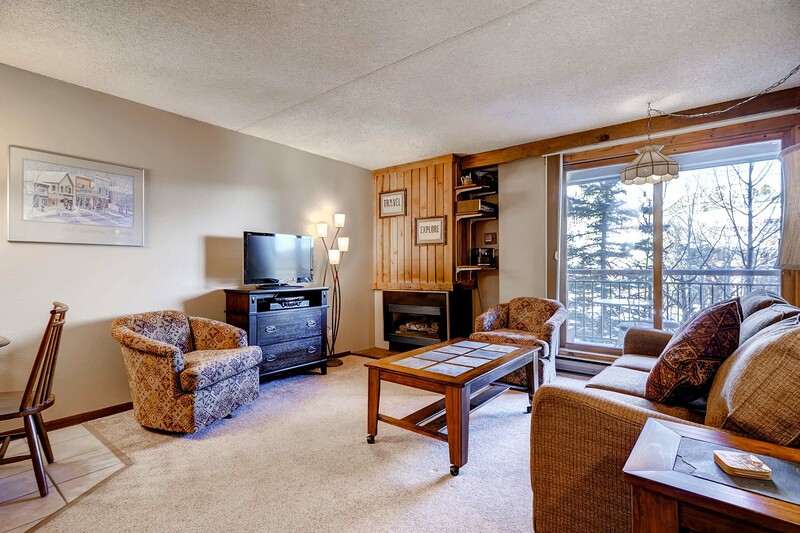 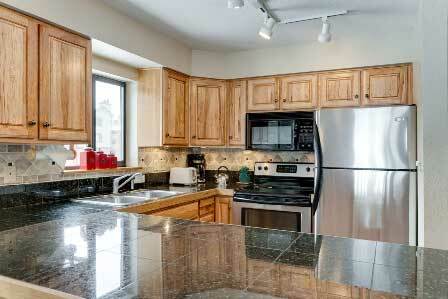 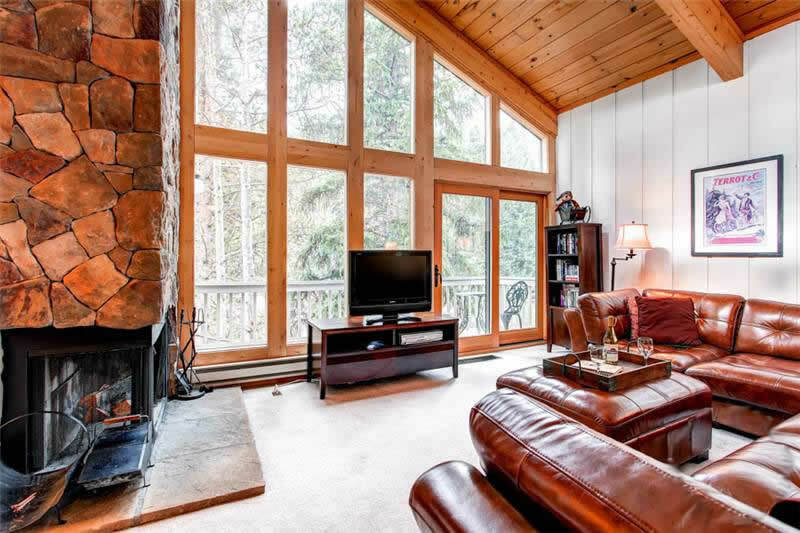 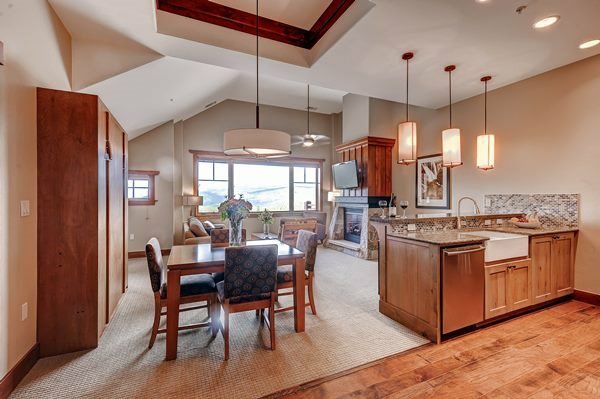 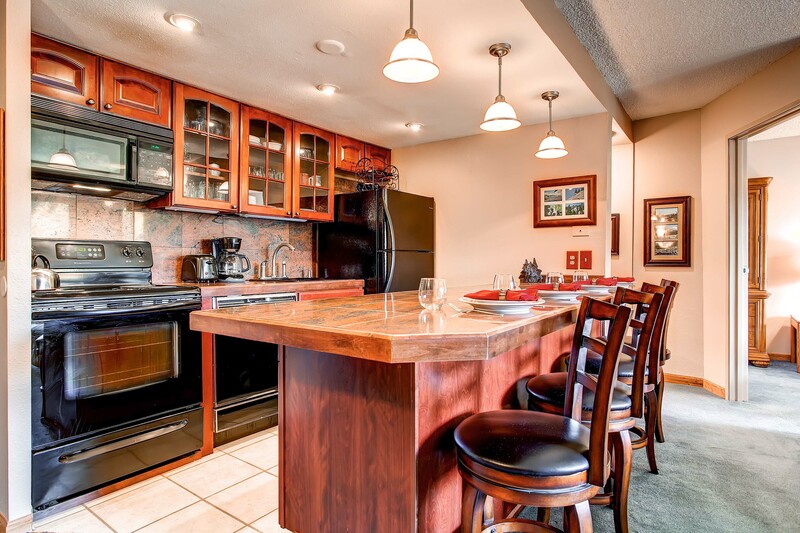 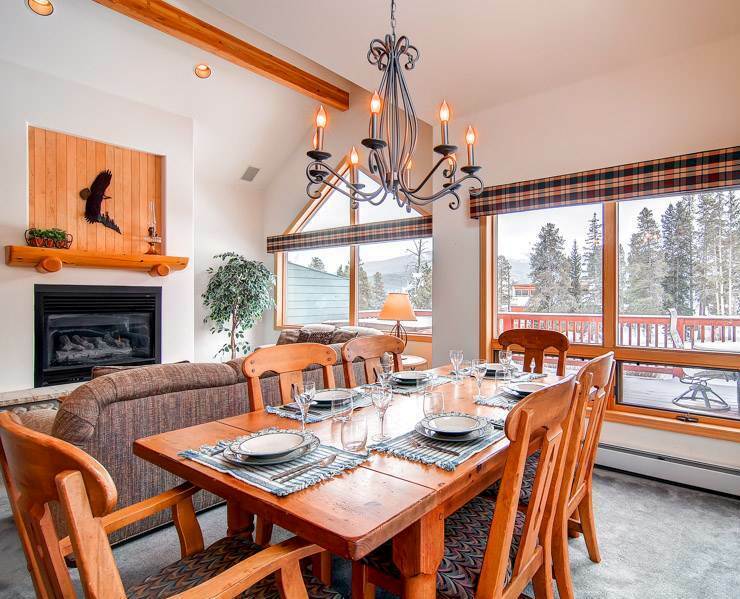 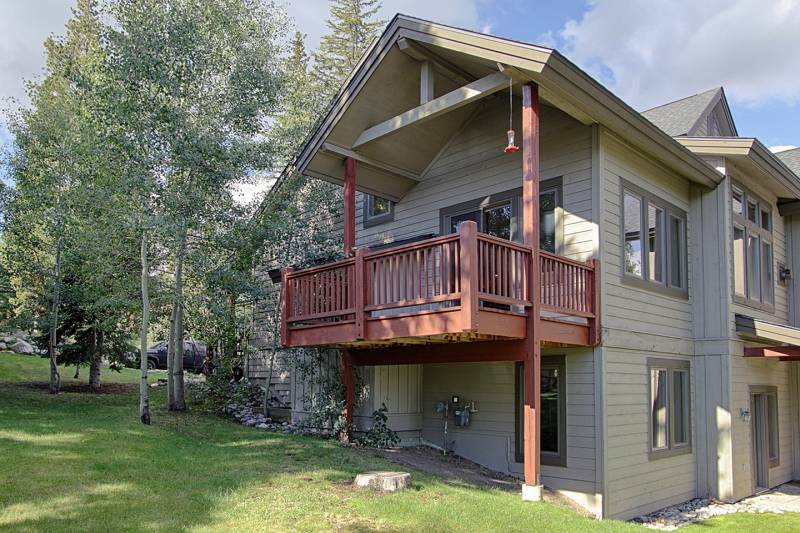 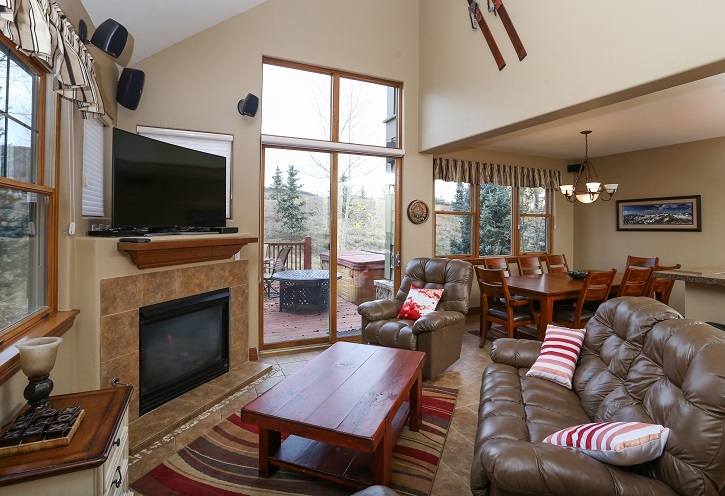 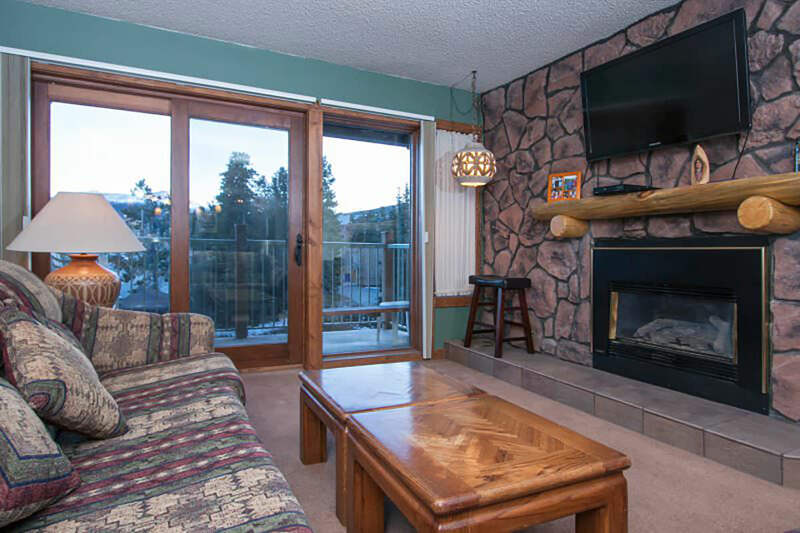 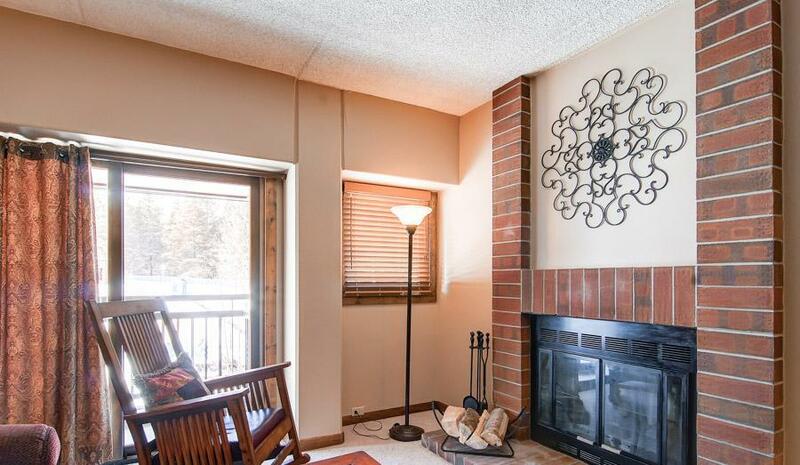 This loft unit has great views of the mountains surrounding Breckenridge on the front and back side. 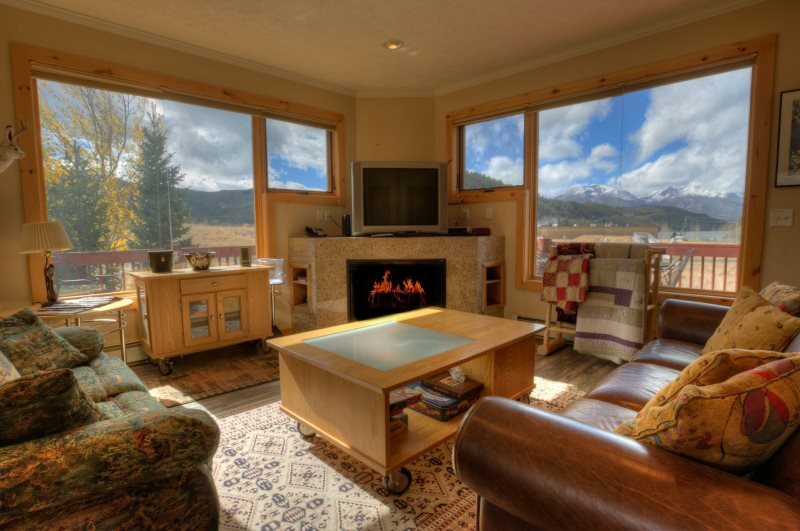 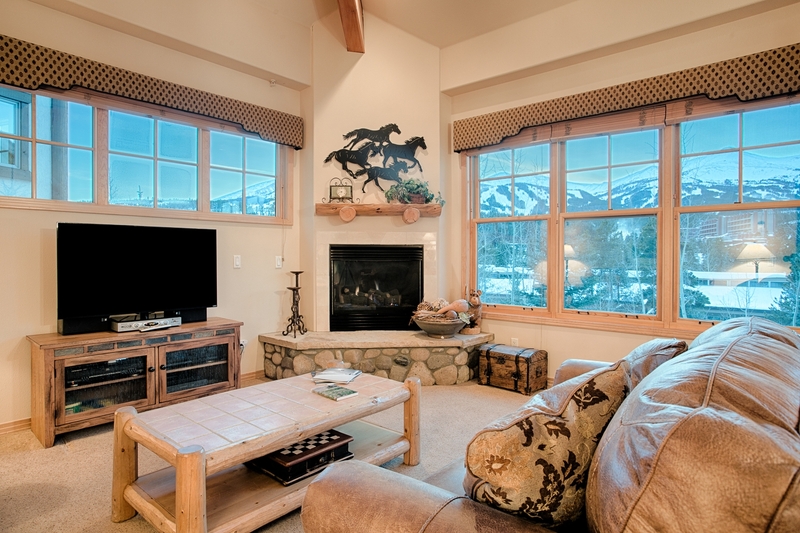 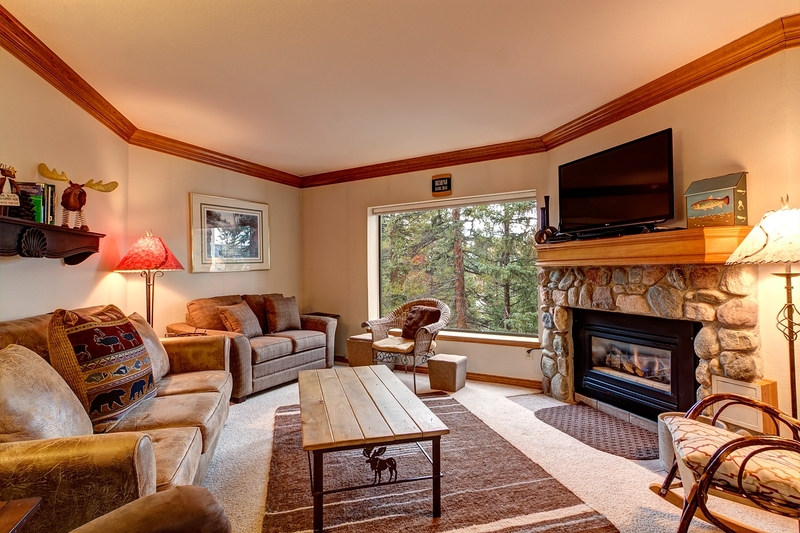 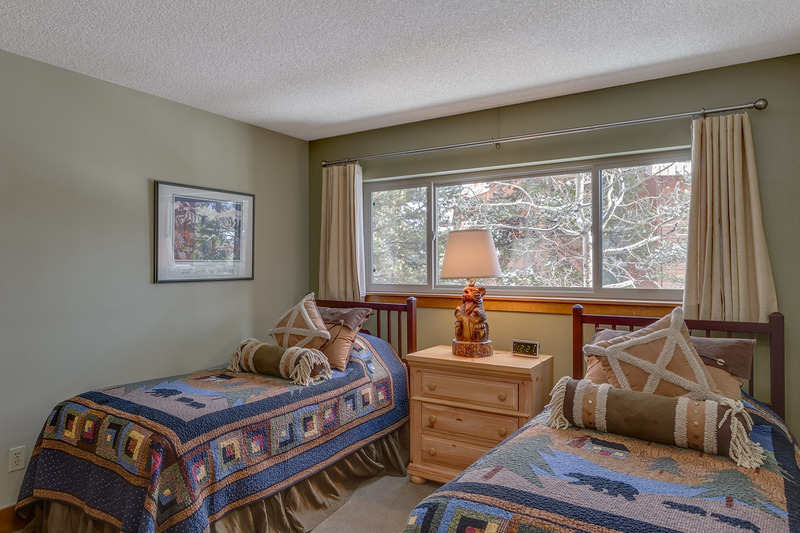 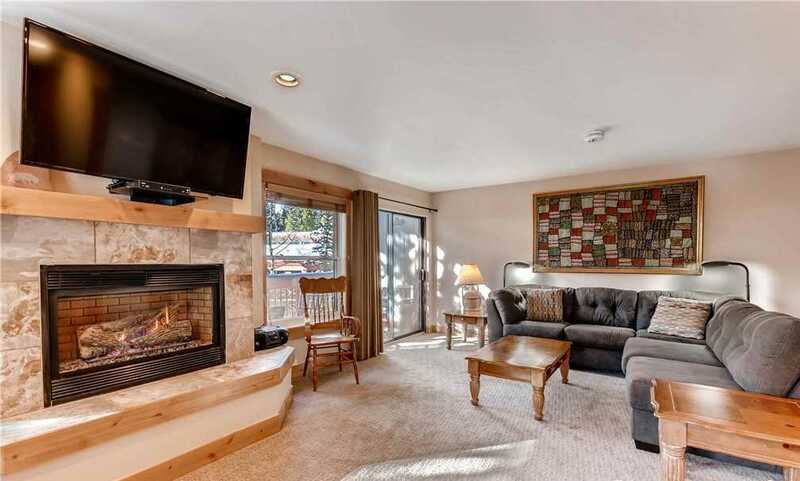 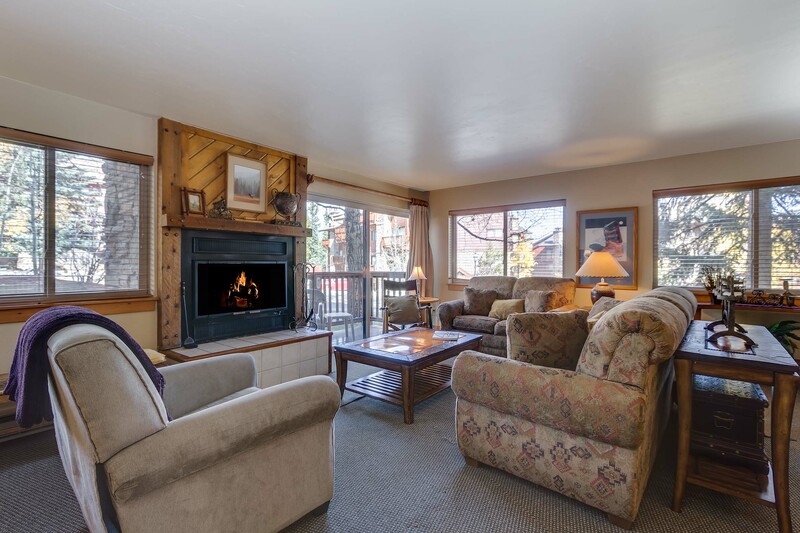 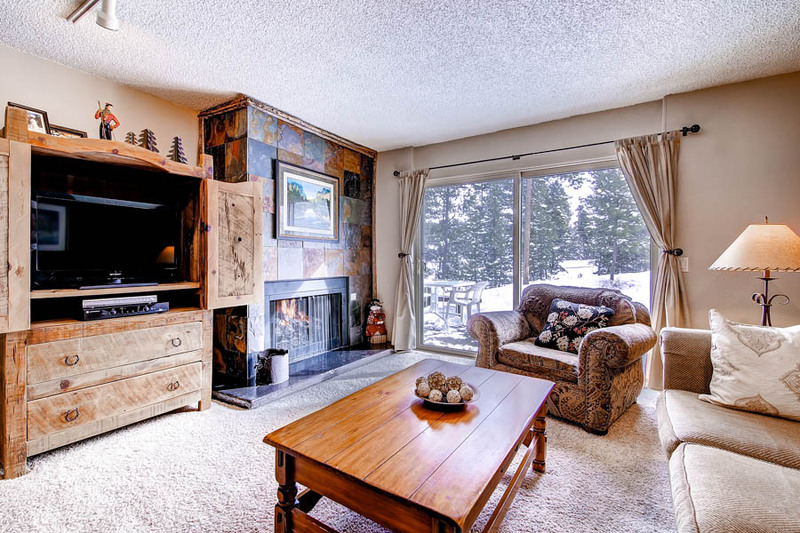 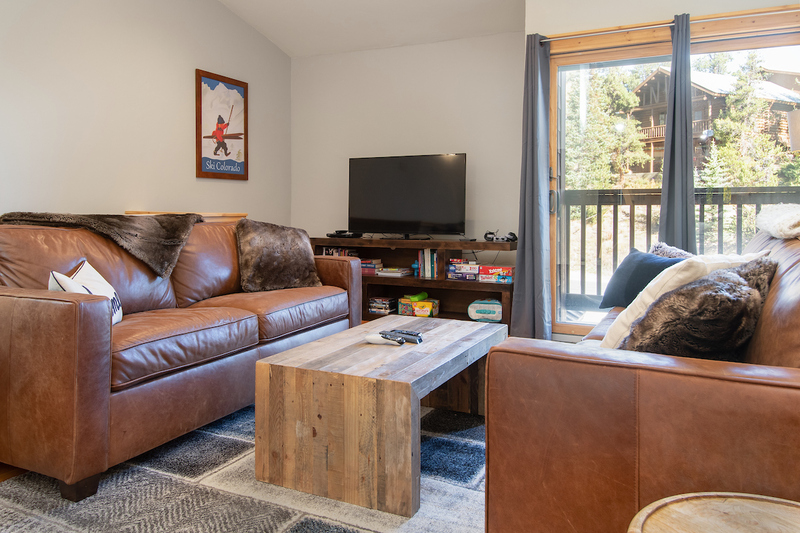 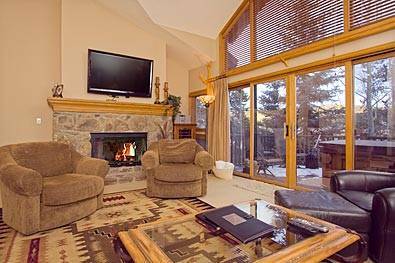 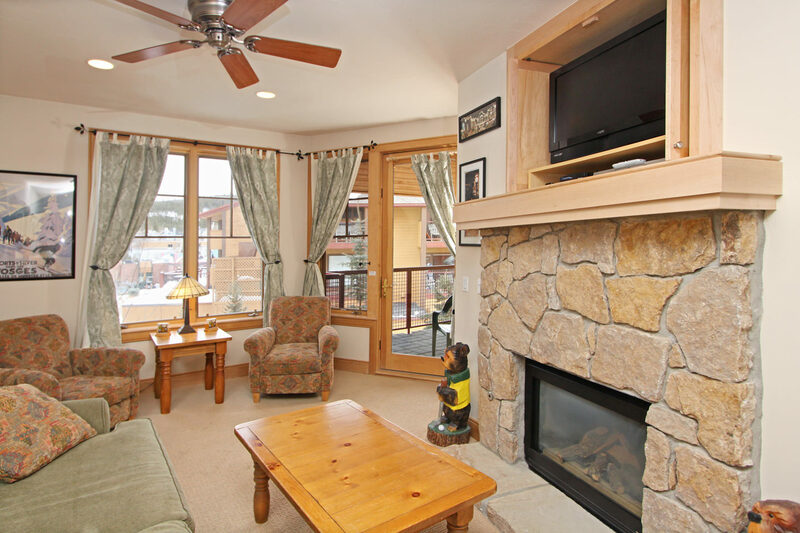 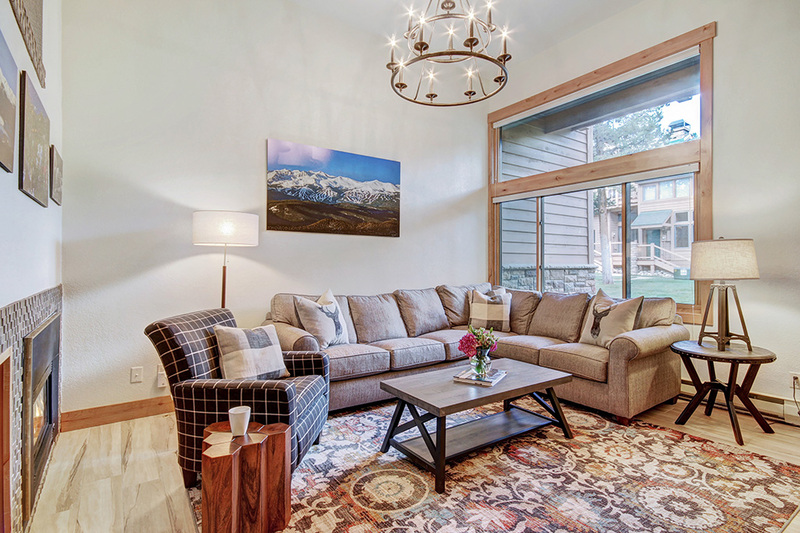 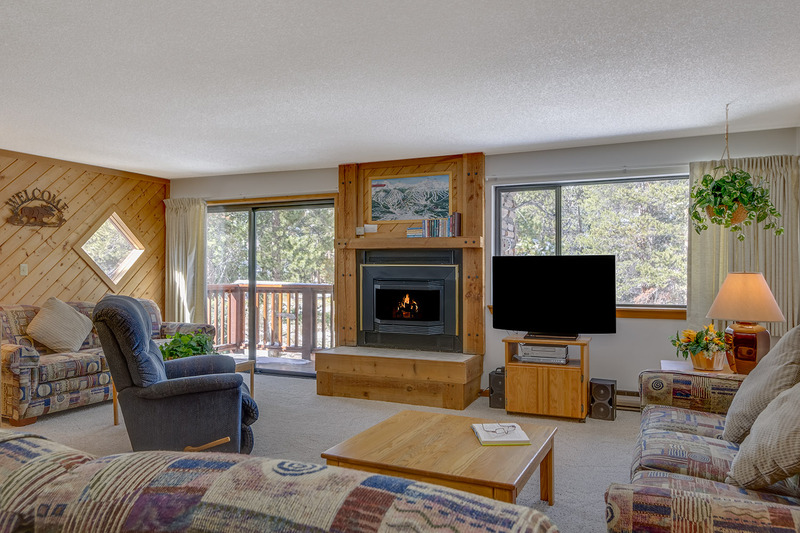 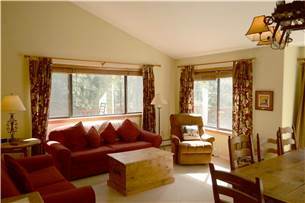 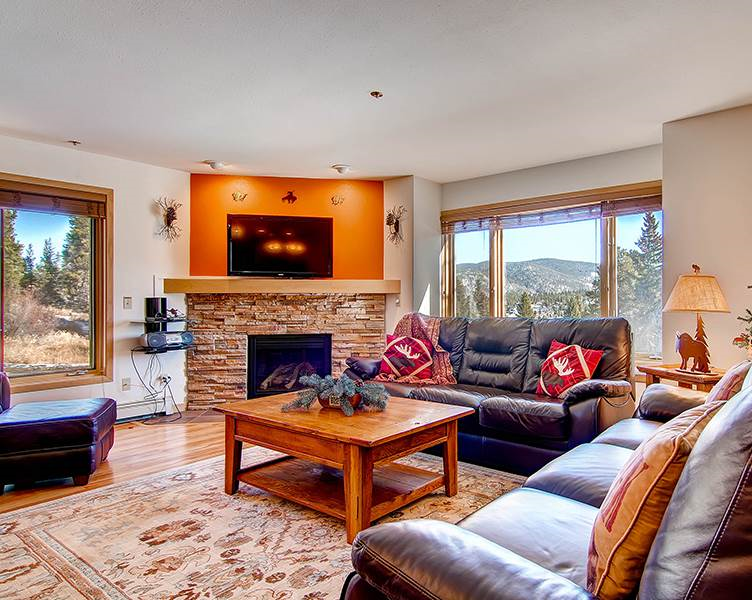 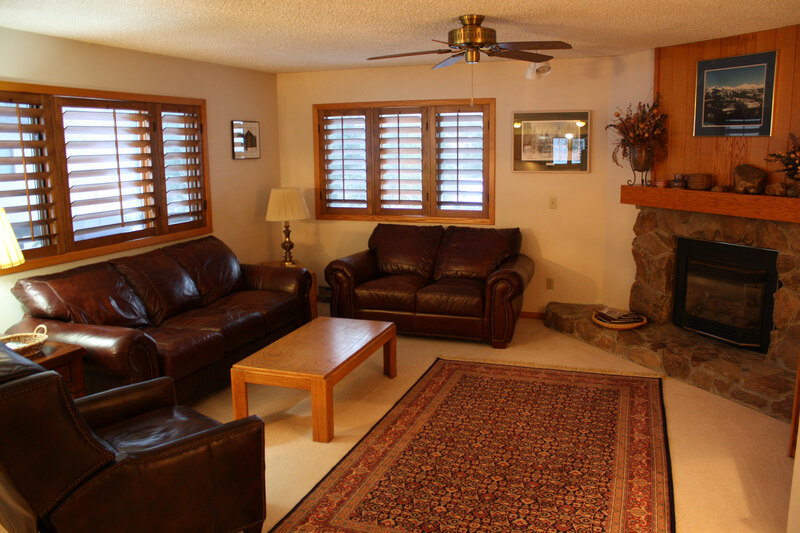 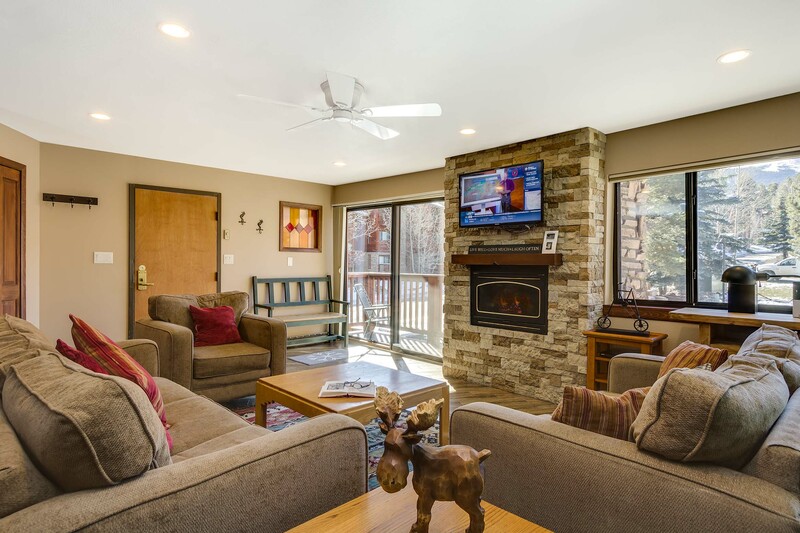 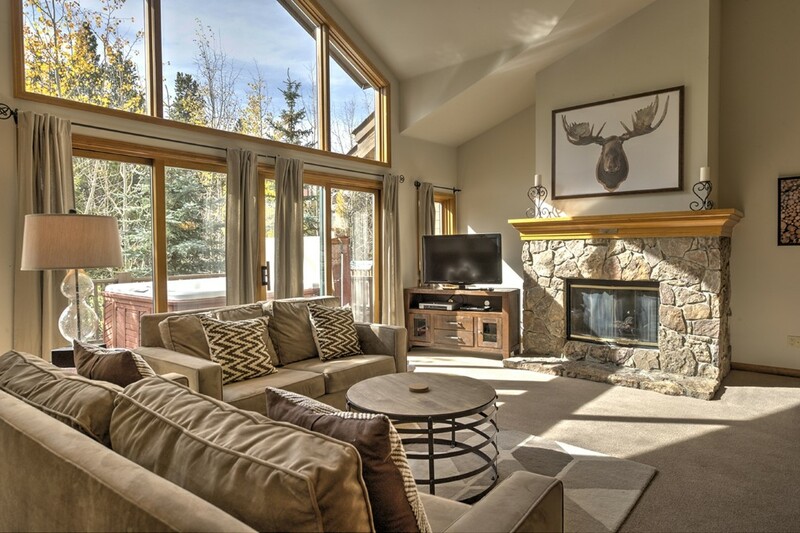 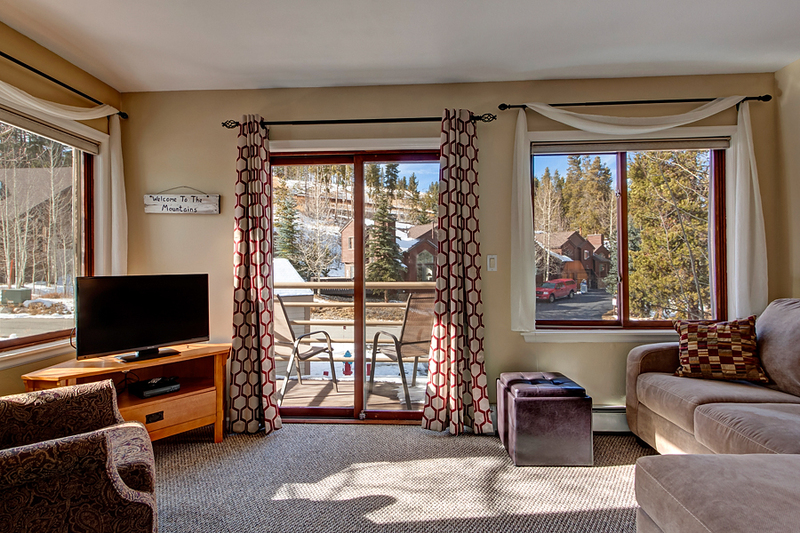 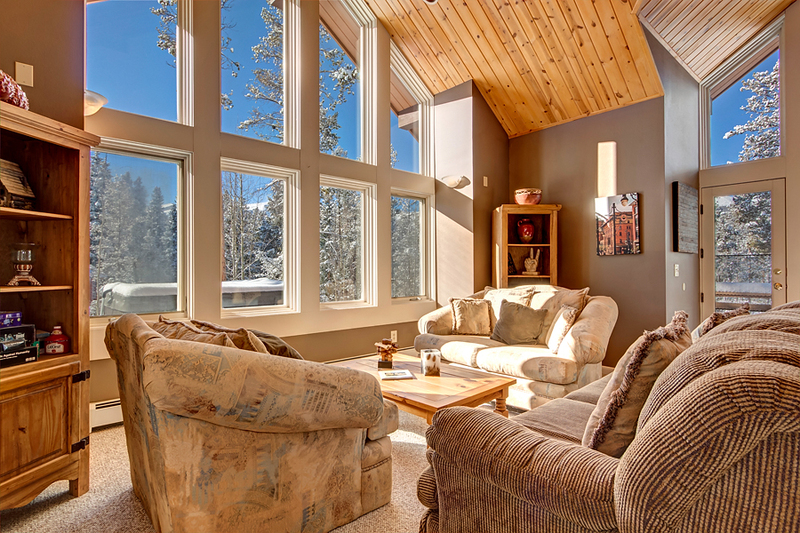 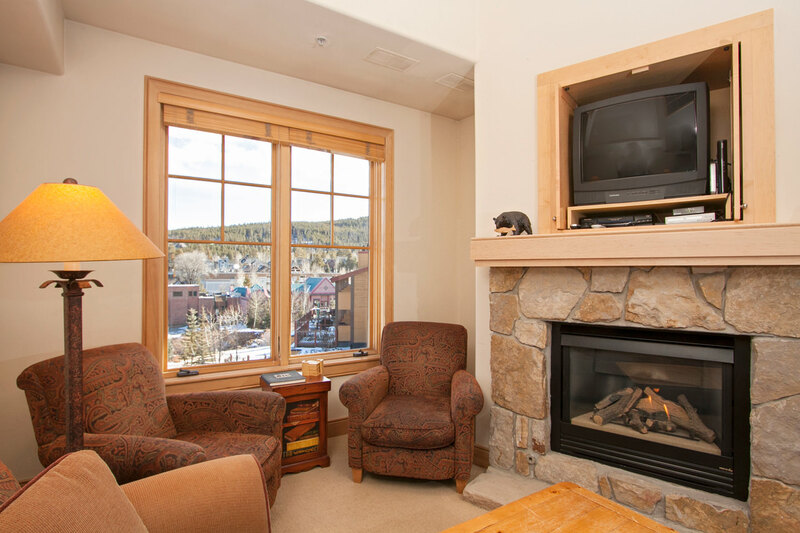 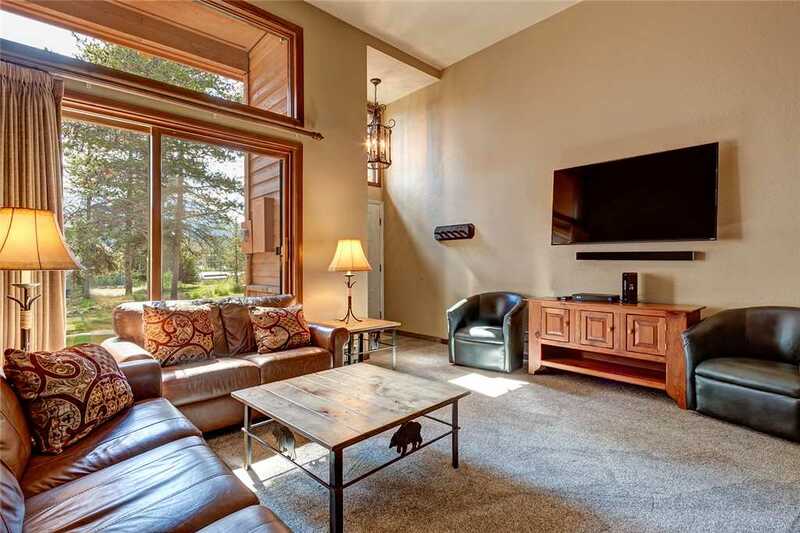 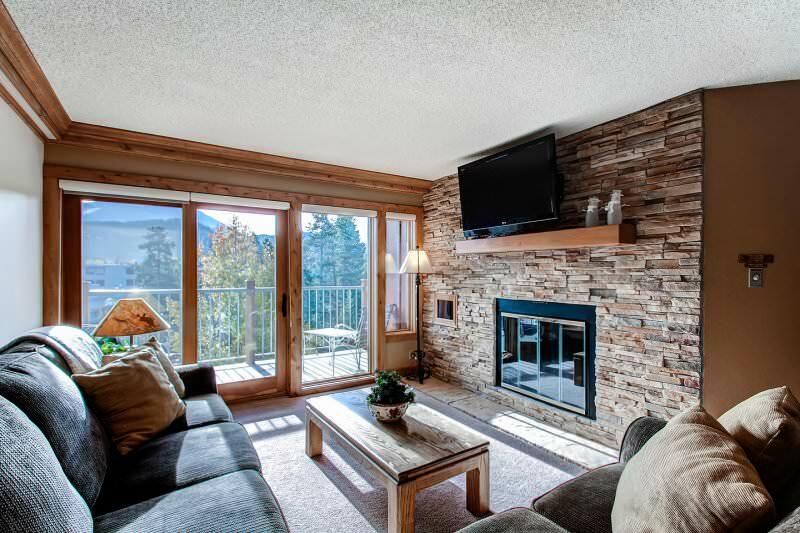 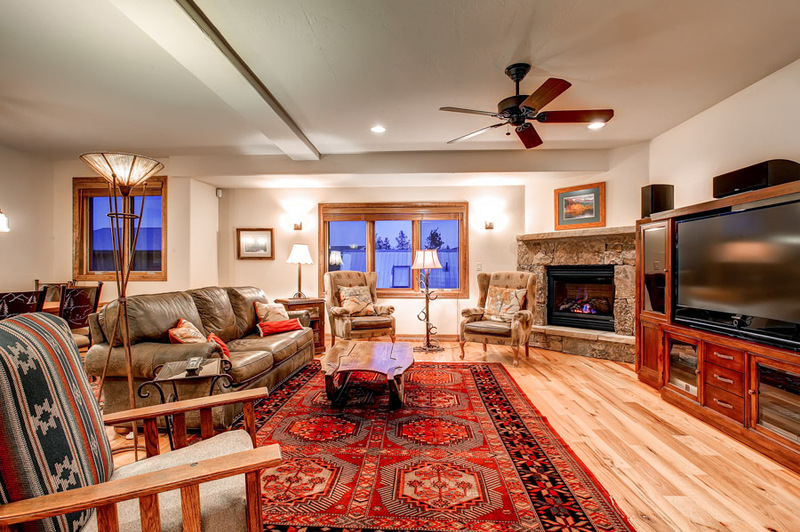 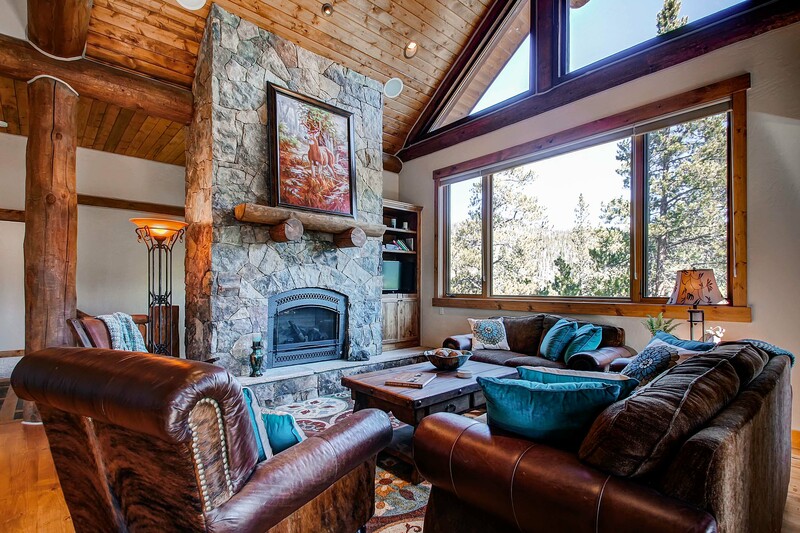 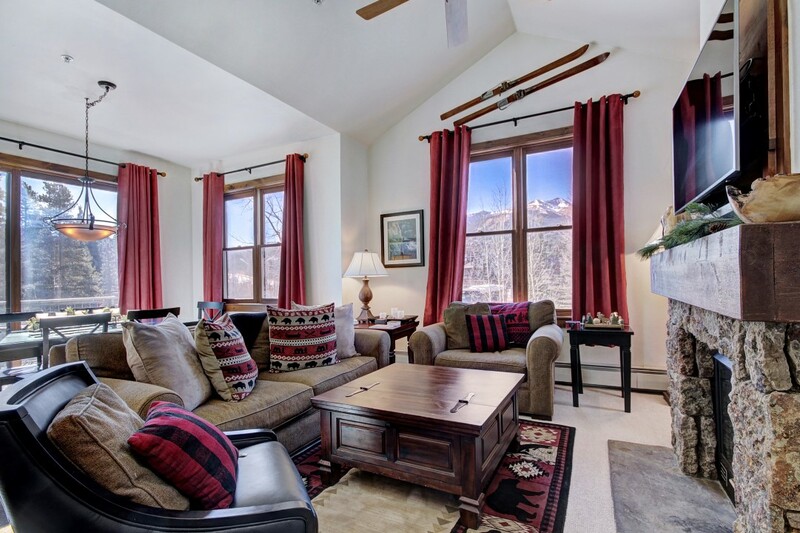 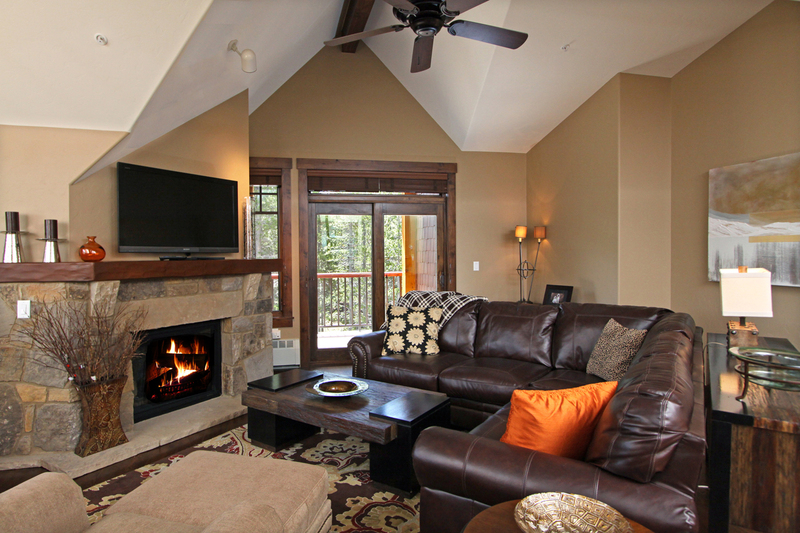 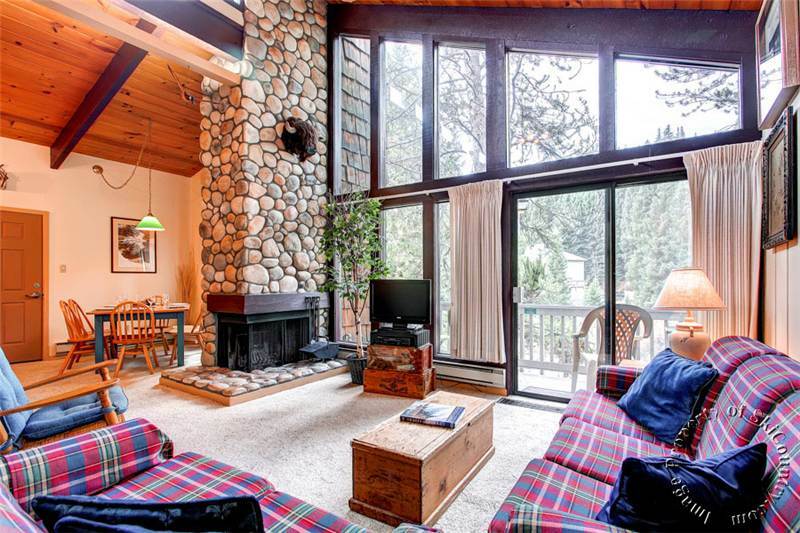 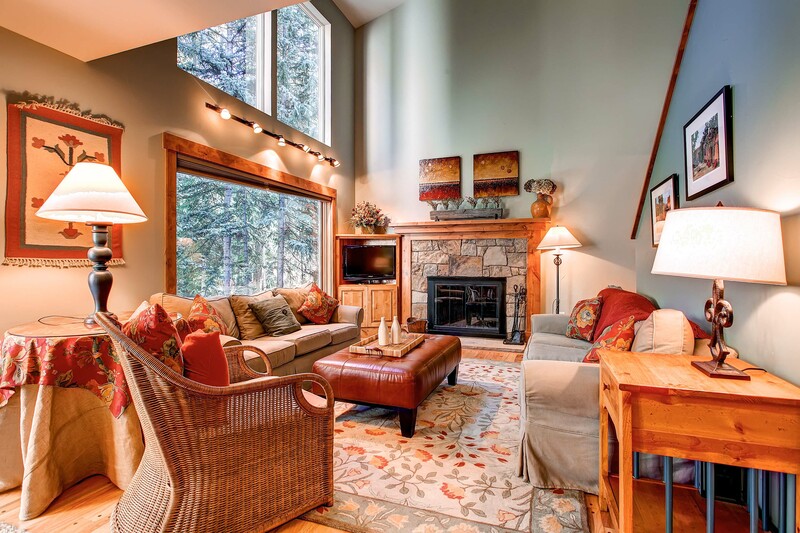 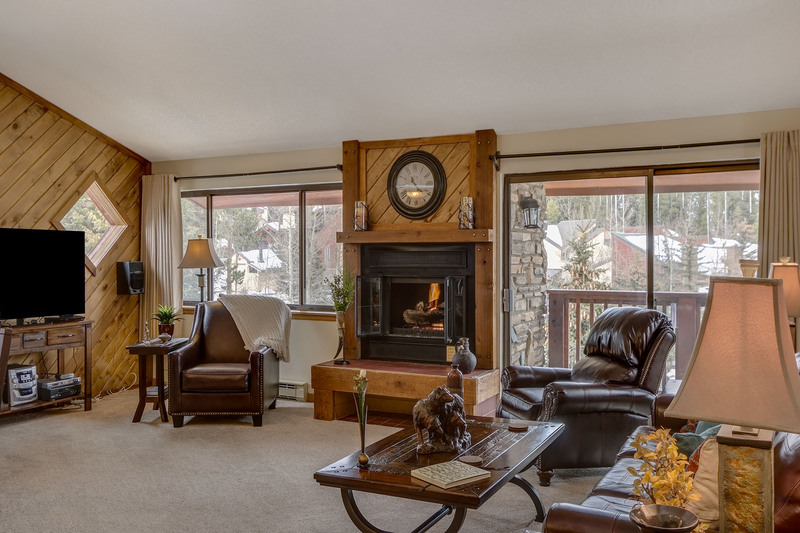 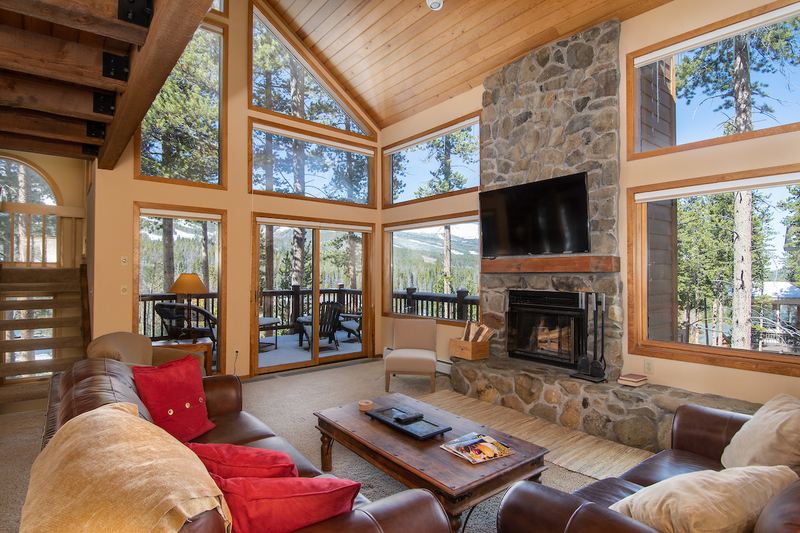 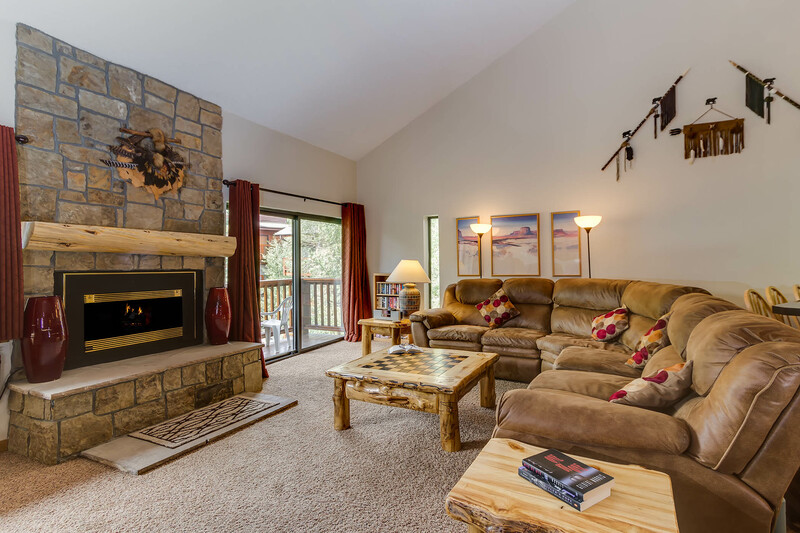 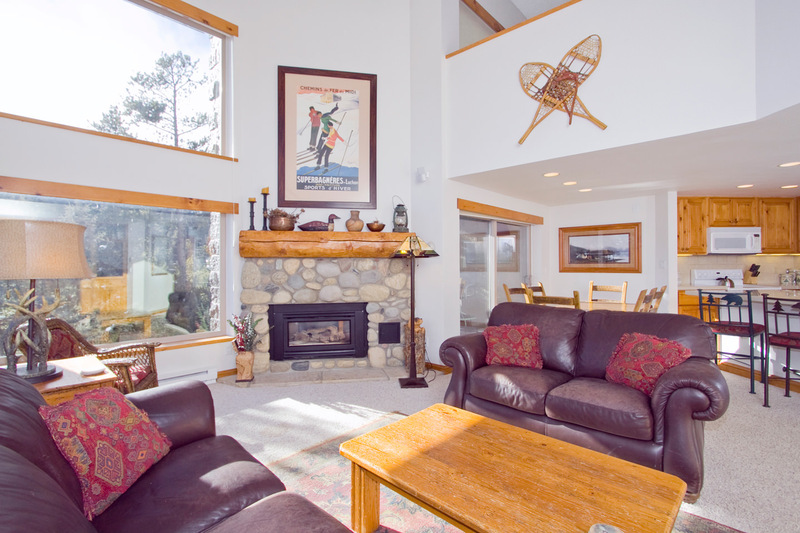 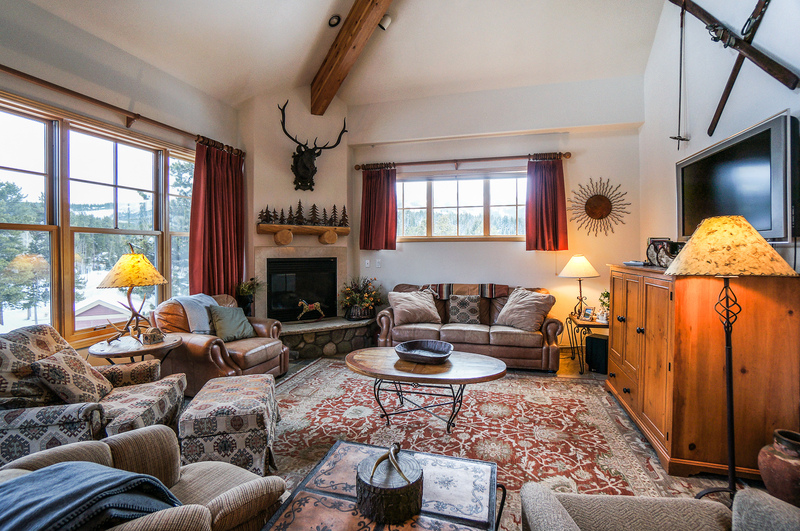 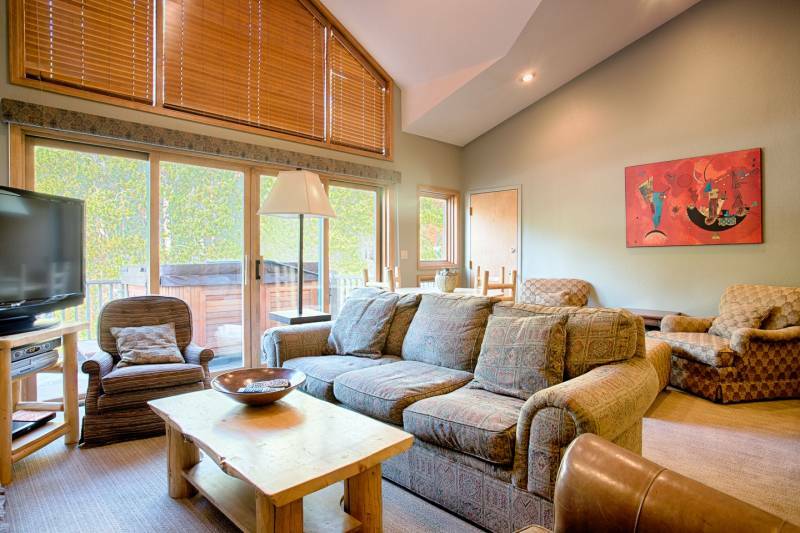 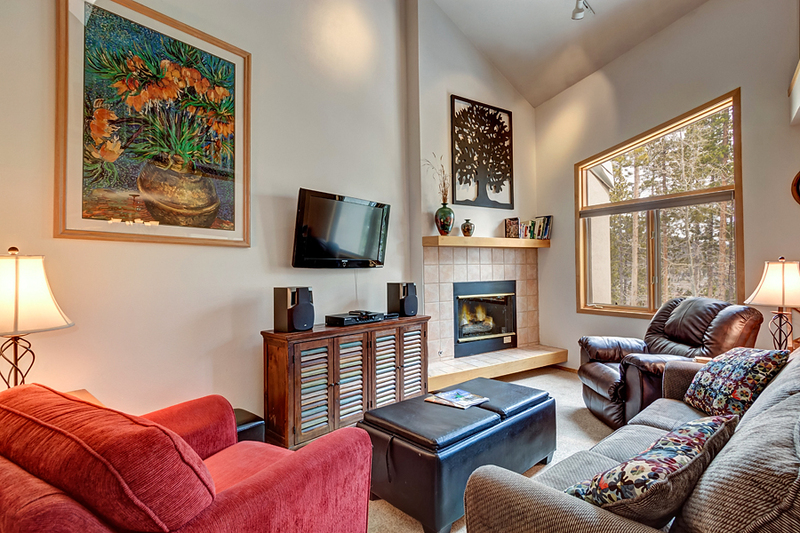 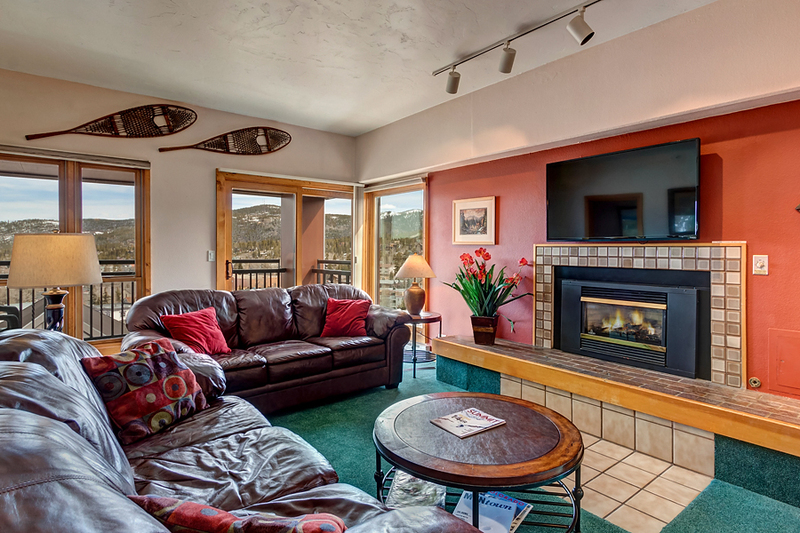 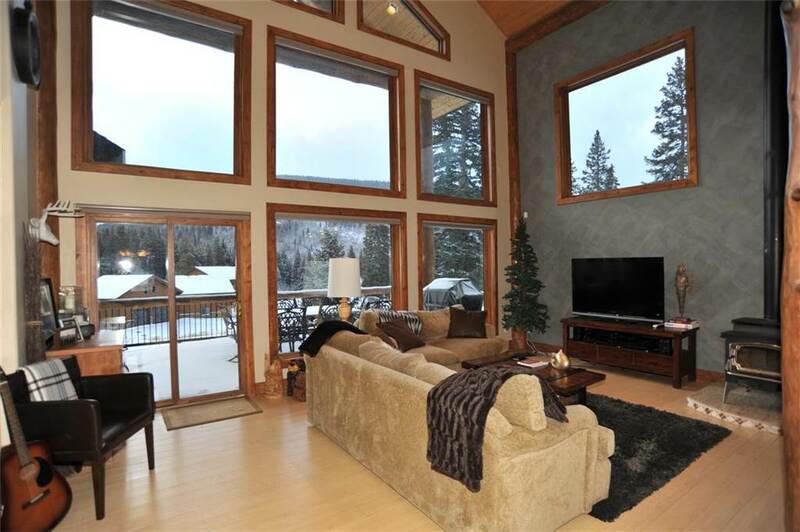 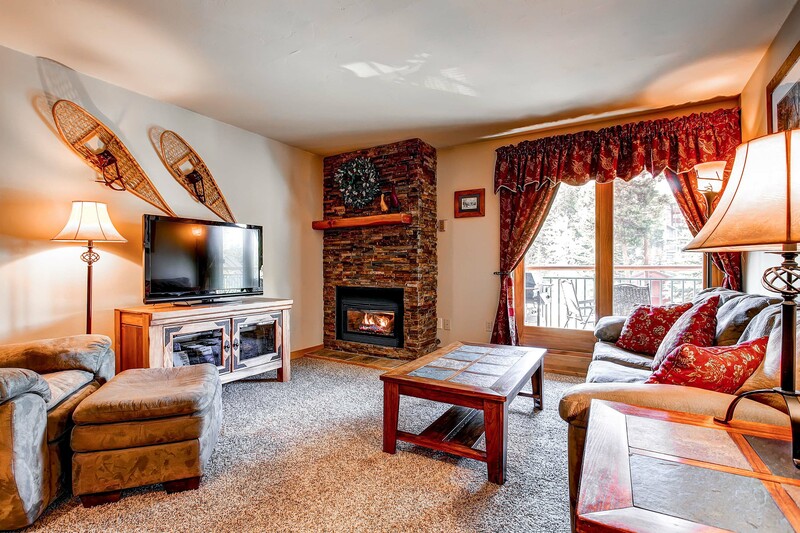 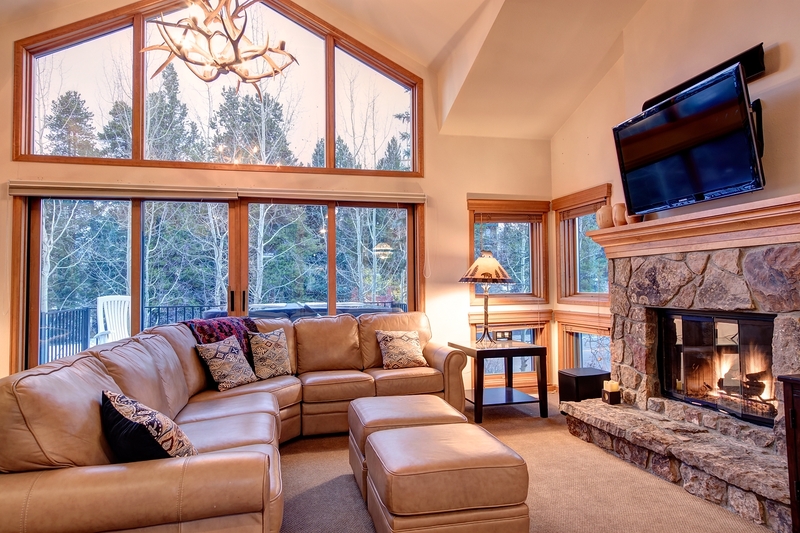 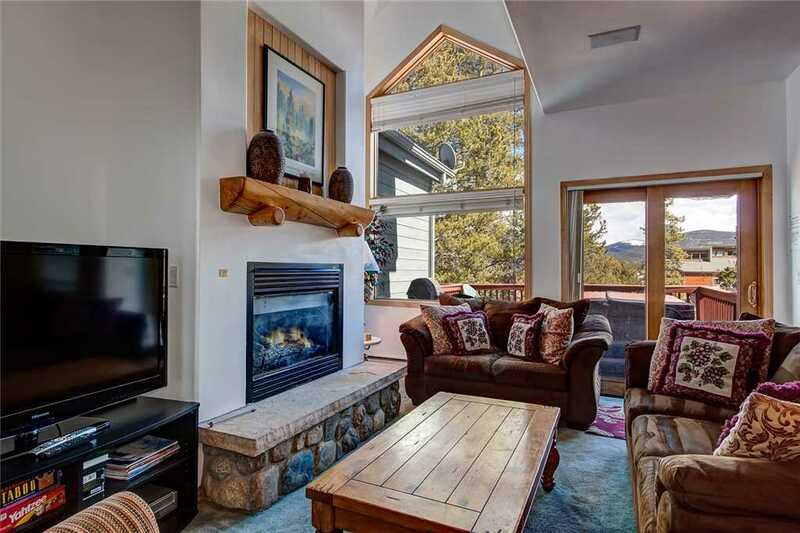 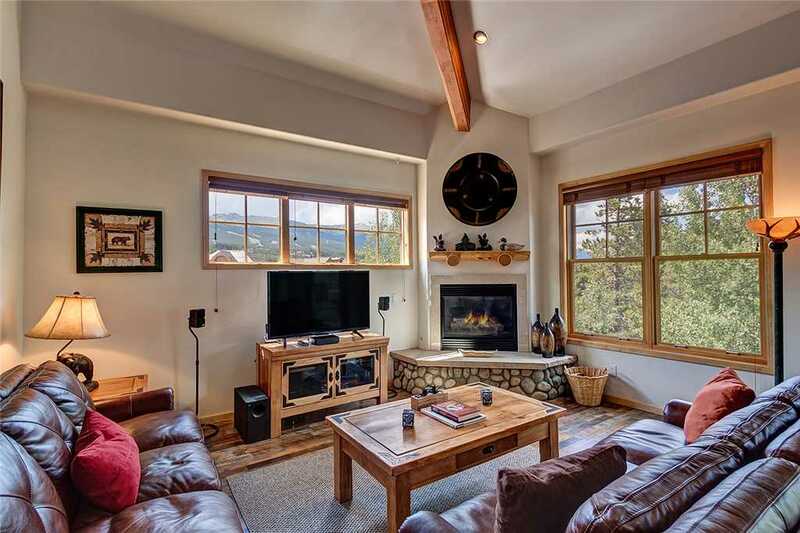 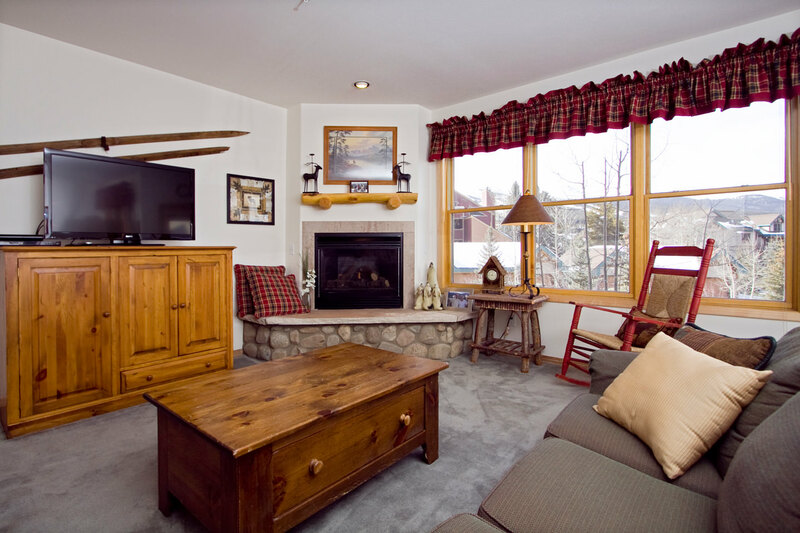 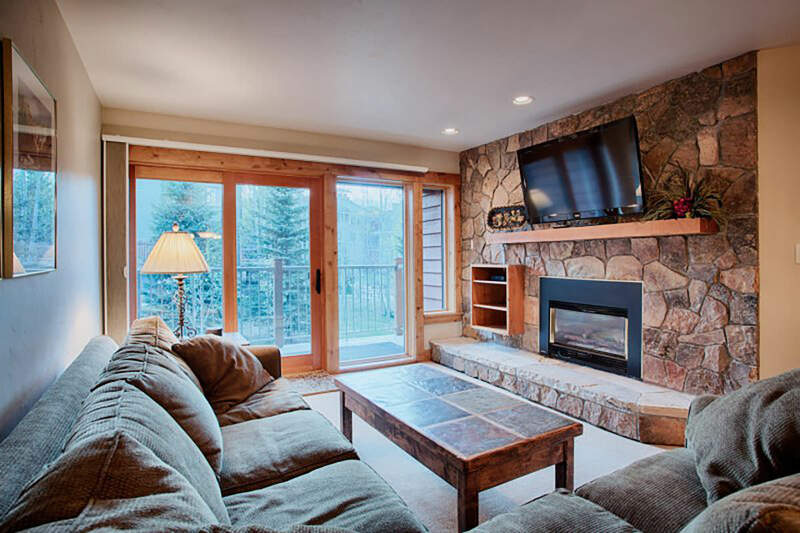 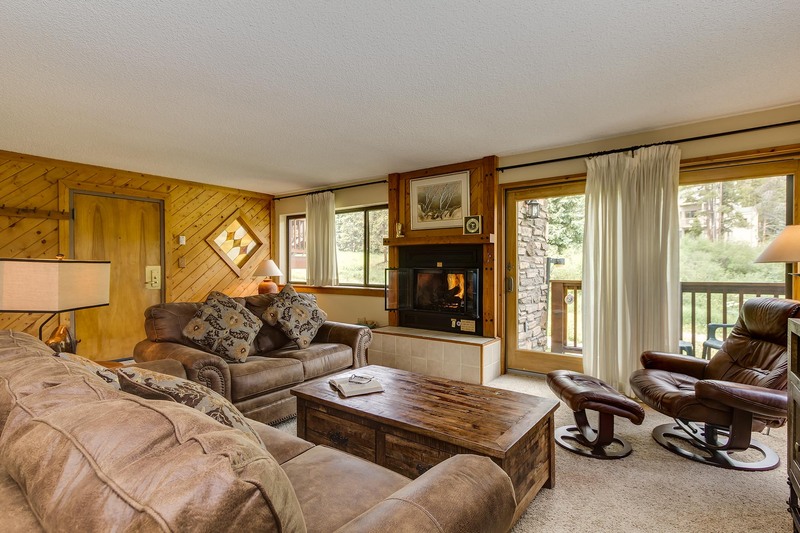 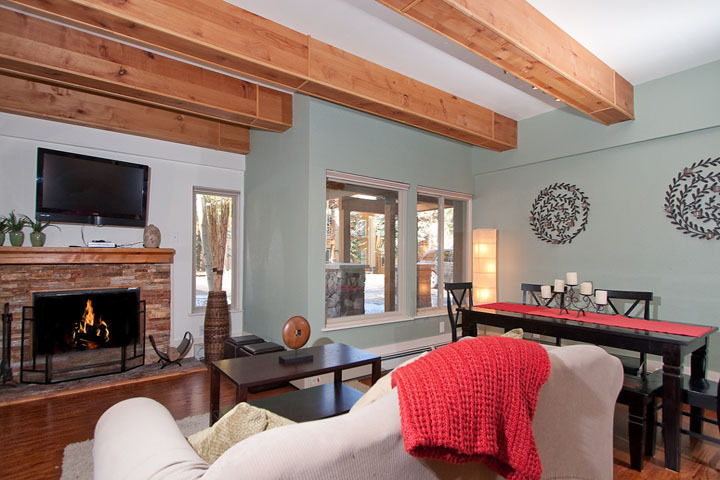 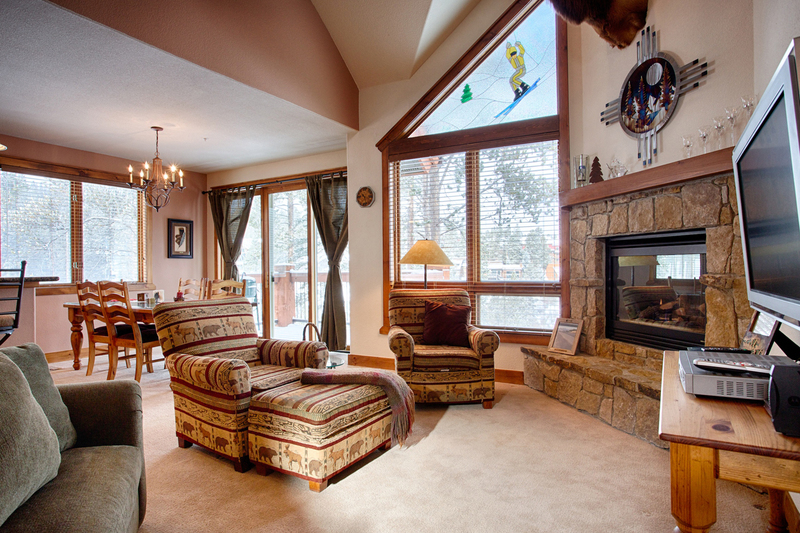 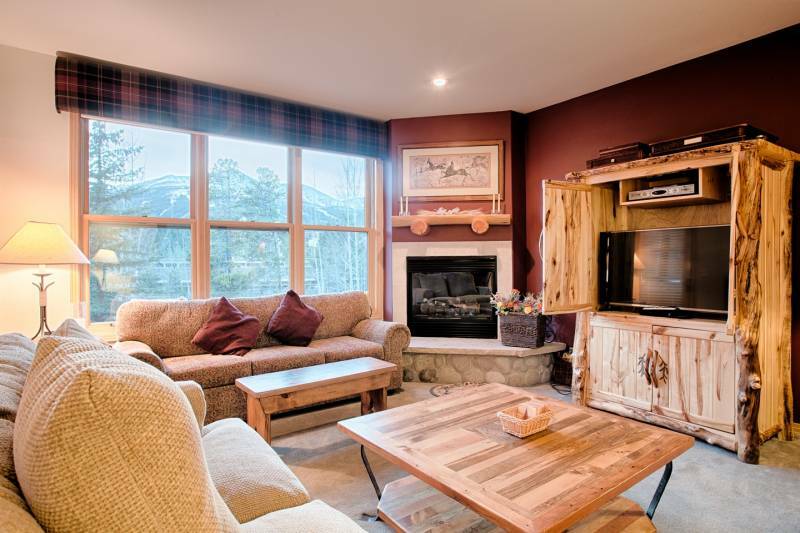 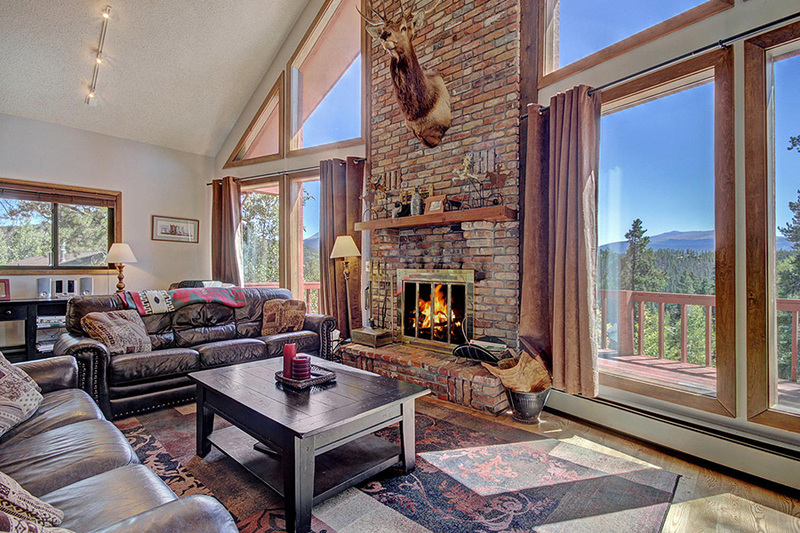 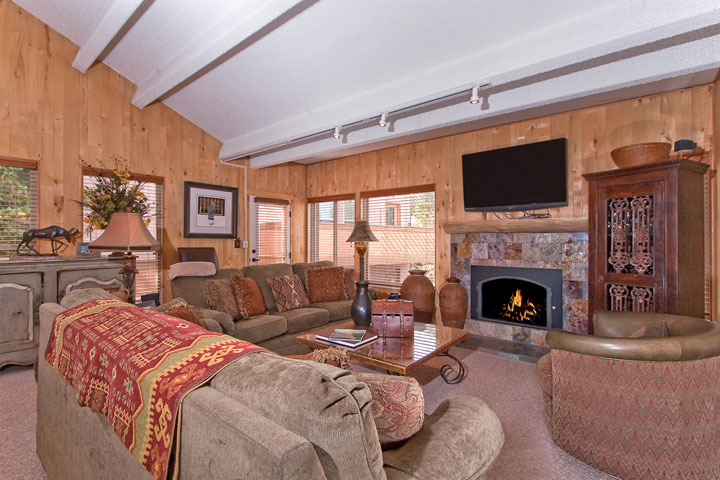 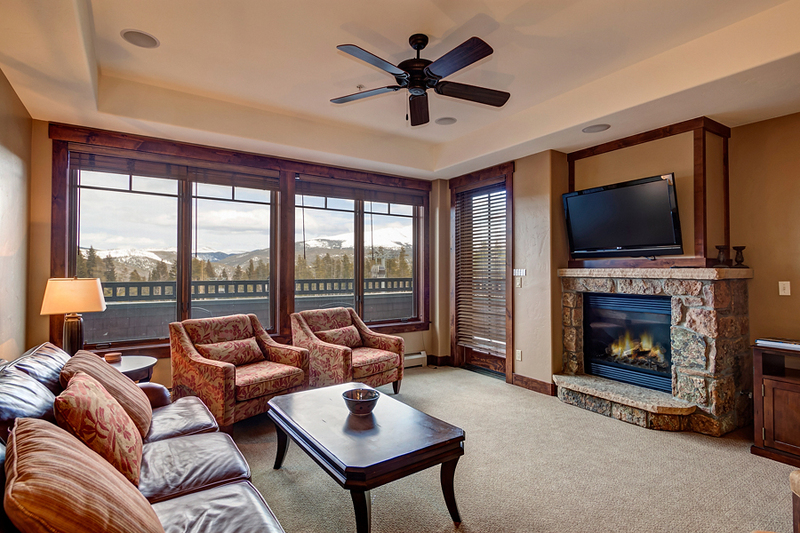 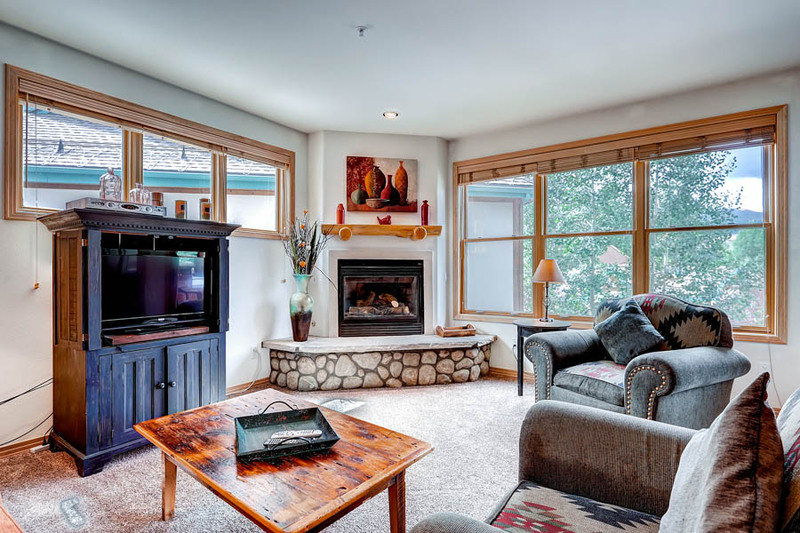 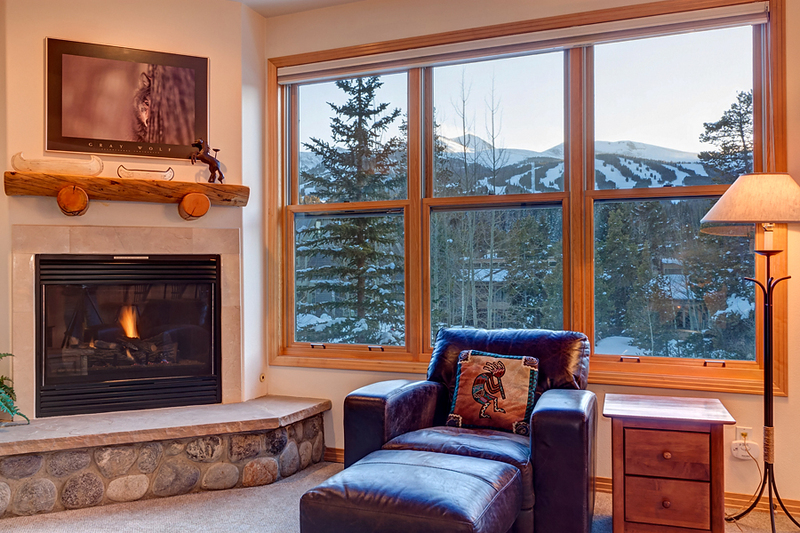 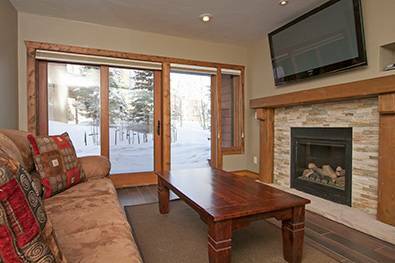 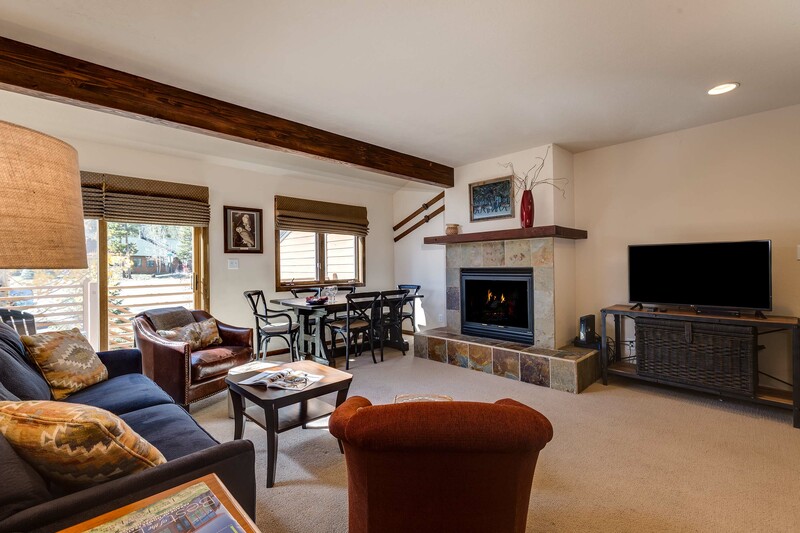 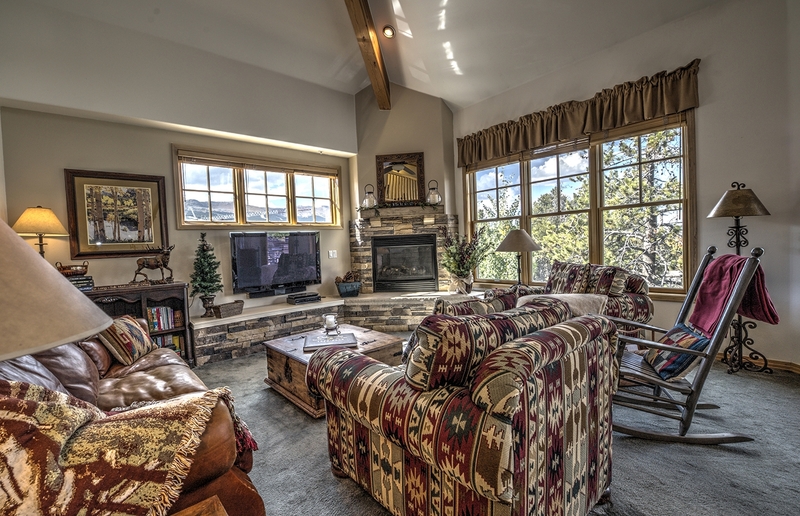 Thre is a great view of Peak 9 from the living room windows and an unobstructed view of Baldy Mountain in the Master bedroom. 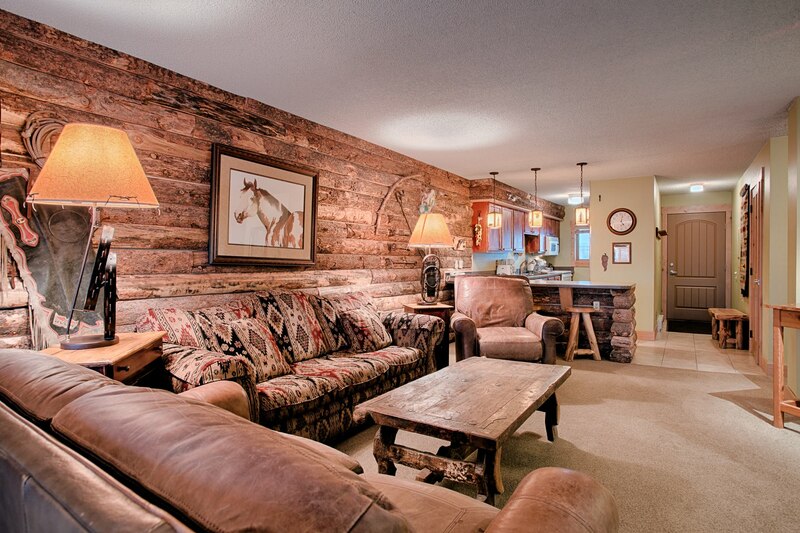 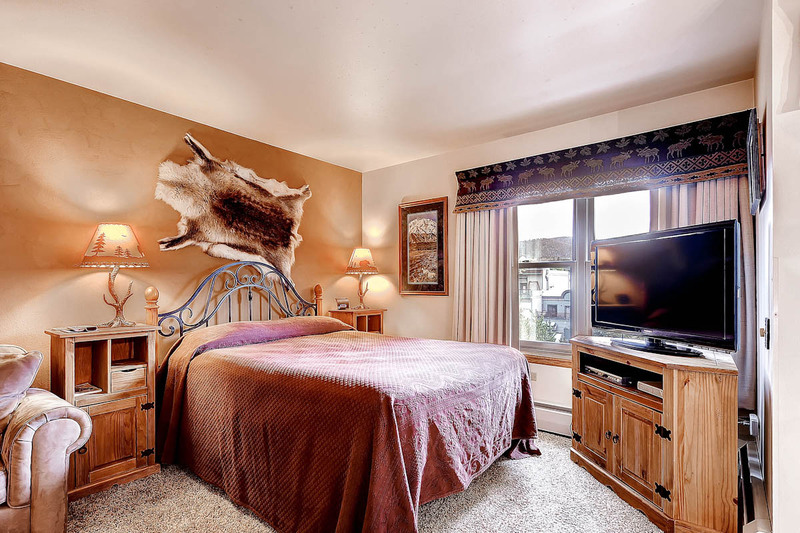 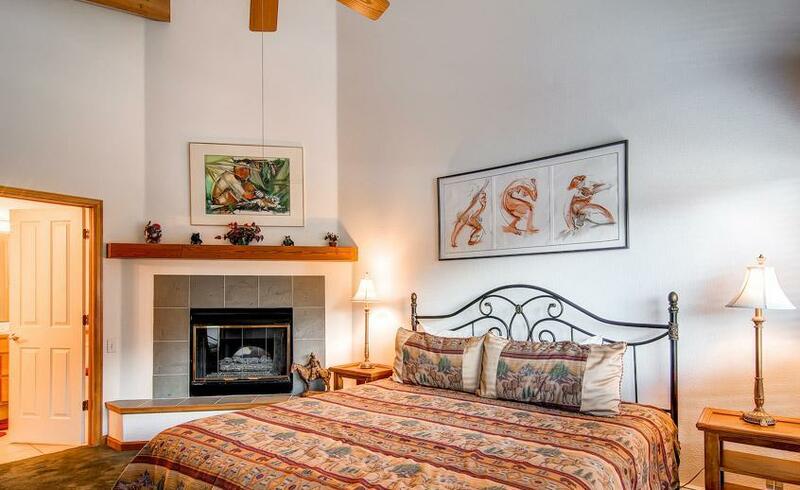 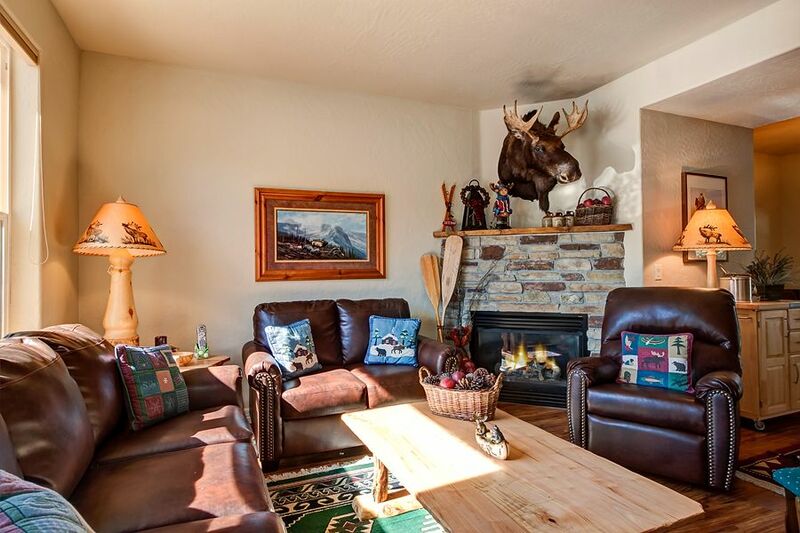 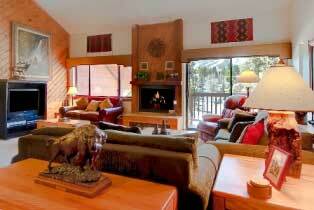 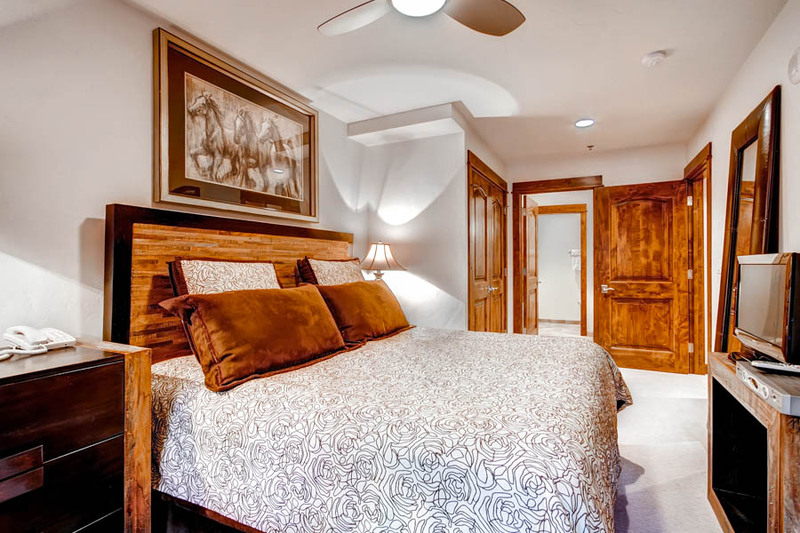 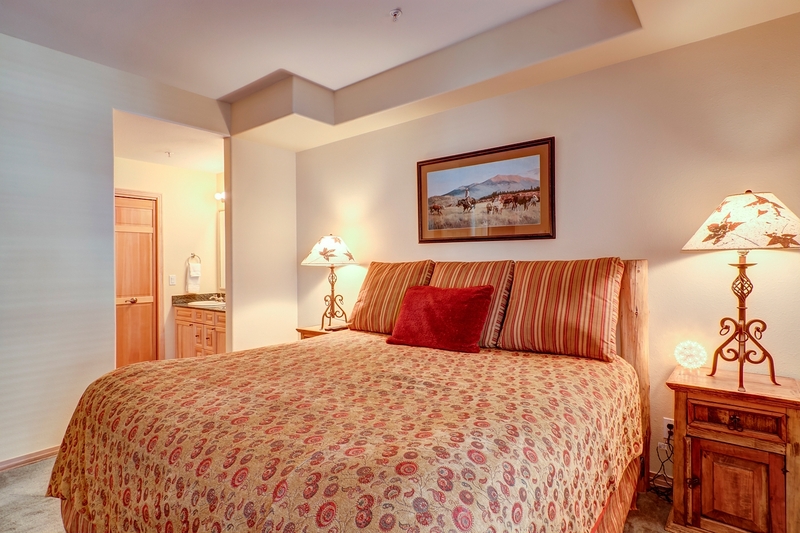 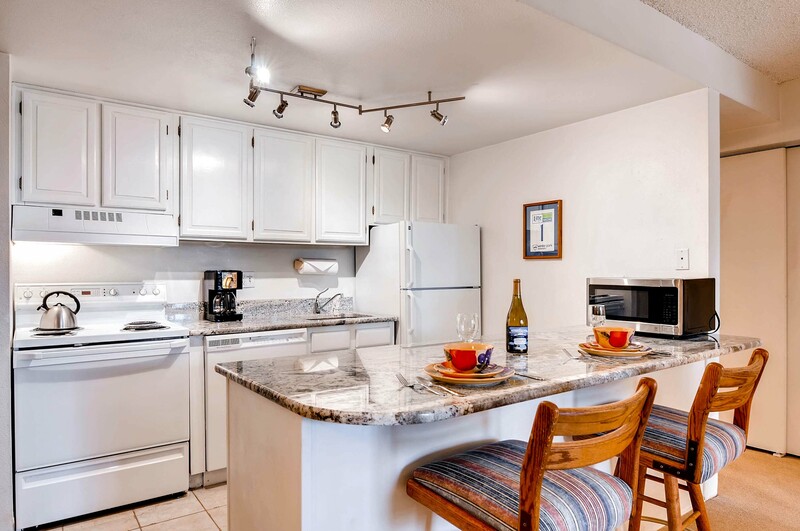 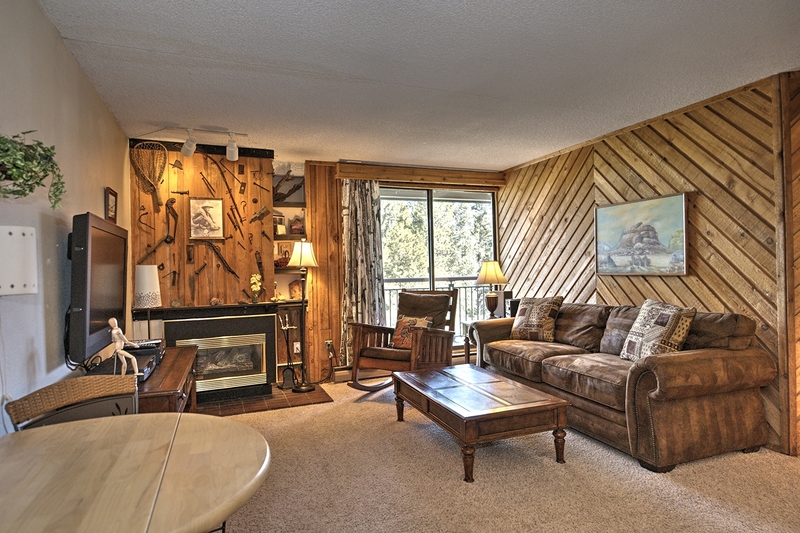 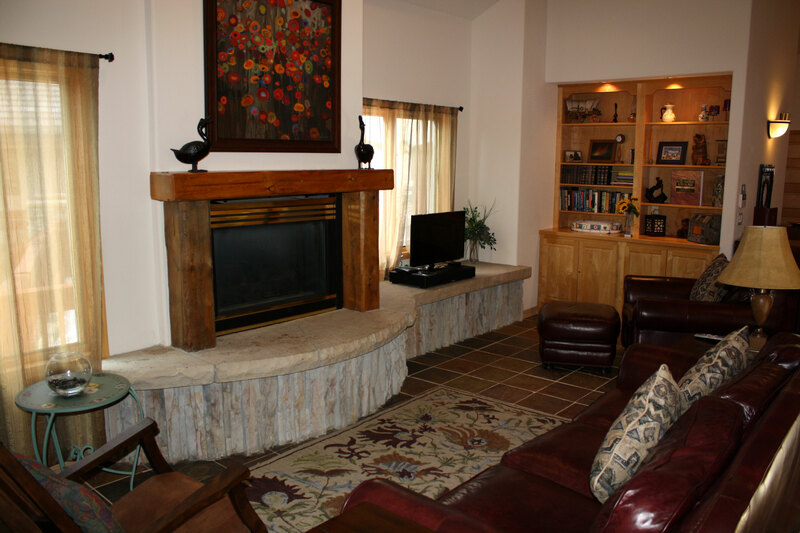 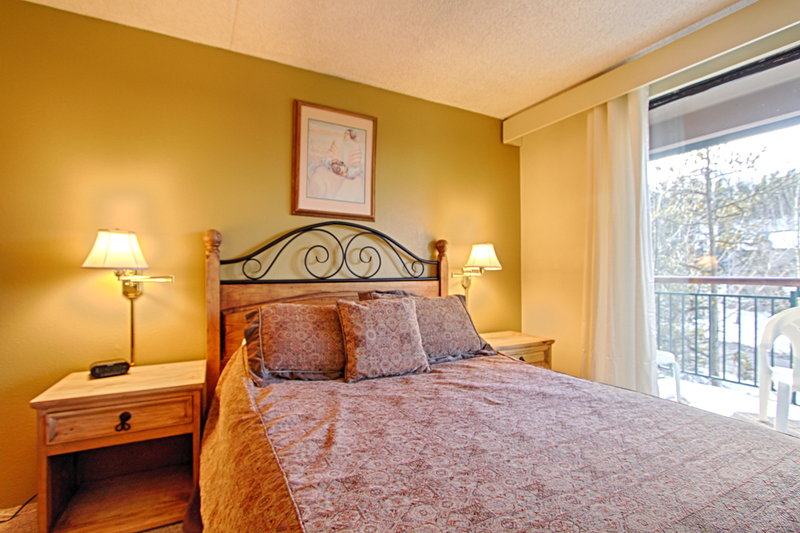 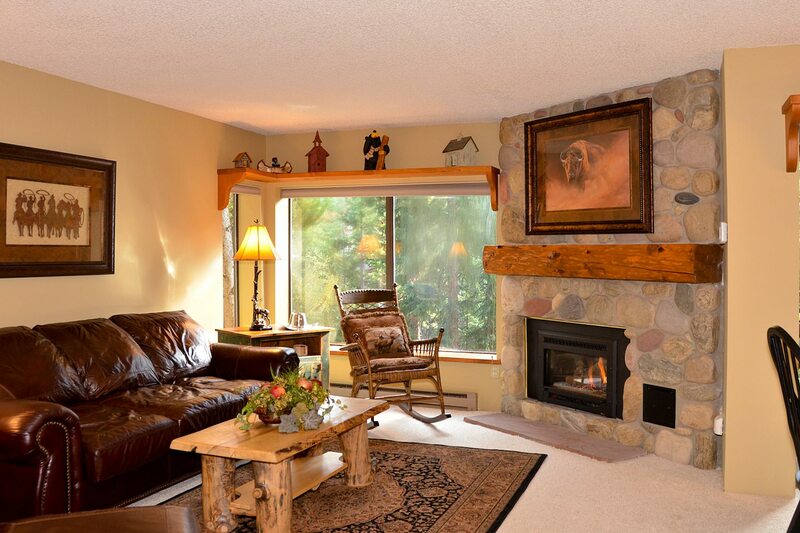 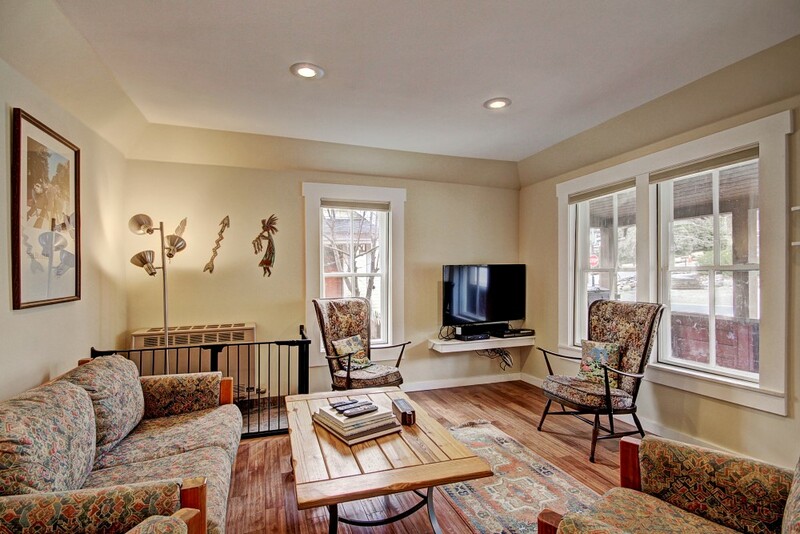 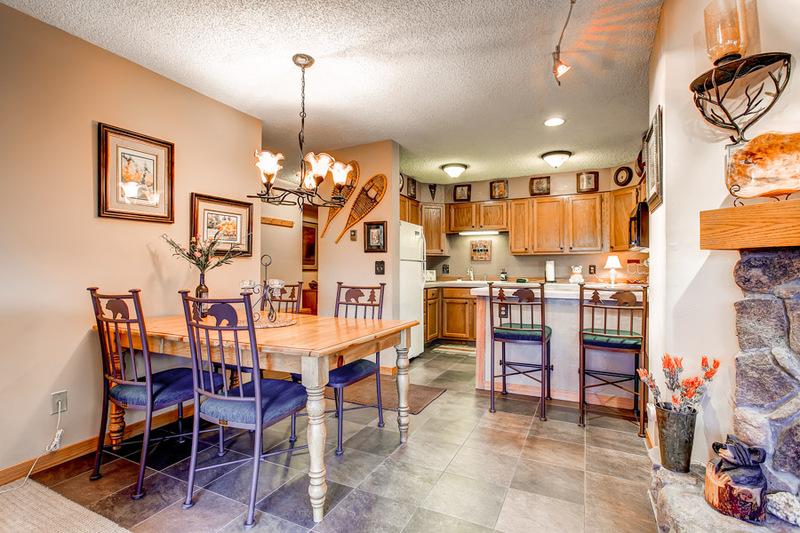 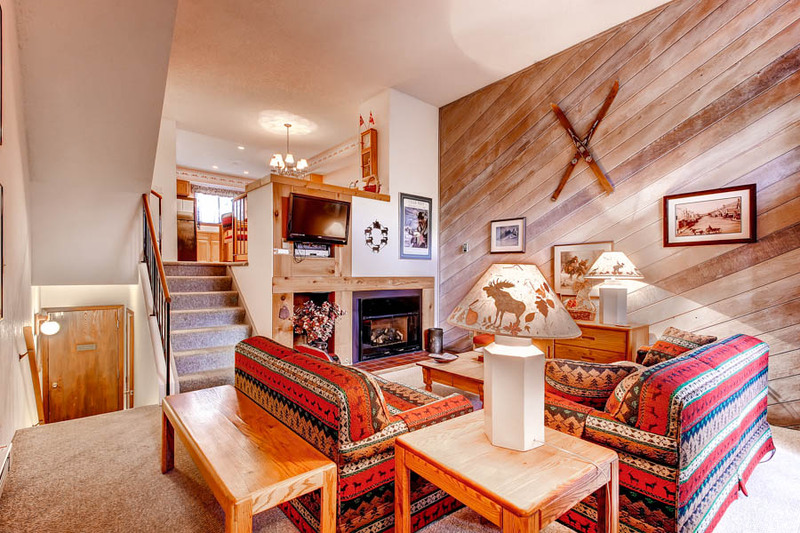 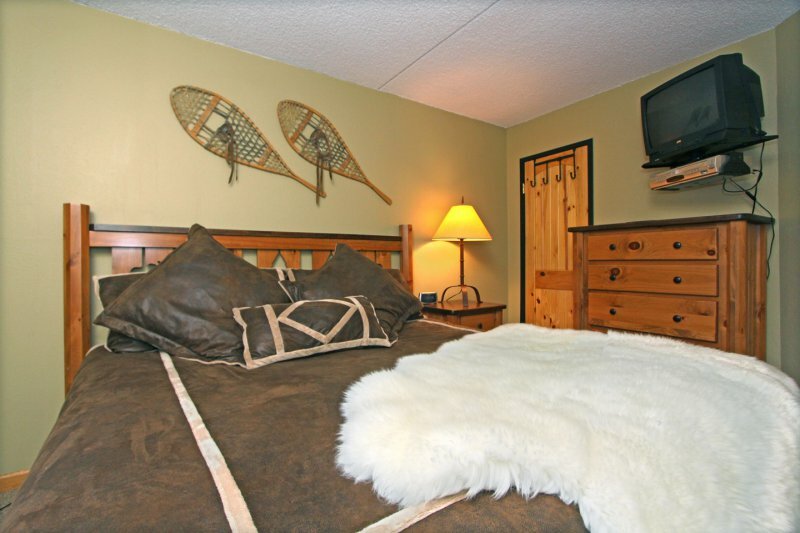 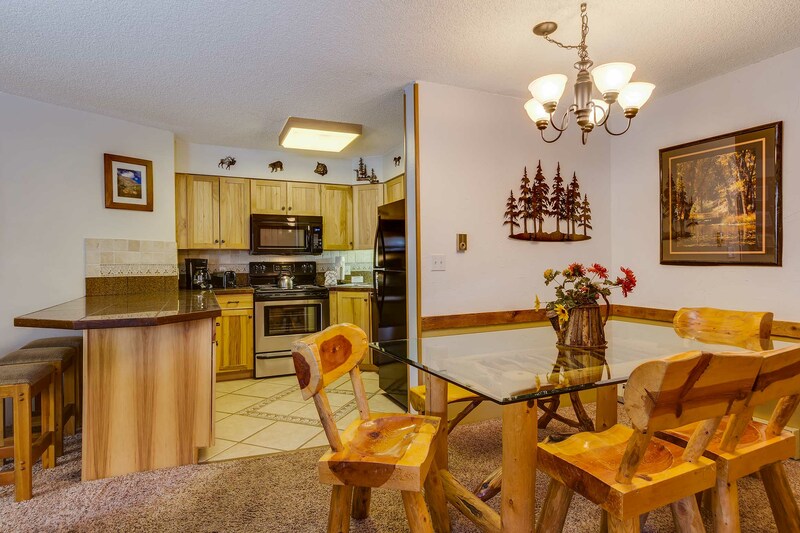 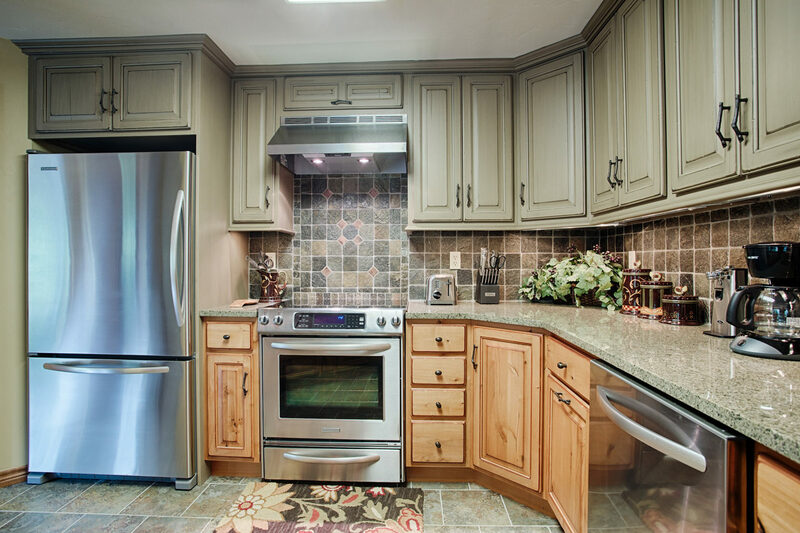 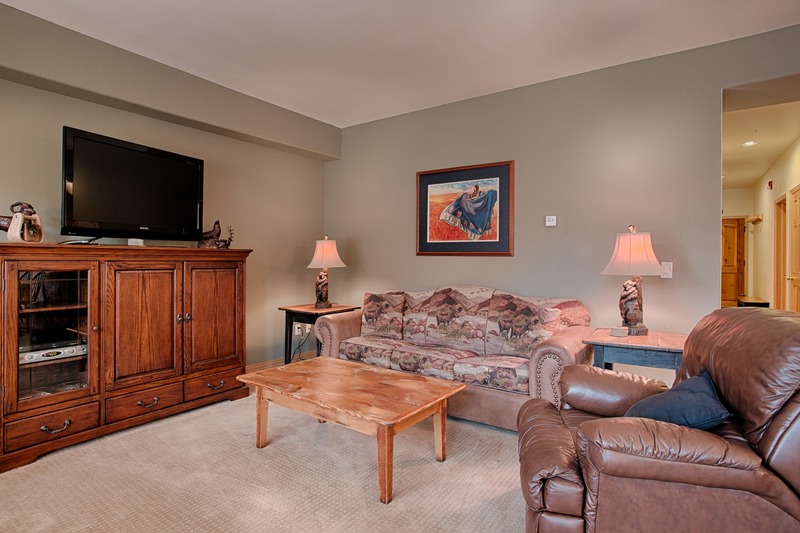 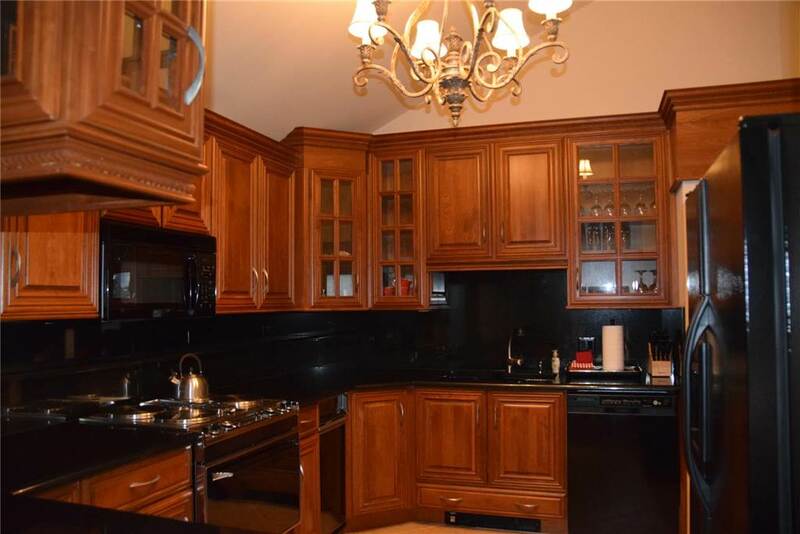 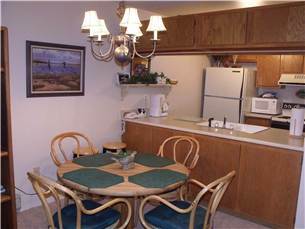 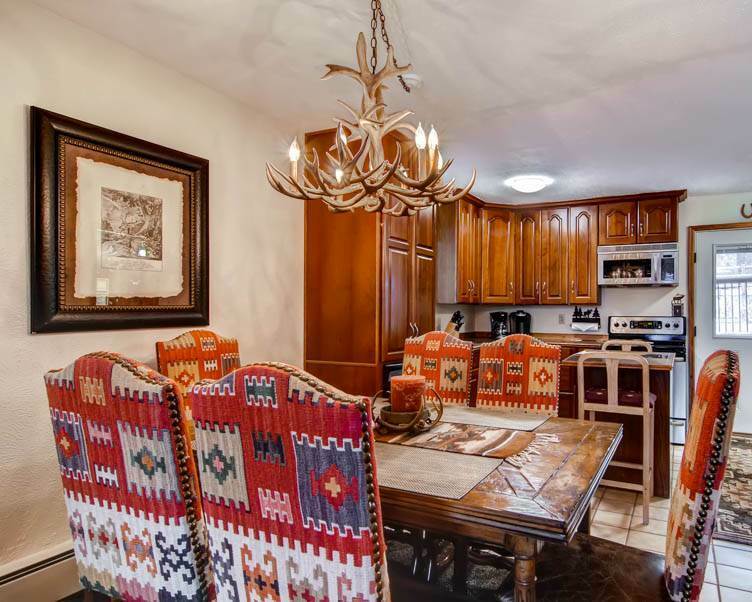 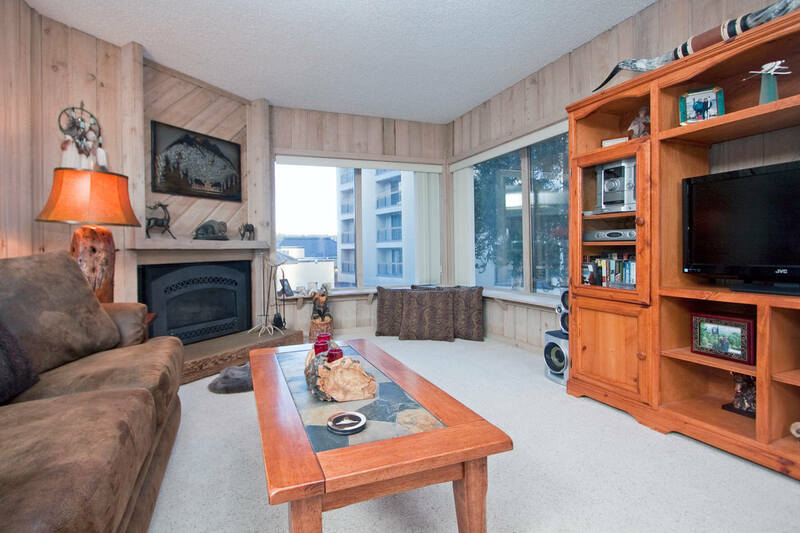 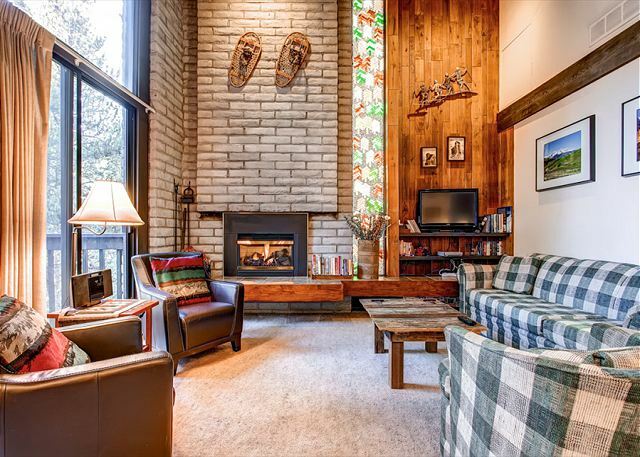 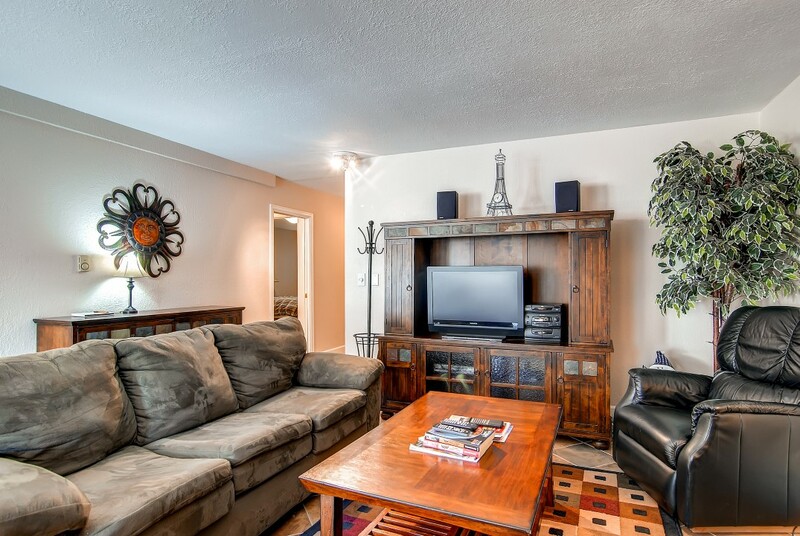 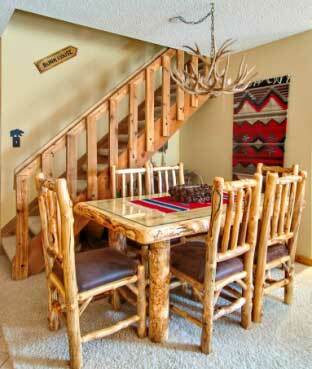 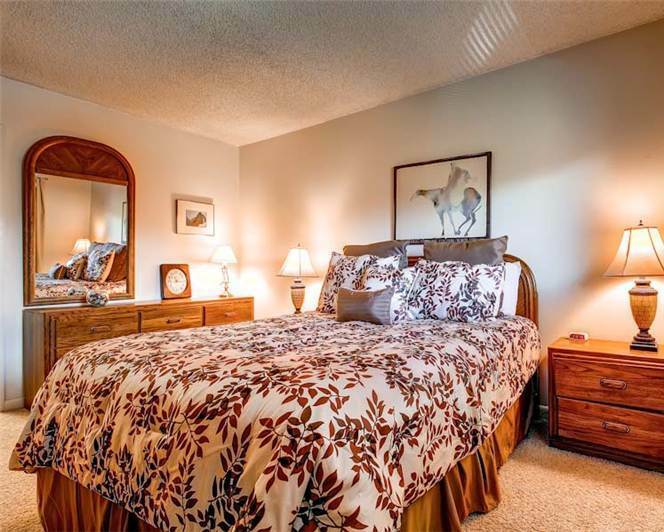 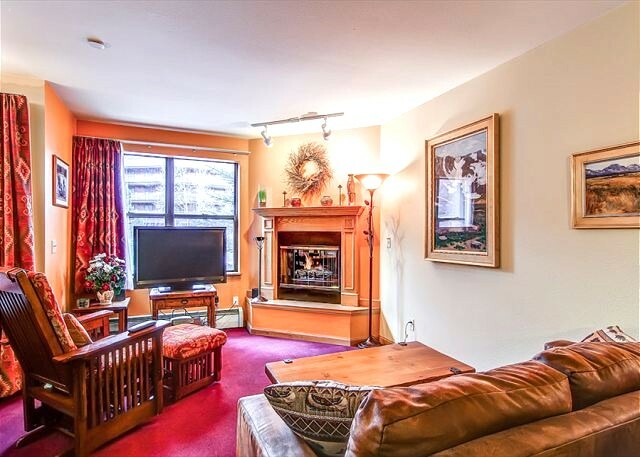 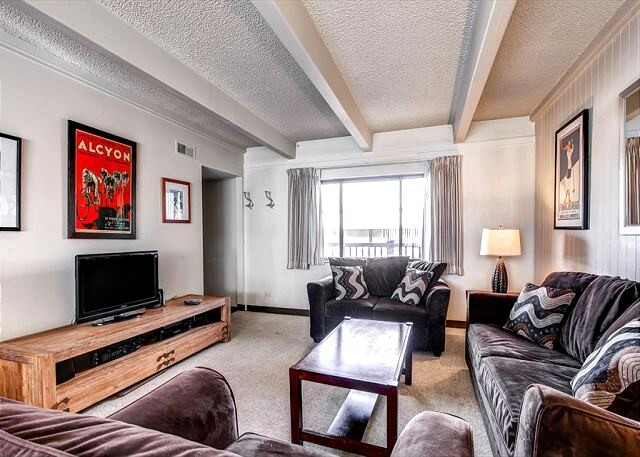 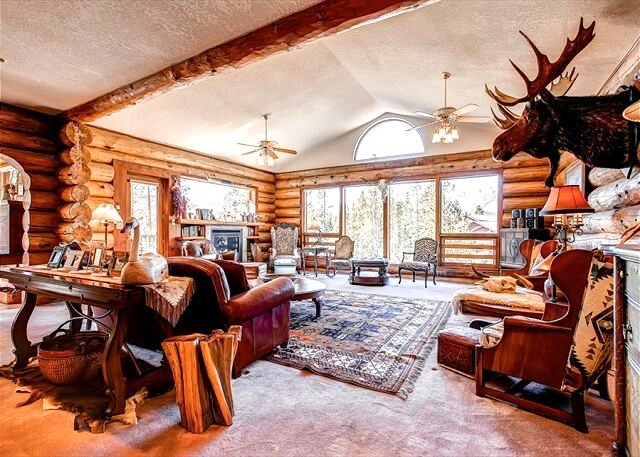 The condo has a western theme with original artwork and sculptures from the era. 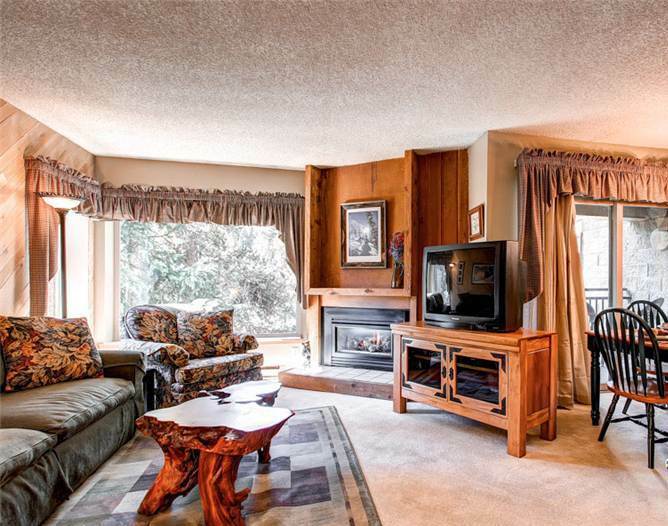 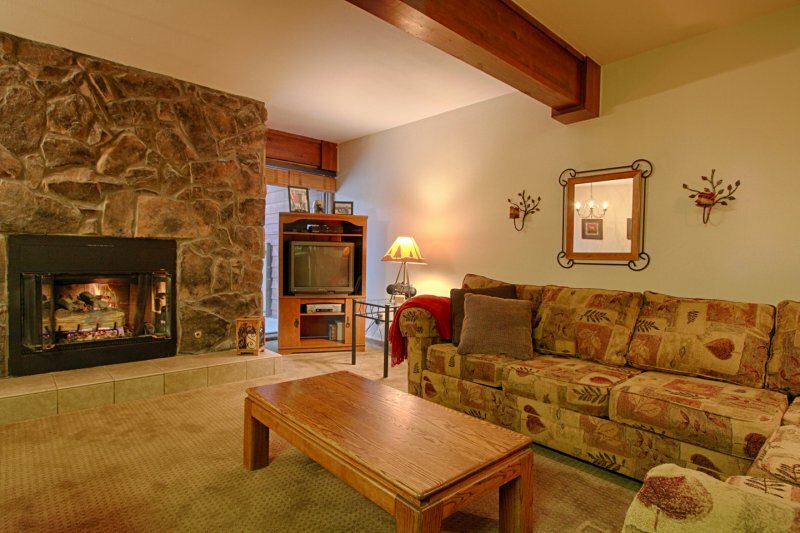 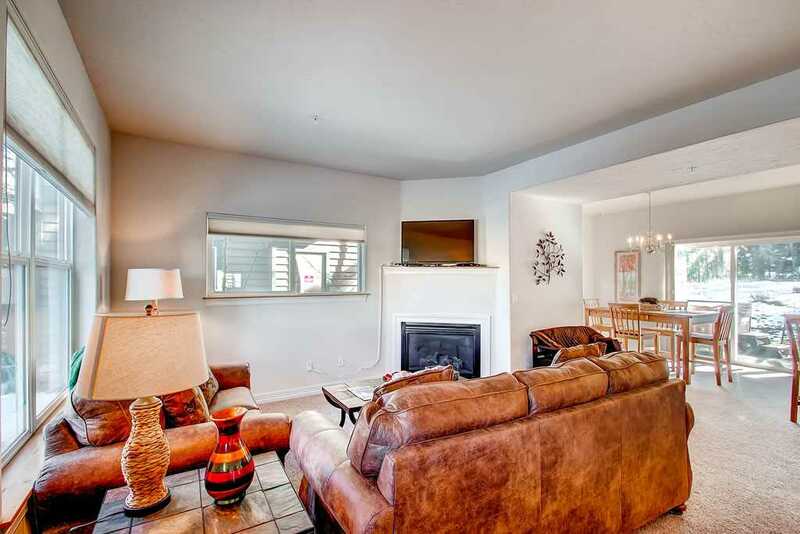 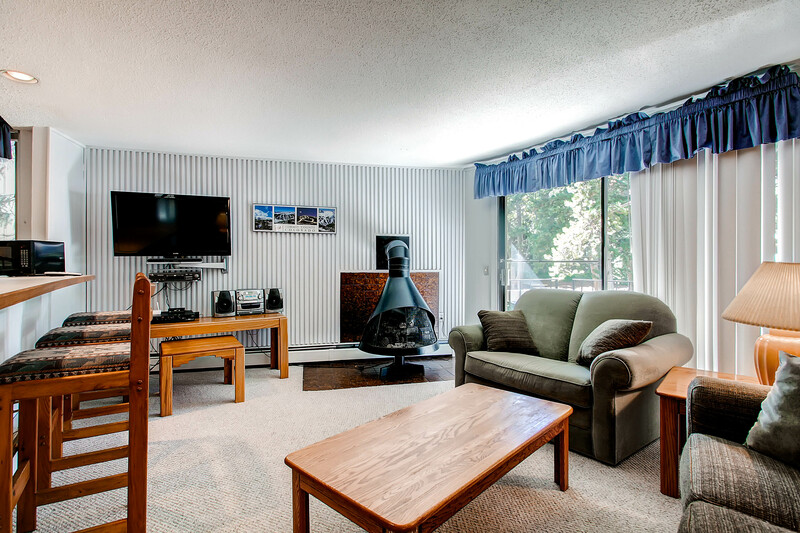 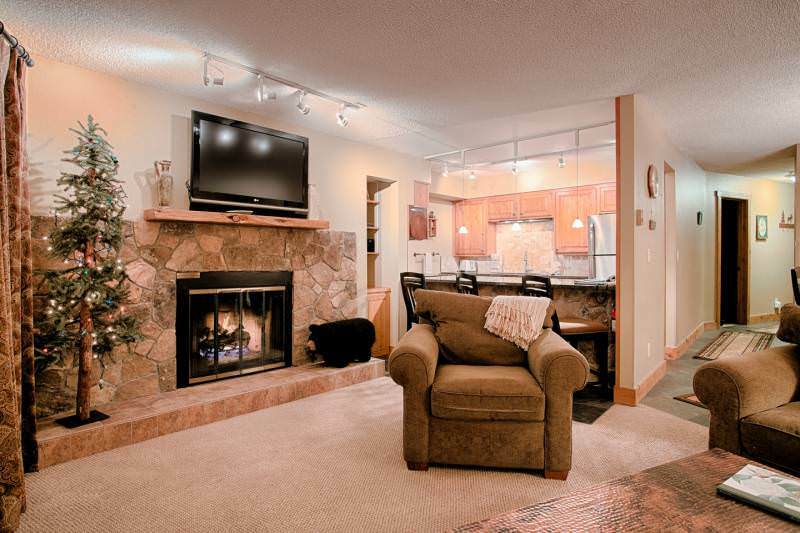 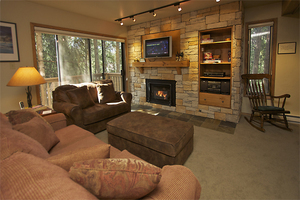 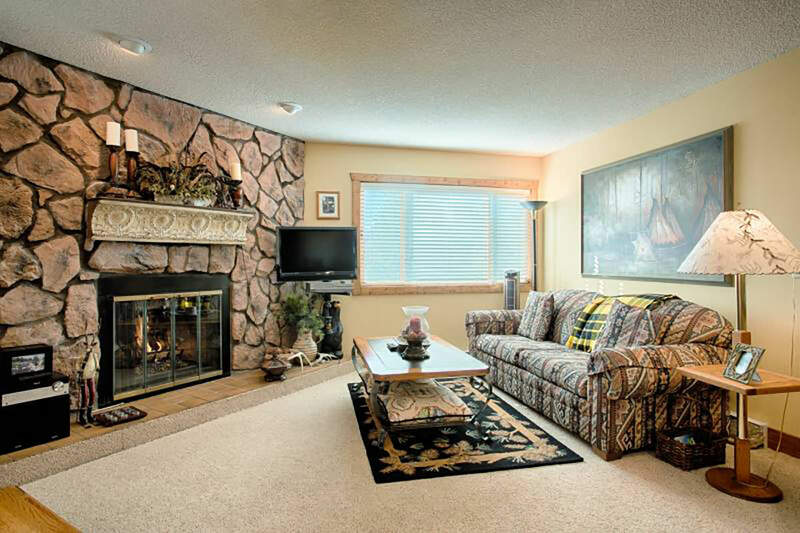 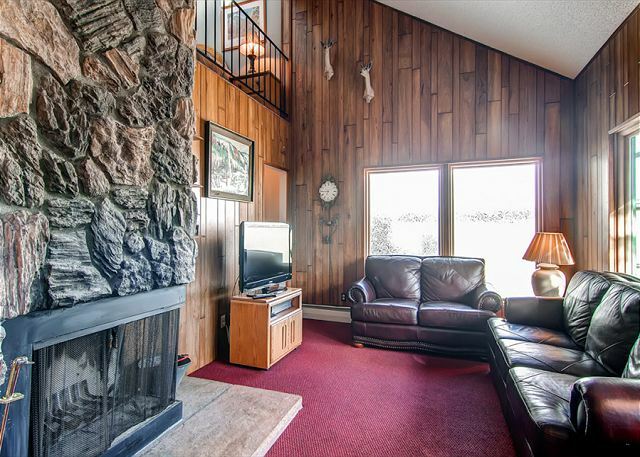 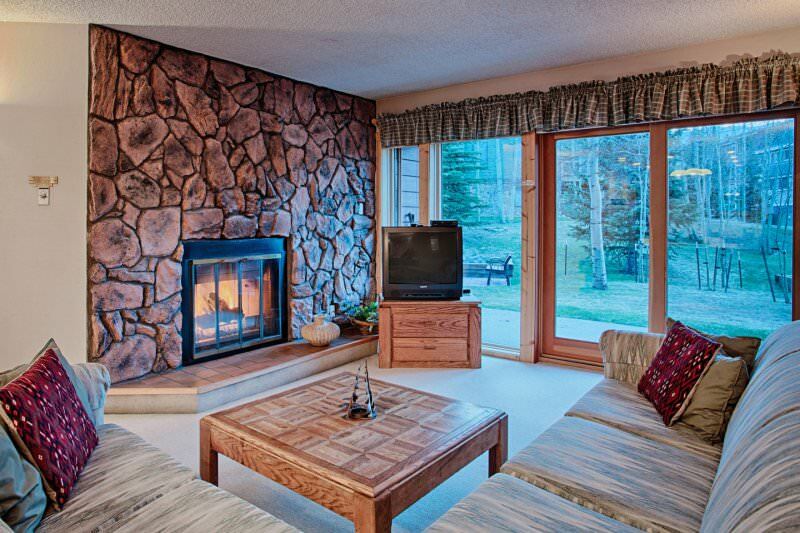 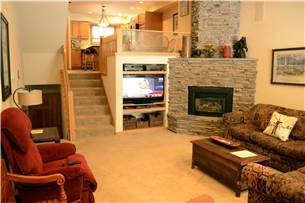 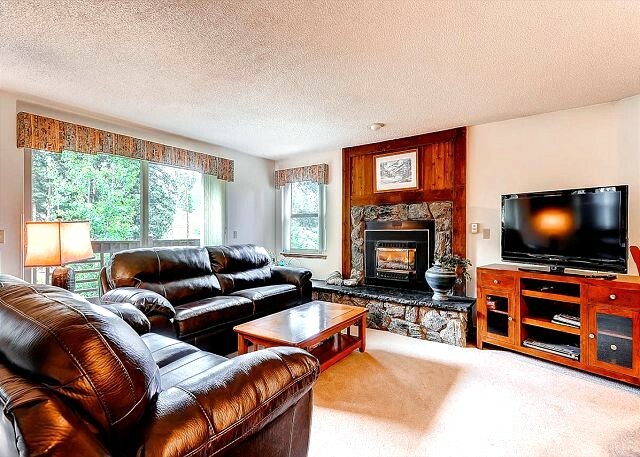 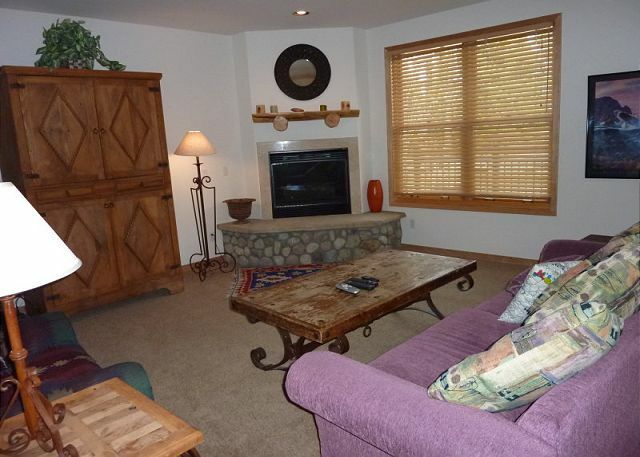 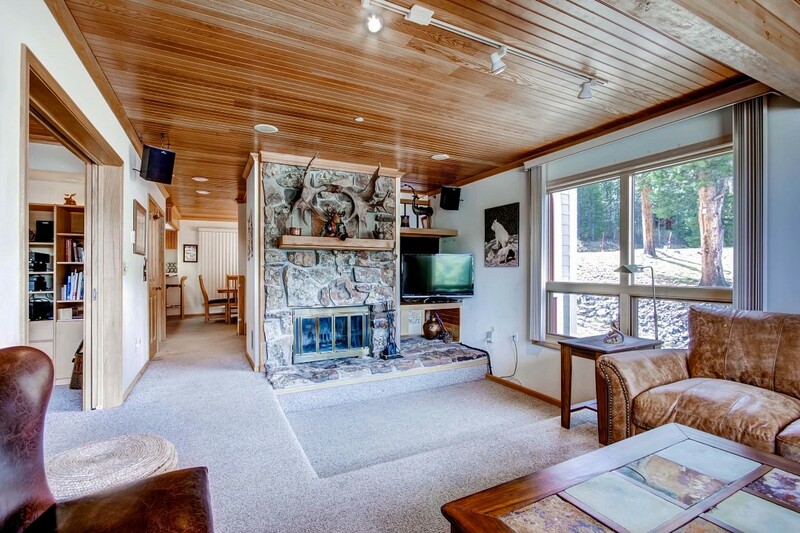 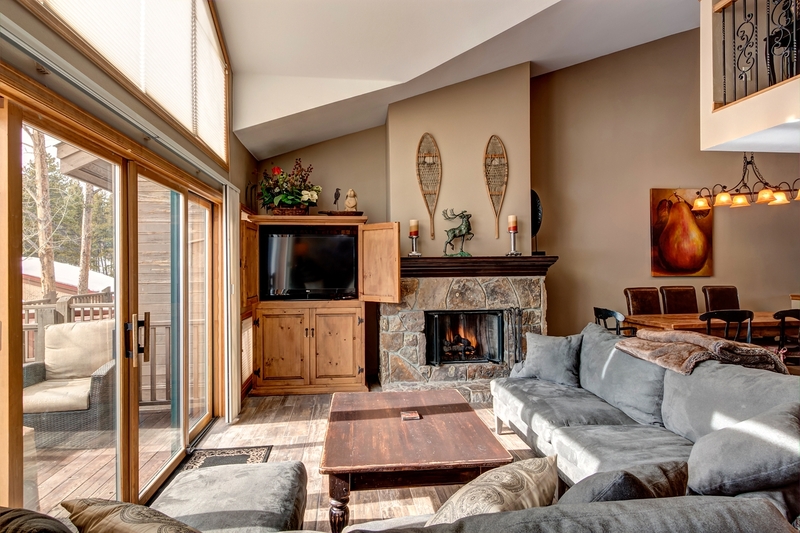 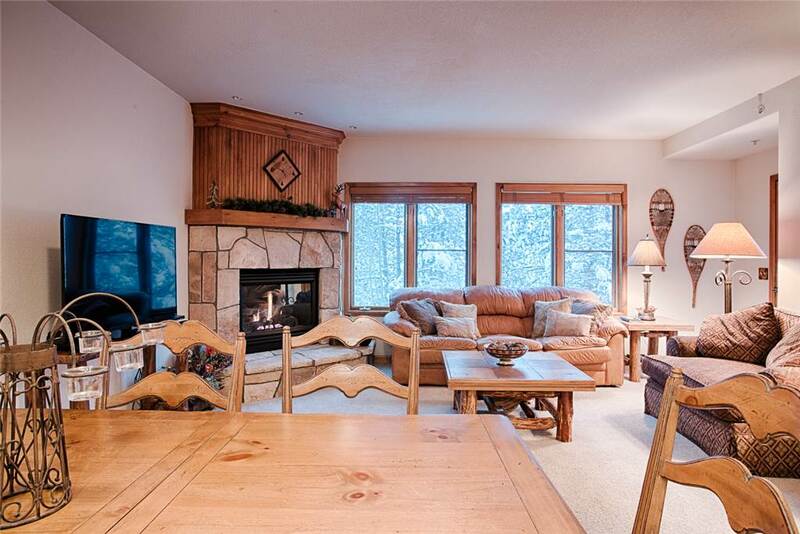 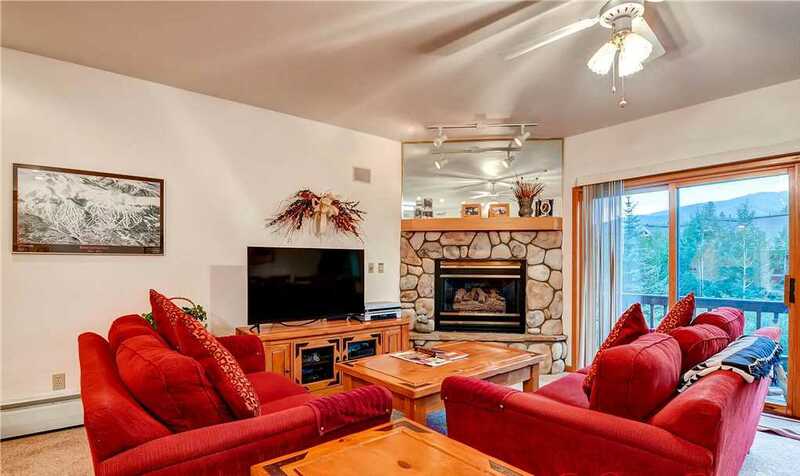 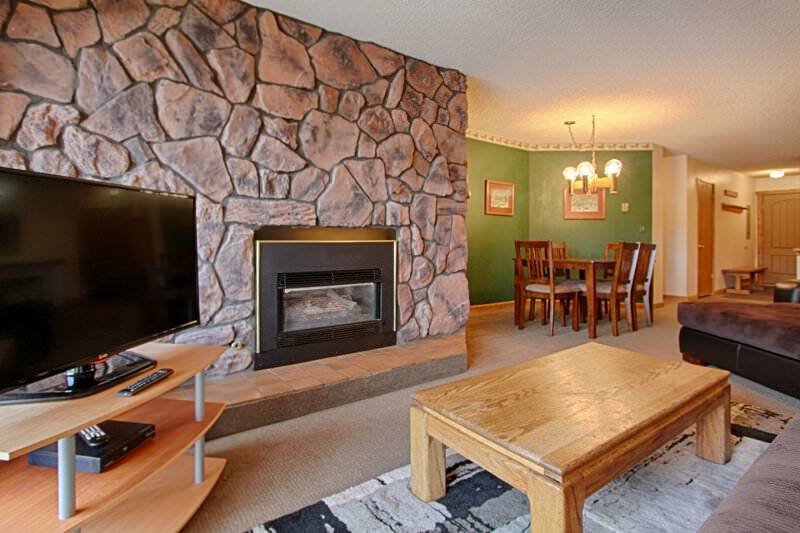 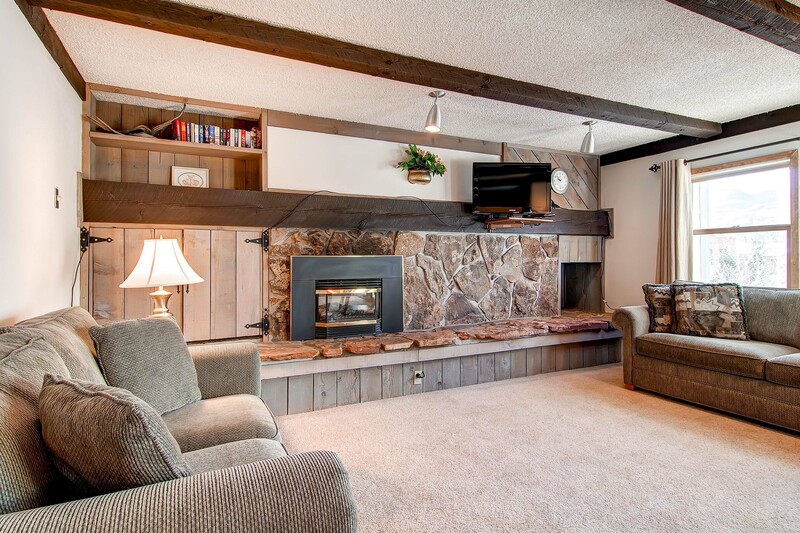 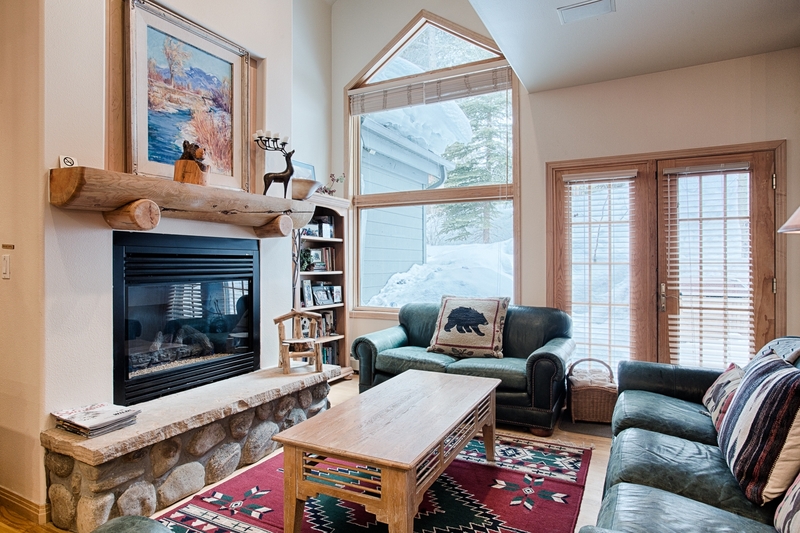 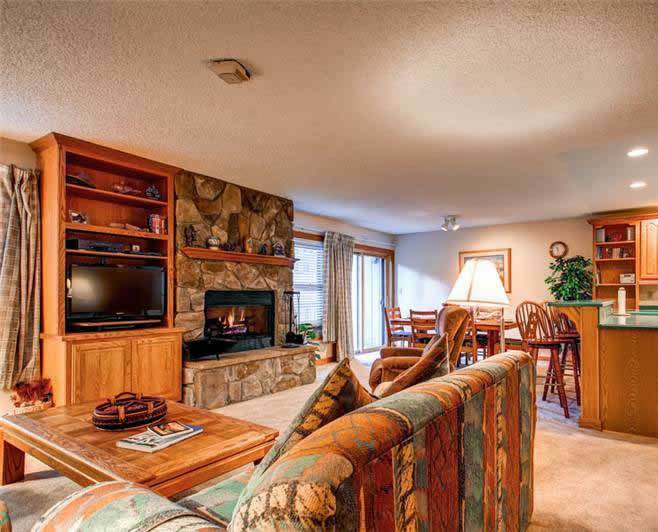 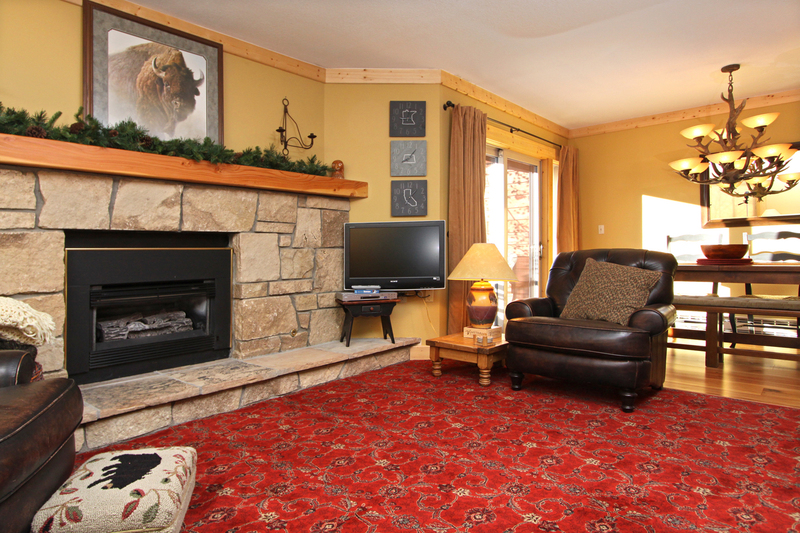 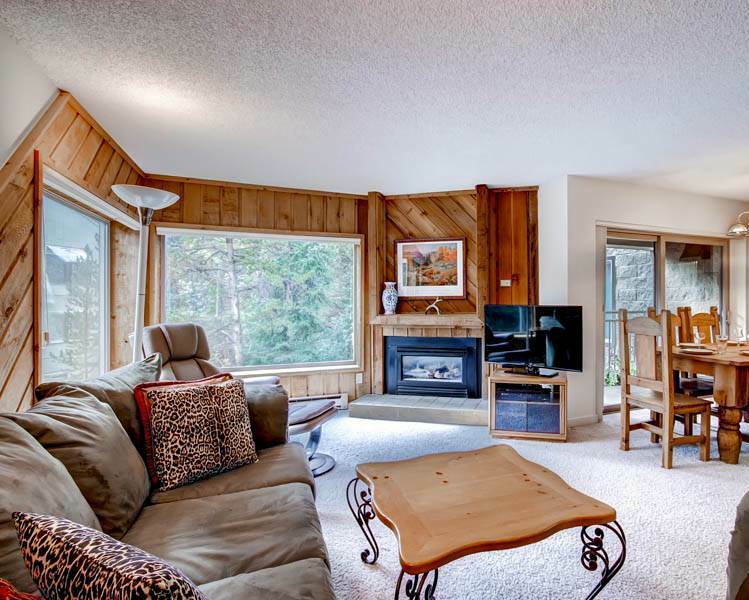 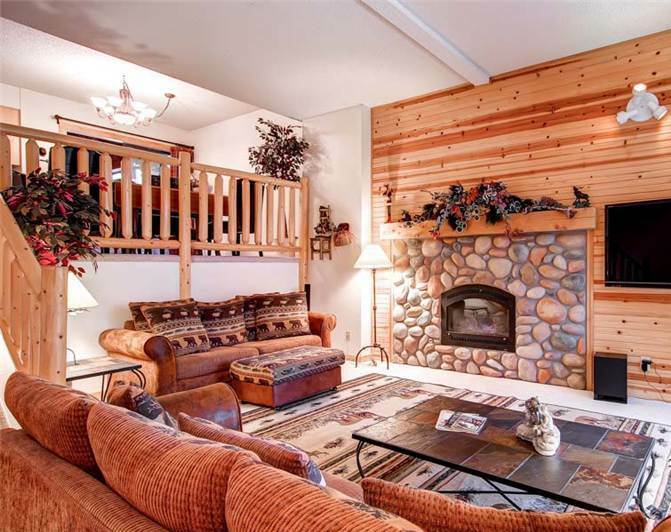 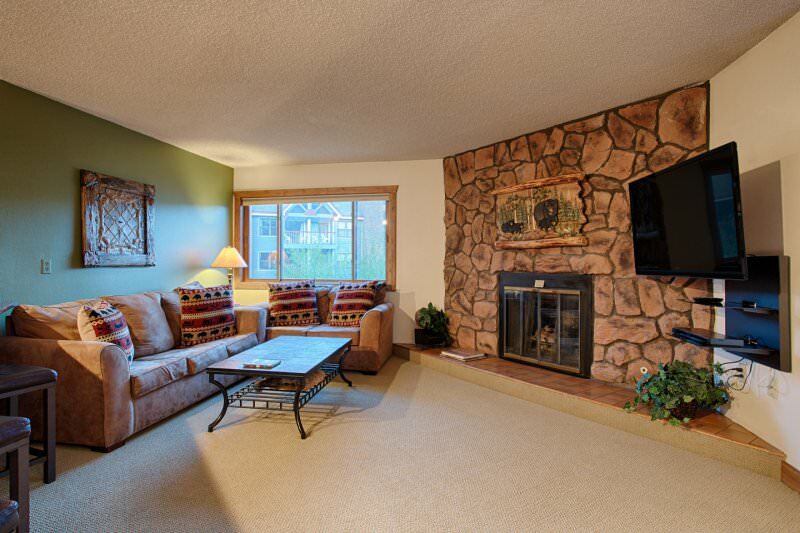 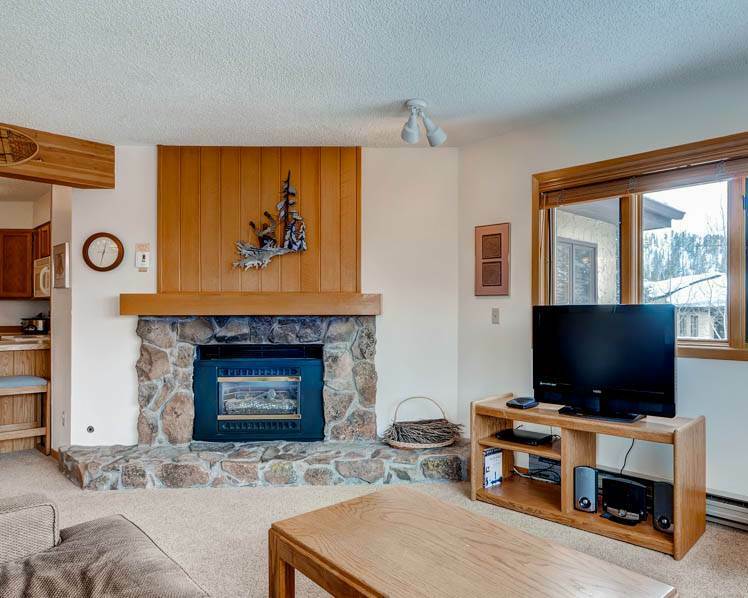 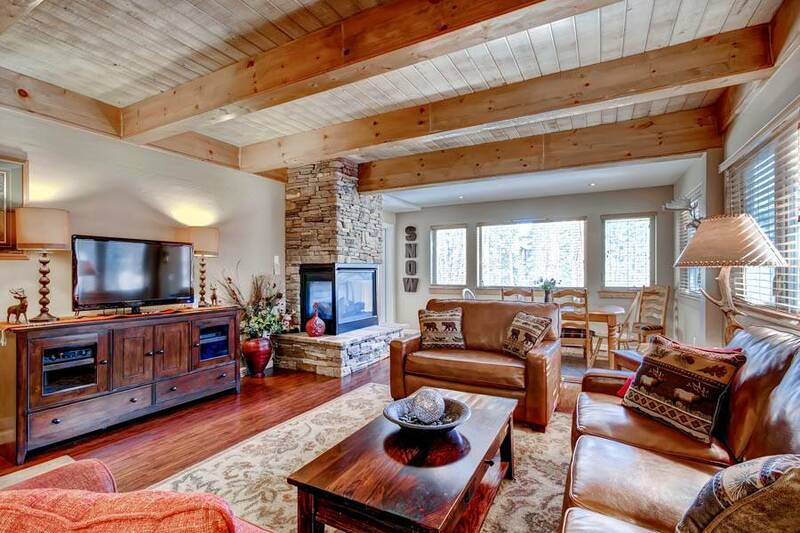 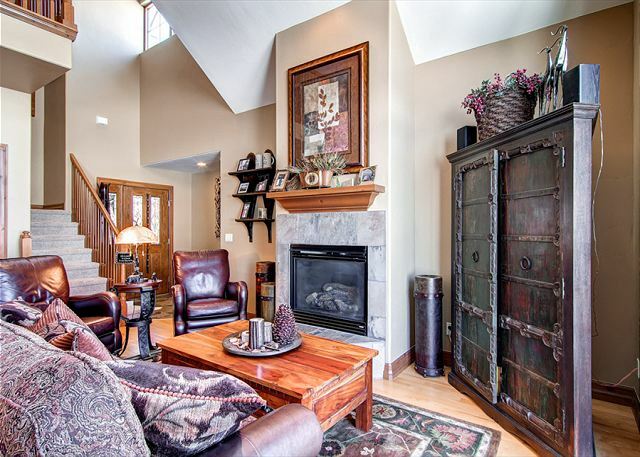 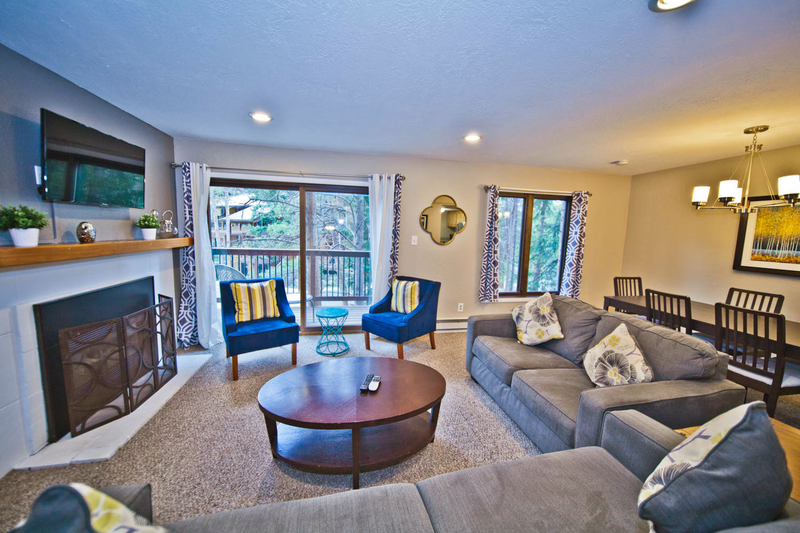 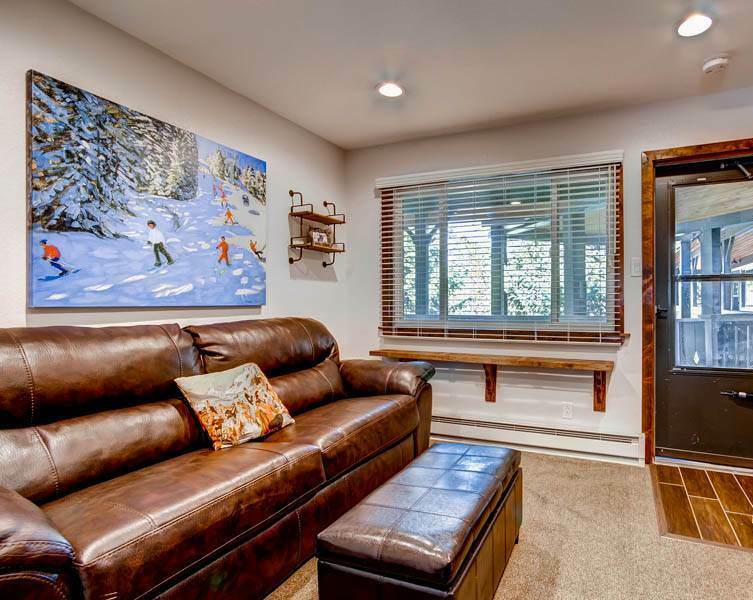 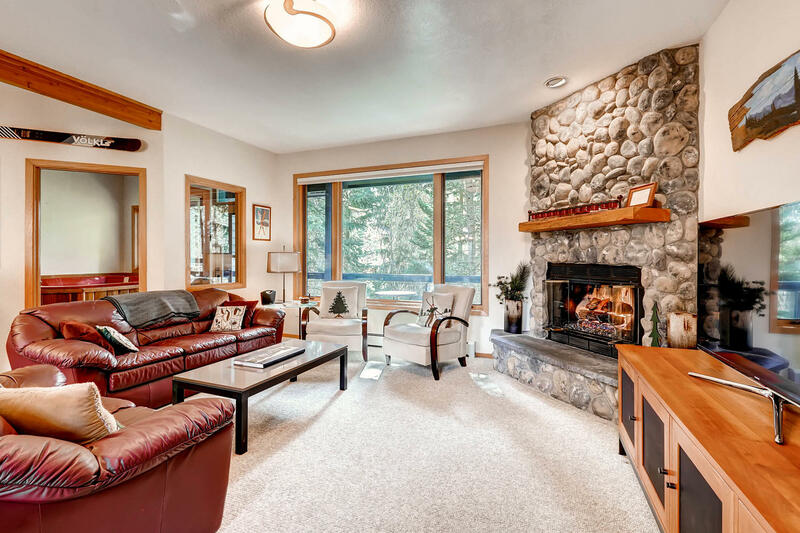 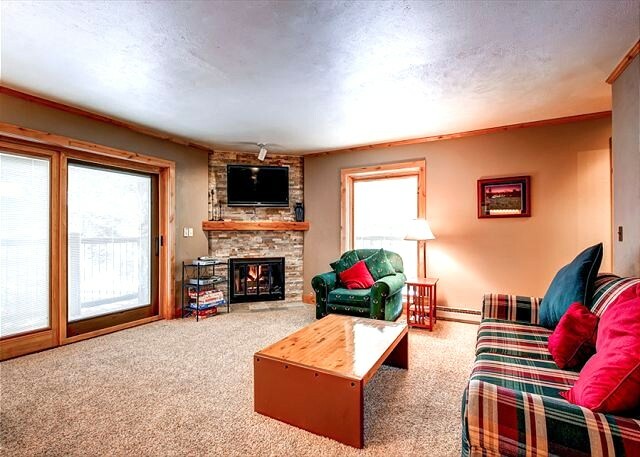 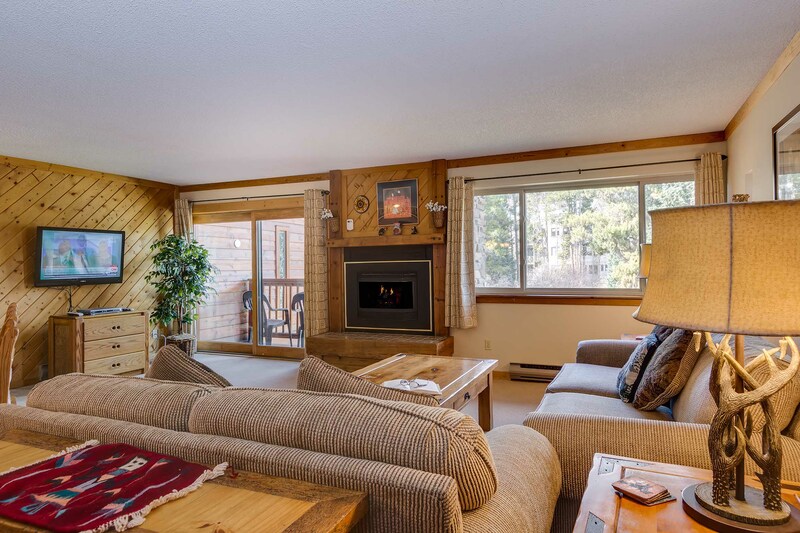 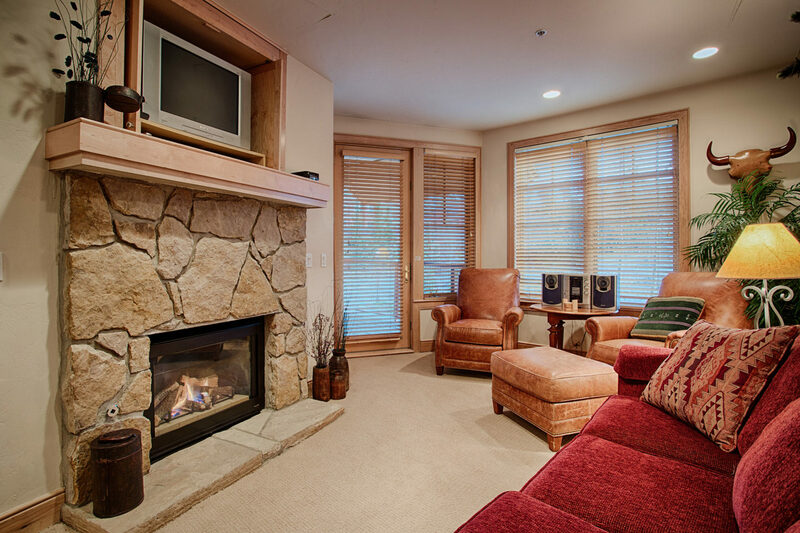 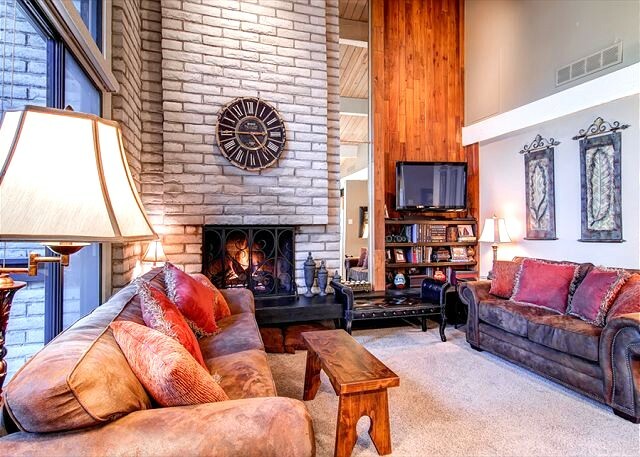 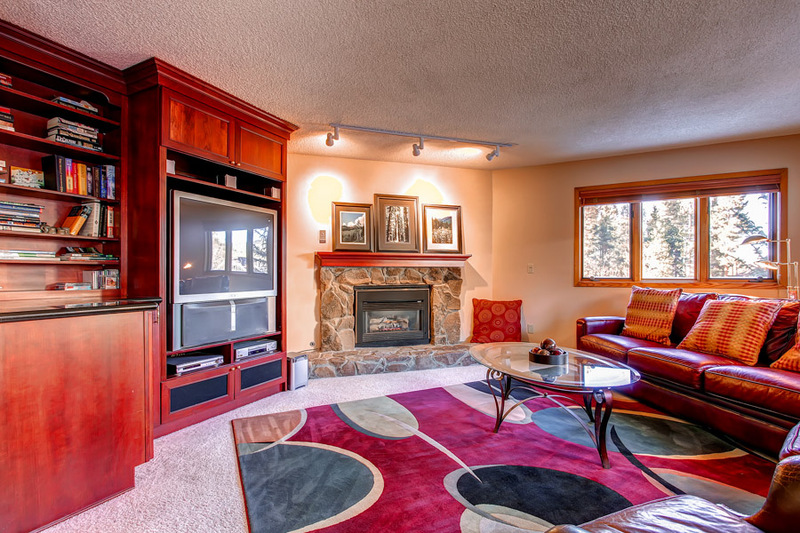 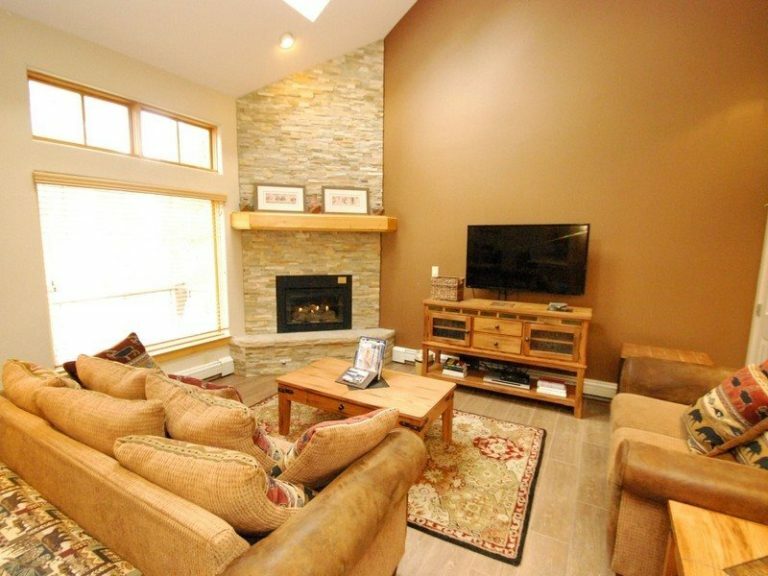 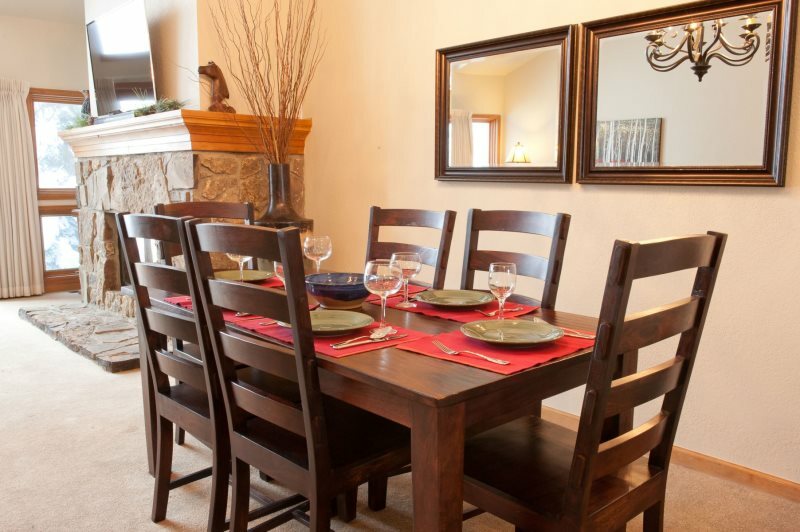 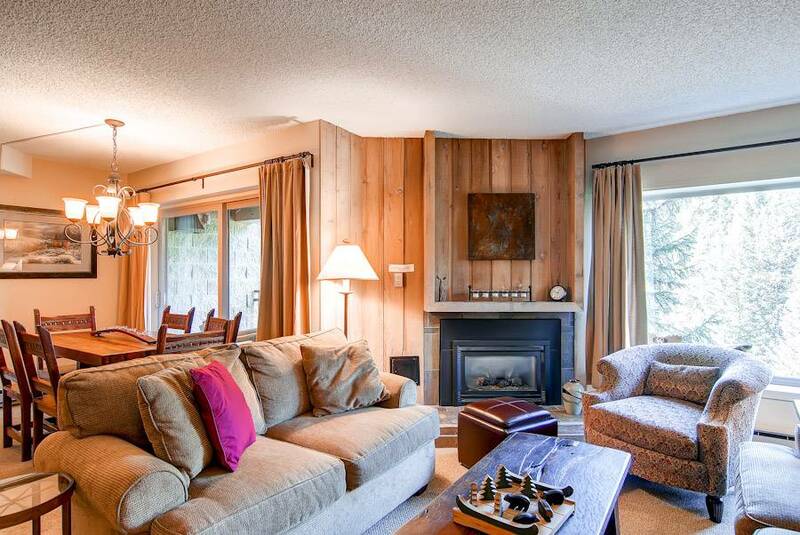 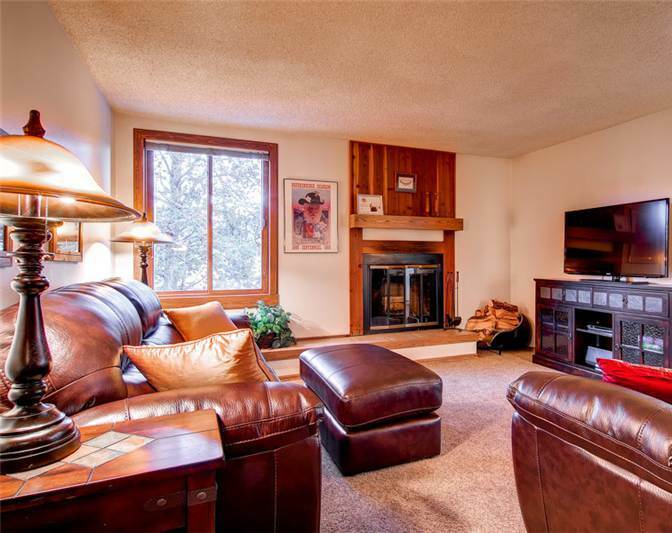 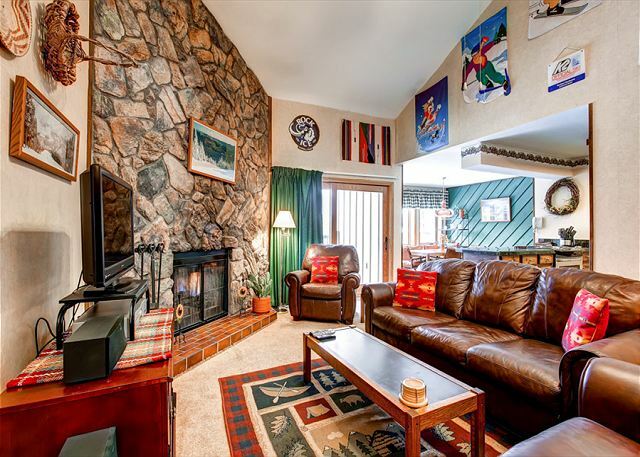 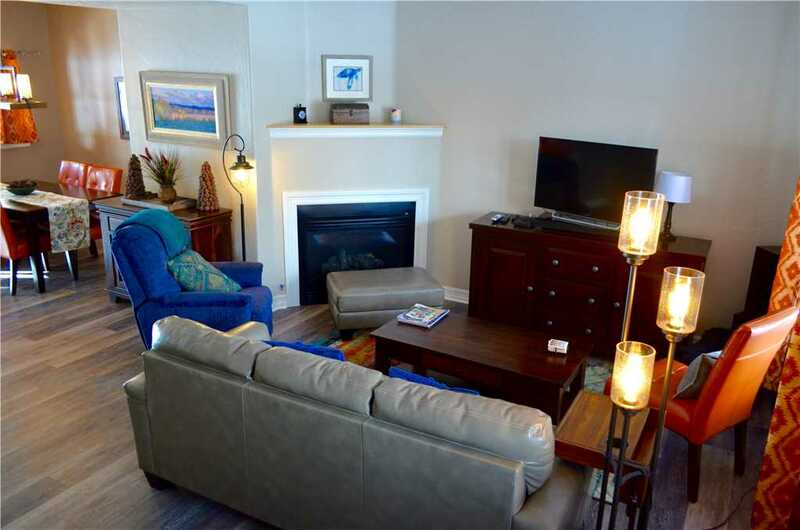 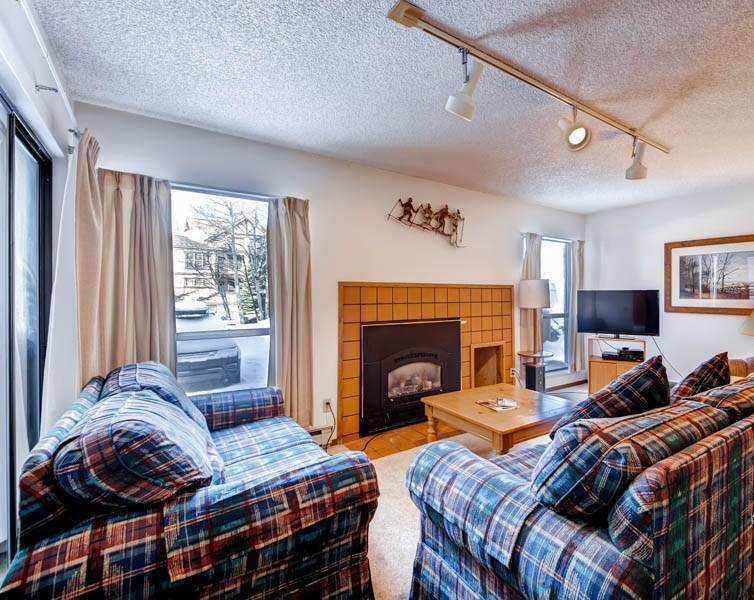 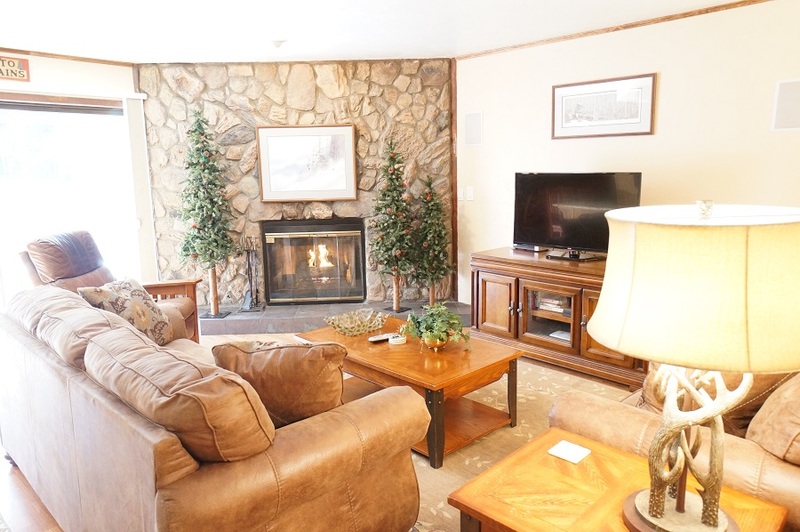 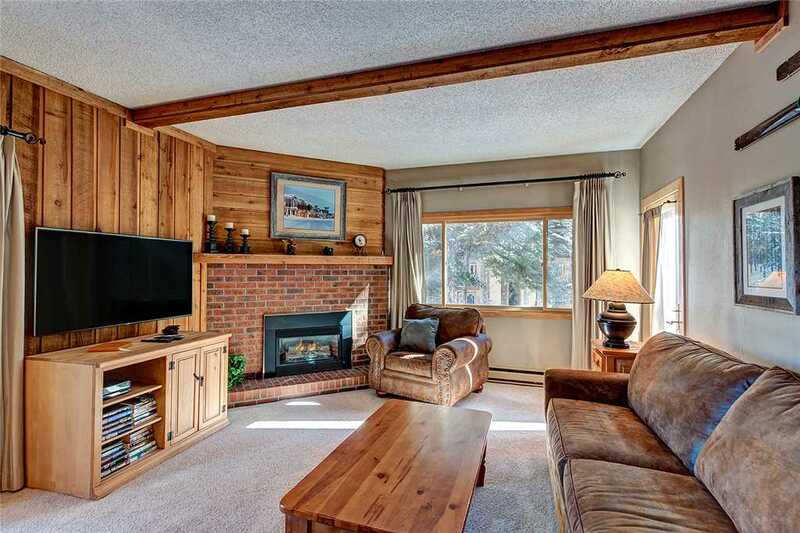 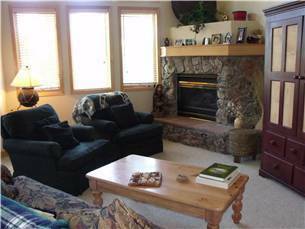 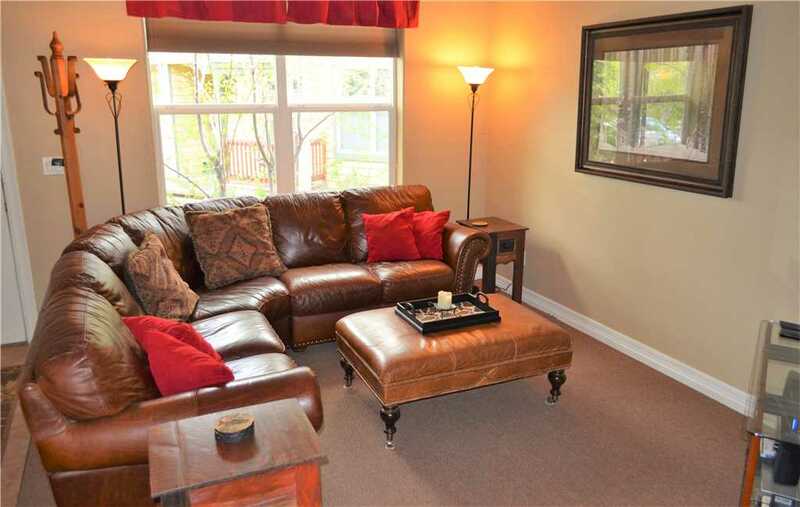 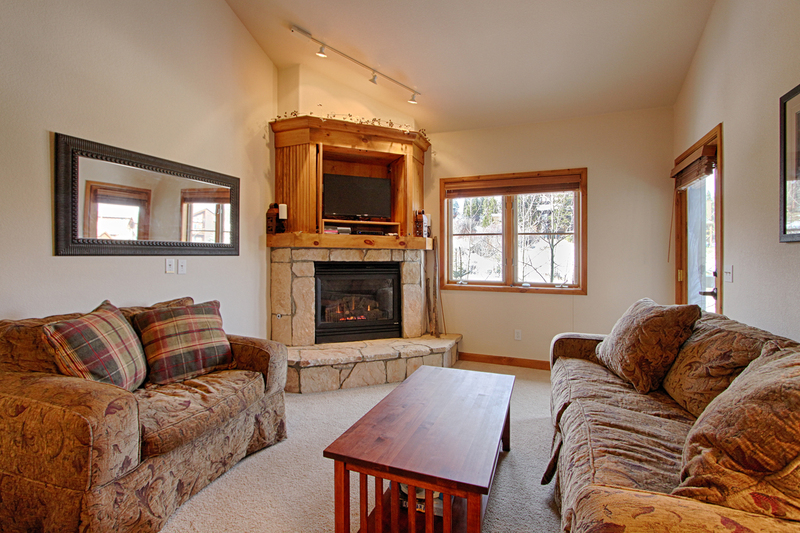 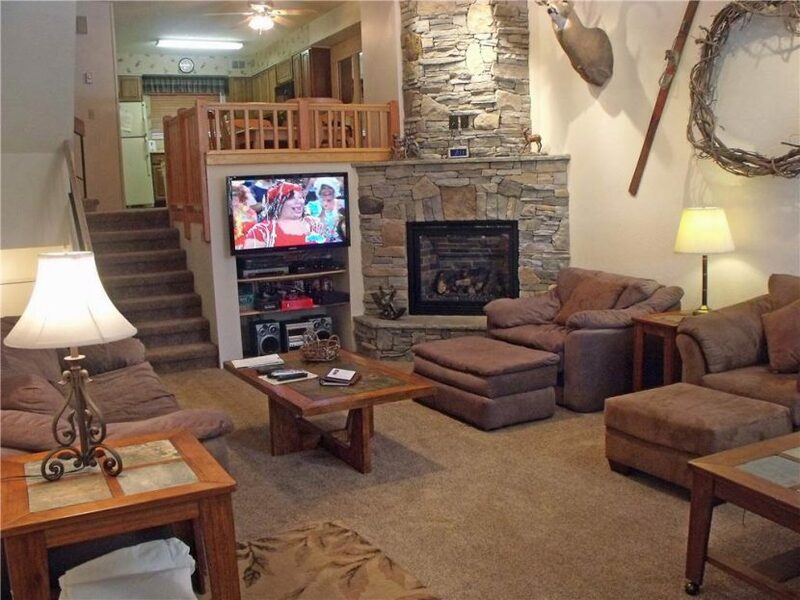 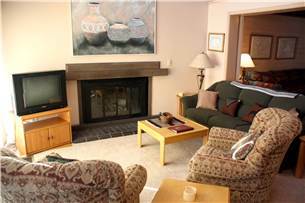 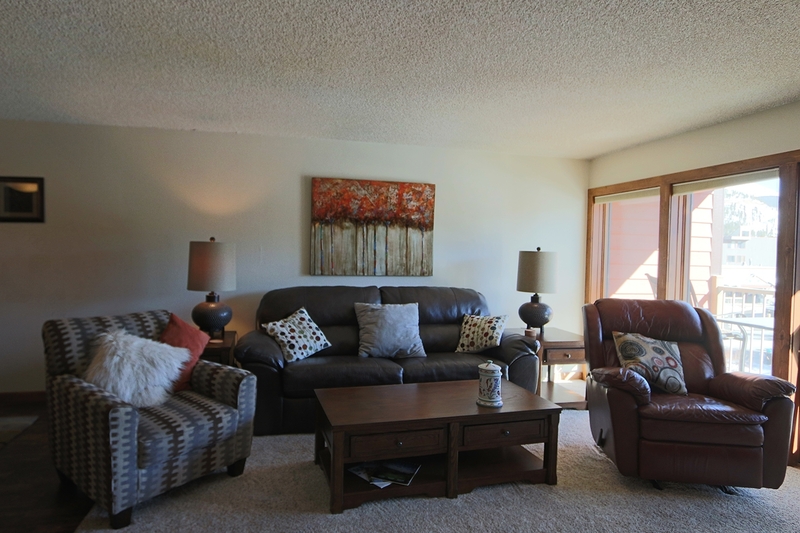 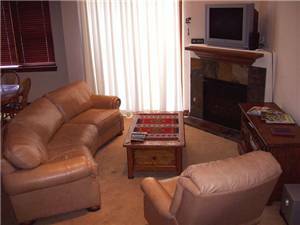 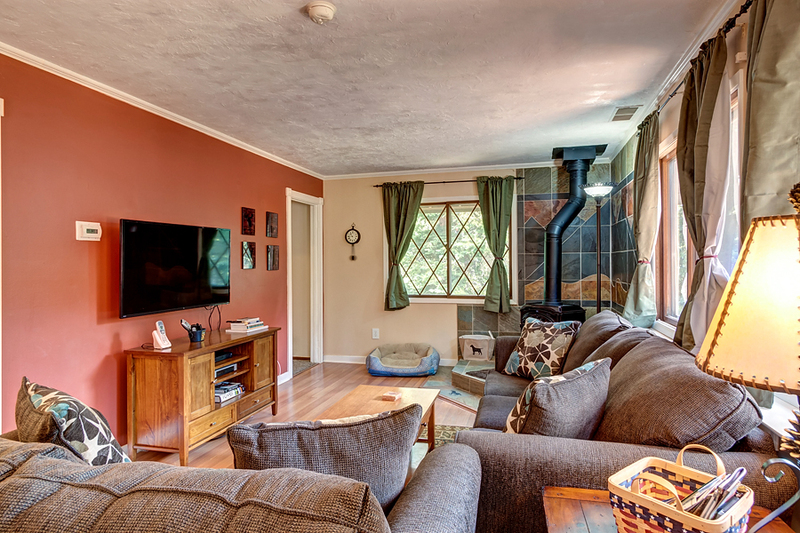 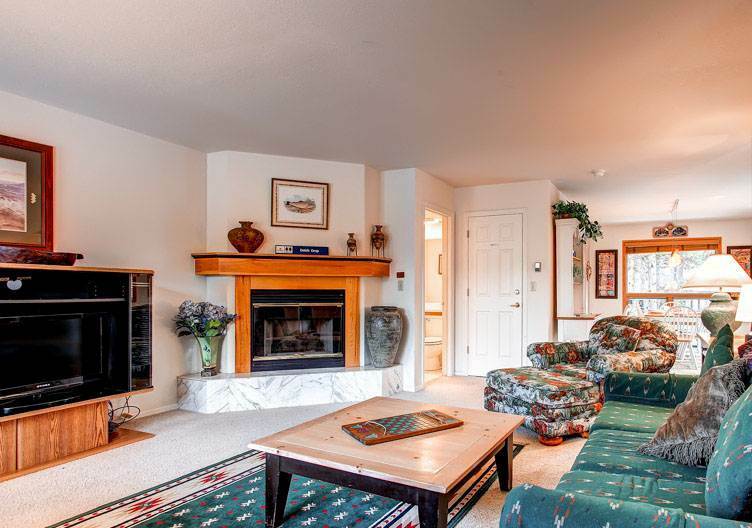 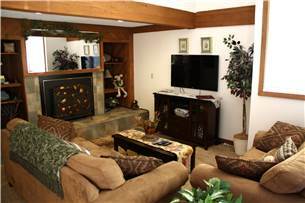 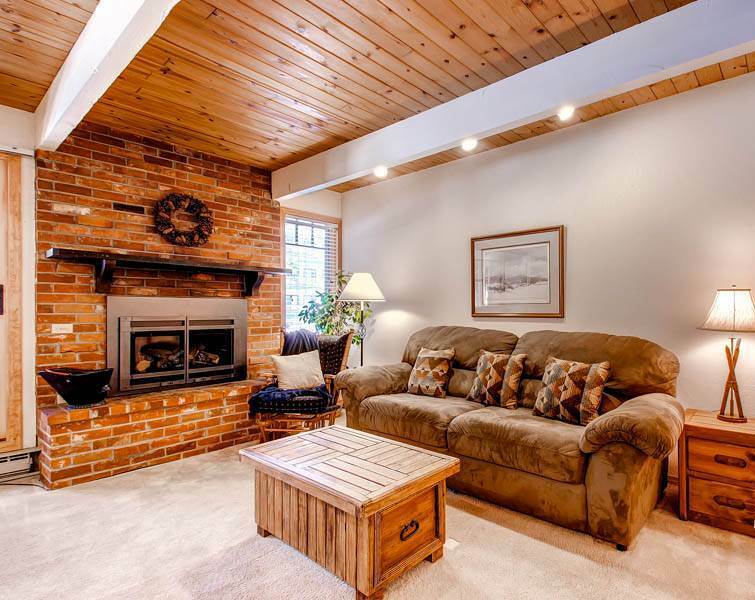 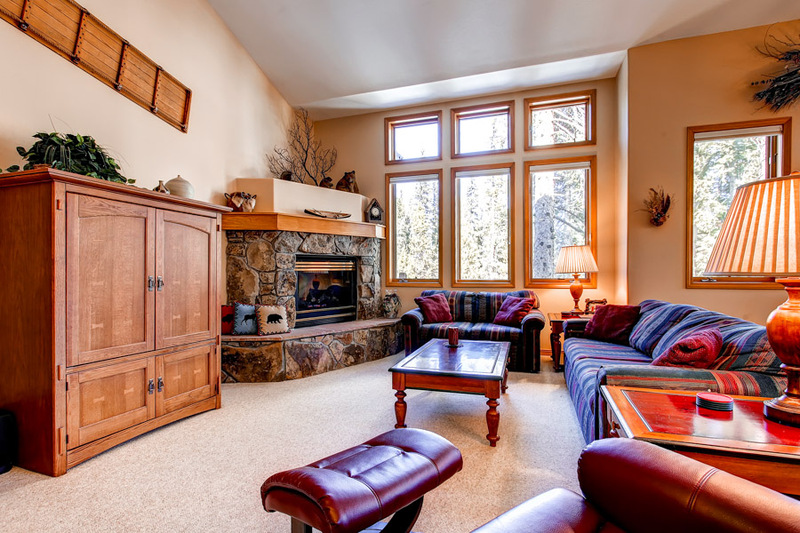 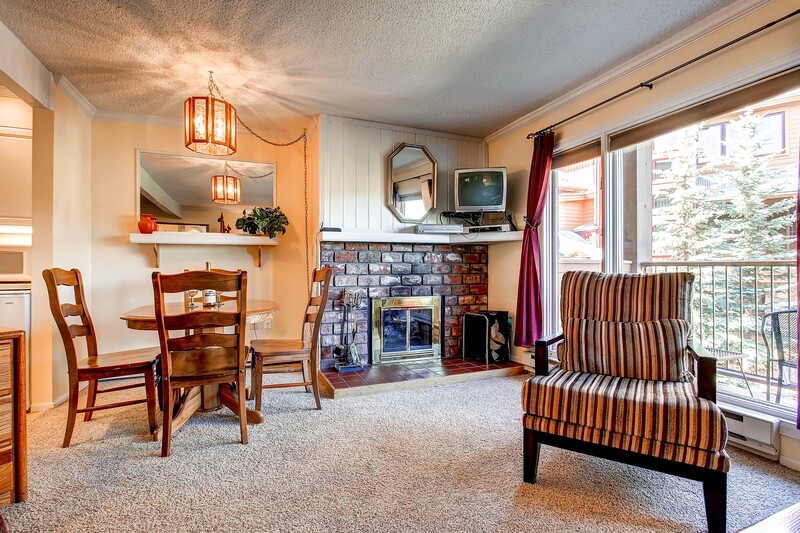 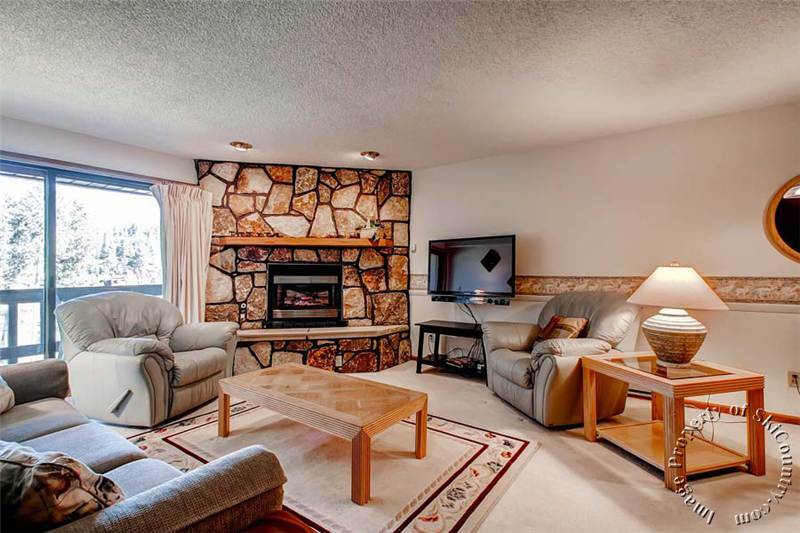 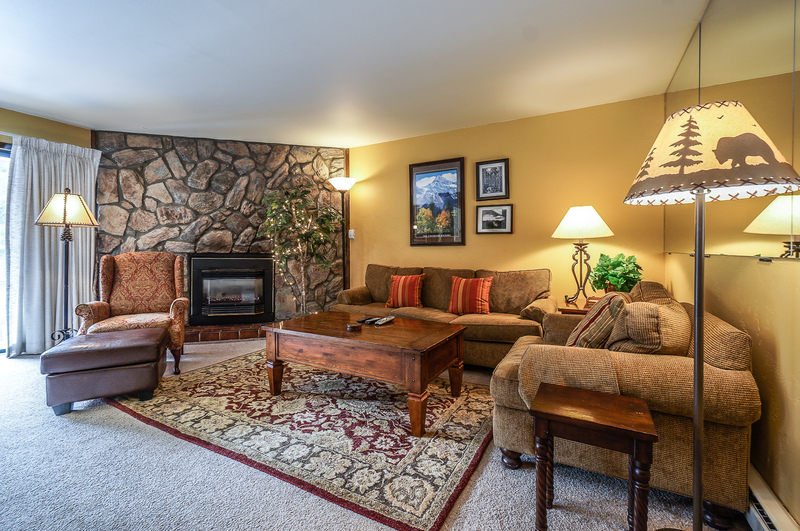 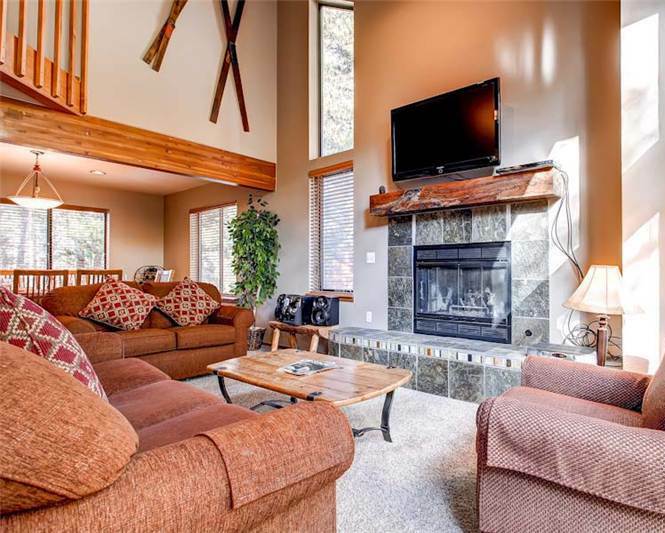 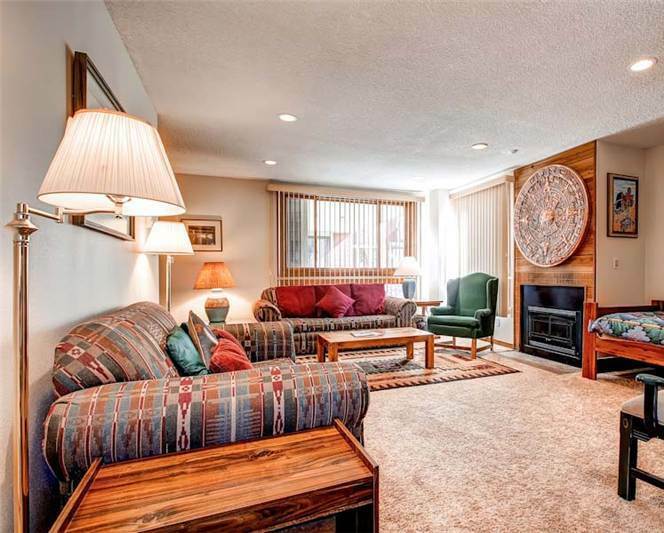 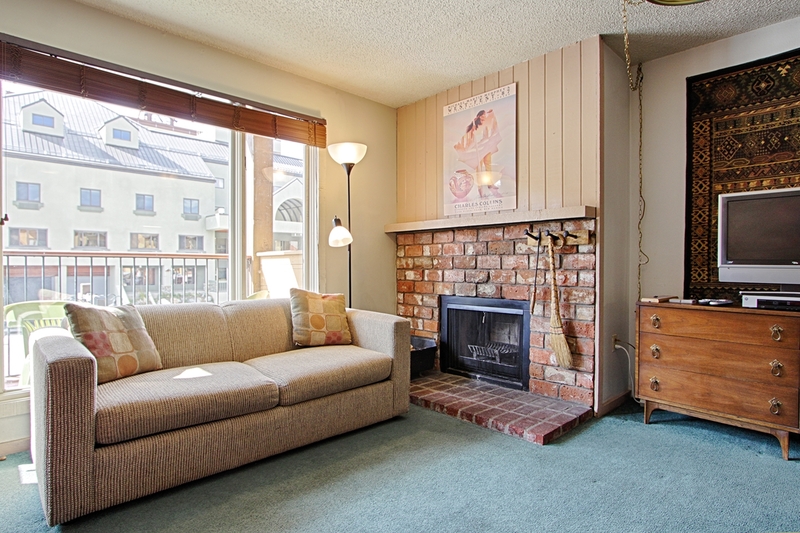 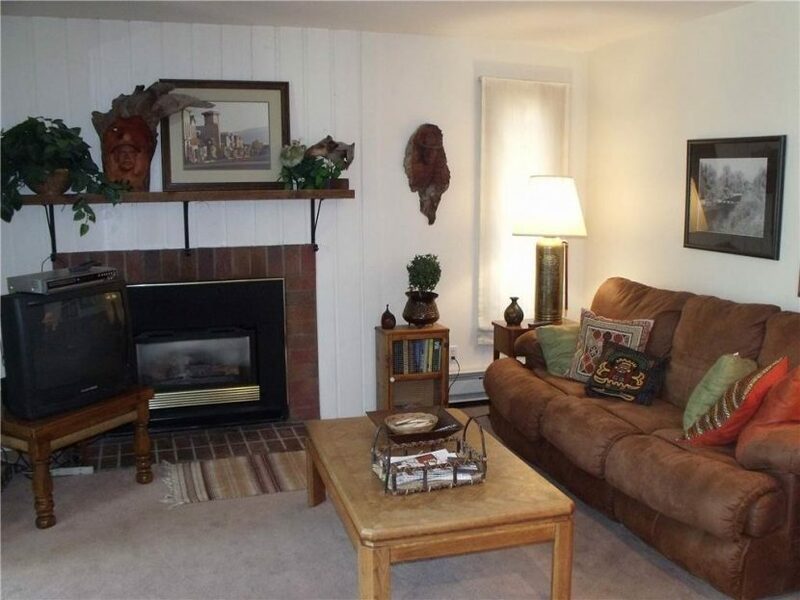 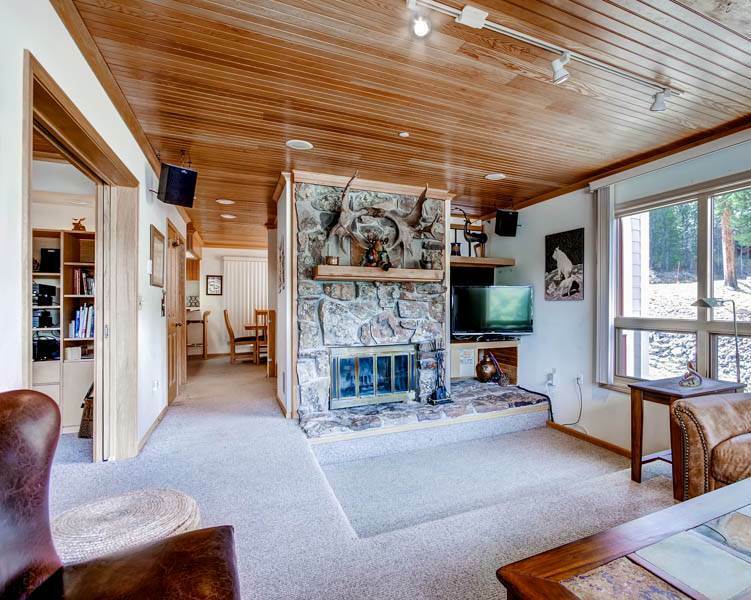 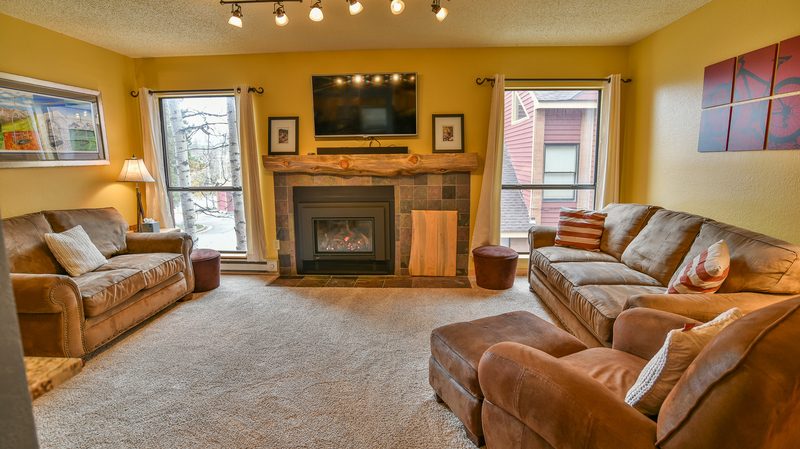 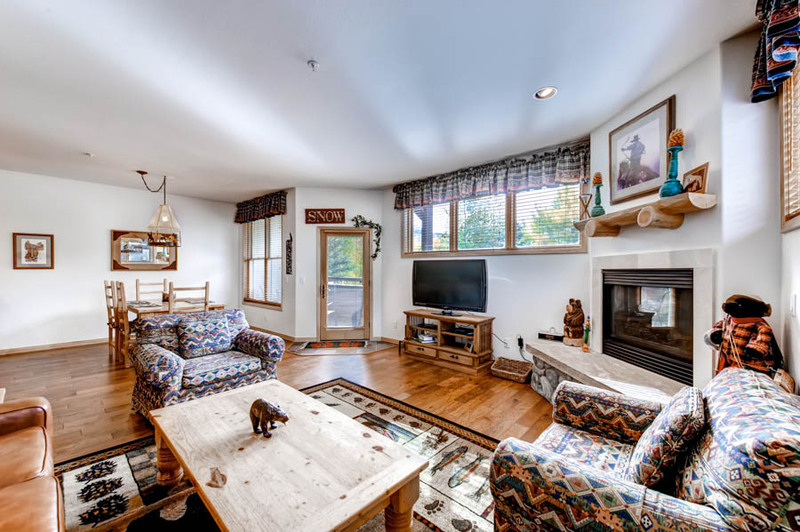 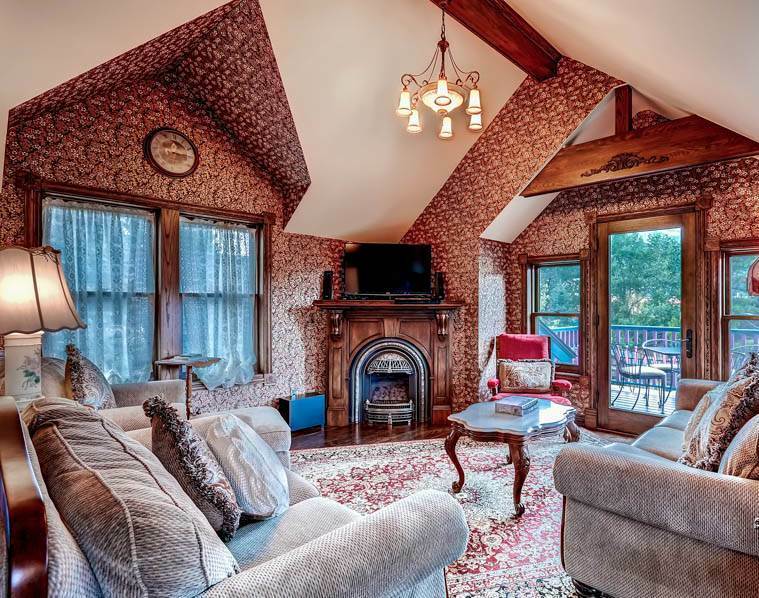 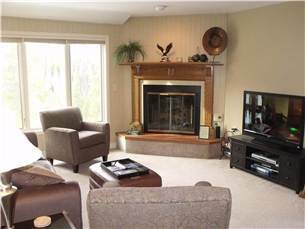 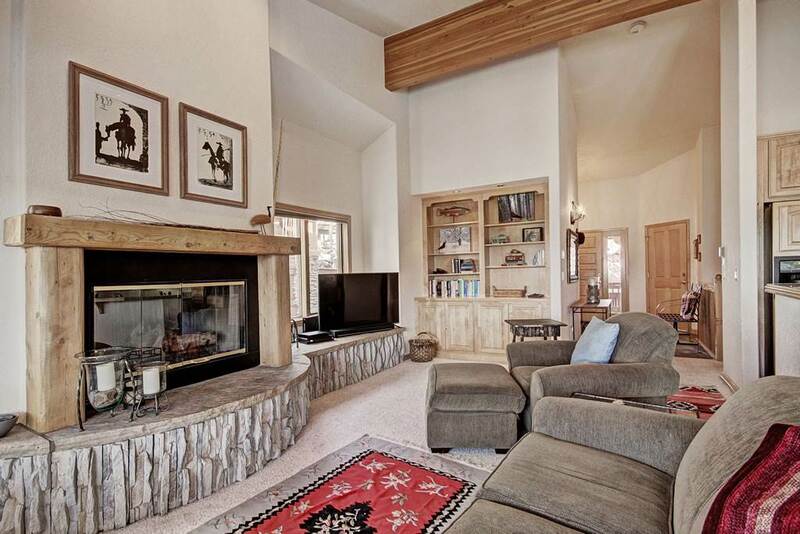 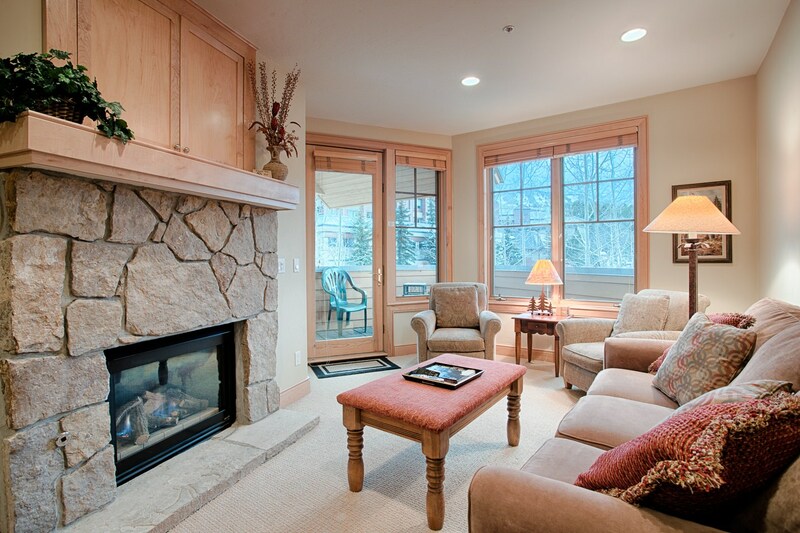 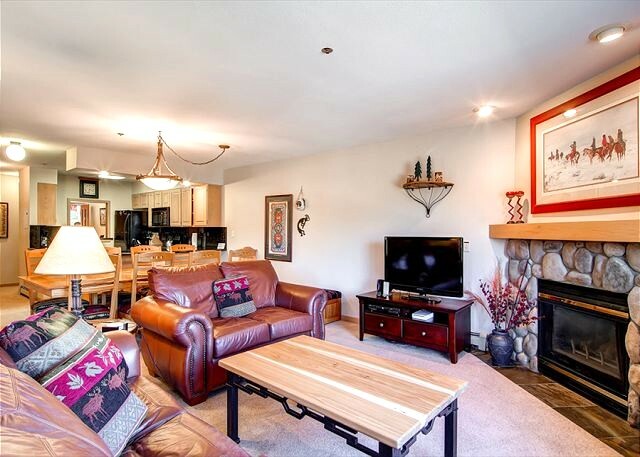 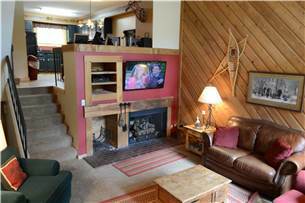 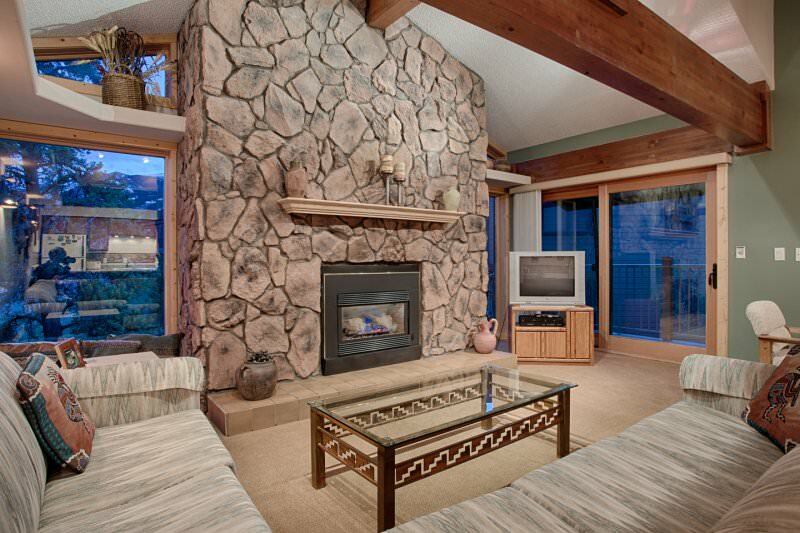 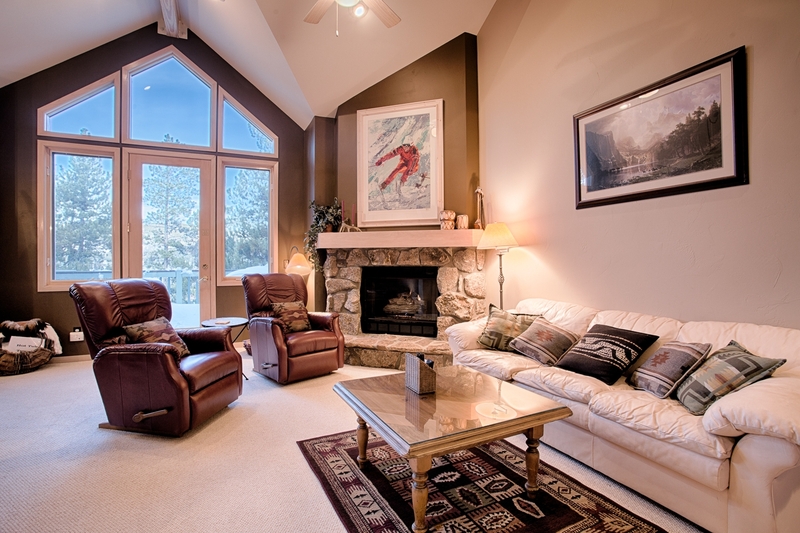 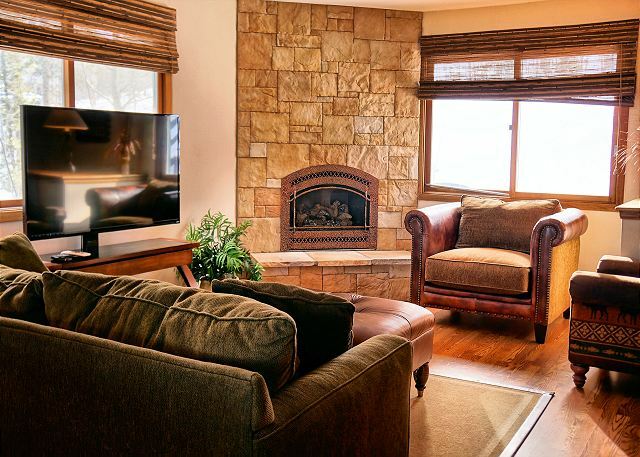 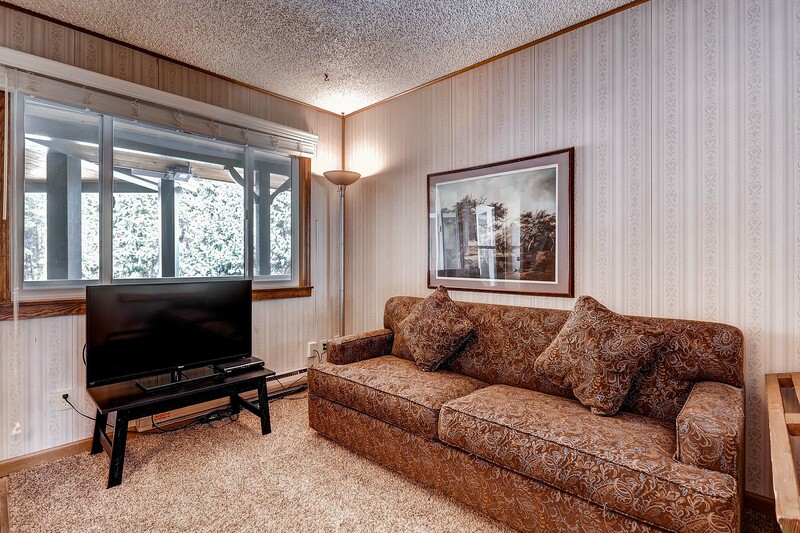 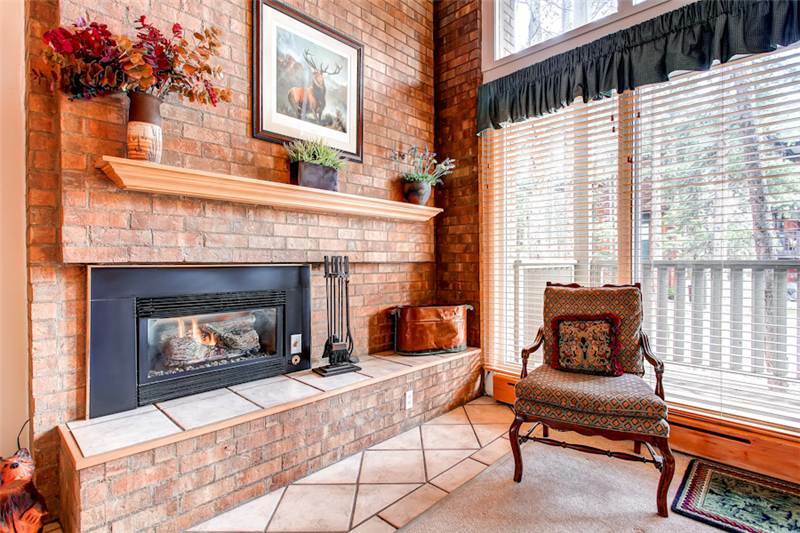 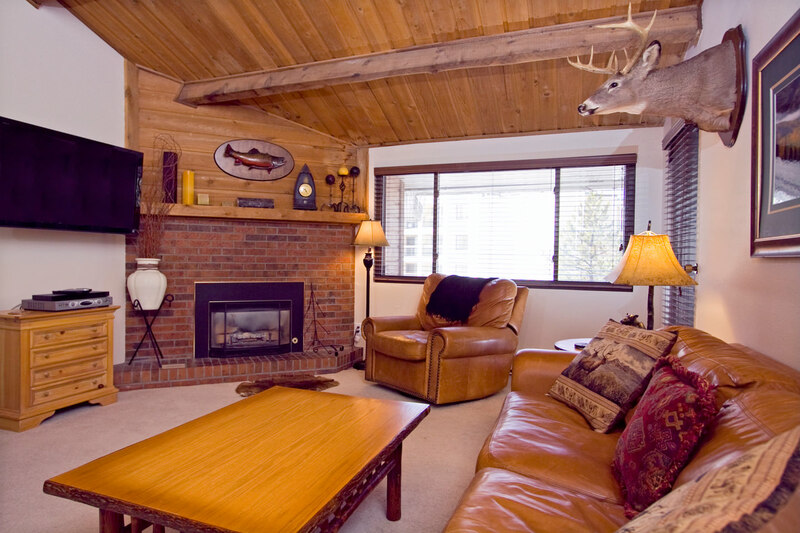 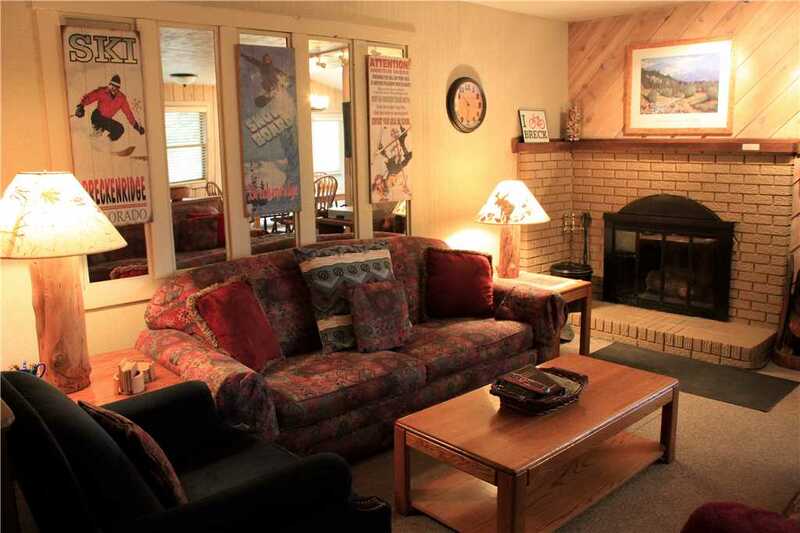 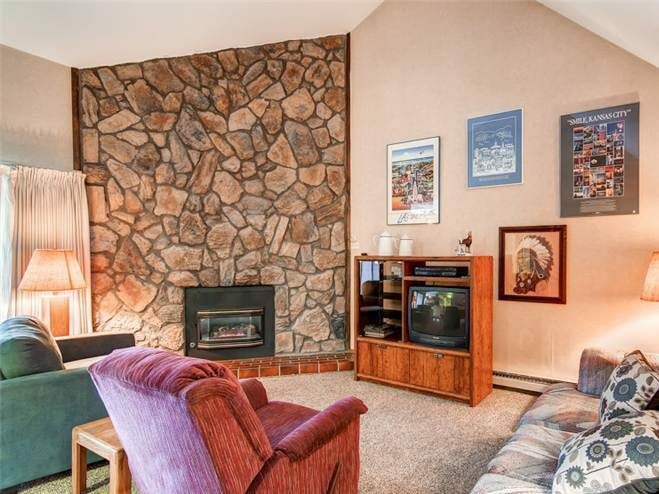 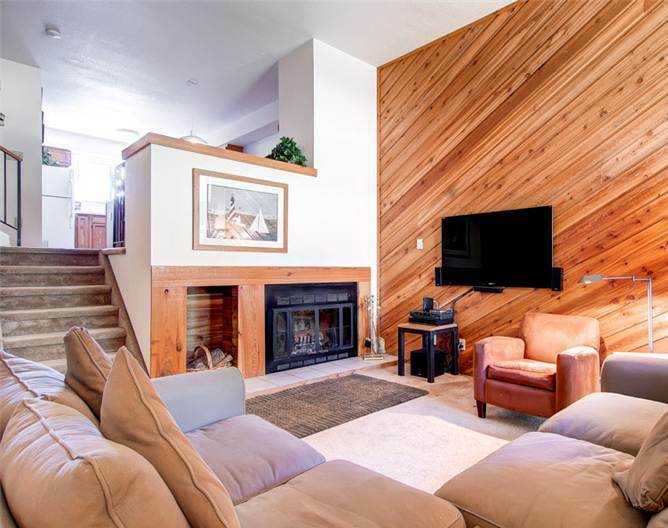 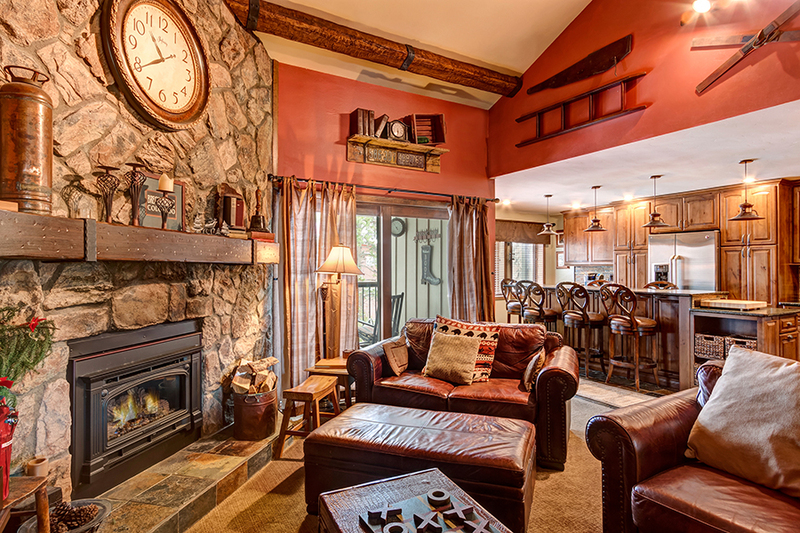 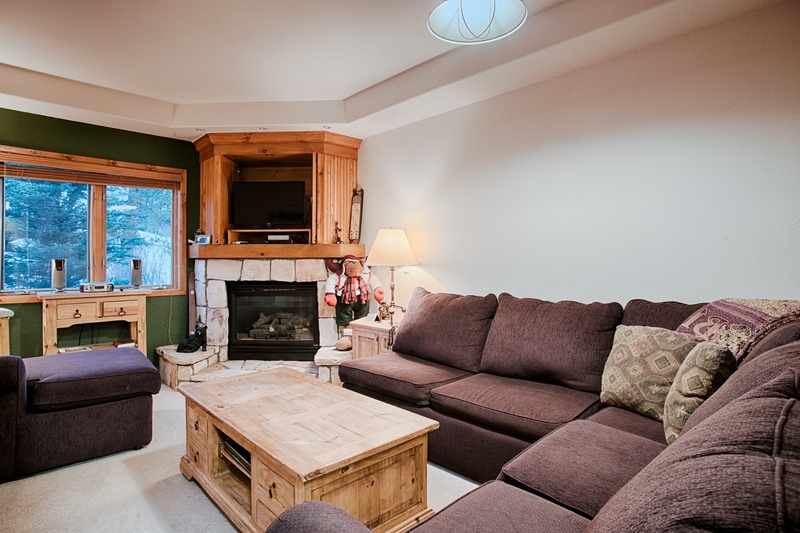 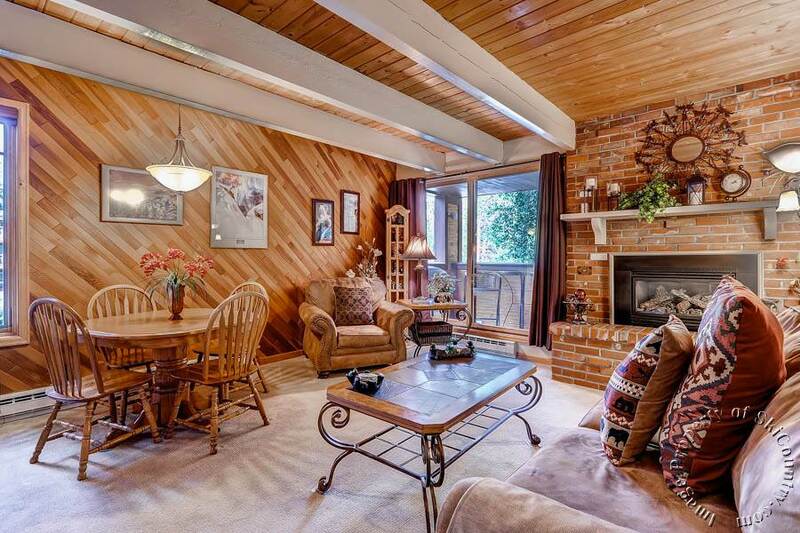 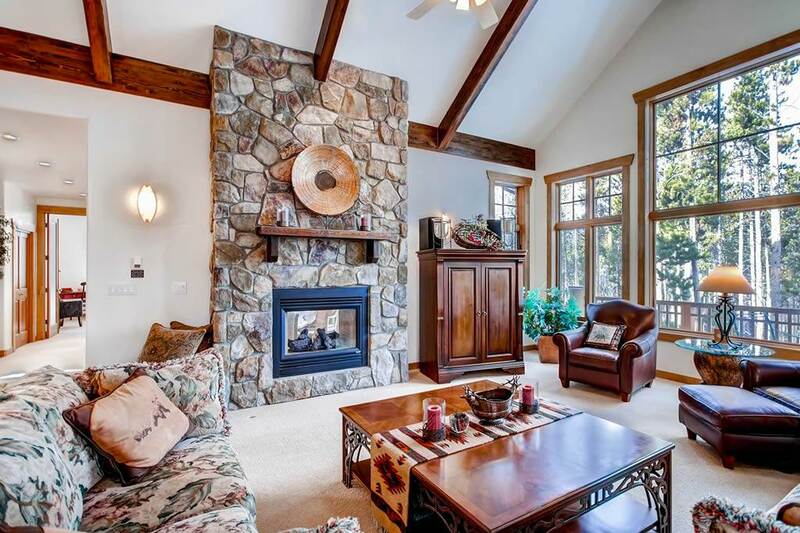 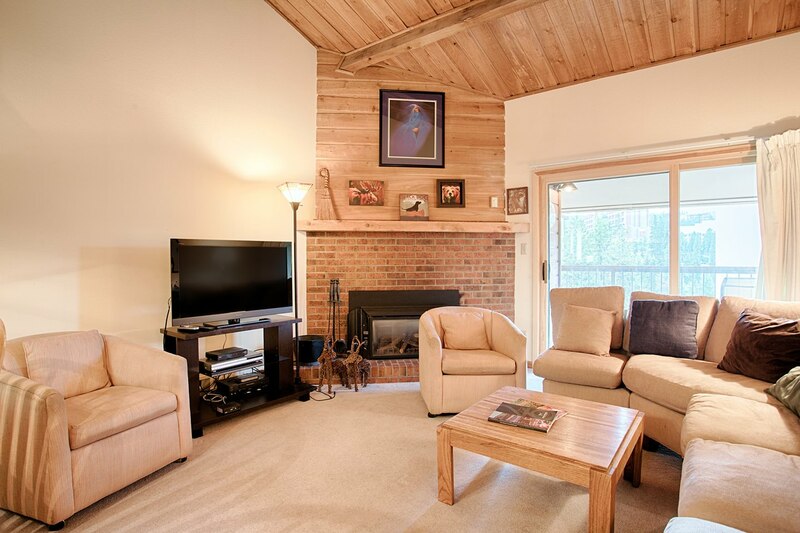 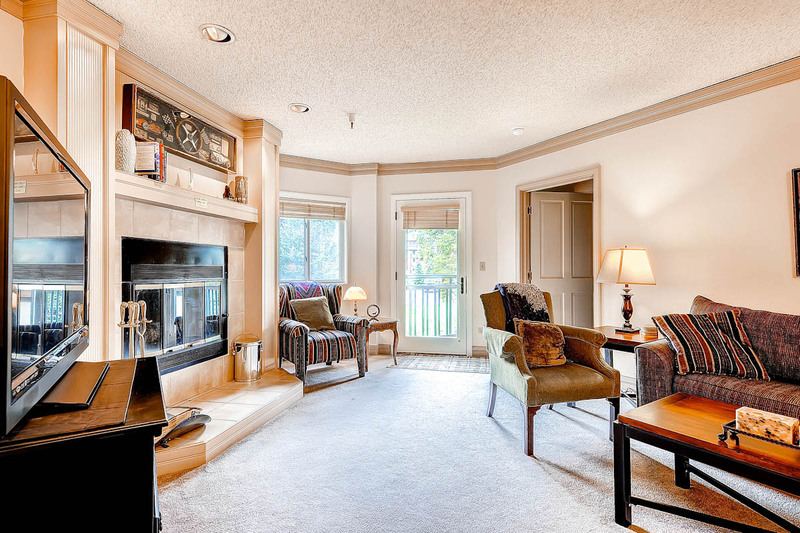 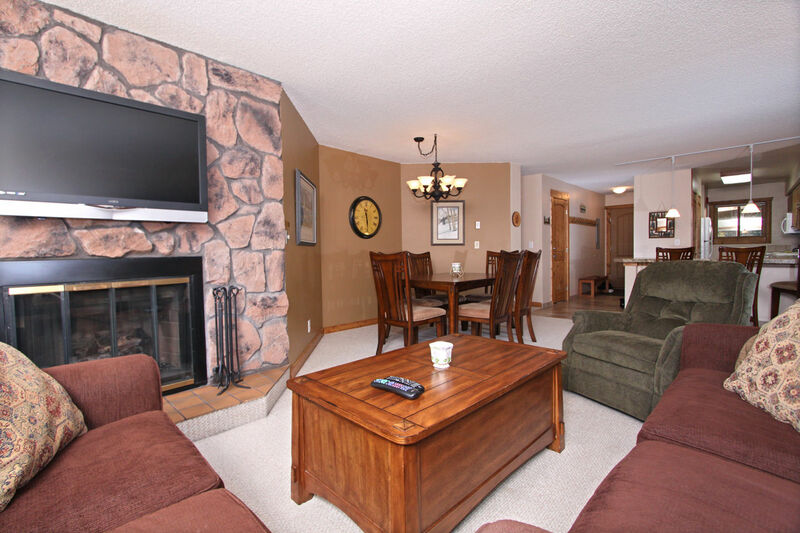 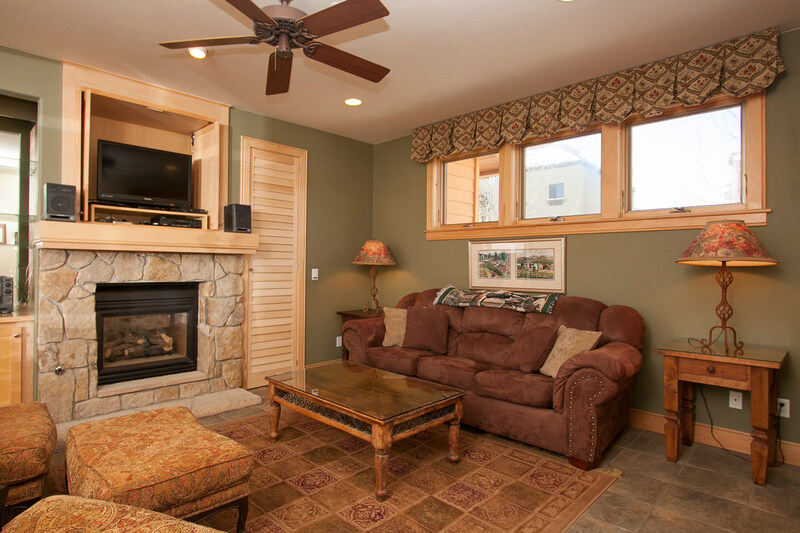 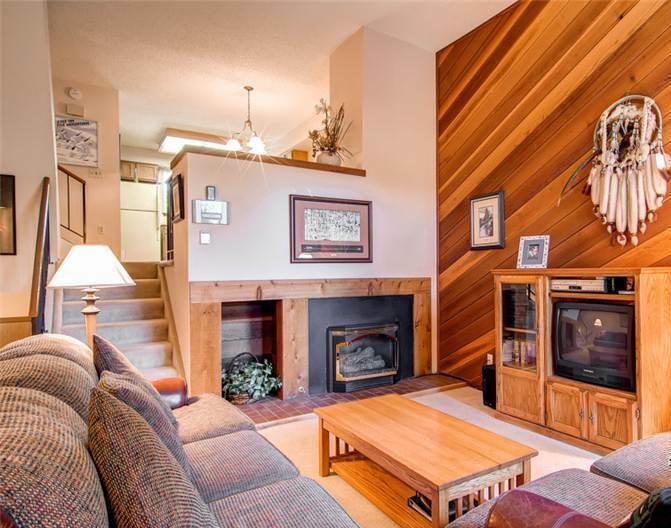 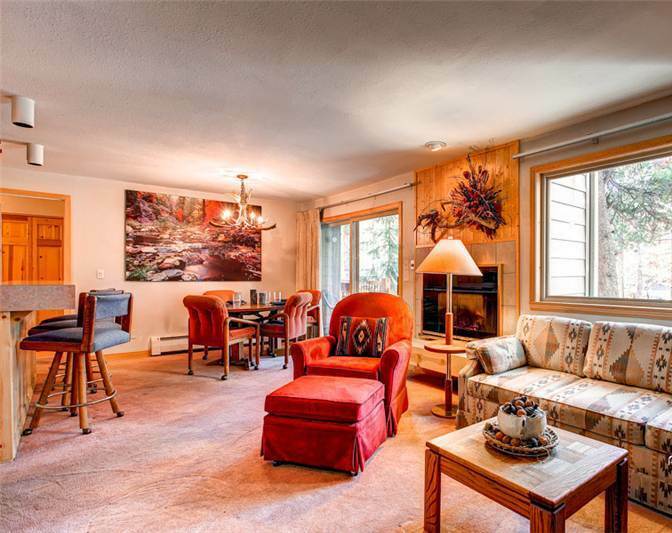 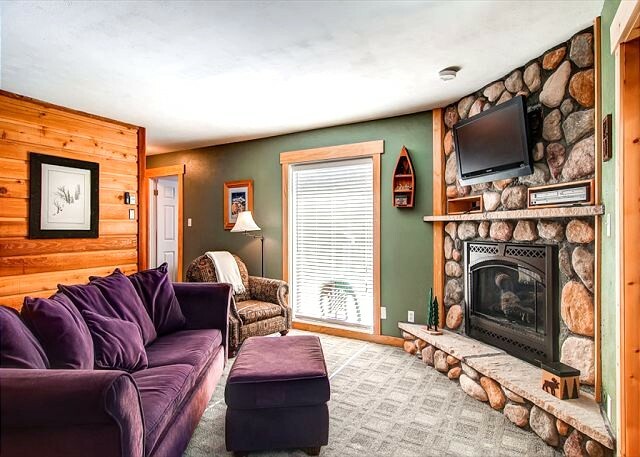 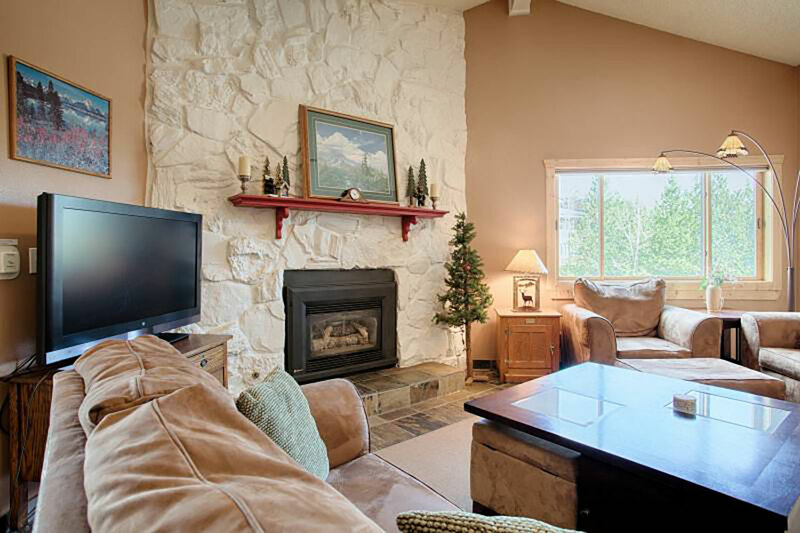 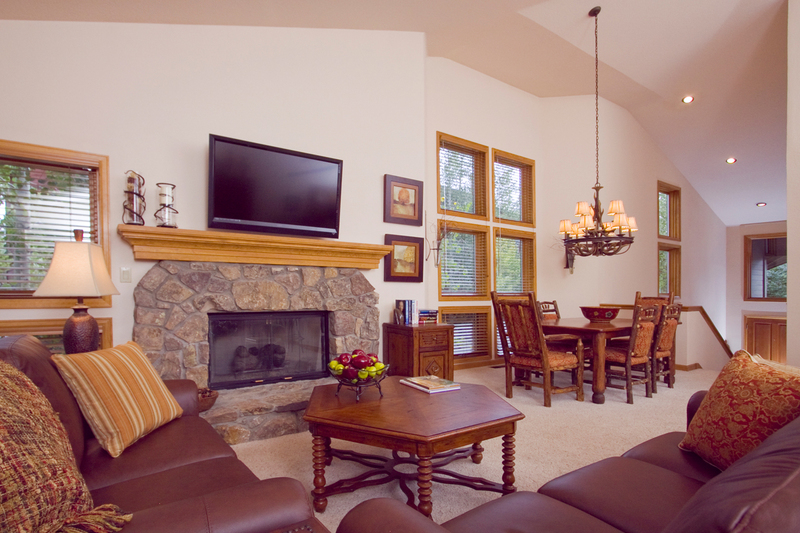 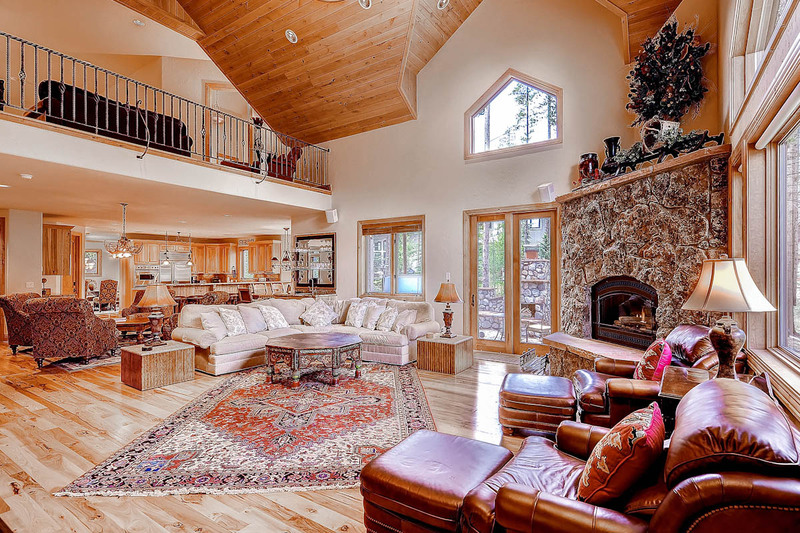 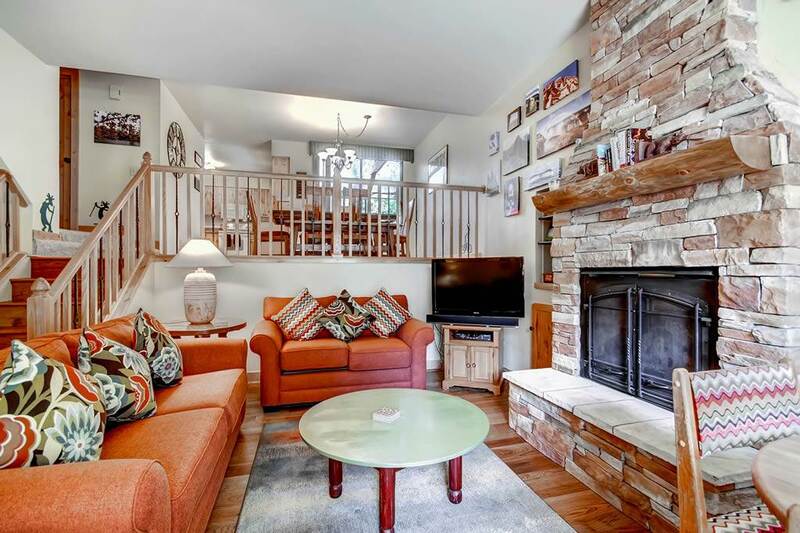 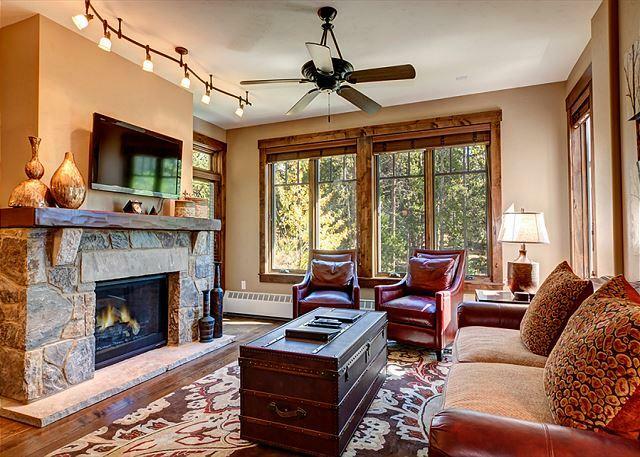 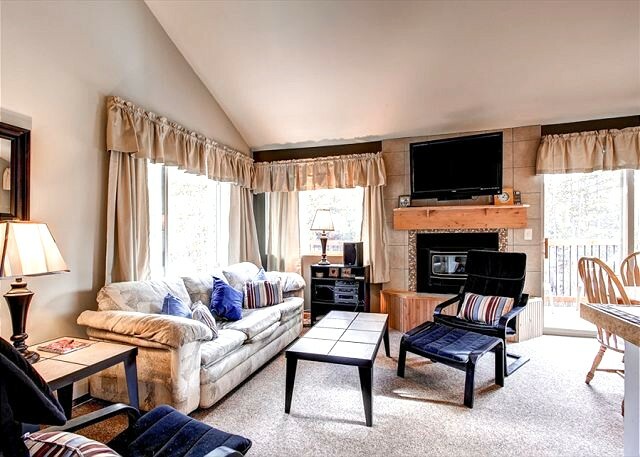 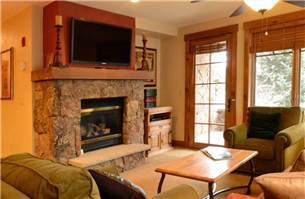 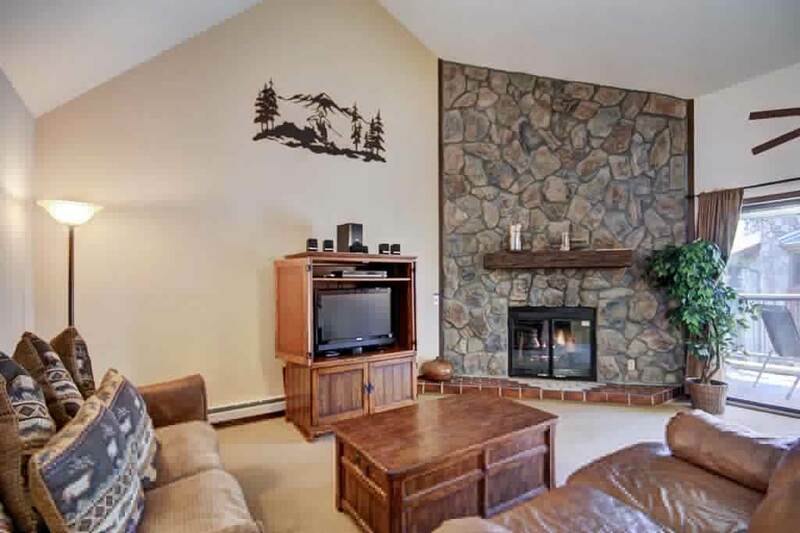 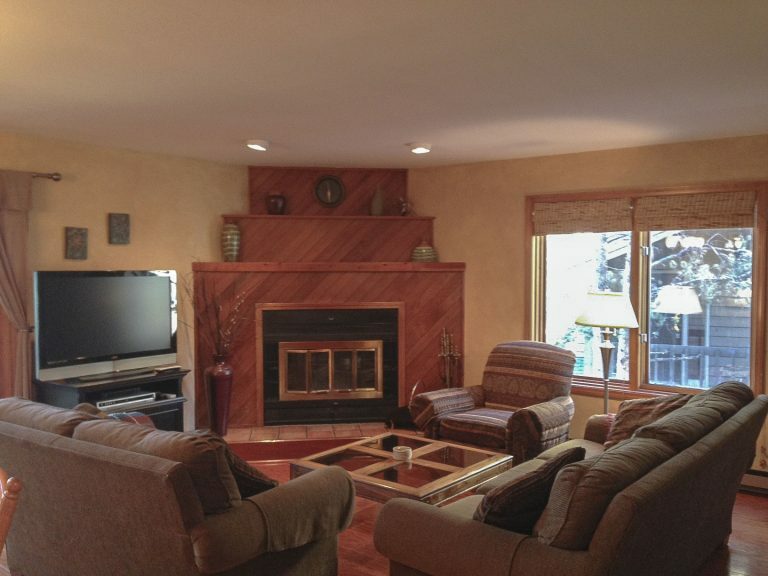 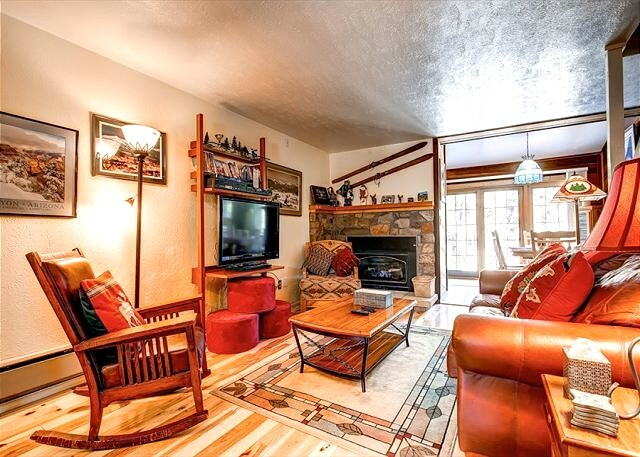 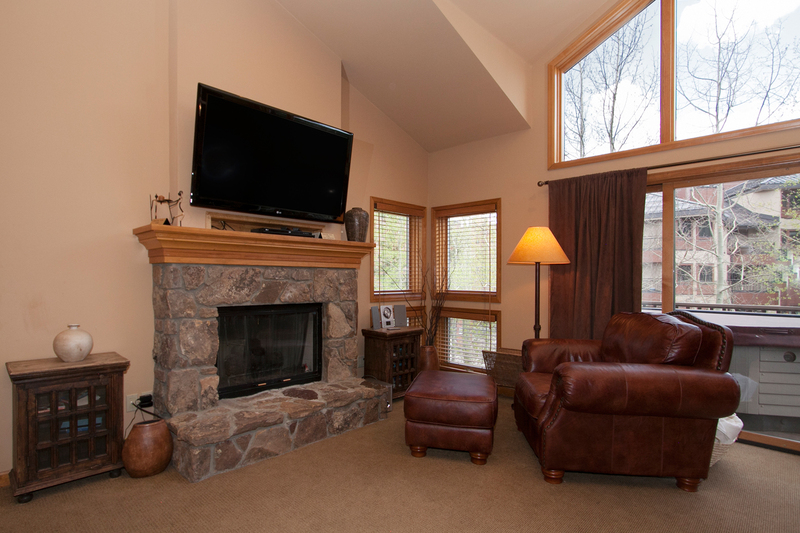 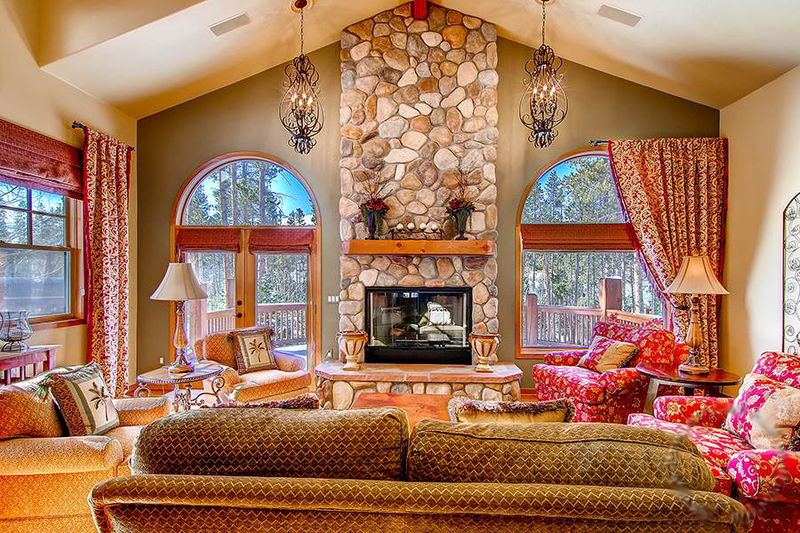 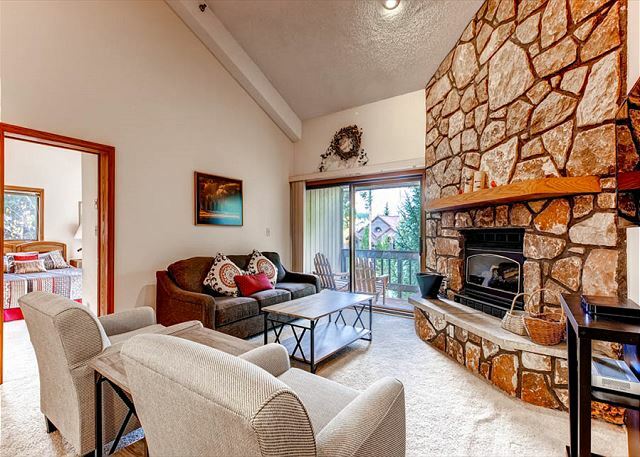 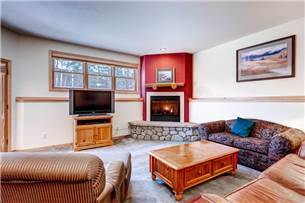 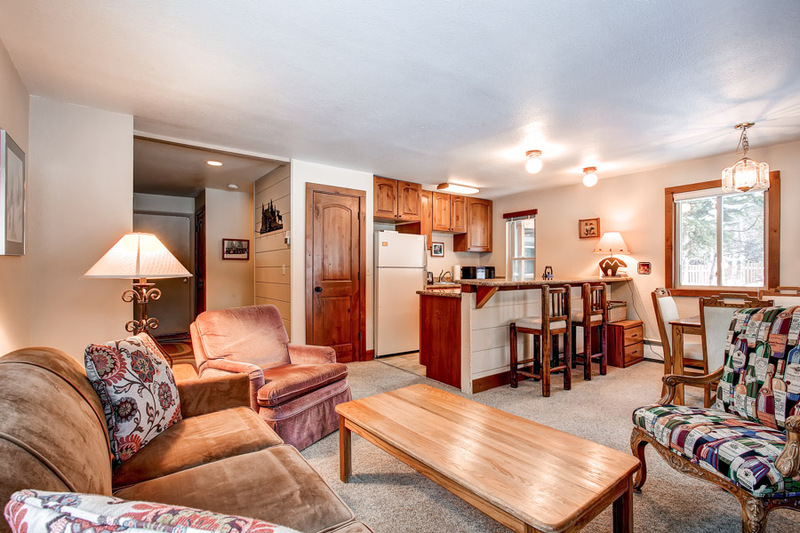 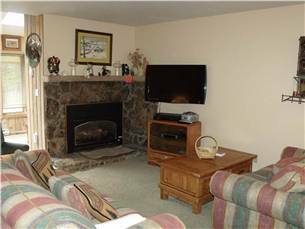 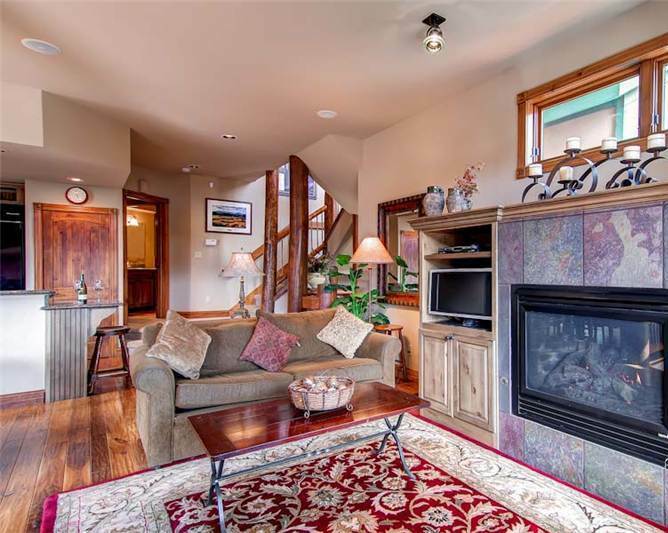 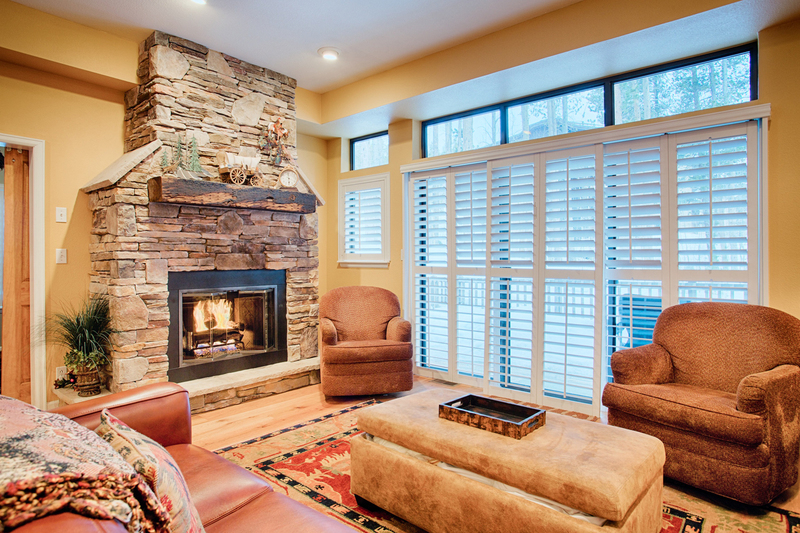 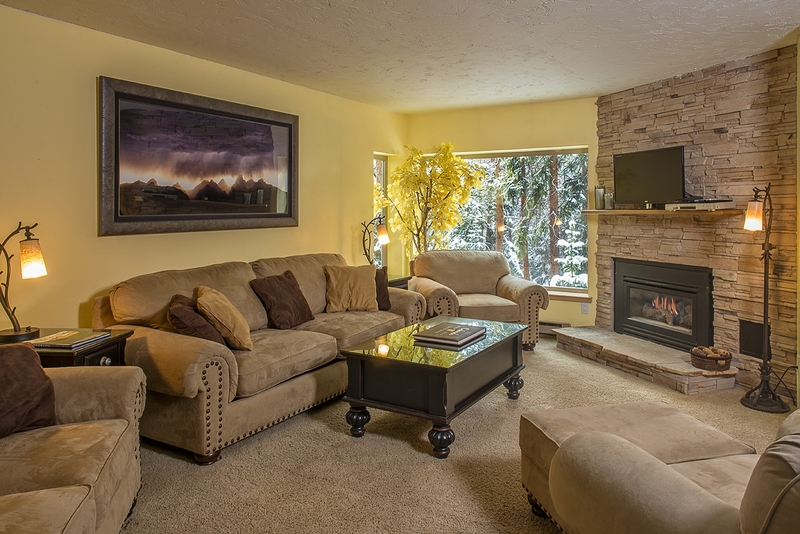 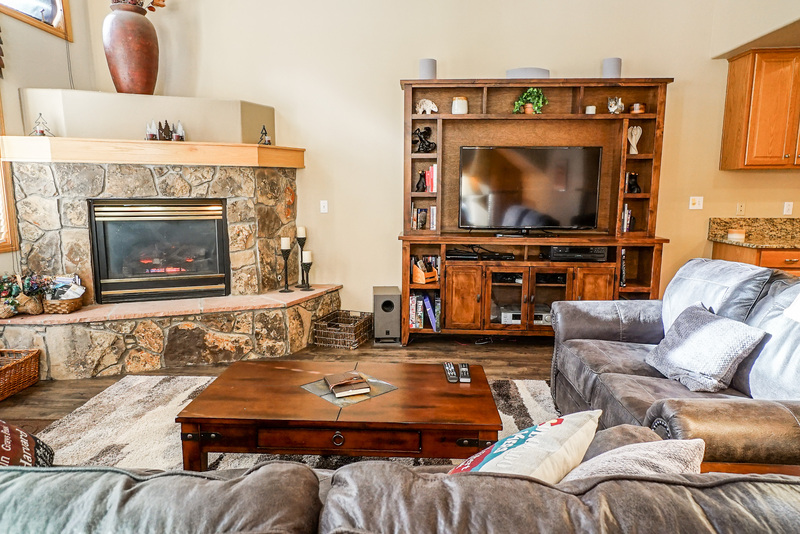 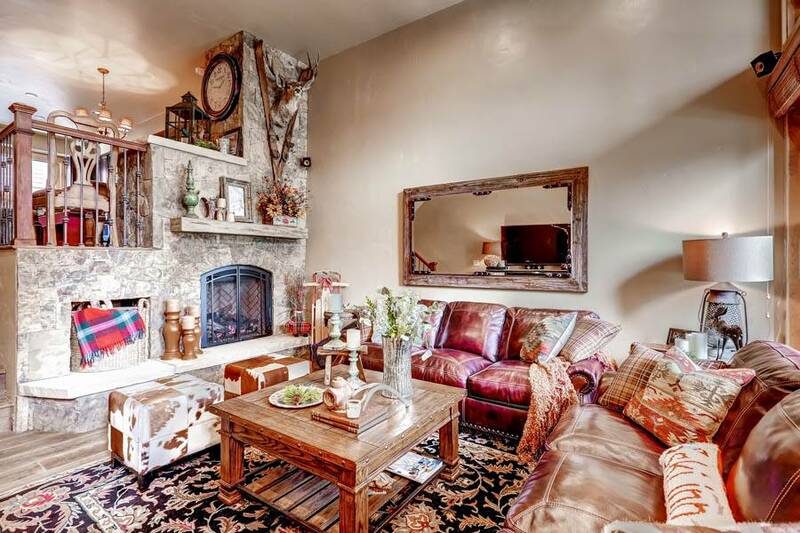 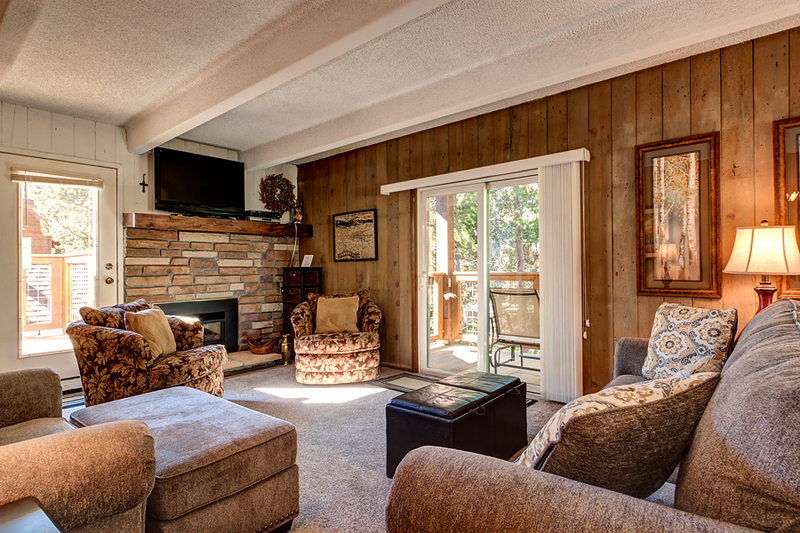 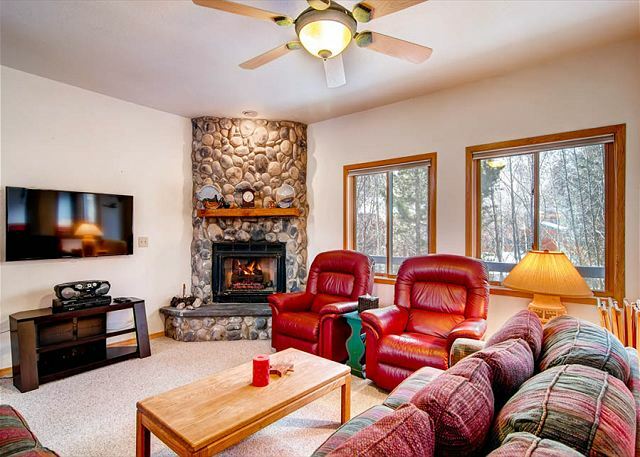 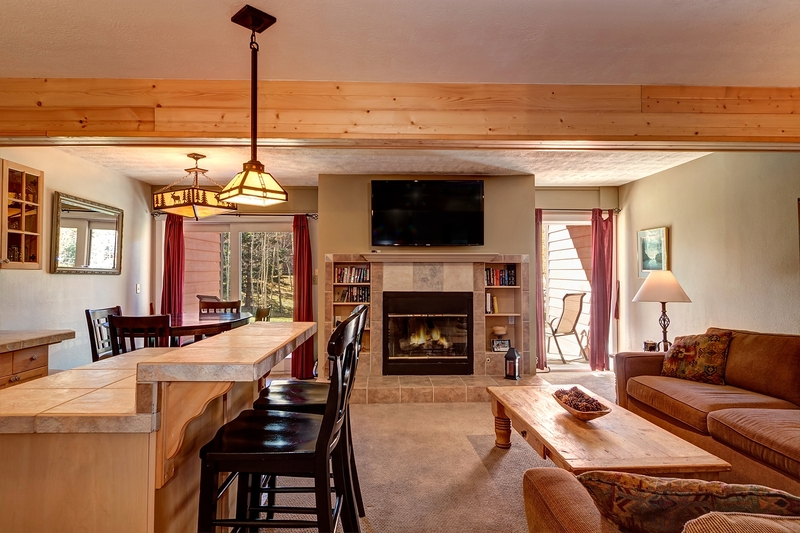 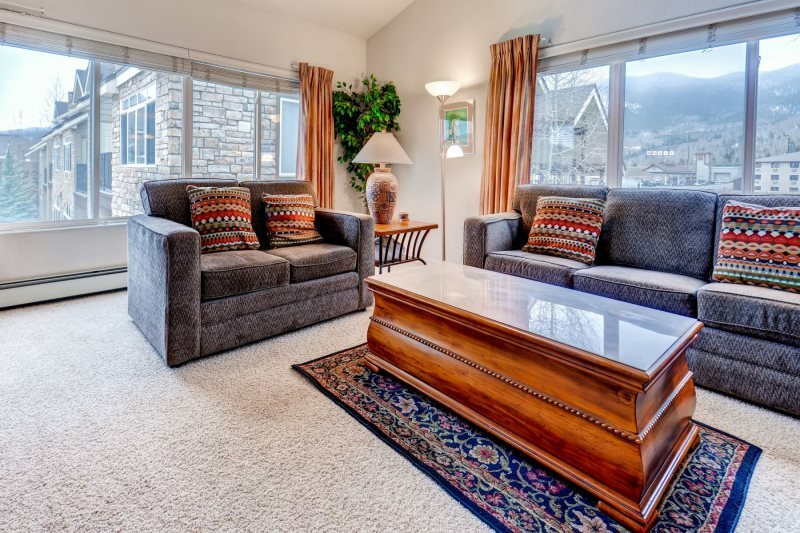 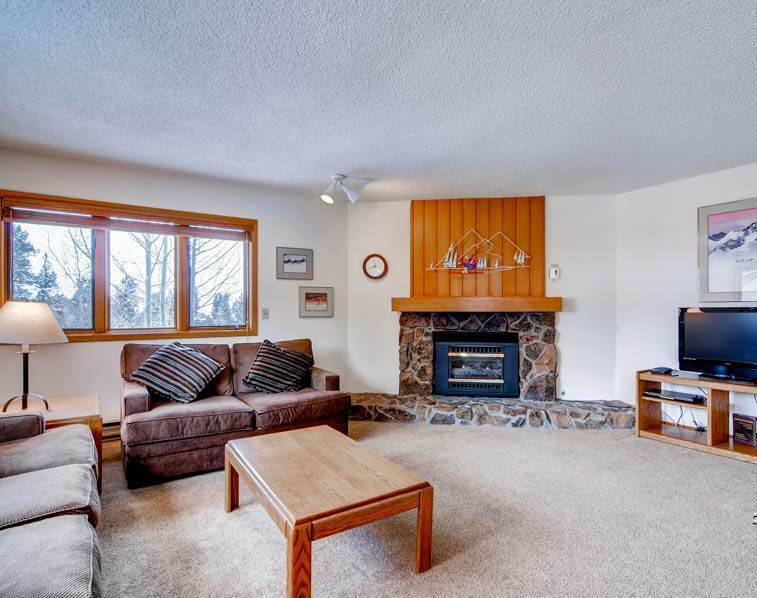 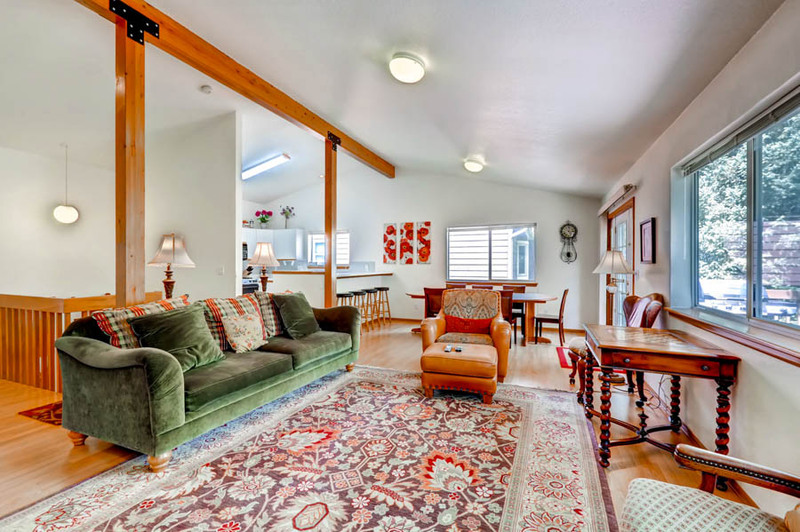 You will find plenty of seating in the living room centered around the gas fireplace. 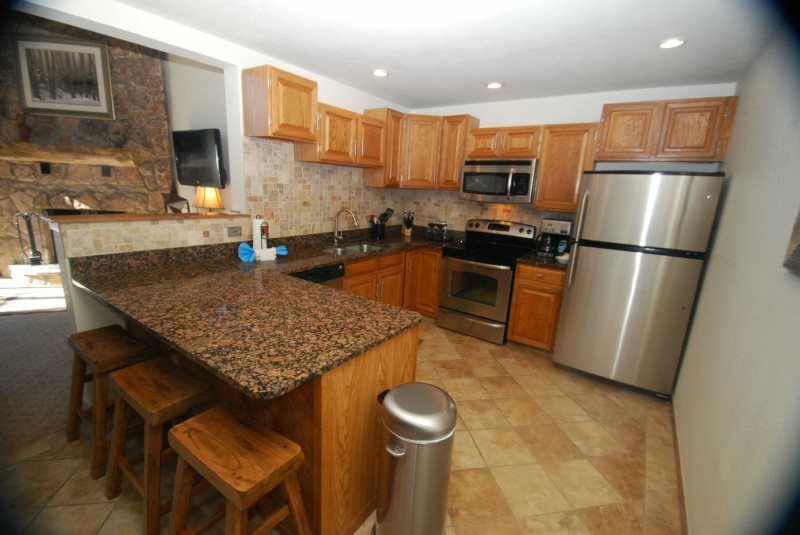 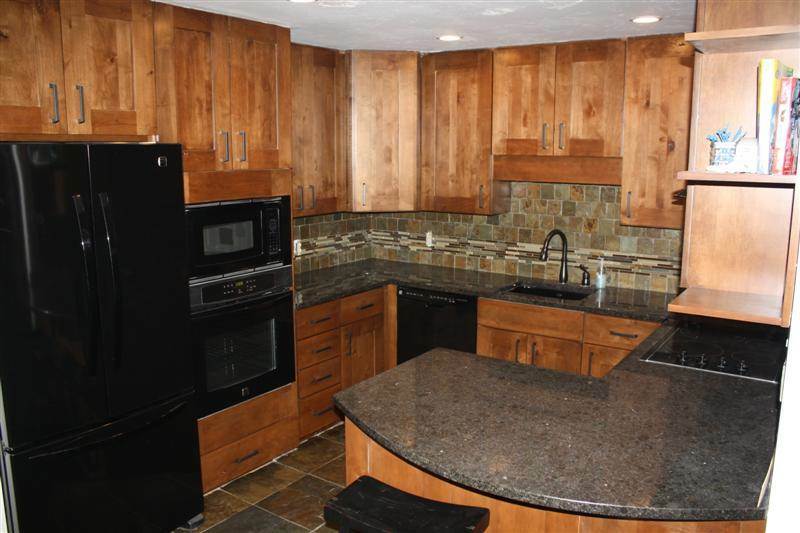 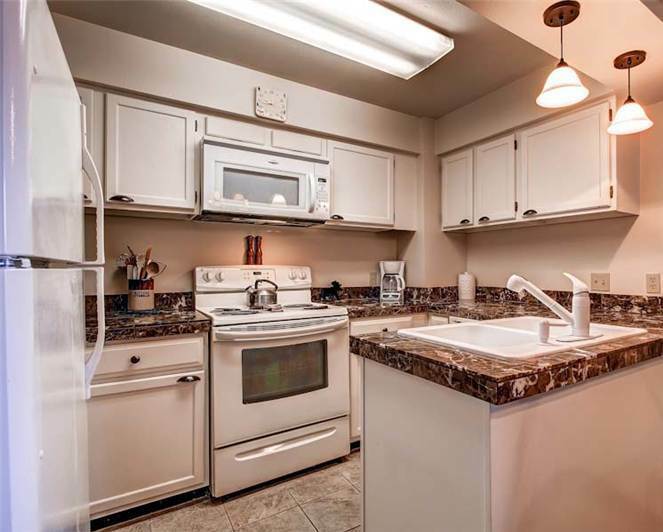 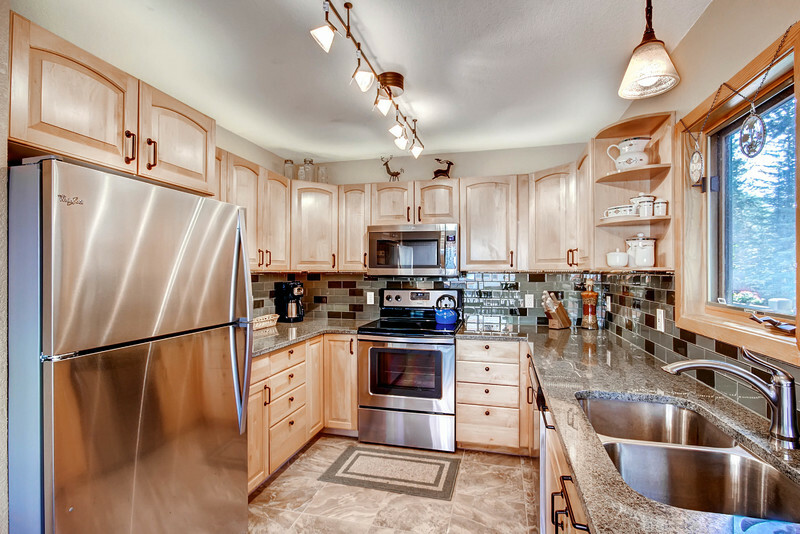 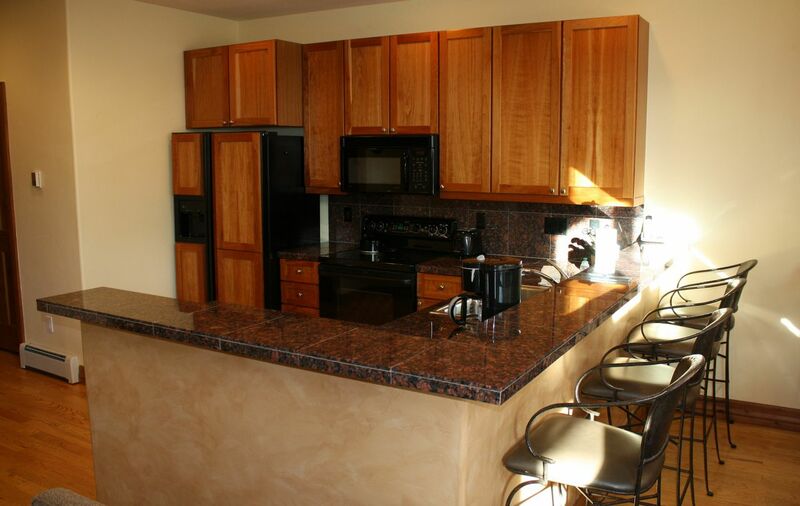 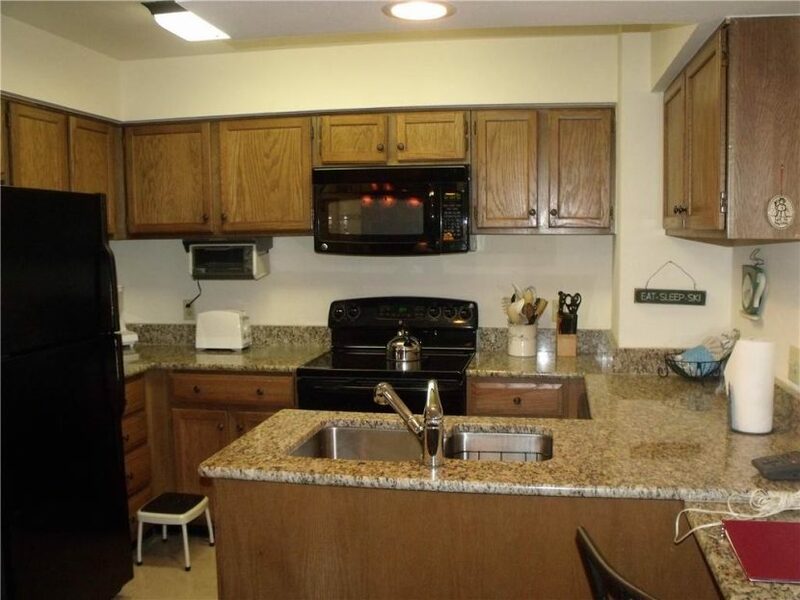 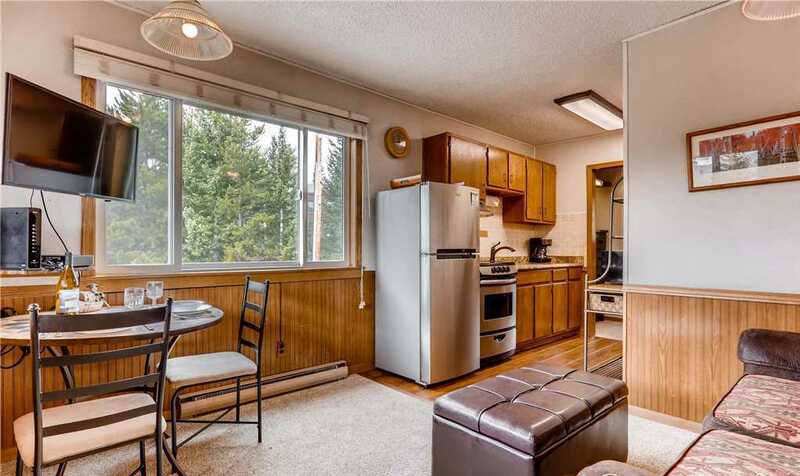 The kitchen was recently touched up and the rest of the unit has new floor coverings. 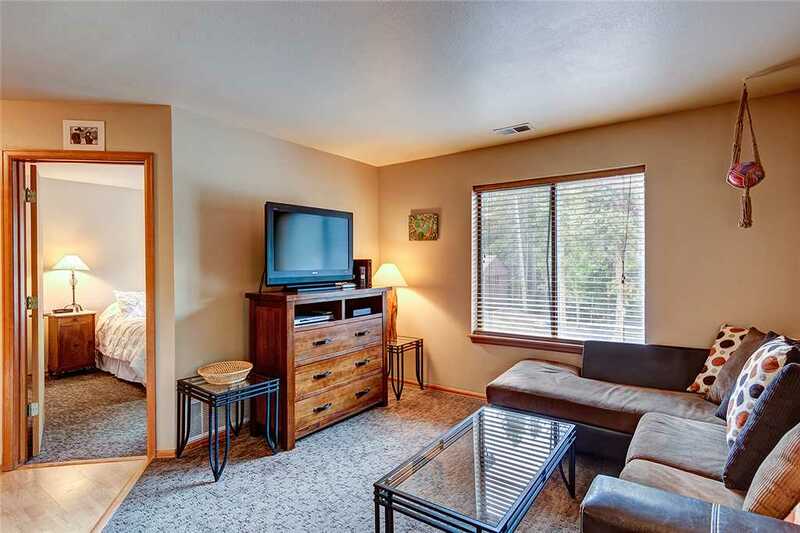 The master bedroom has a King bed and TV and DVD player. 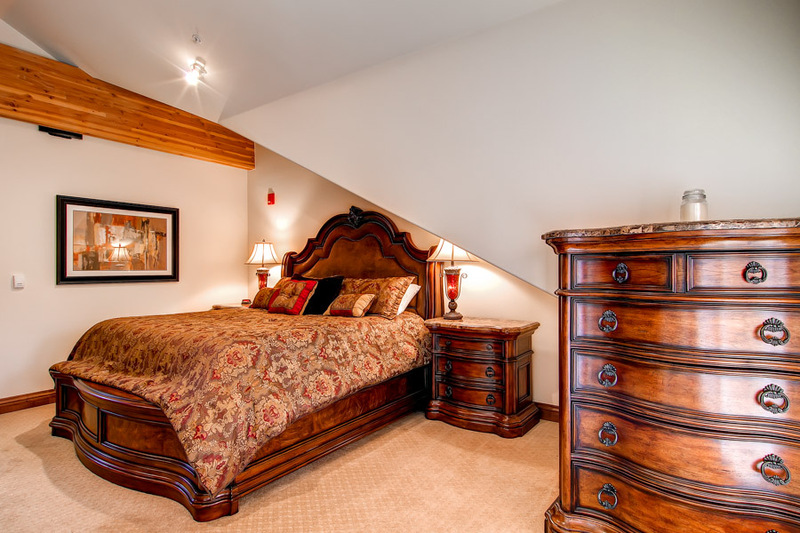 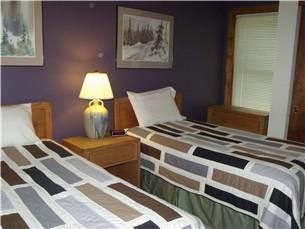 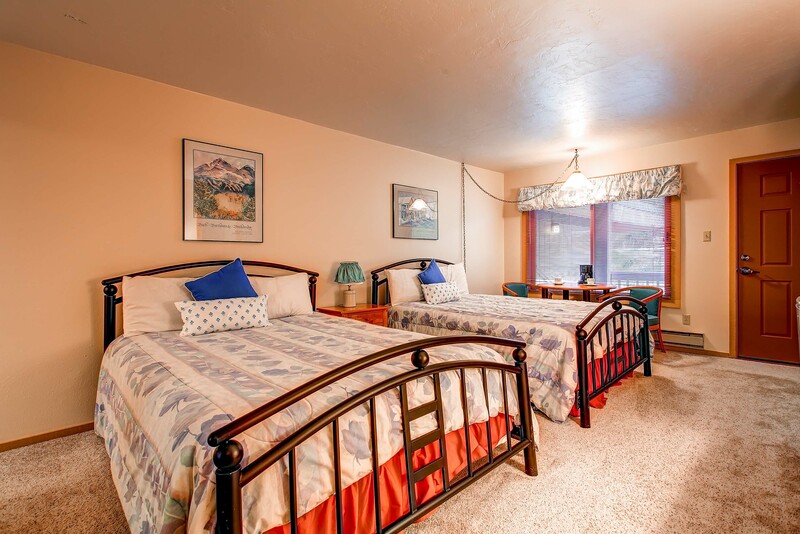 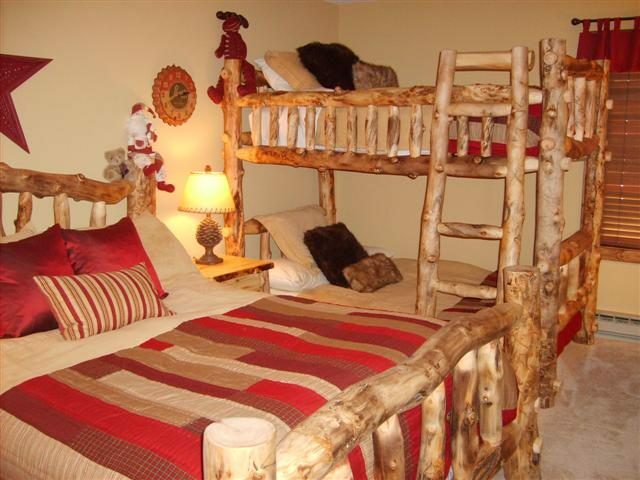 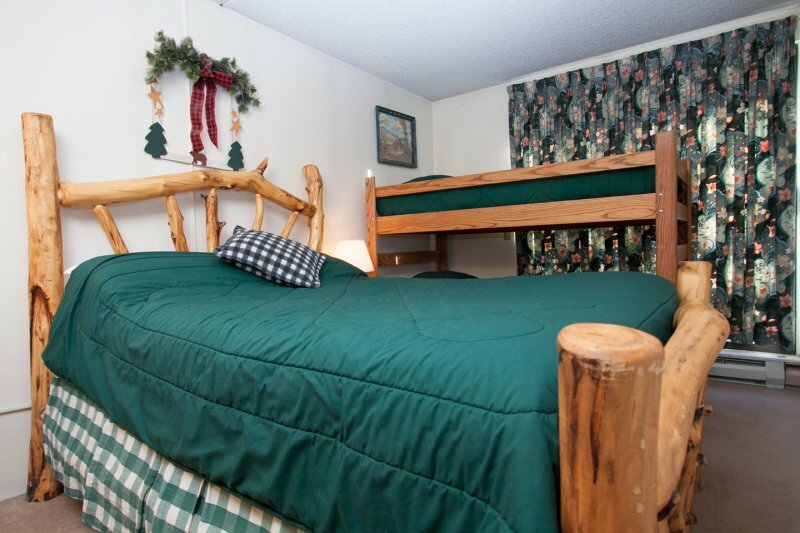 The Guest bedroom has a Queen bed and then the Loft has additional sleeping with two twin beds and a full futon. 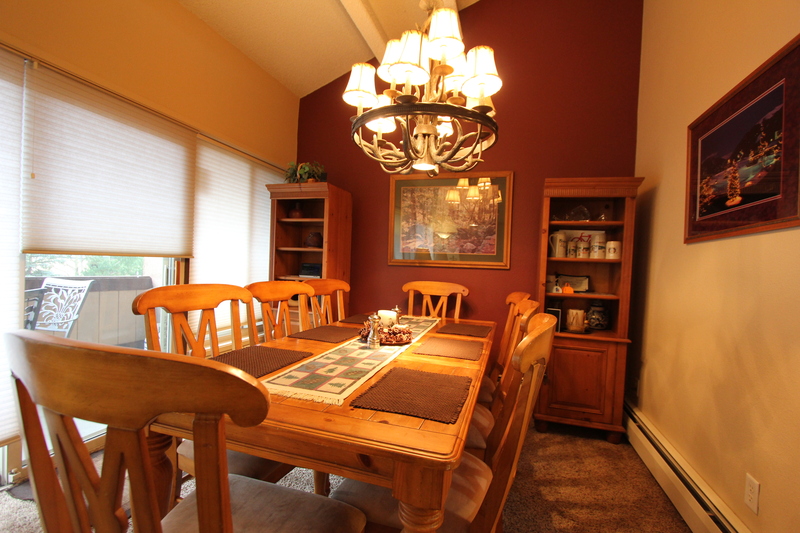 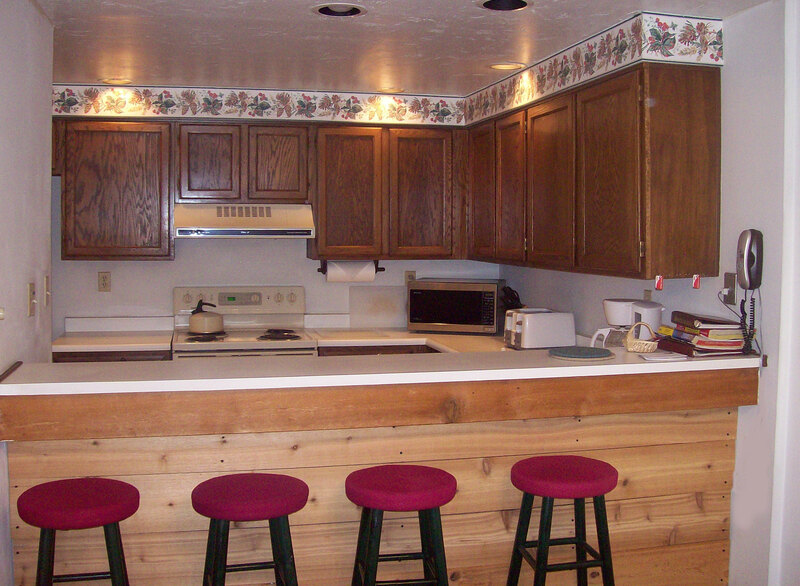 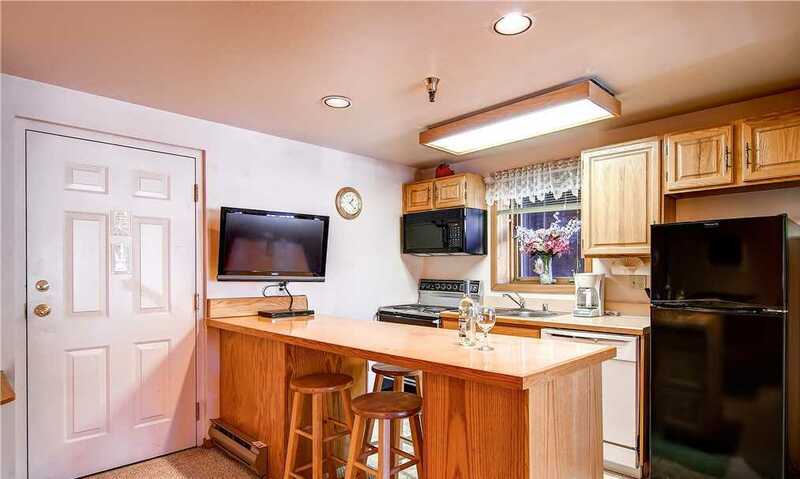 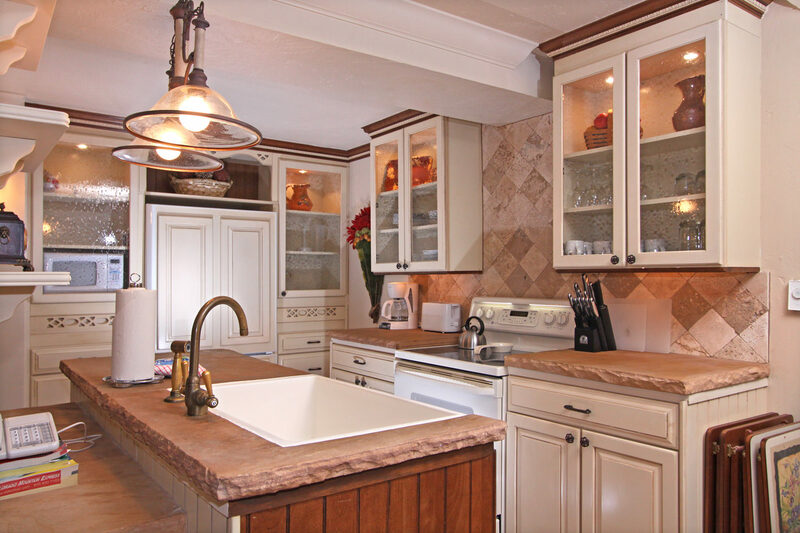 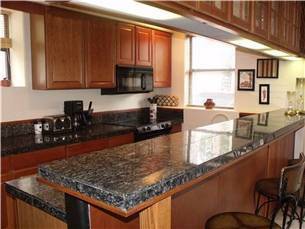 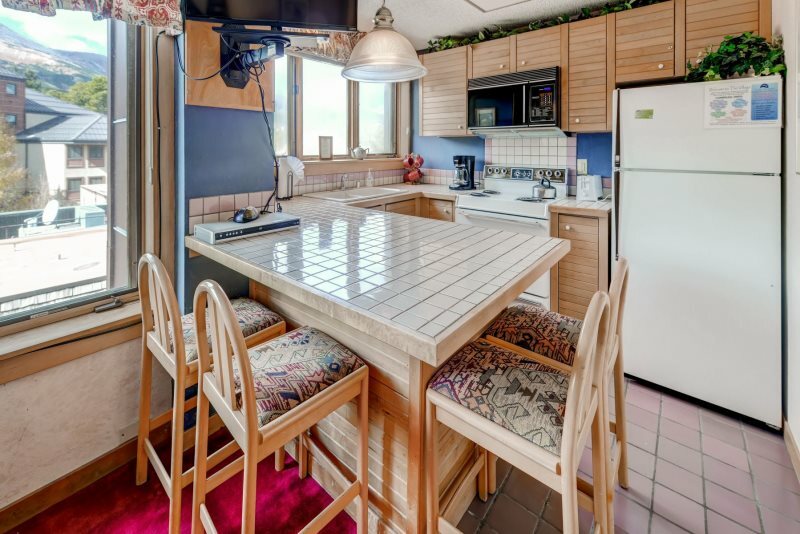 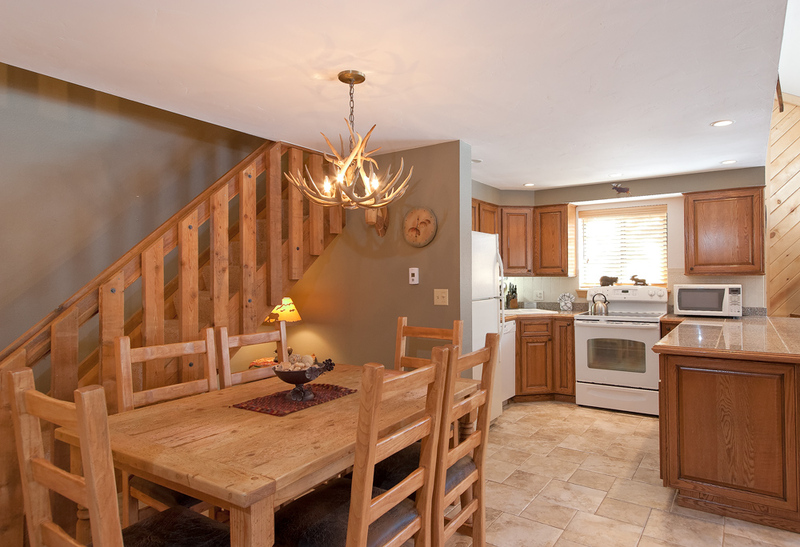 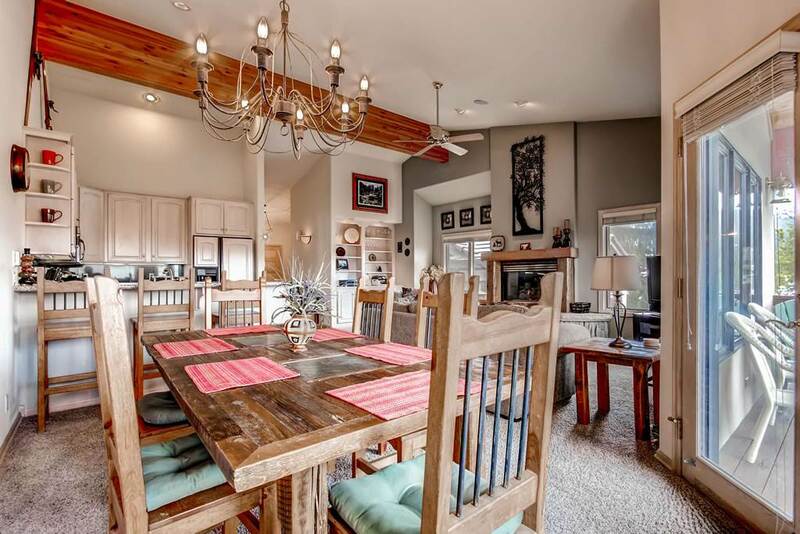 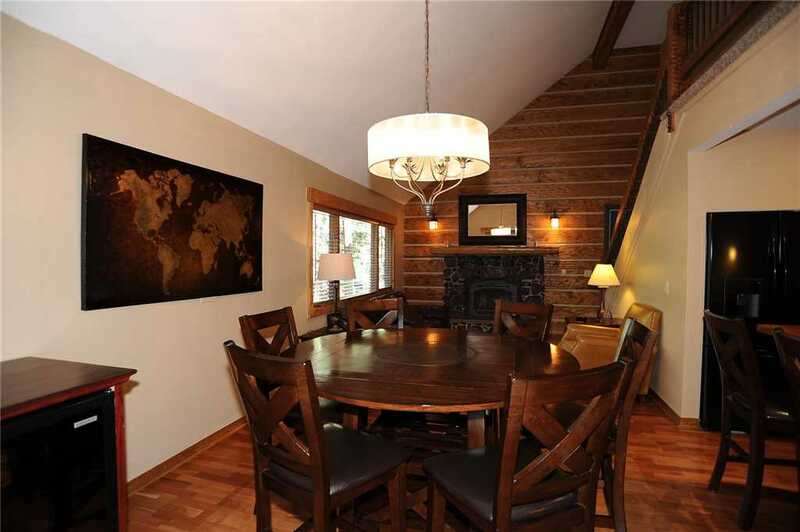 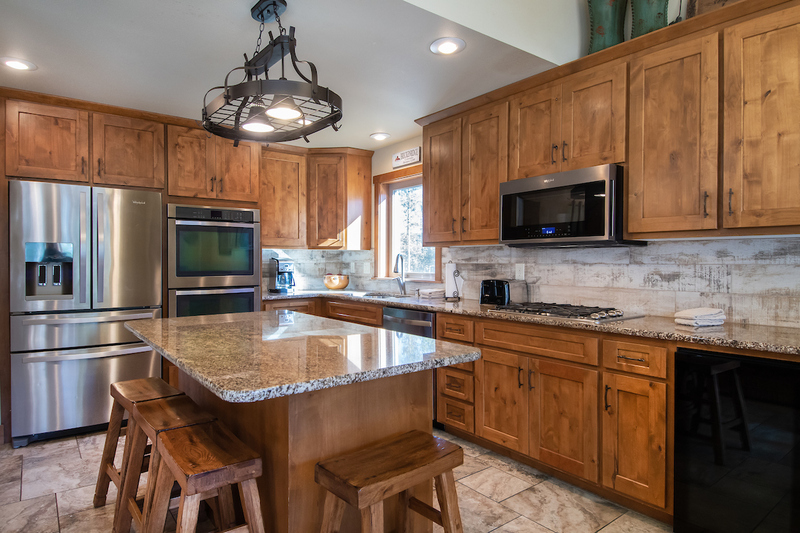 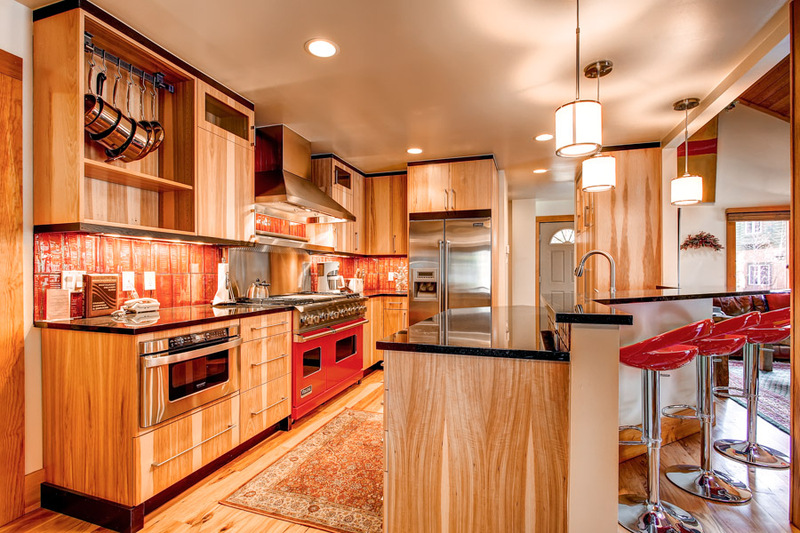 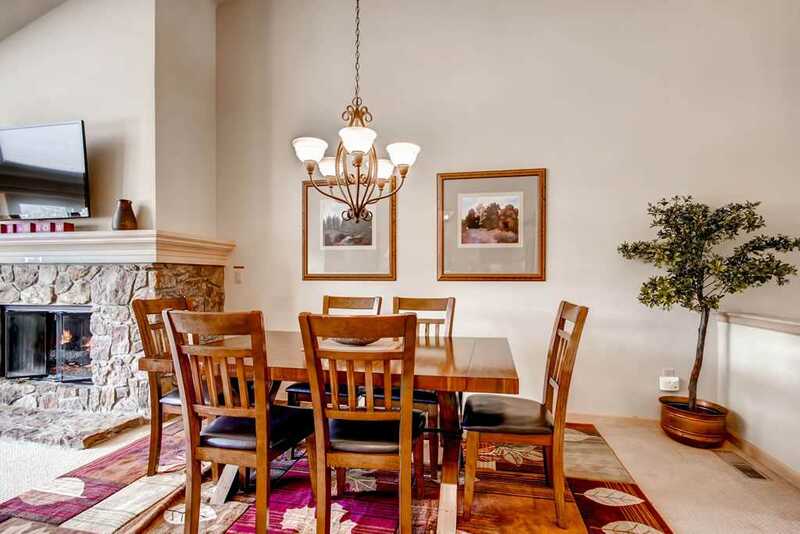 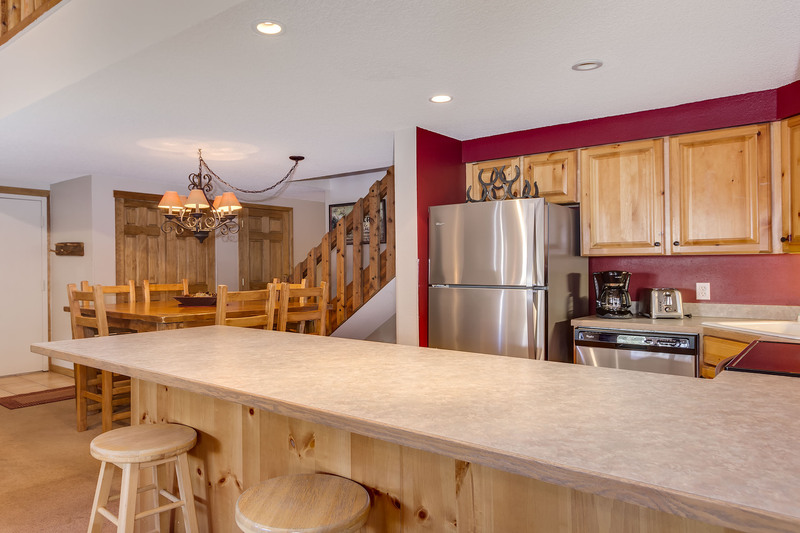 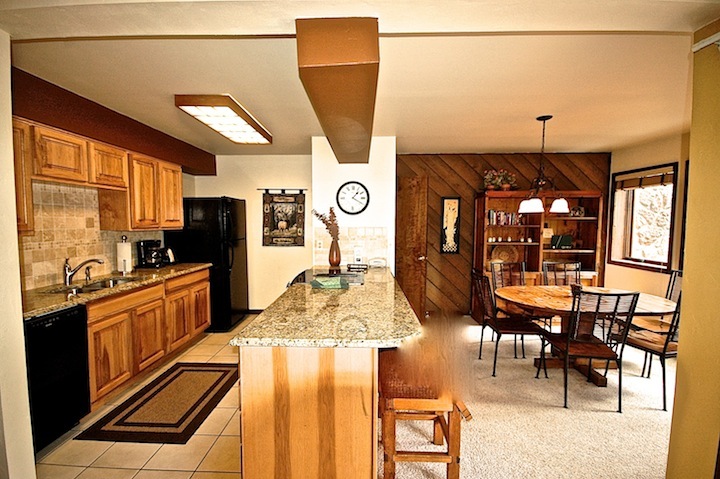 The dining area easily seats six, or, for casual dining or extra space, the breakfast bar seats three more people. 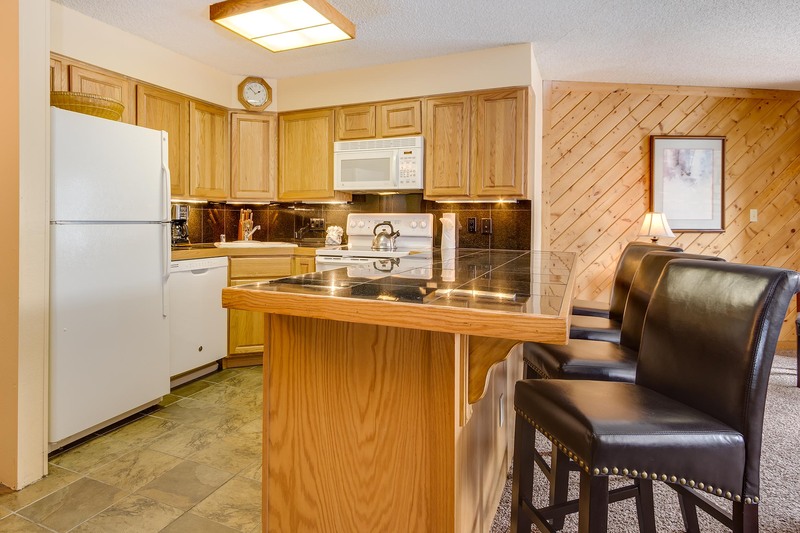 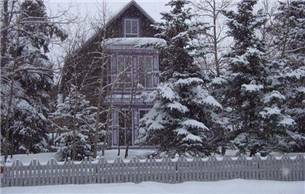 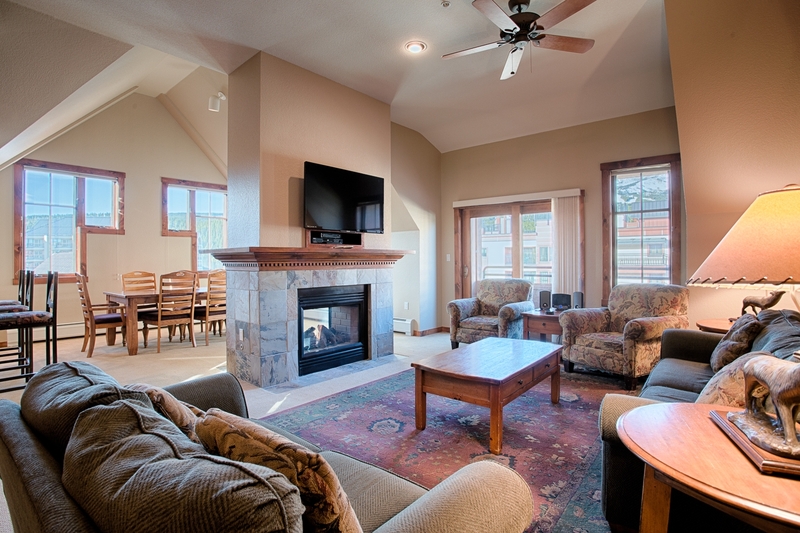 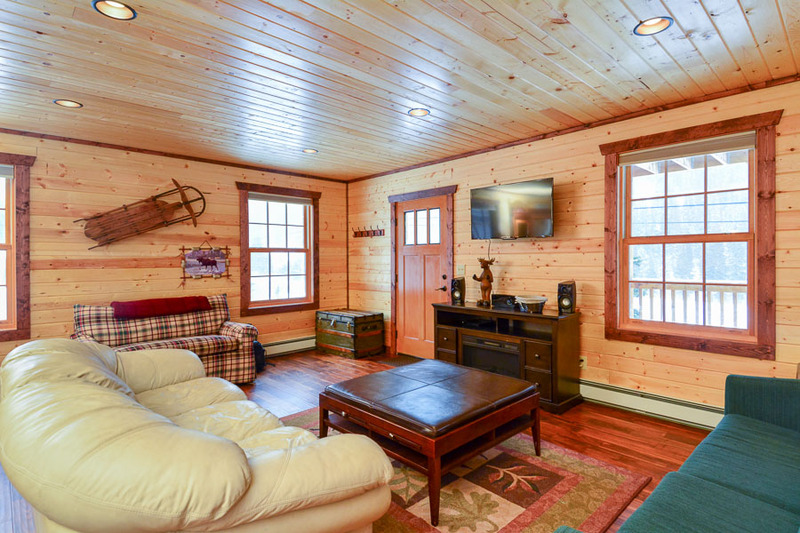 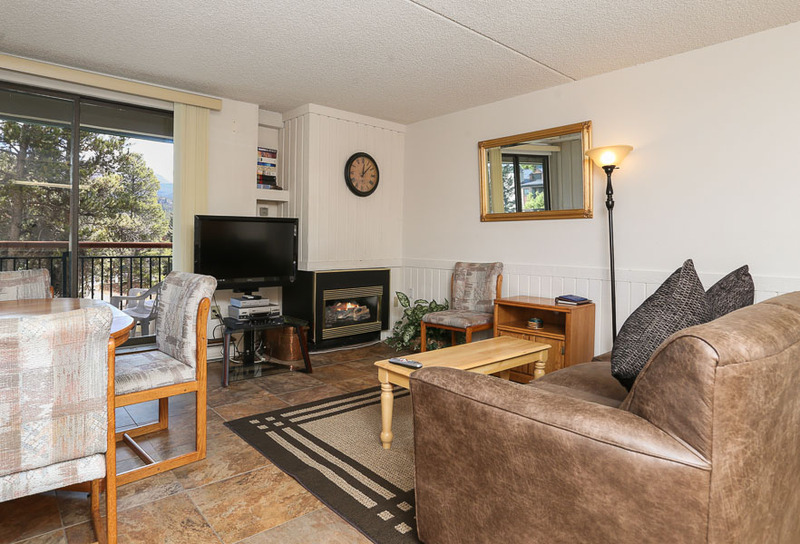 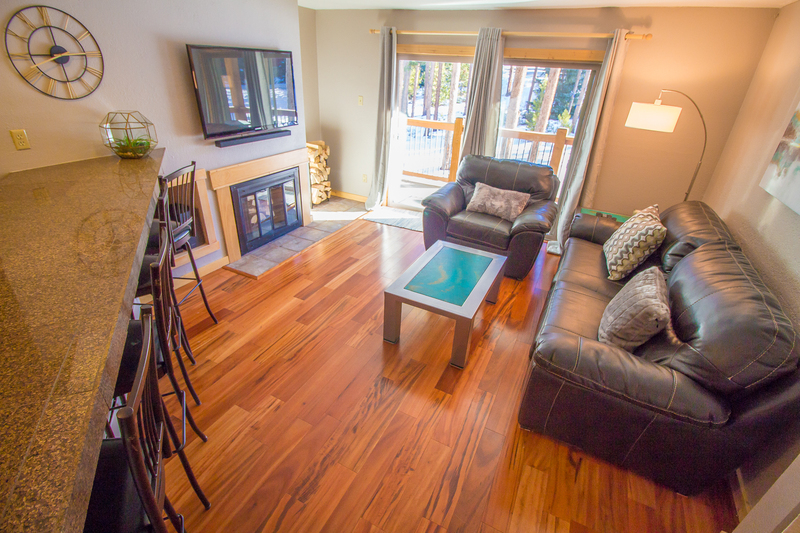 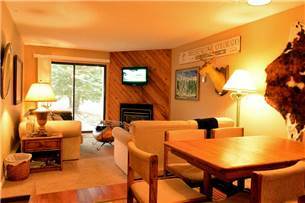 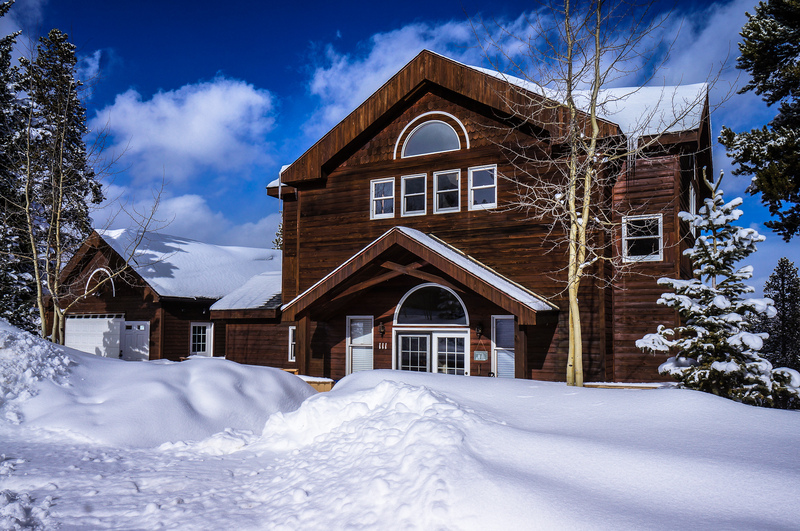 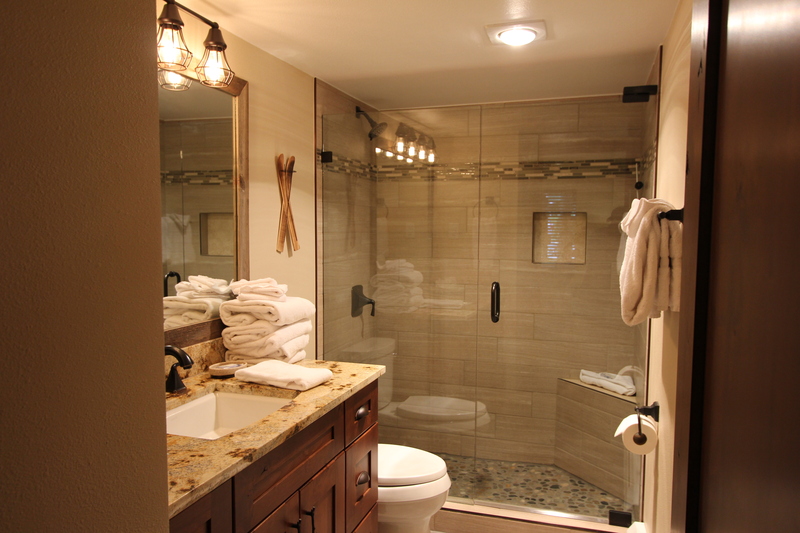 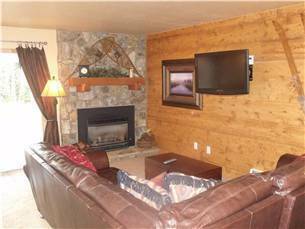 There are additional amenties like the private washer/dryer in the unit, multiple TVs, WiFi, private ski locker and parking for 2 vehicles.